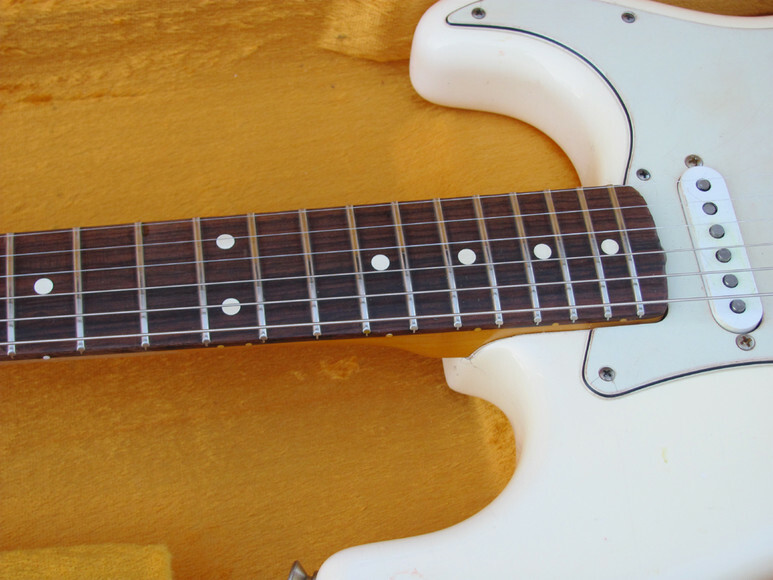 There are no guitars for sale at this time, please see below for sold items! 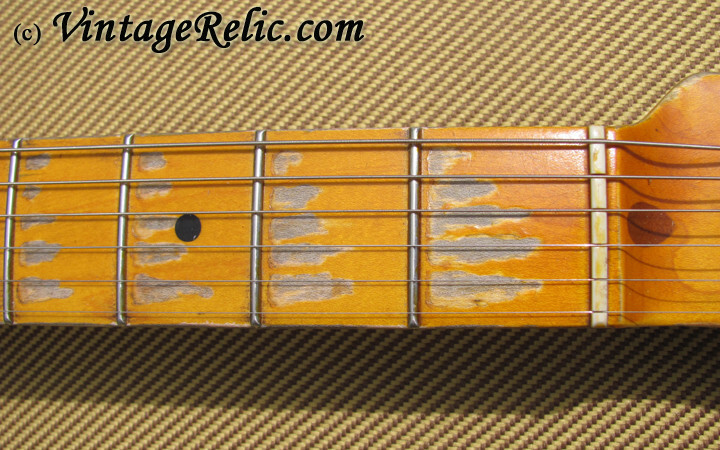 Heavily relic'd for a client. 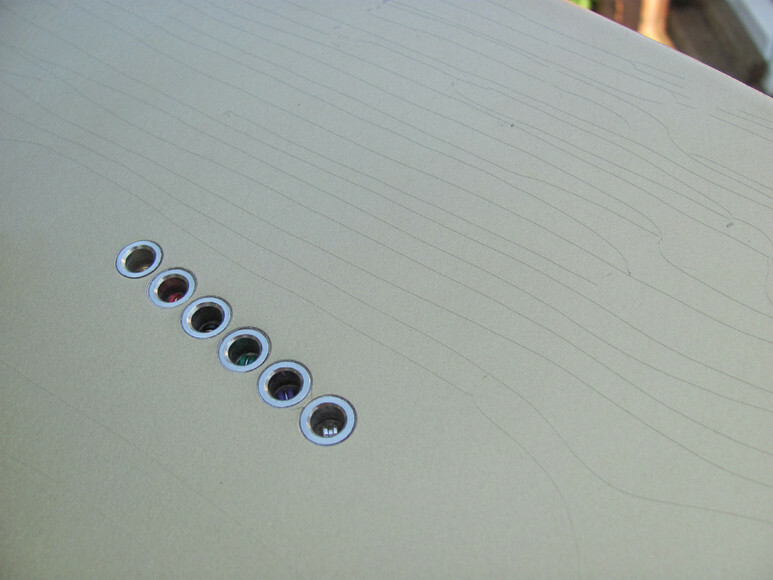 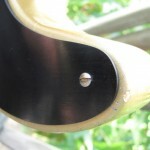 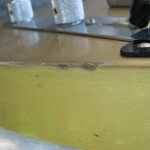 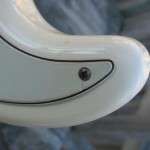 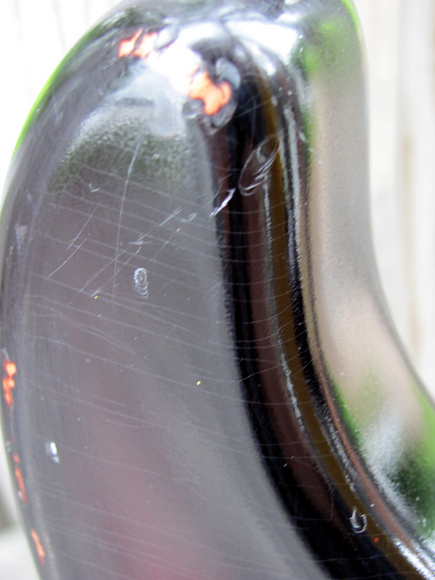 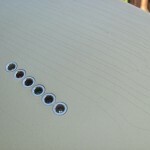 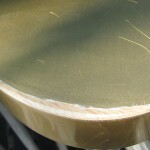 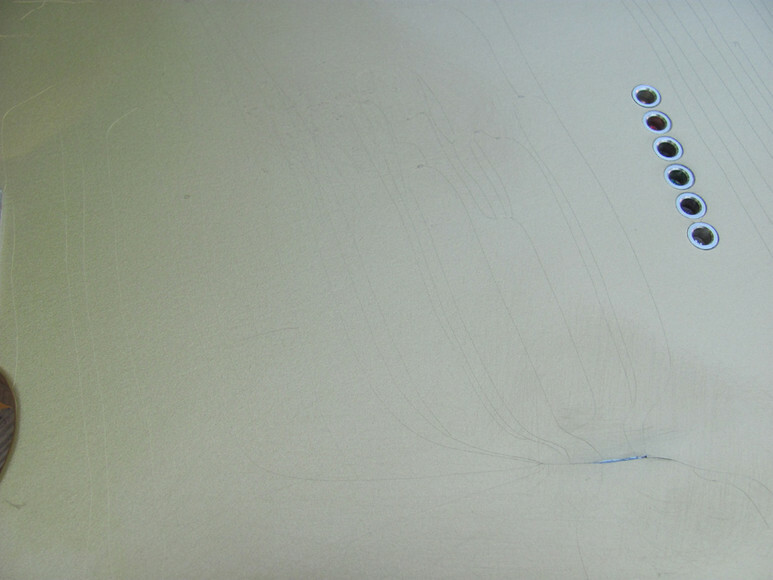 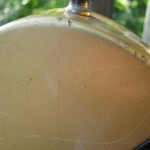 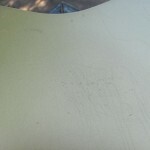 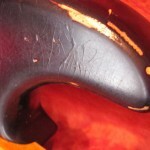 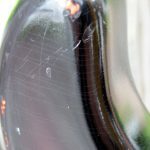 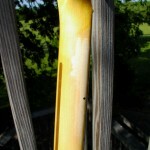 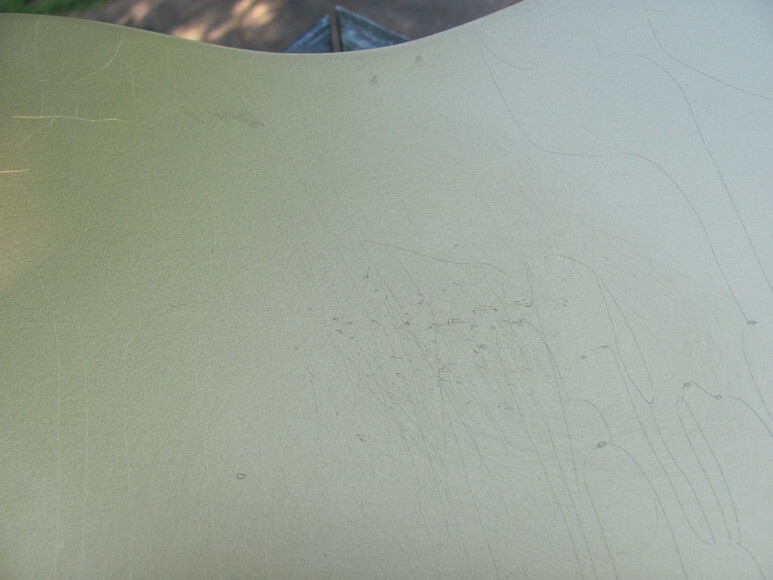 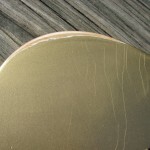 'Greening' of the finish; weather checking; arm and edge wear; buckle rash; etc. 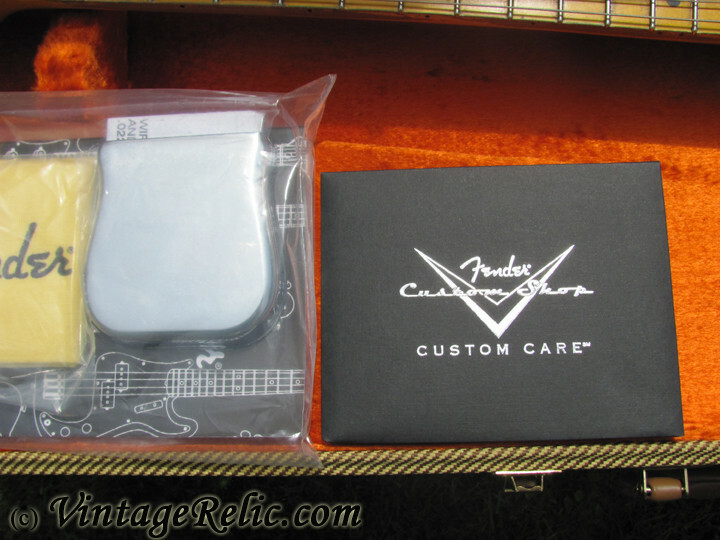 2009 Fender Custom Shop 1952 Closet Classic Esquire. 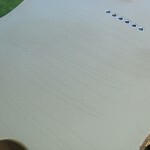 Lightweight ash body with snow white finish; fat maple neck; 6105 medium jumbo frets; 9.5' fretboard radius; 1.650' nut width. 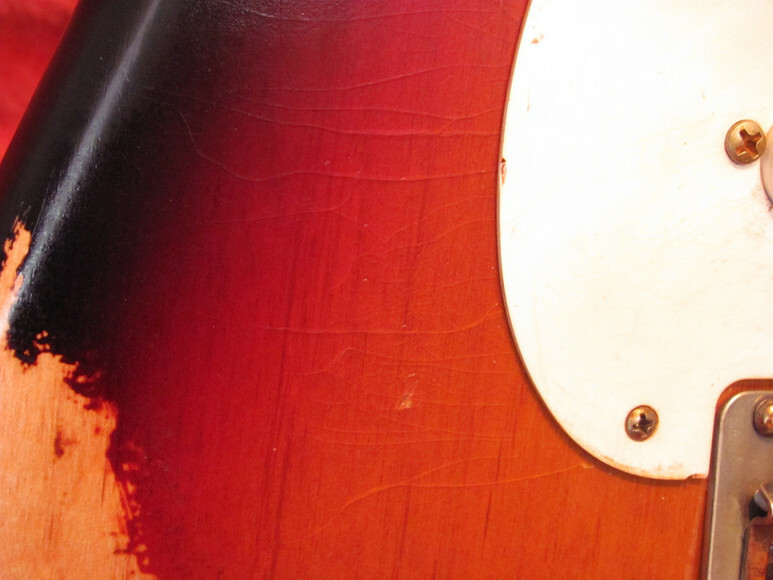 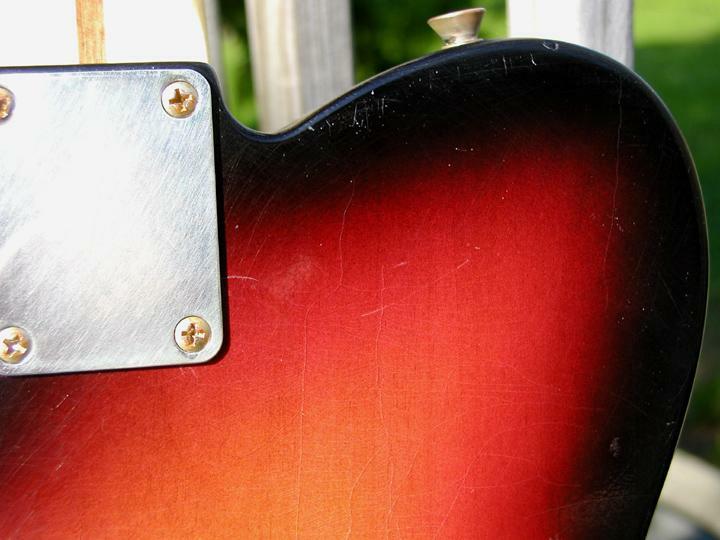 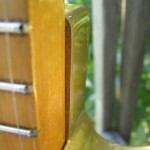 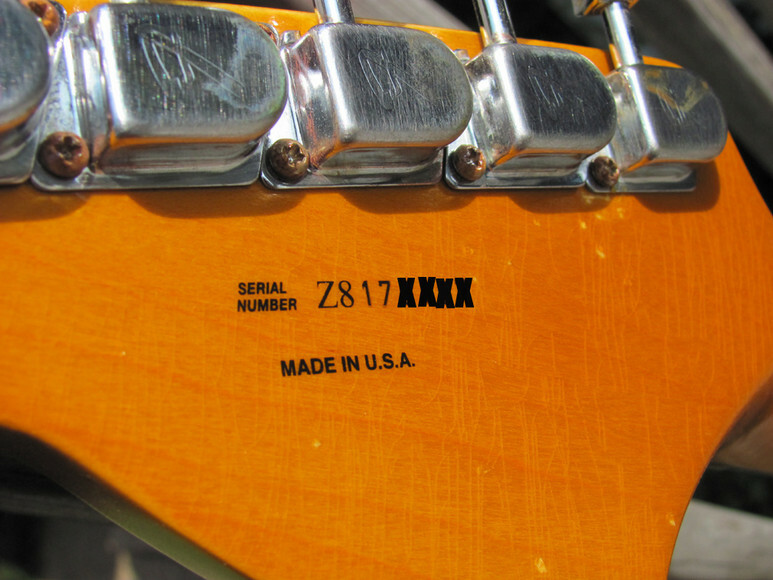 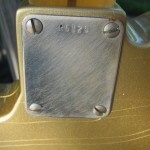 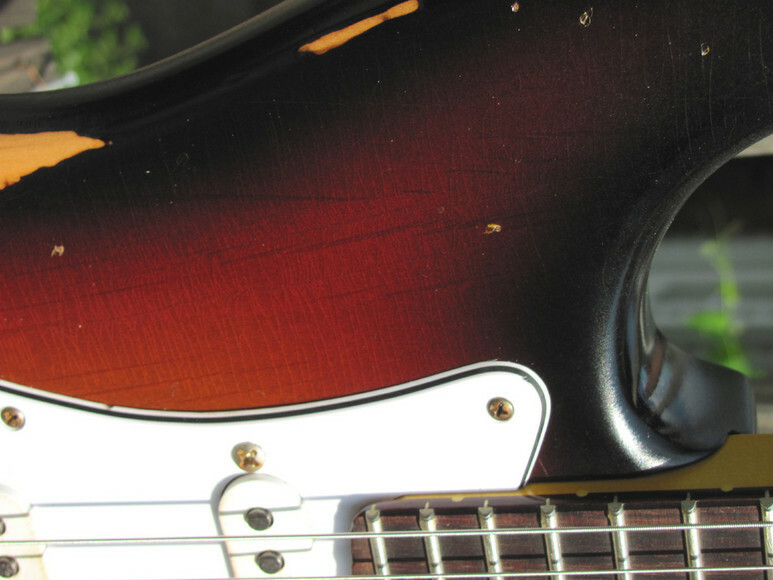 Guitar weighs only 7.19 lbs (7 lbs, 3 ounces). 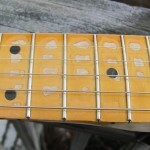 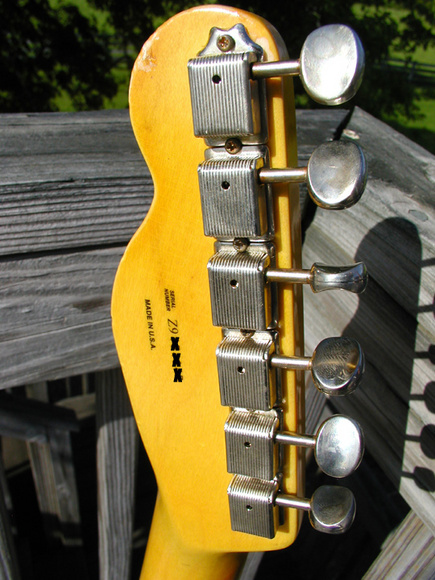 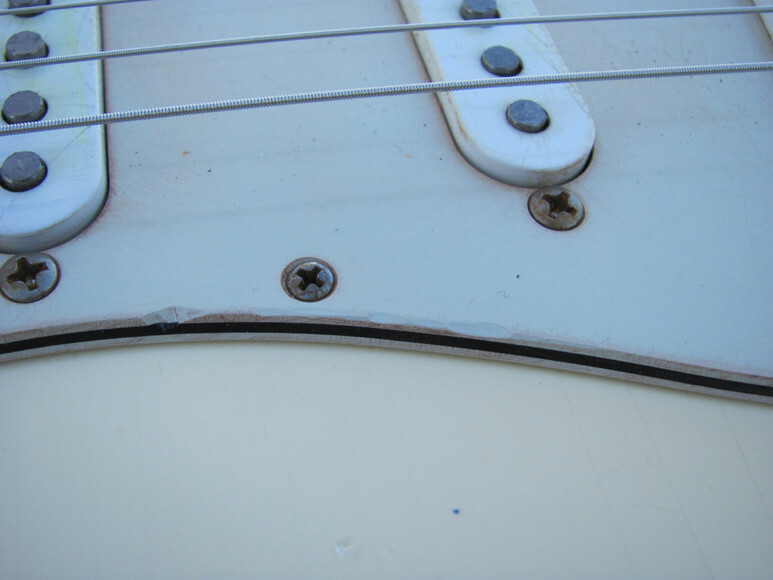 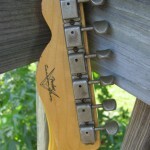 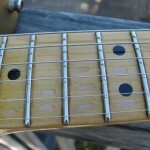 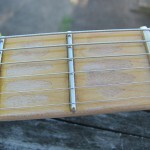 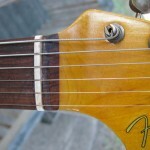 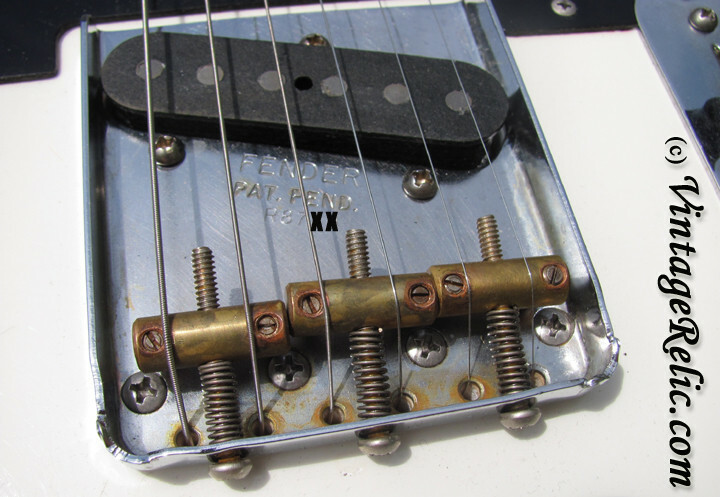 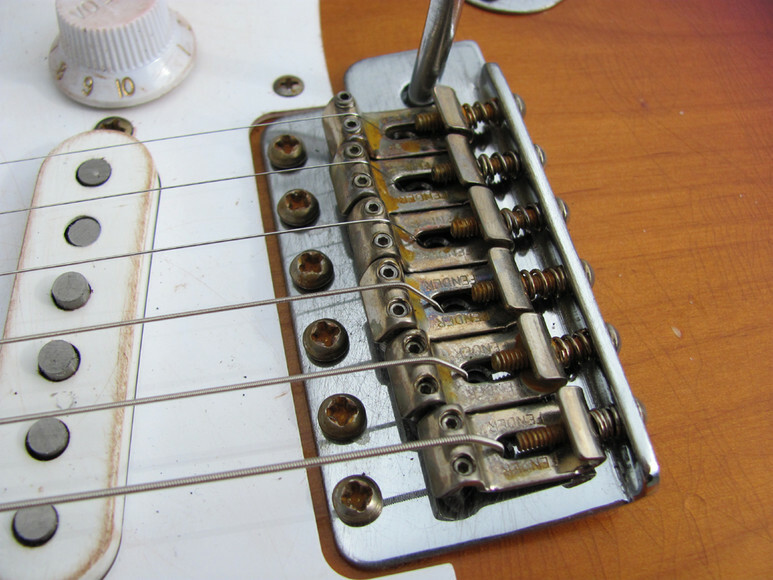 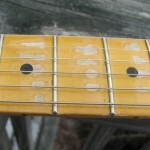 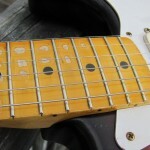 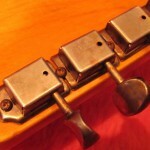 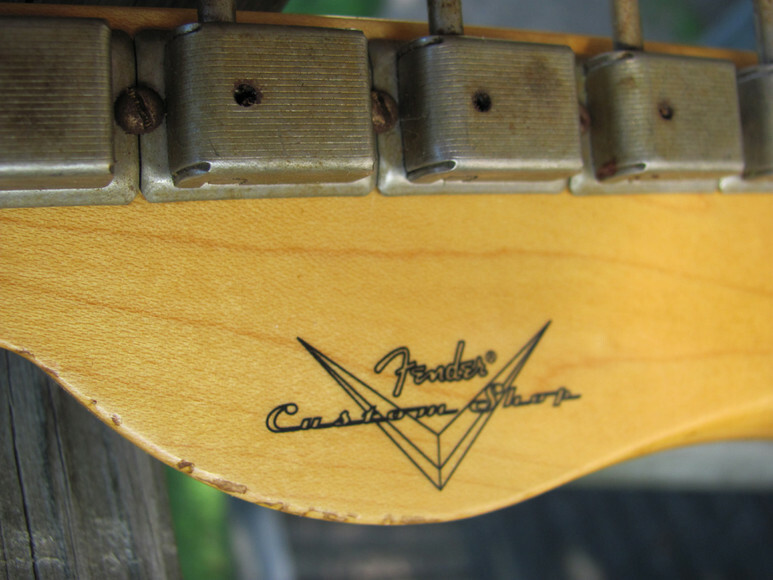 No fret wear. 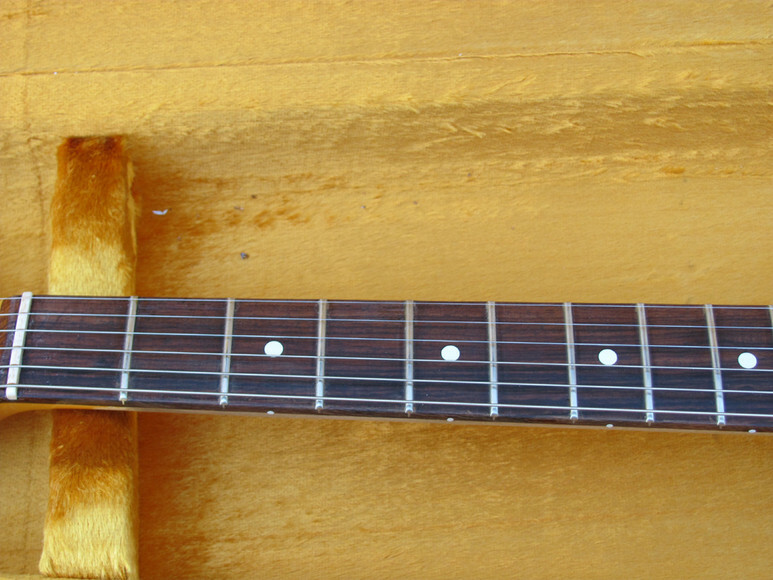 Setup with D'Addarrio EXL120 strings (9-42). 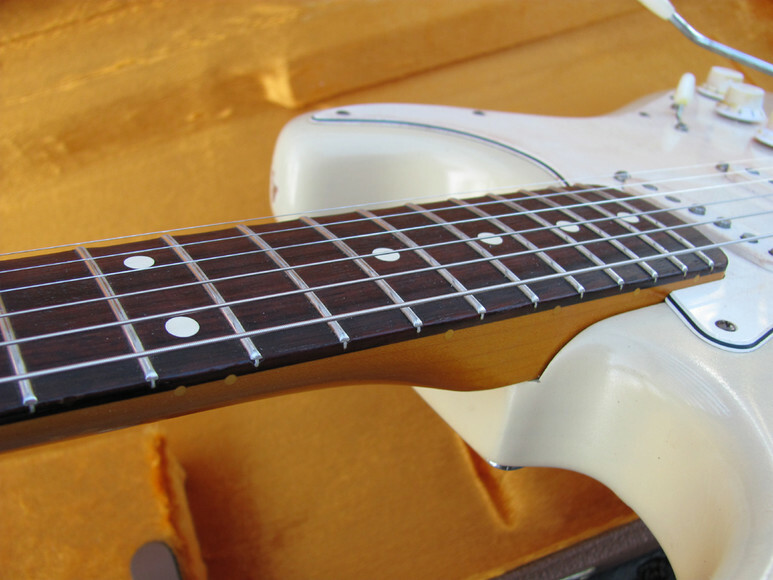 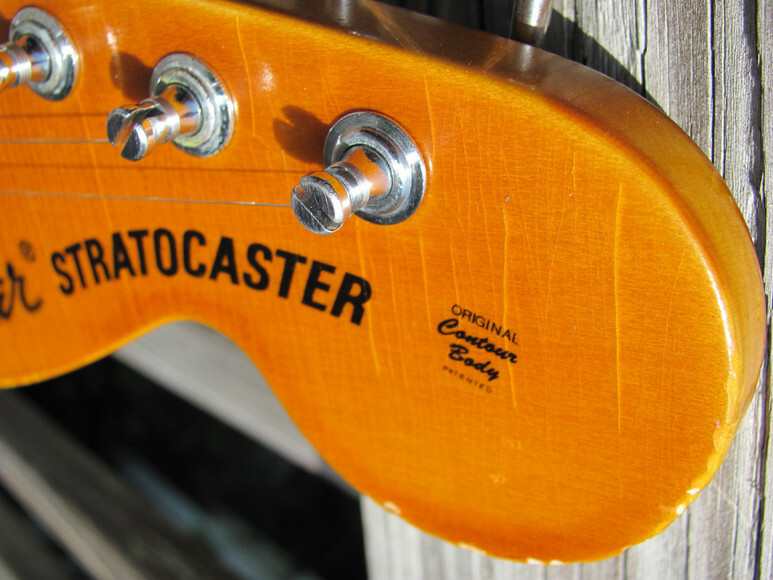 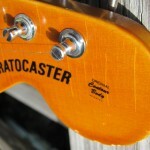 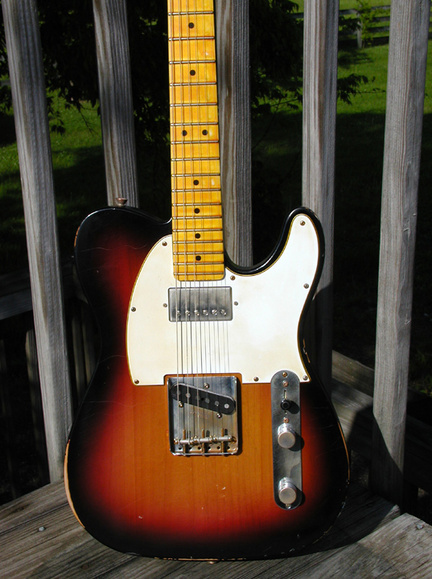 Plays great and sounds like a good Esquire should--lots of 'bite' and twang! 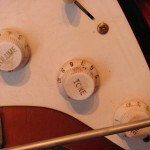 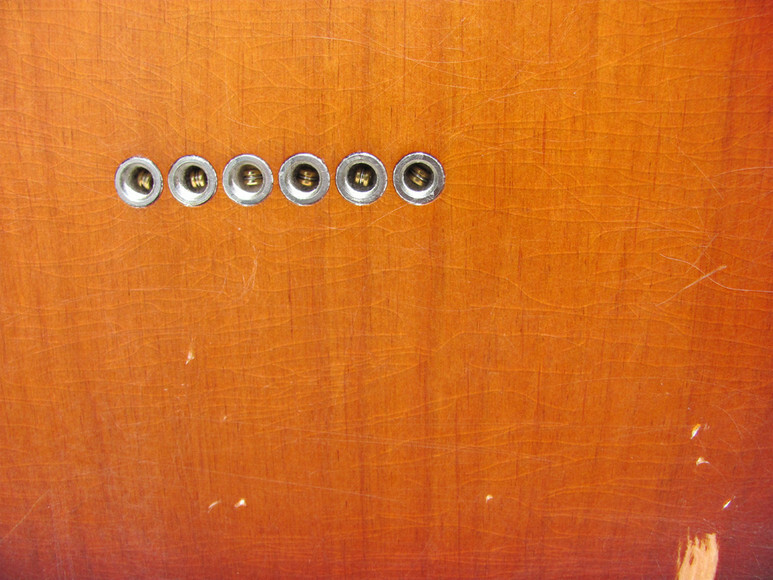 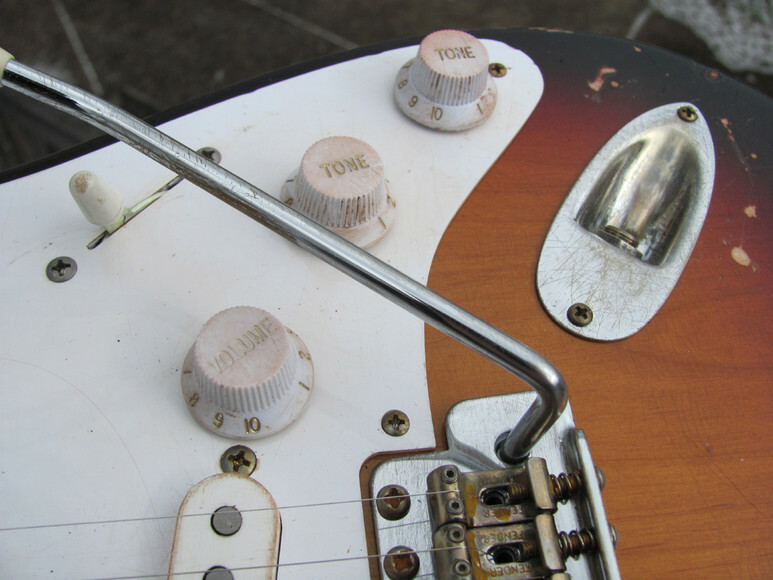 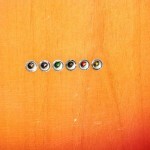 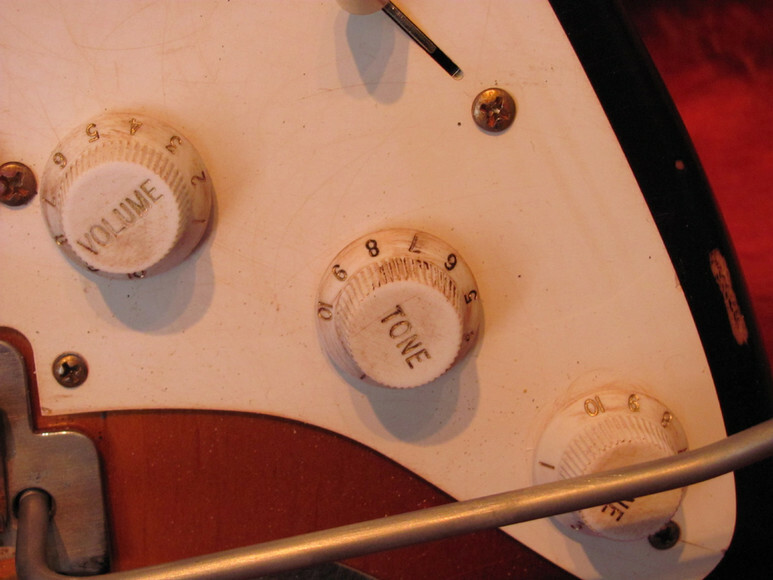 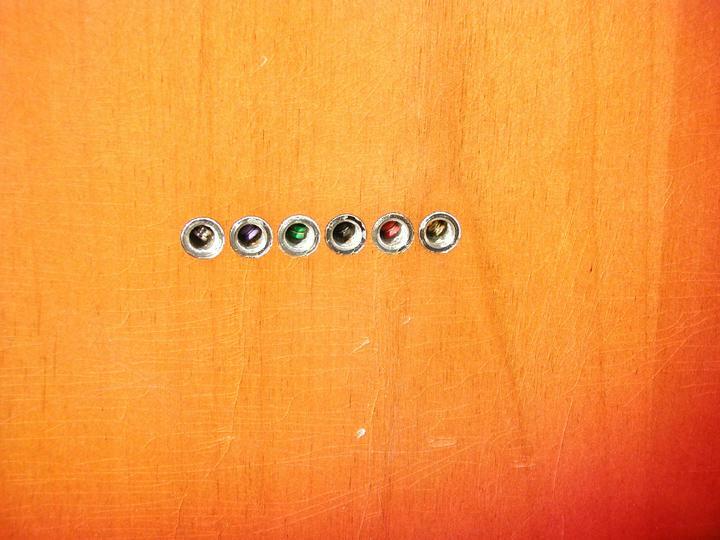 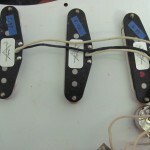 3 way switching: (1) no tone control (bright), (2) tone control, (3) no tone control (dark). 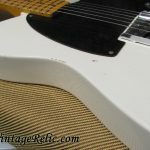 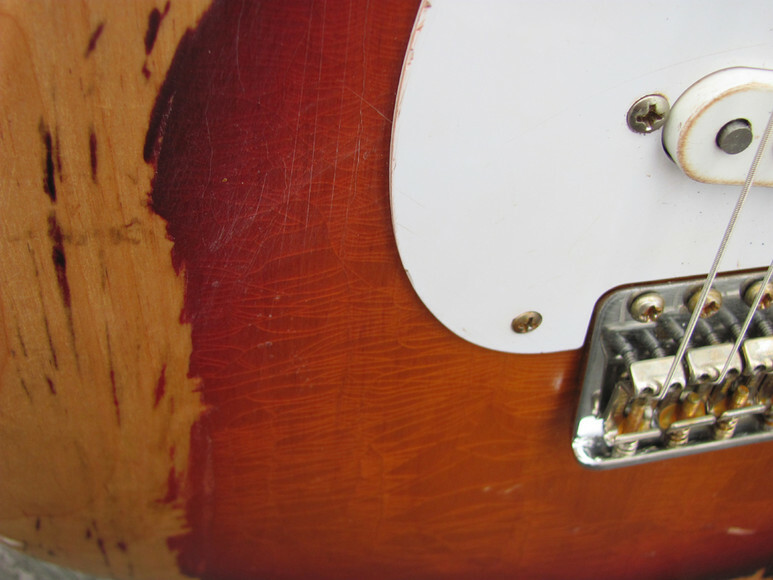 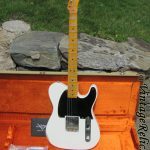 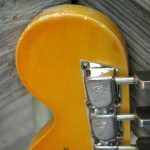 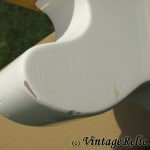 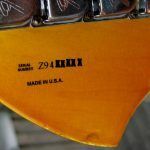 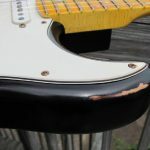 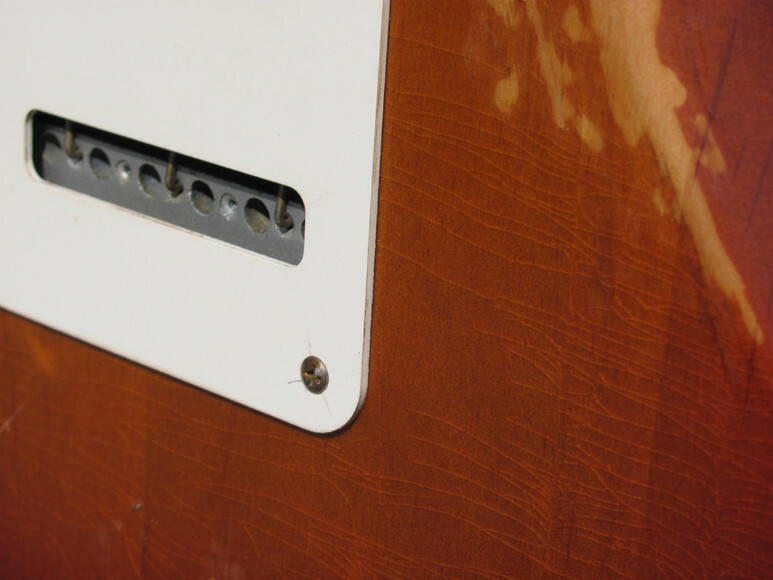 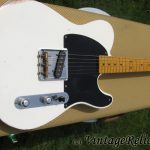 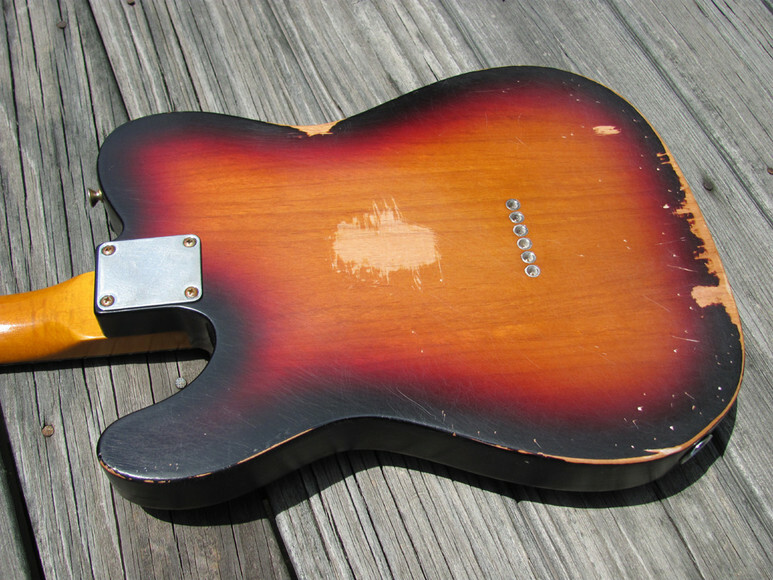 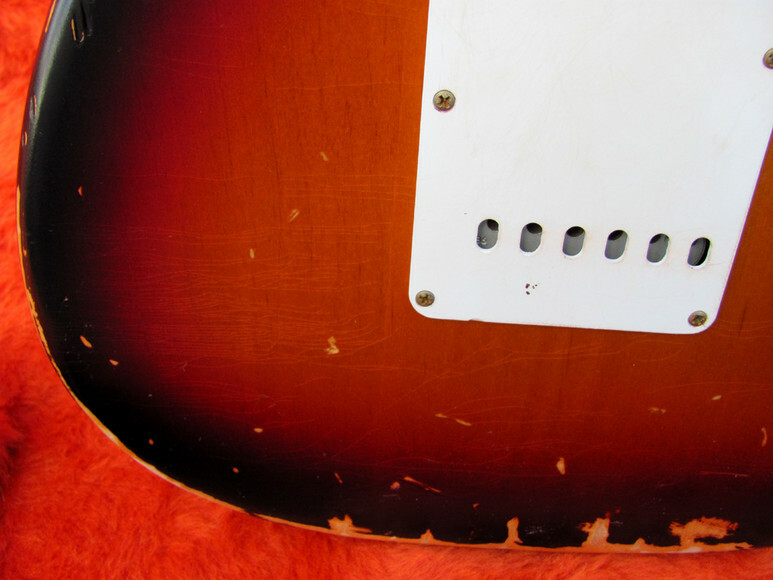 This guitar started as a 'Closet Classic' with minor relic'ing; we took the aging process a few steps further to look like a well played vintage '50s Esquire! 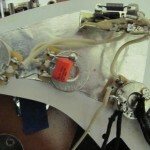 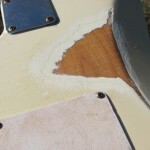 Weather checking throughout the body and neck; dings; buckle wear; fretboard finger wear; arm wear on the body; hand wear on the side of the neck; aged hardware. 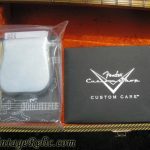 Includes Fender G&G tweed case w/keys, Custom Care package (documentation inside), unopened case candy (bridge cover/ashtray, polish cloth, owner's manual, sticker, etc. 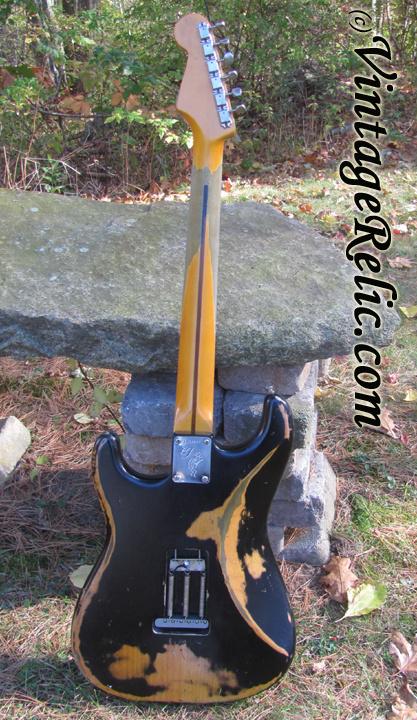 Heavily relic'd for a client. 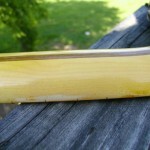 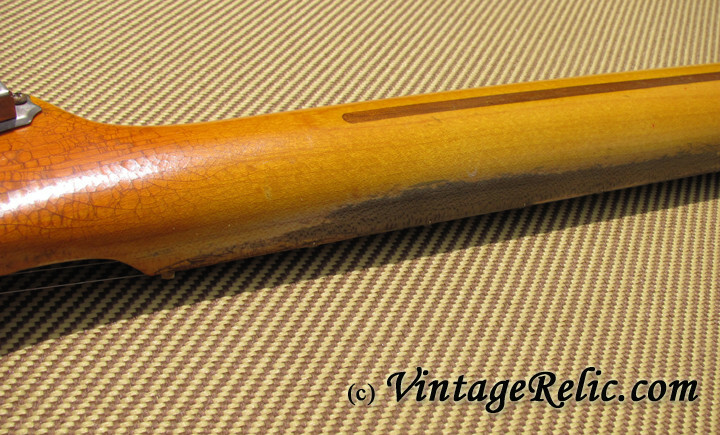 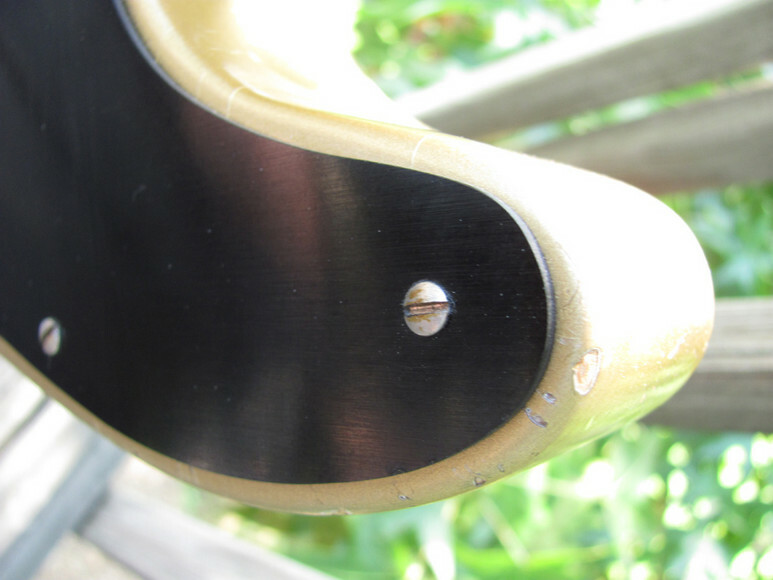 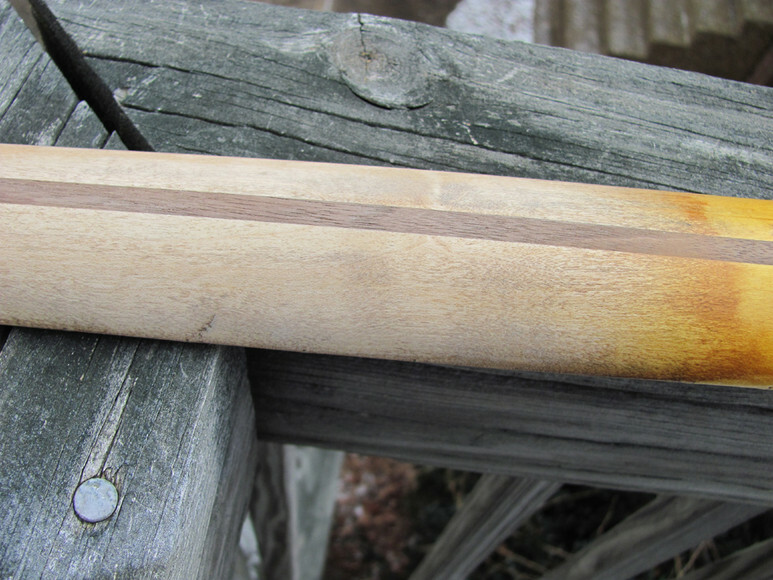 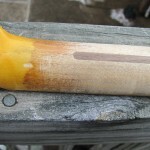 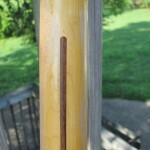 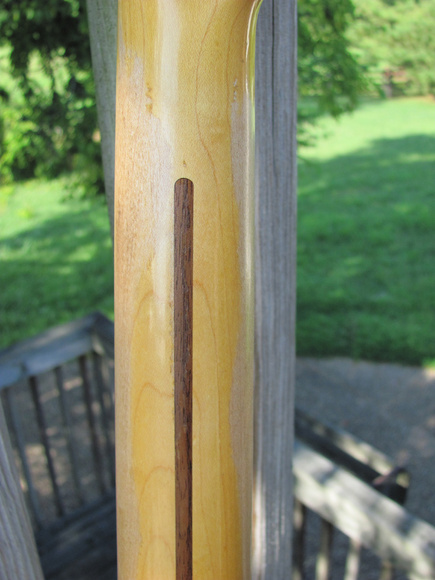 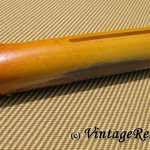 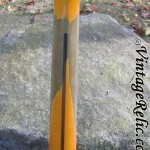 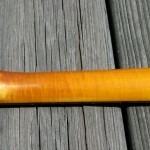 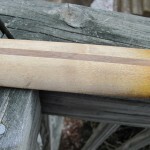 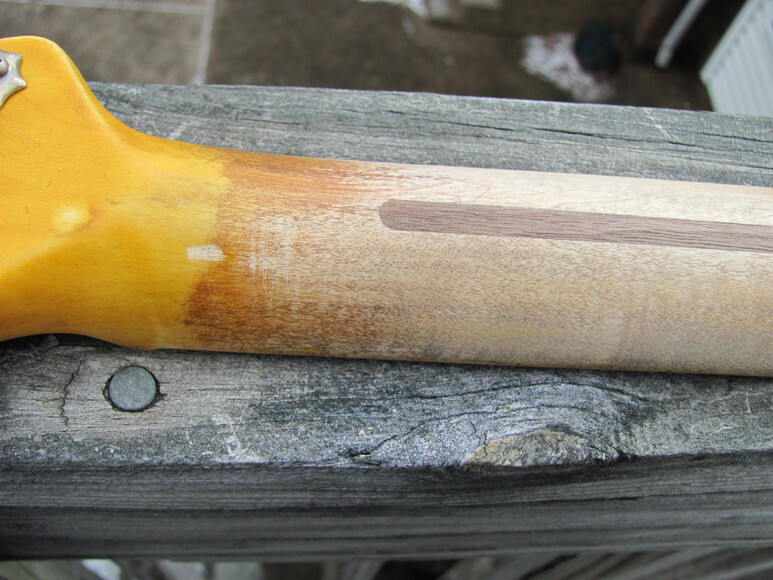 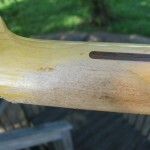 Weather checking; arm and edge wear; darkened bare wood; etc. 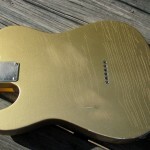 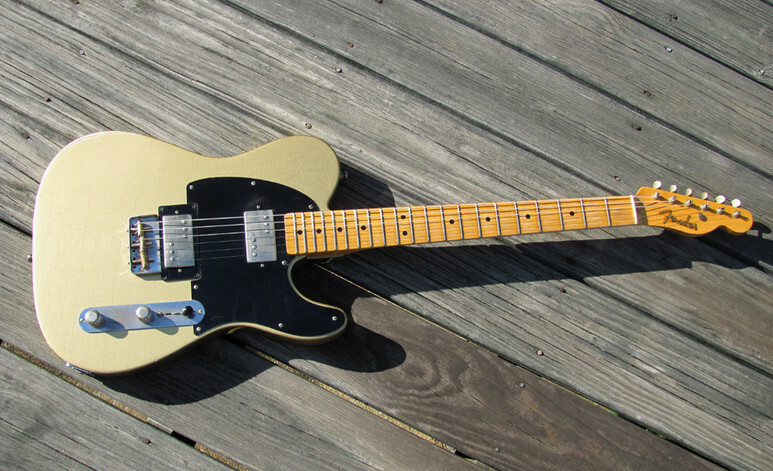 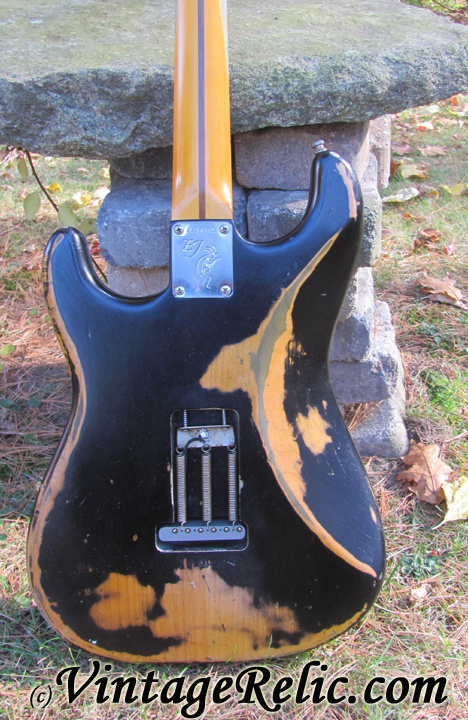 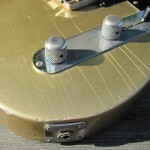 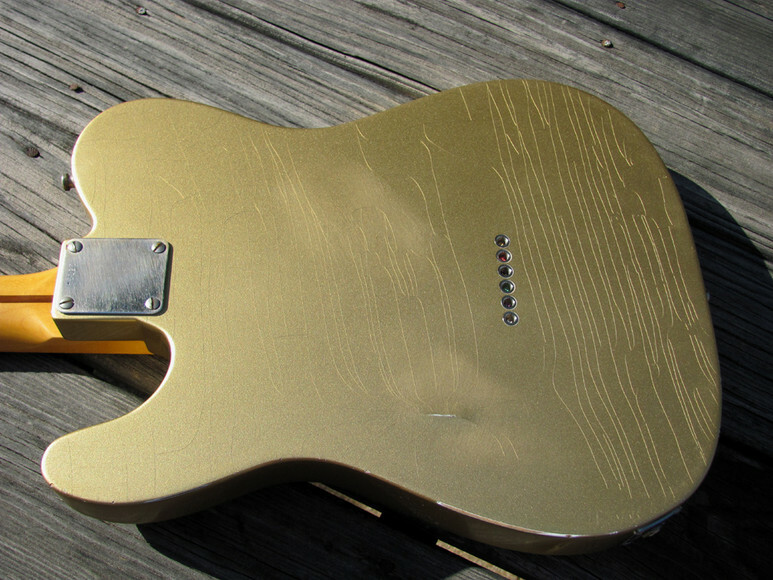 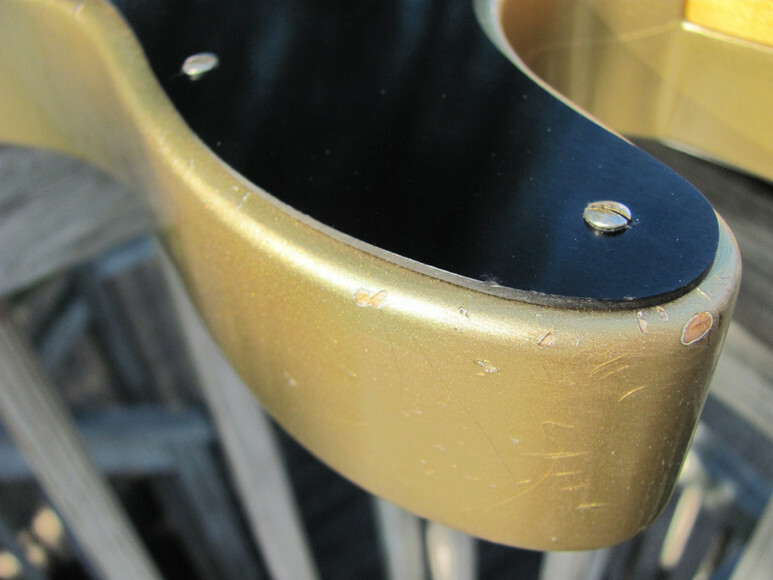 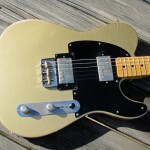 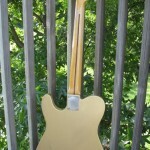 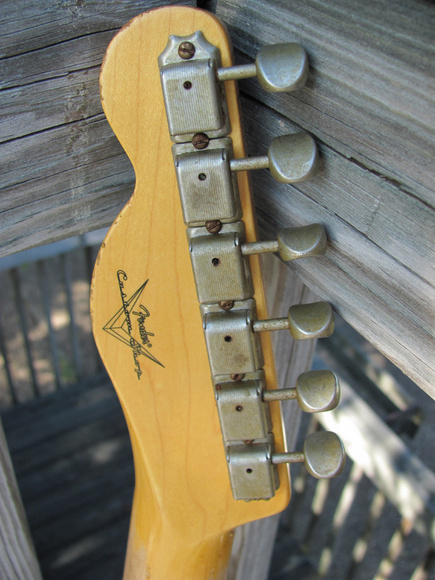 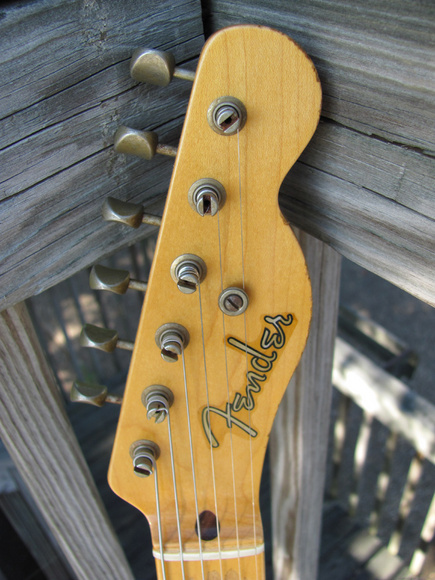 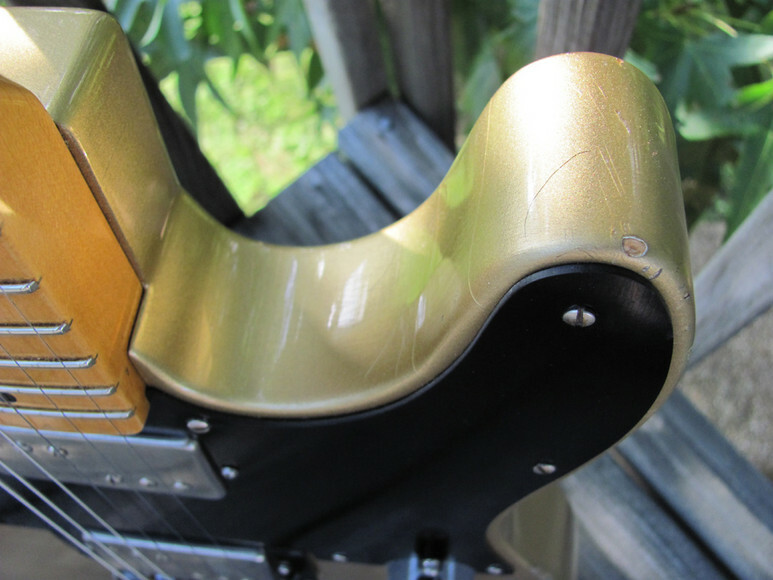 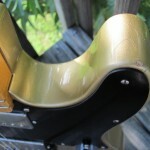 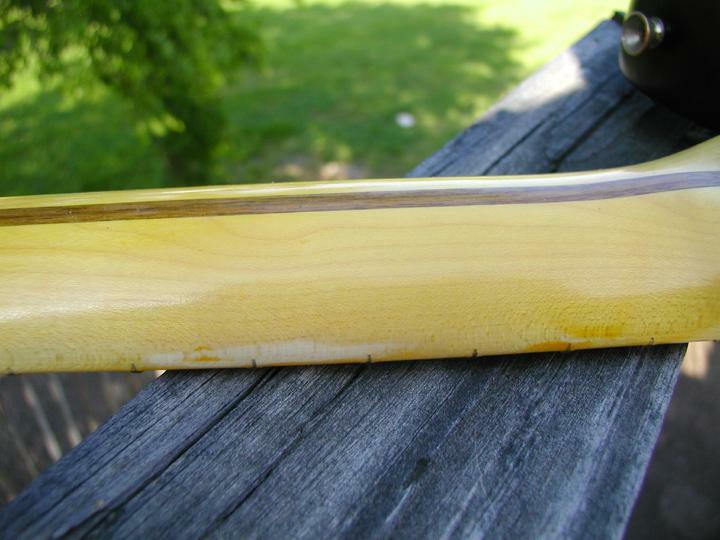 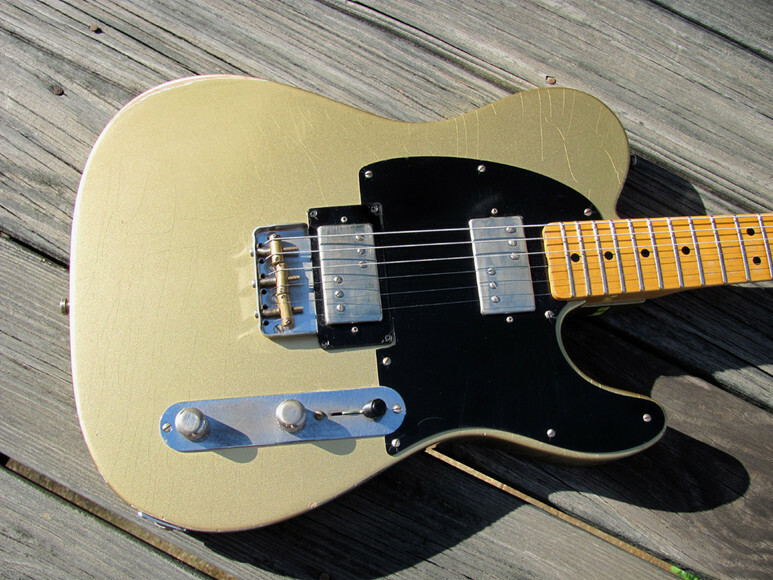 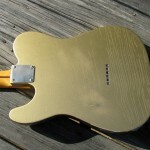 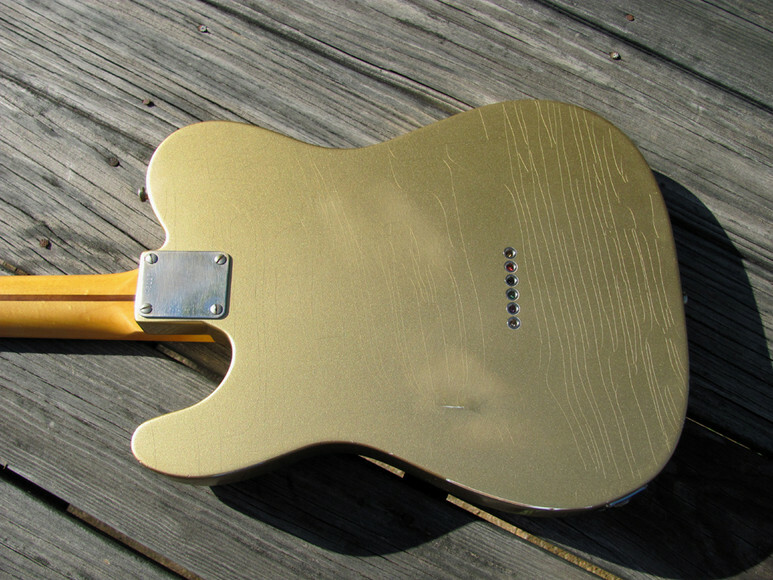 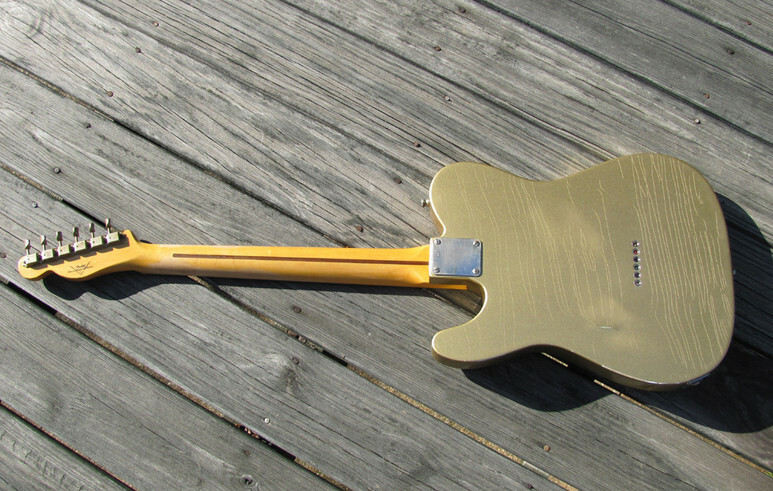 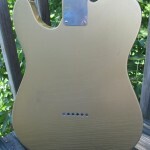 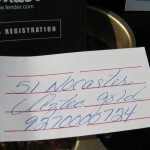 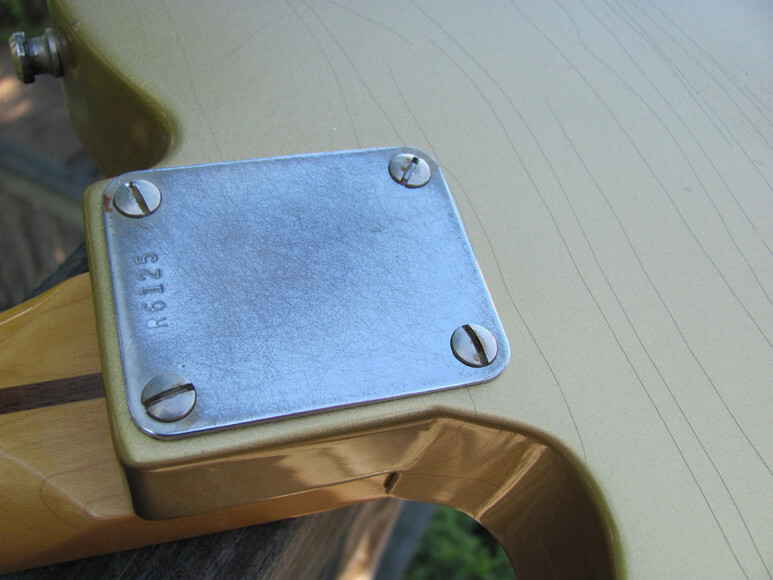 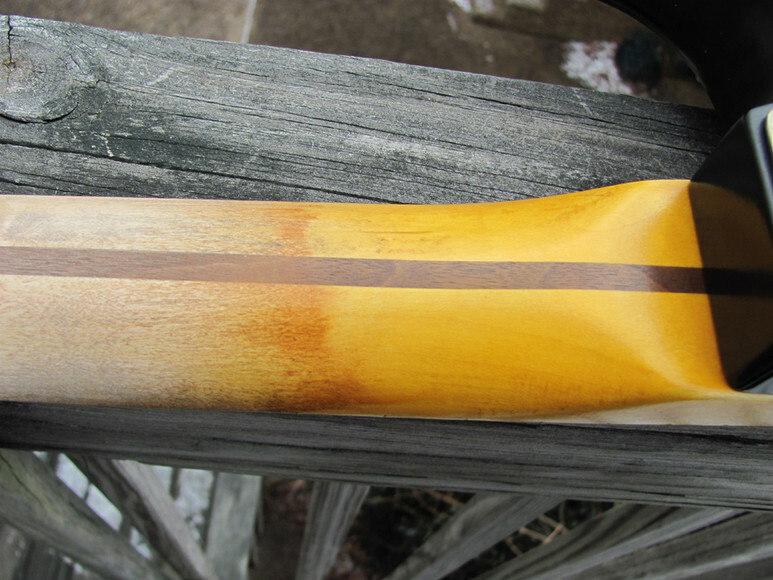 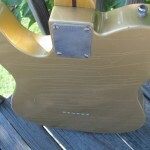 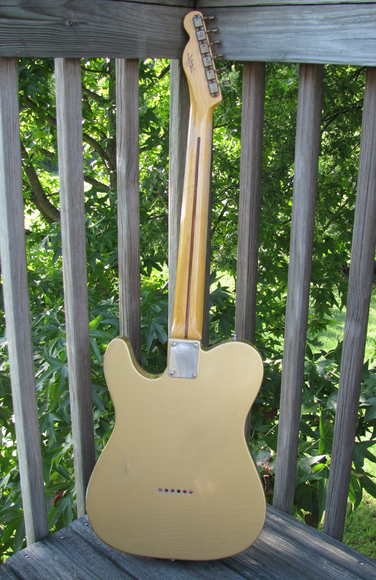 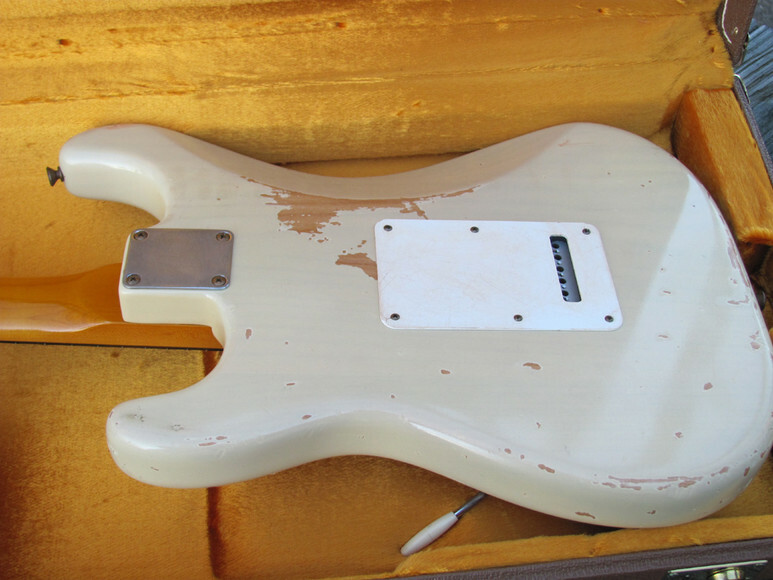 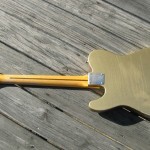 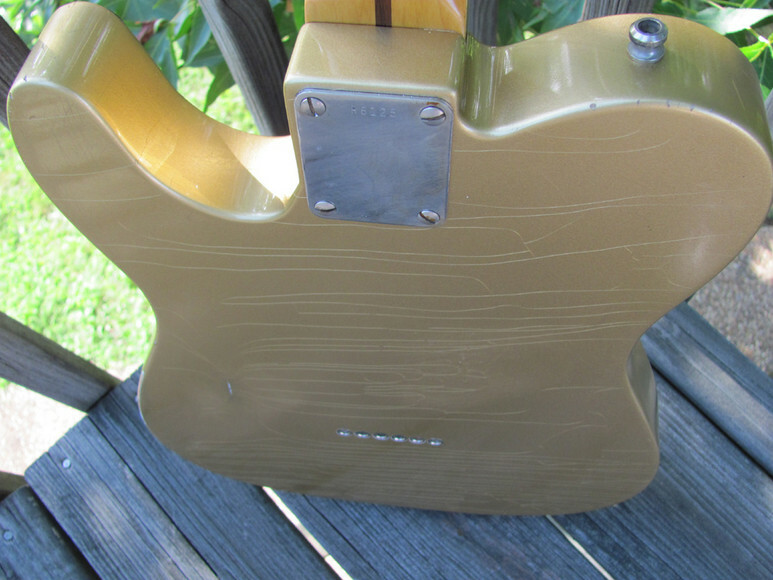 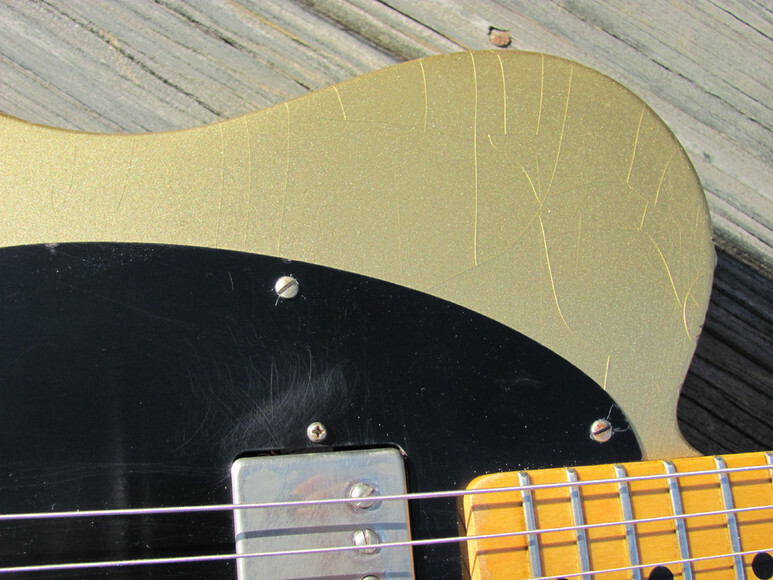 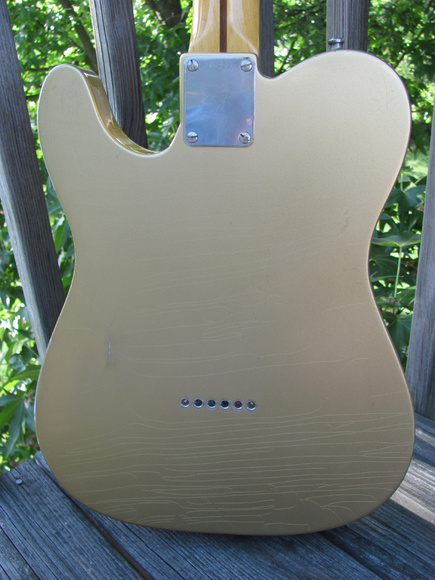 This started as a NOS (new old stock) Fender Custom Shop guitar with a thin nitro finish (Aztec Gold). 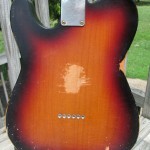 It has undergone a complete aging. 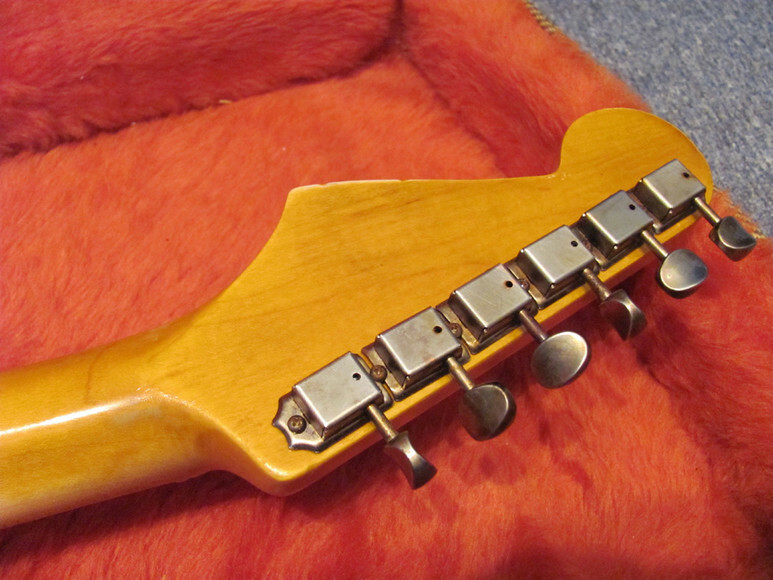 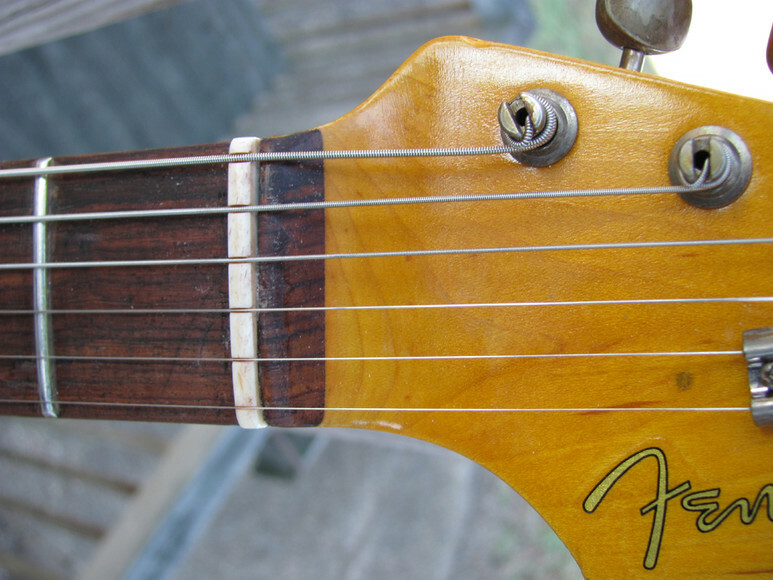 It was routed for humbuckers and has a set of superb sounding Fralin P-92s. 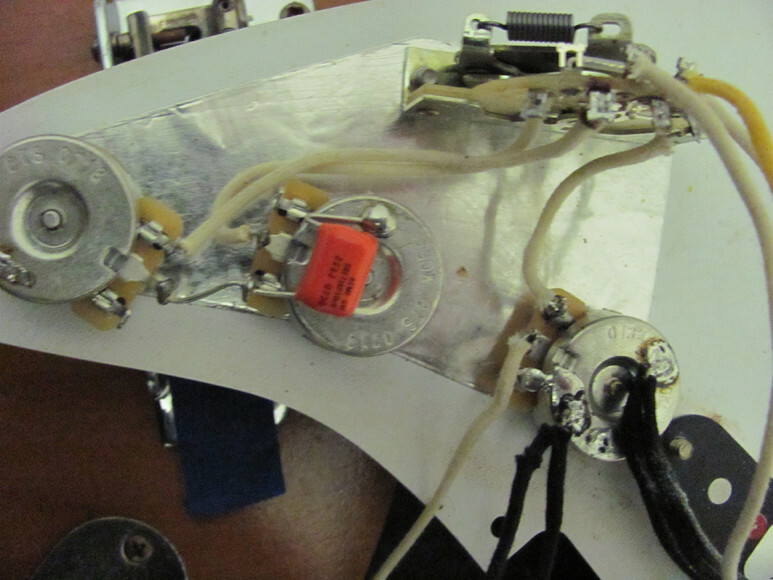 All cloth wiring harness with 500k pots and a Luxe Grey Tiger capacitor. 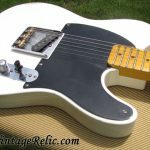 This is a fat sounding Tele with a HUGE neck profile and tall frets (which were recently plek'd for optimum playability). 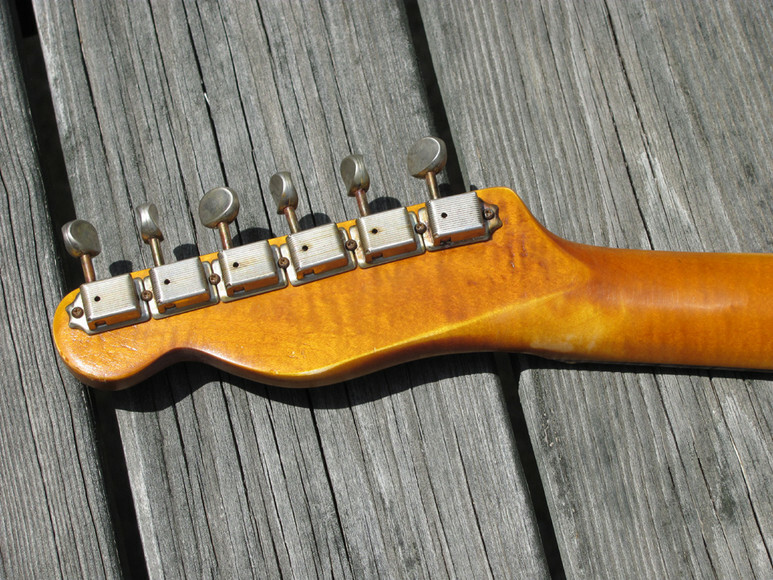 Lightweight at 7.5 lbs. 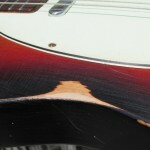 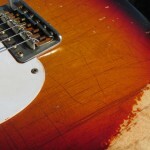 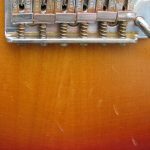 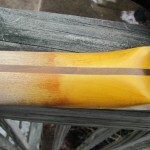 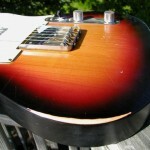 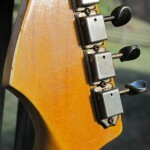 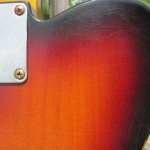 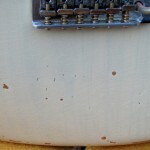 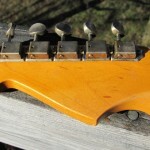 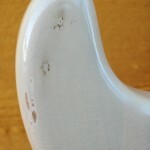 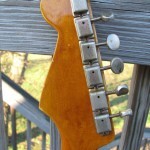 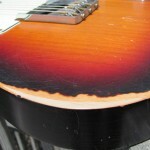 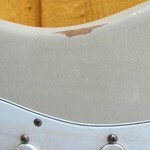 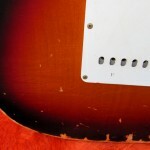 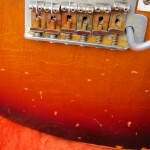 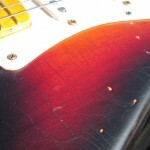 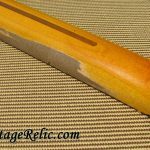 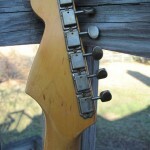 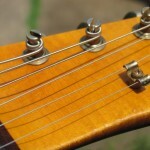 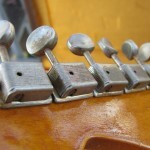 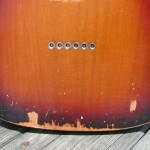 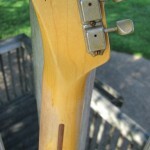 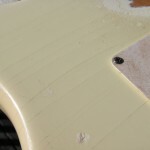 Moderate to heavy relicing; heavy 'weather' (lacquer) checking; moderate body wear; heavy fretboard wear; moderate wear to back of neck. 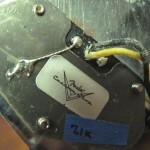 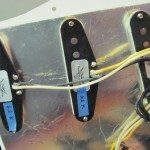 Inside is completely shielded (tape) in case you ever decide to change back to single coil pickups. 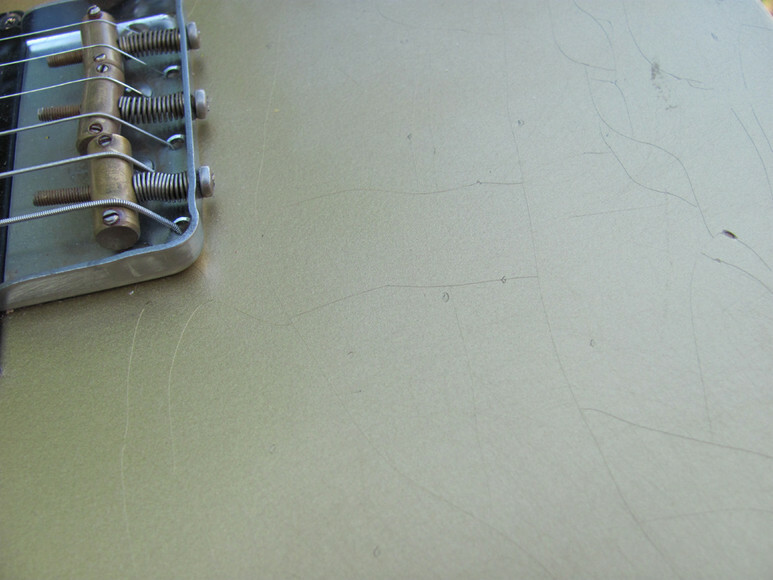 Setup with Ernie Ball Hybrid Slinky strings (.009-.046). 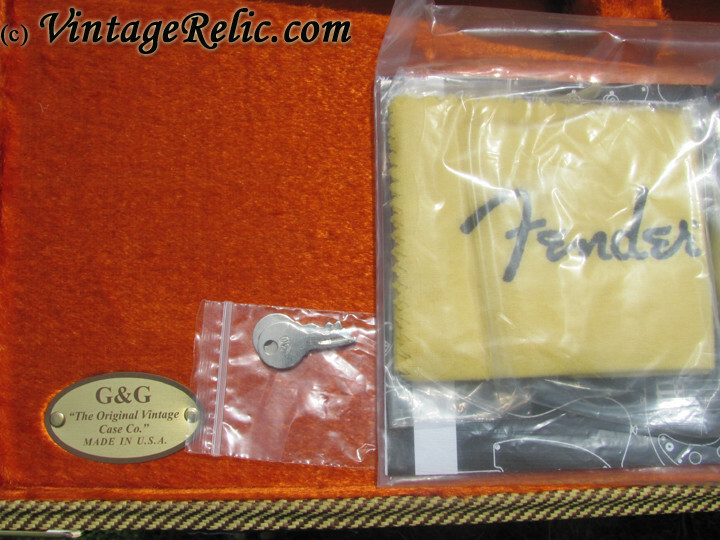 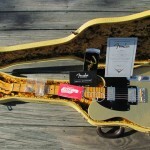 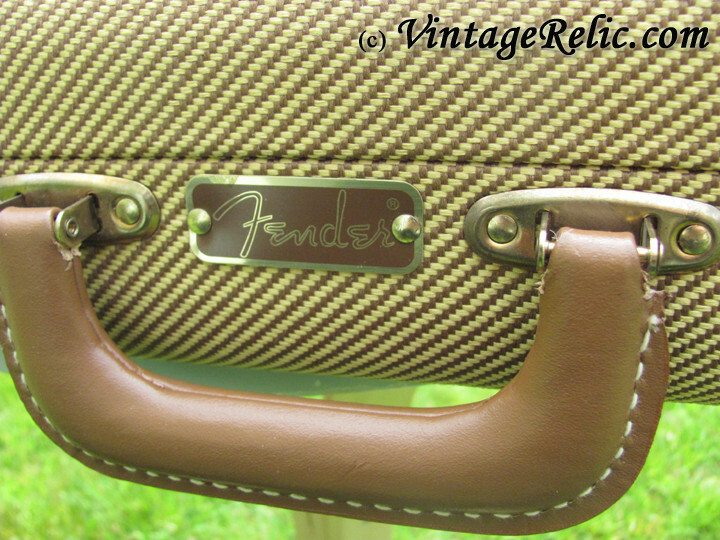 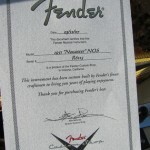 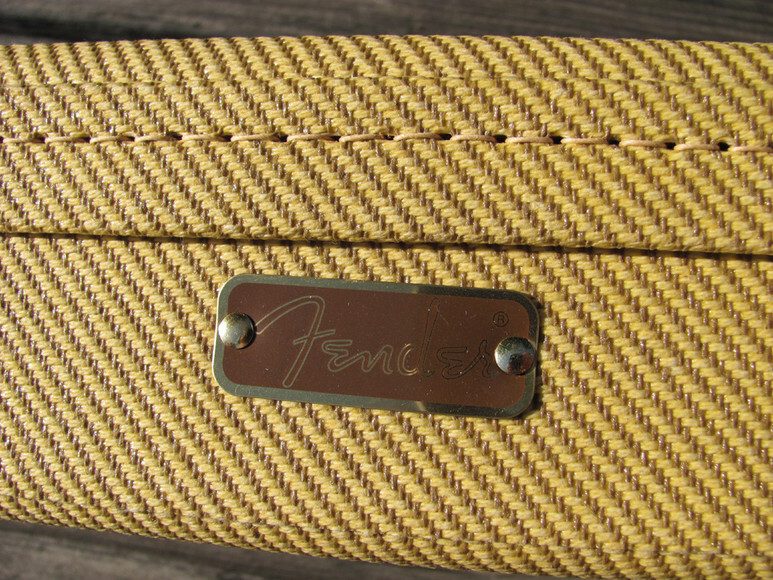 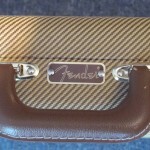 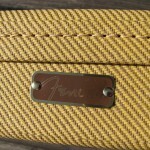 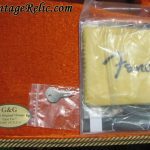 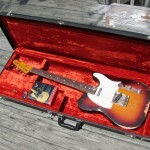 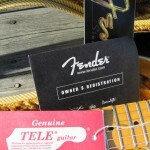 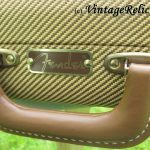 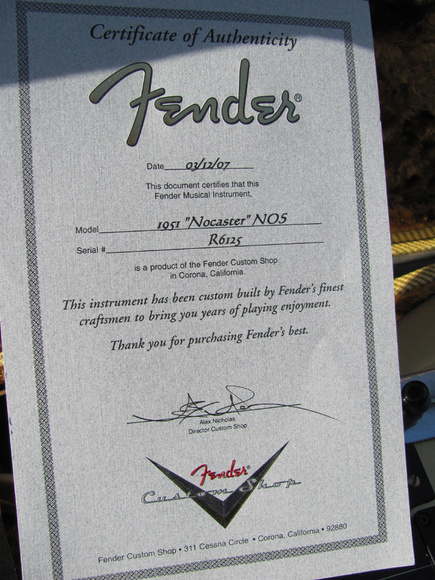 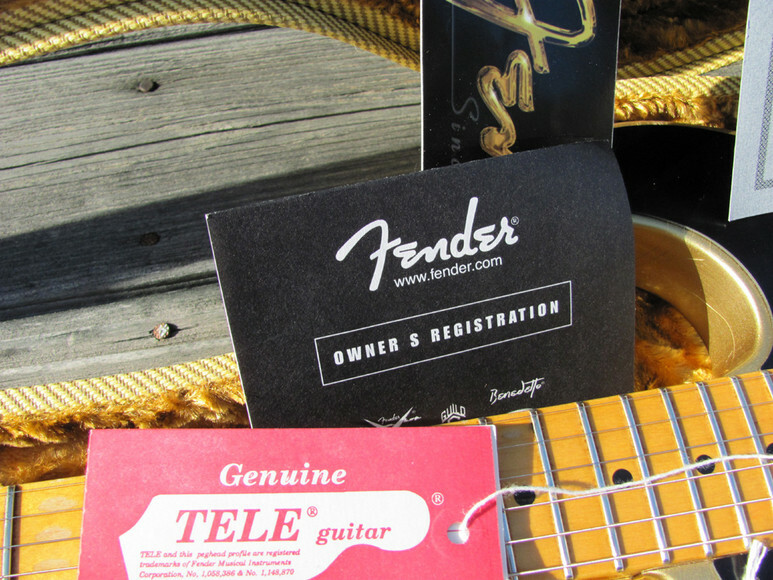 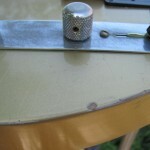 Includes original Fender 'Thermometer' tweed case (and key), Fender Custom Shop COA, and hangtags. 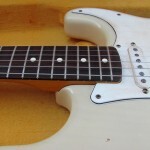 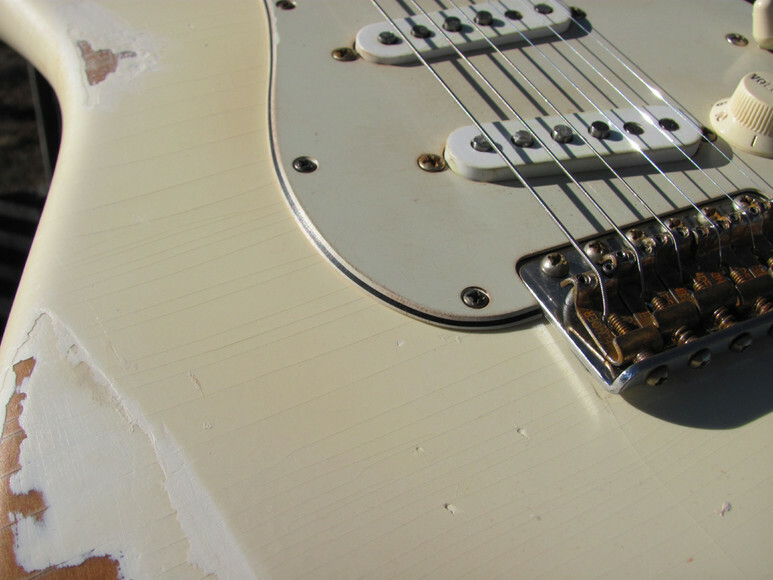 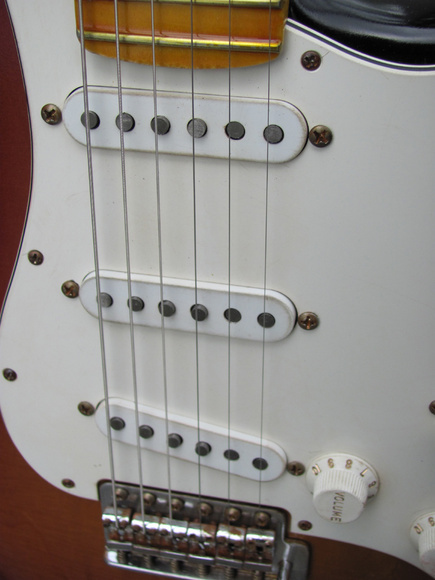 Fender Stratocaster Vintage Relic '62 Oly White' Fender USA '62 American Vintage Reissue in Olympic White. 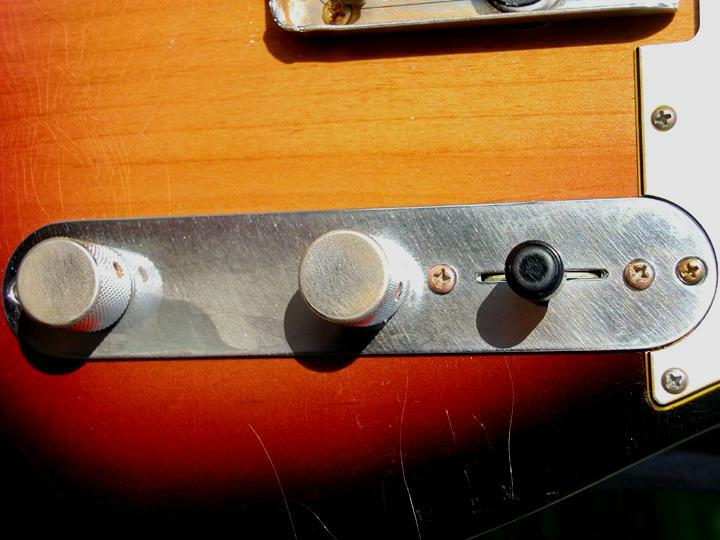 New (real, not synthetic) bone nut (precisely cut on a Plek machine) and pro setup. 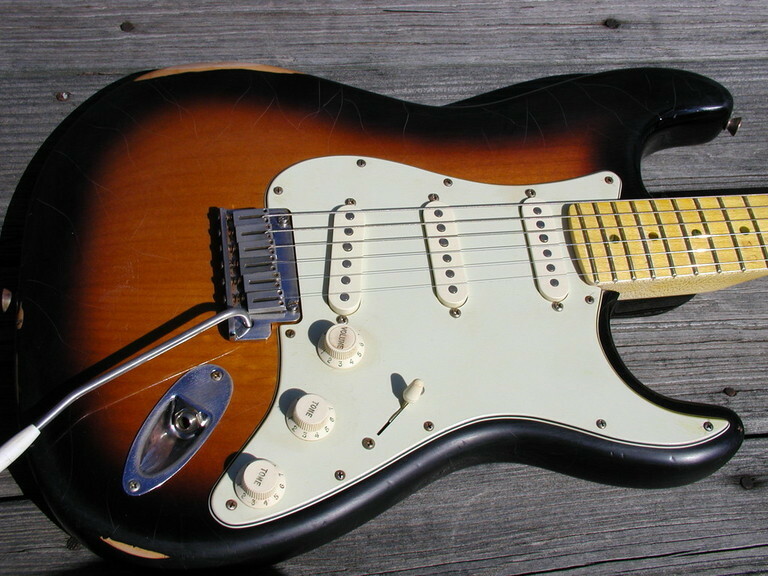 Alder body has a nitro gloss finish; C shaped neck, rosewood fretboard with 7.25' radius and vintage size frets, tinted nitro finish); Fender Custom Shop Custom '54 Strat pickups; Cloth wiring harness/5 way switch; Fender Deluxe '62 RI brown tolex case. 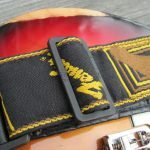 It has undergone a complete aging relicing: weather checking throughout the body and neck, dings, scratches, arm wear, belt buckle wear, play wear on back of neck, etc. 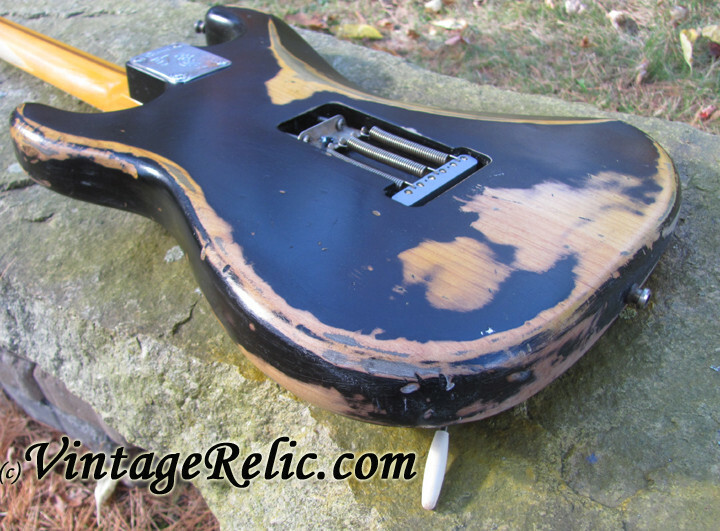 All finish is nitro; all hardware and plastic aged relic'd. 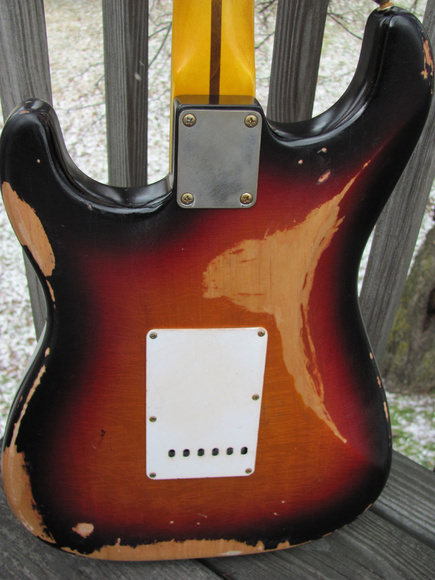 Looks and feels like a 1962 Strat! 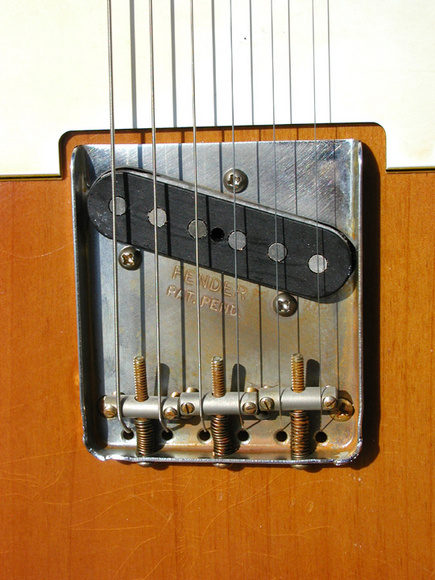 Plays great and these Custom Shop '54 pickups are articulate and punchy--bell-like cleans and can really sing with some distortion. 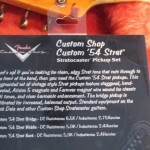 Setup with D'Addario EXL120 strings (.009-.042). 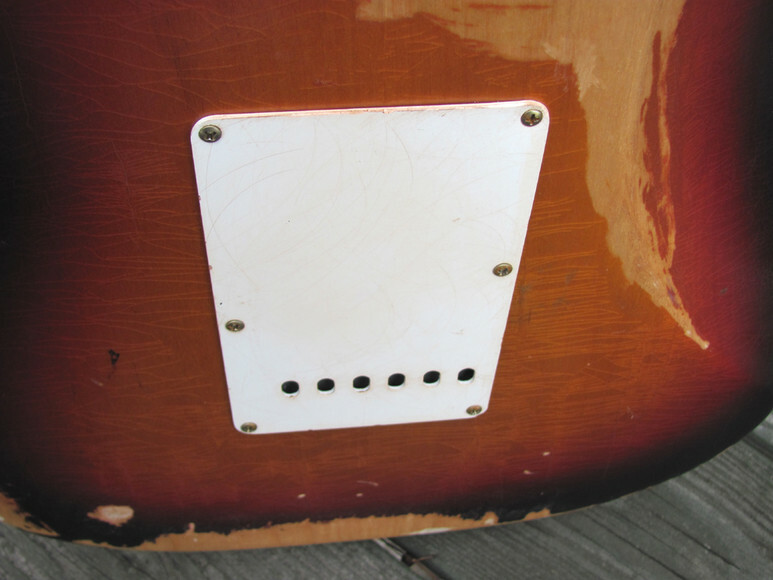 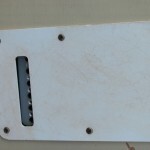 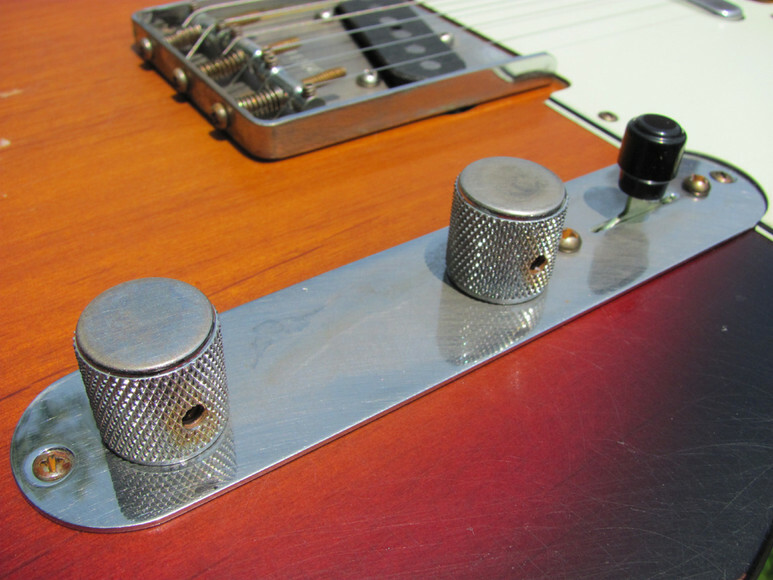 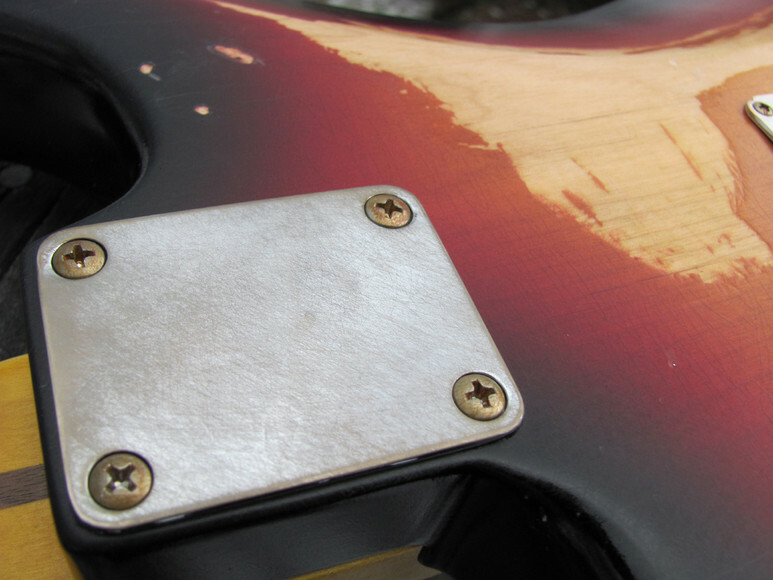 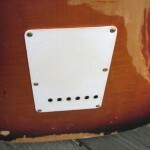 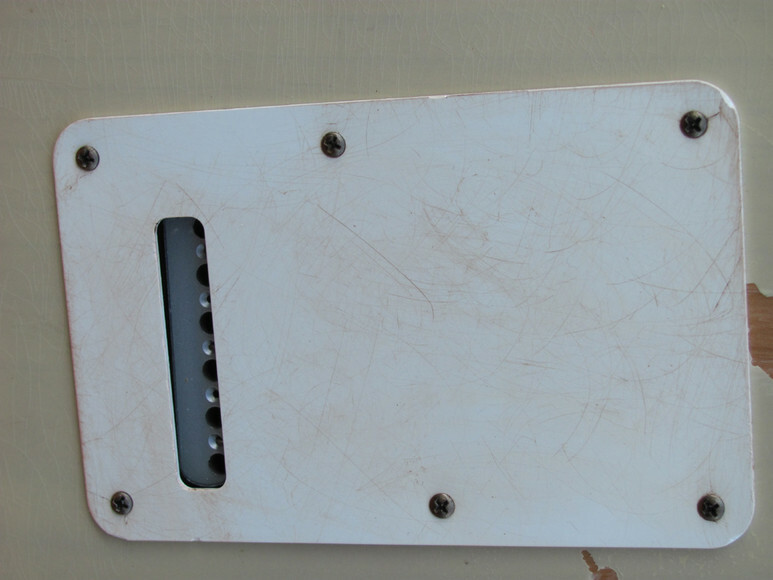 Original neck plate will be included (V series serial #). 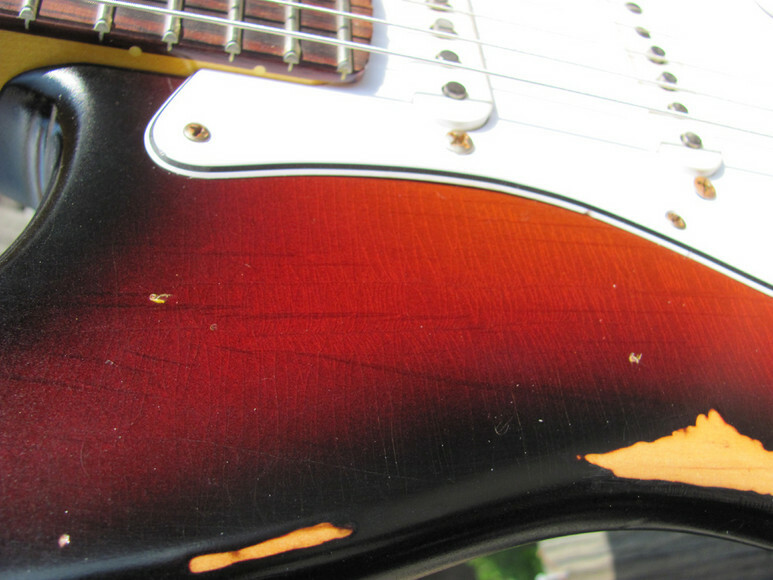 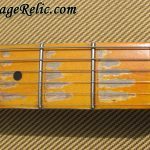 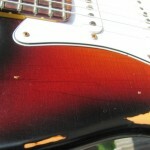 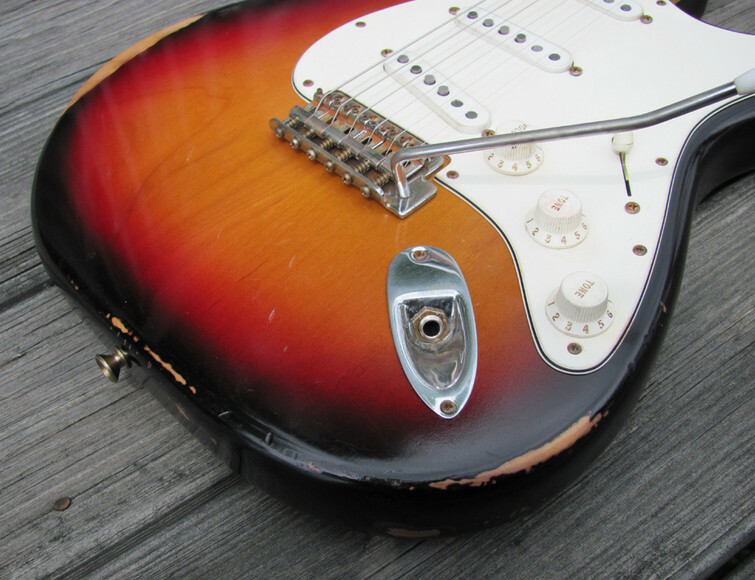 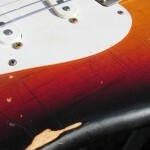 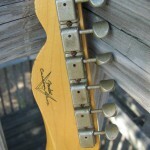 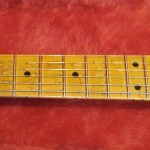 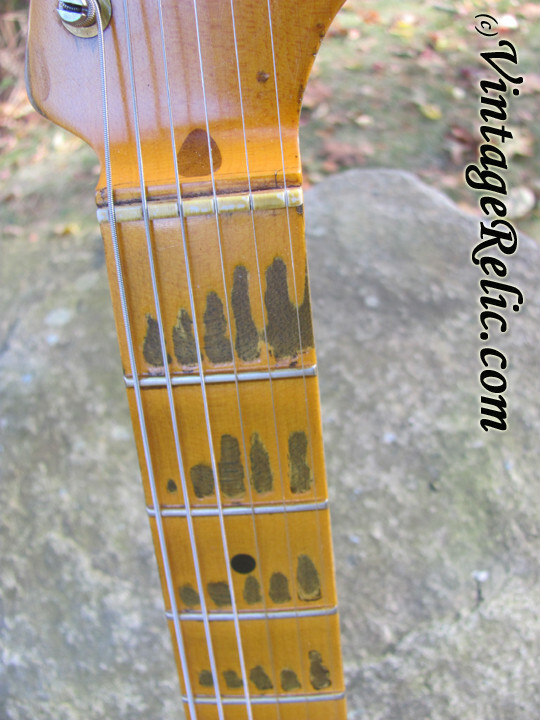 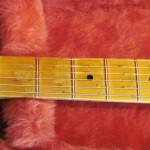 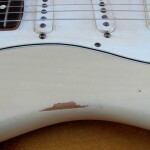 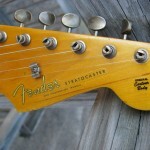 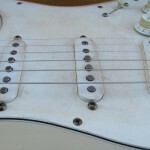 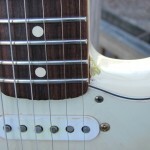 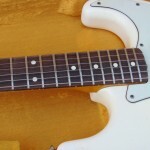 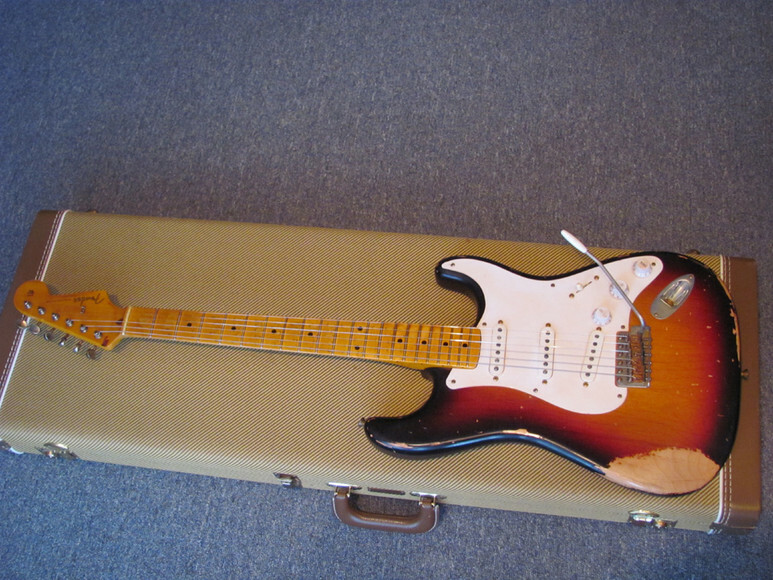 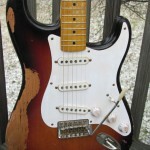 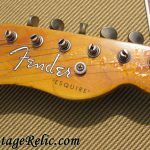 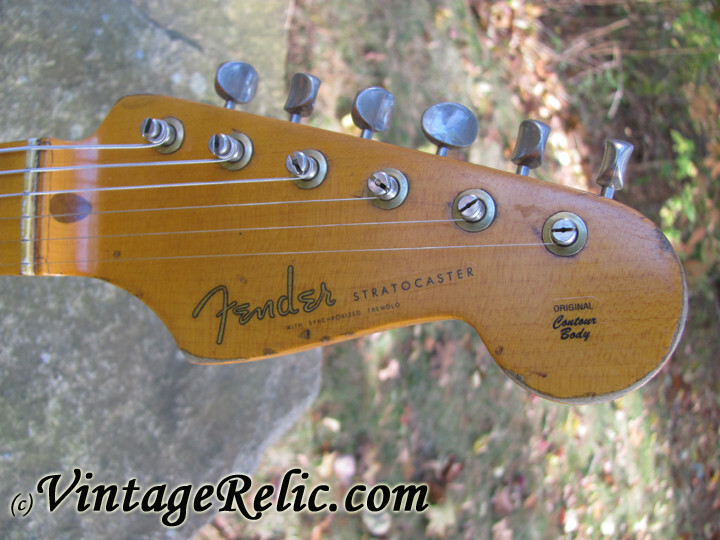 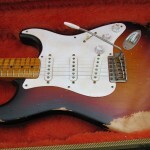 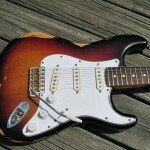 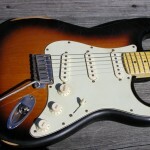 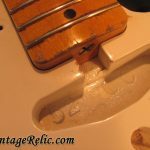 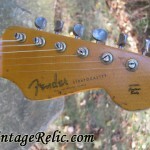 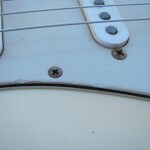 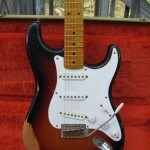 Fender Stratocaster Vintage Relic '57 Hot Tex.' 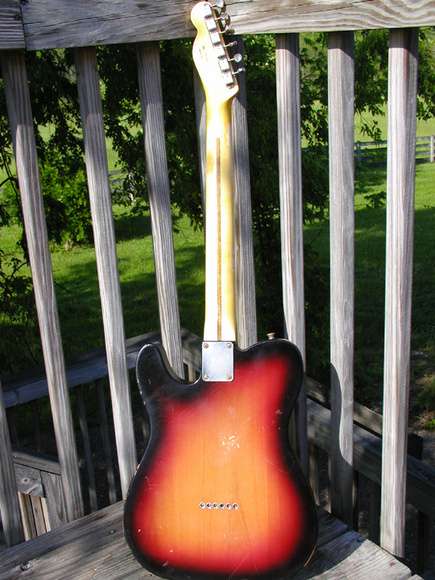 Fender USA body with thin nitro gloss finish (vintage 2-tone sunburst) and Fender reissue neck (maple fretboard 7.25' radius, vintage size frets with NO fretwear, slight V profile, tinted nitro finish); Fender Custom Shop Texas Special pickups; Cloth wiring harness/5 way switch; Fender hardware; Fender Deluxe gig bag (OR upgrade for a Benjamin to a Fender tolex case). 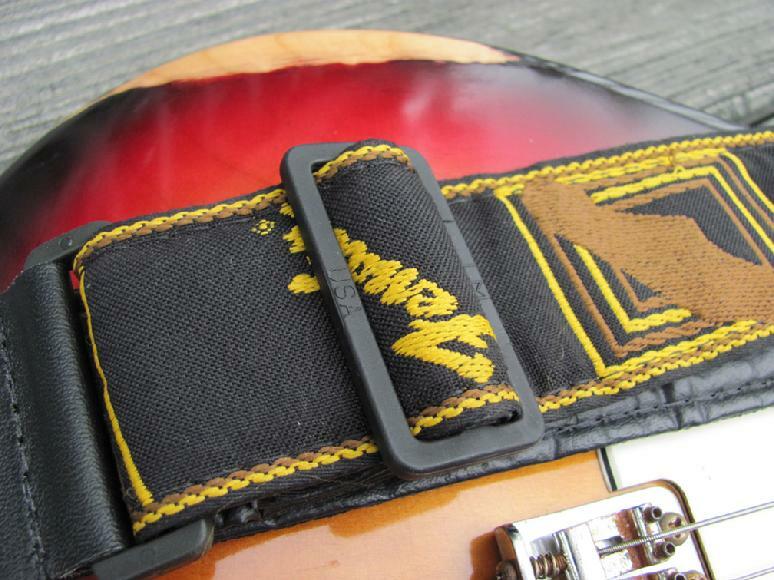 It has undergone a complete aging relicing: weather checking throughout the body and neck, dings, scratches, arm wear, belt buckle wear, fretboard wear, etc. 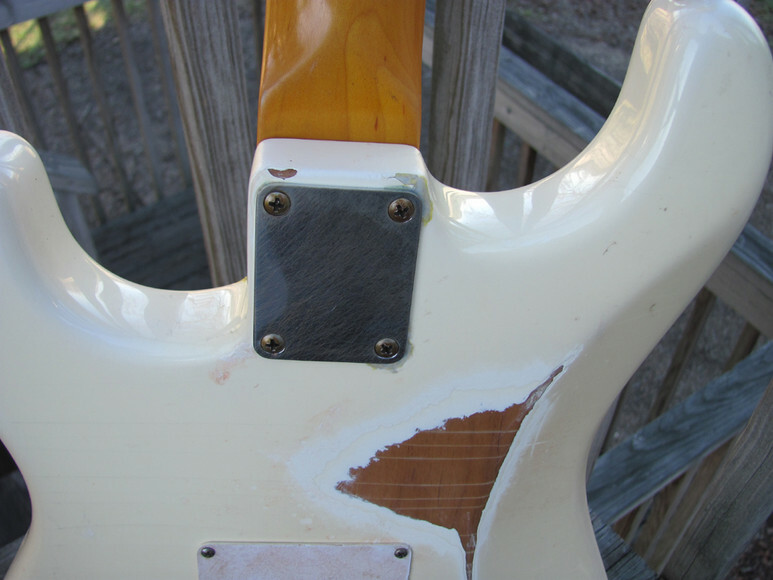 All finish is thin nitro; all hardware and plastic aged relic'd. 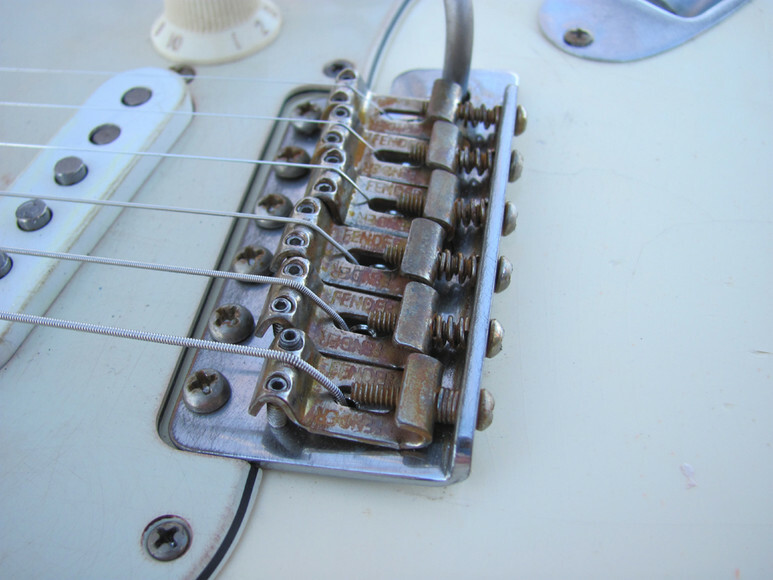 Looks and feels like a late 1950s Strat! 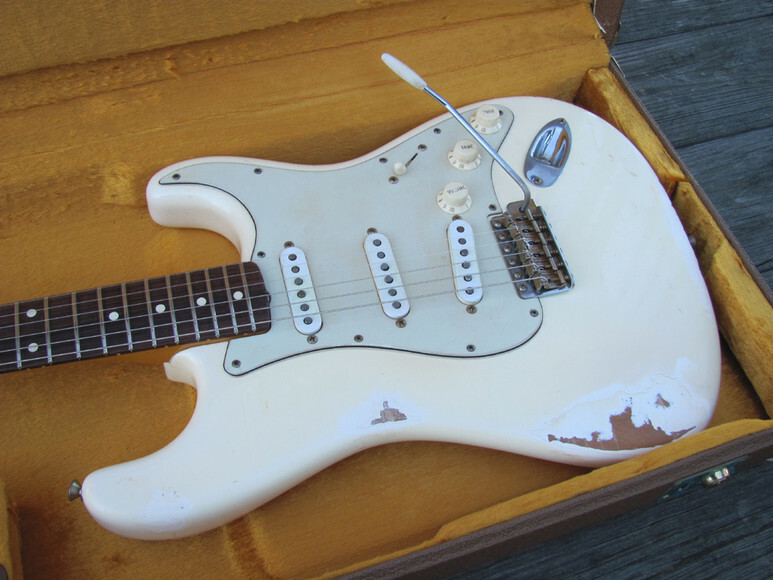 Lightweight at just 7.0 pounds! 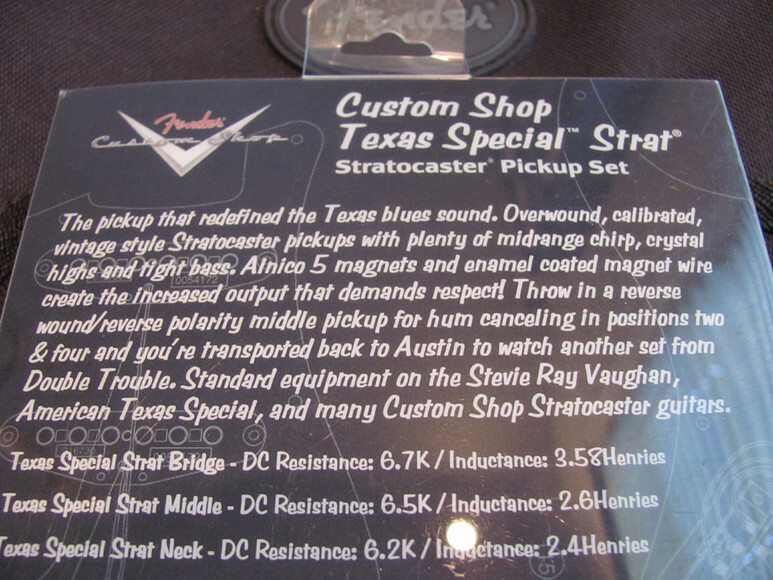 Plays great and these Custom Shop Texas Special pickups are nice and HOT--great for rock and blues (and hum canceling in positions 2 and 4). 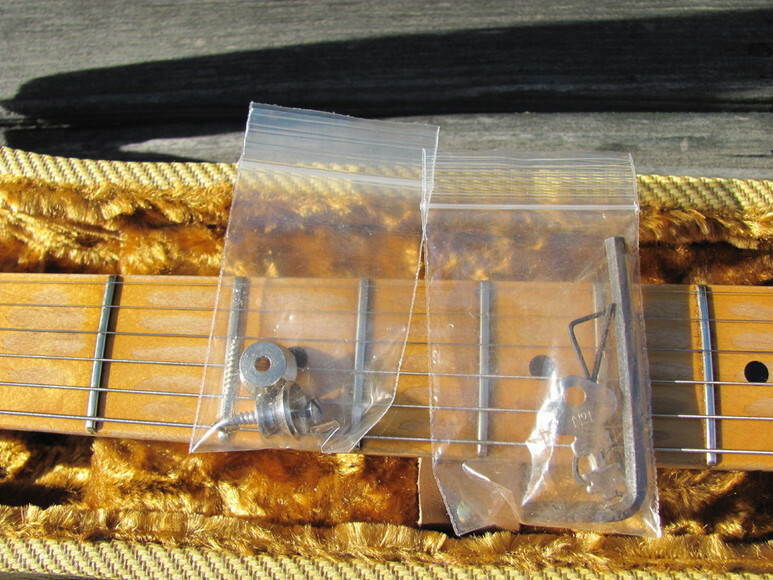 Setup with D'Addario EXL120 strings (.009-.042). 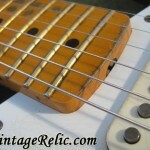 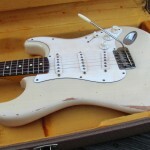 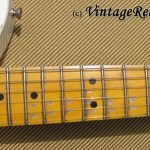 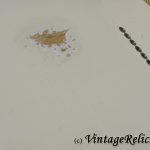 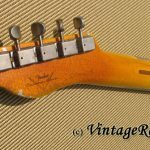 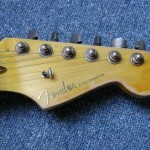 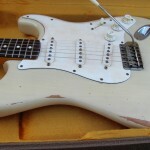 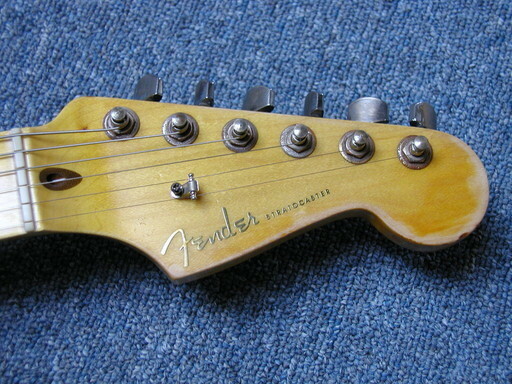 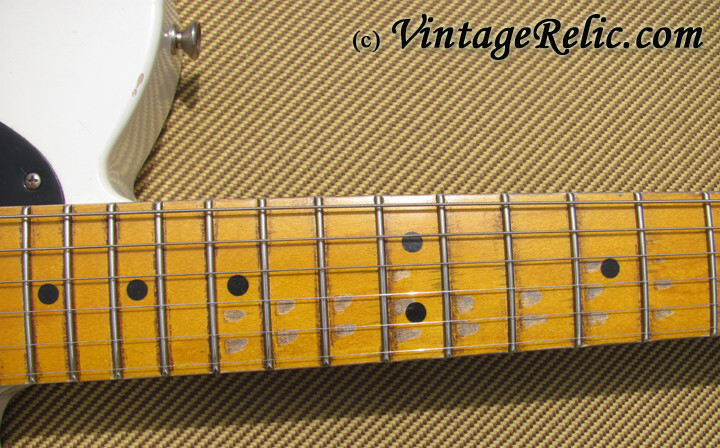 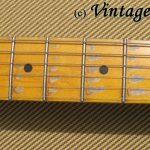 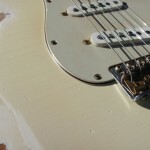 Fender Stratocaster Vintage Relic ''62 Blonde'. 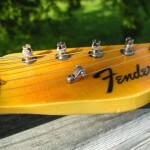 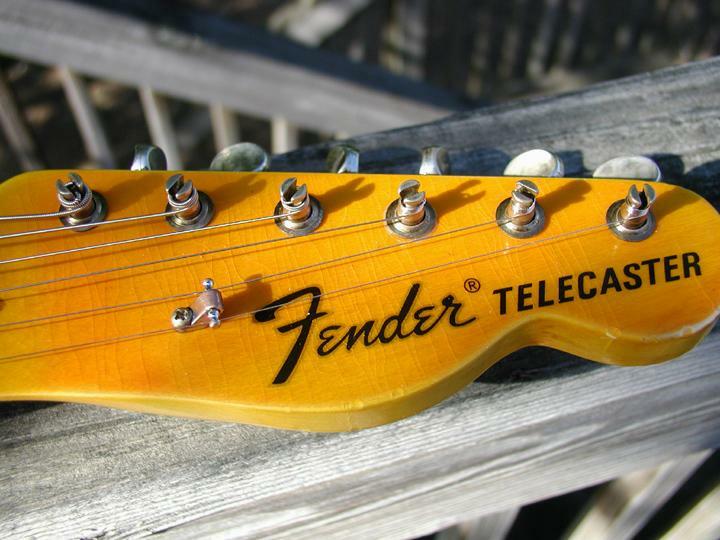 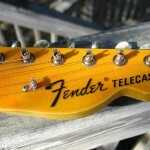 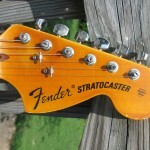 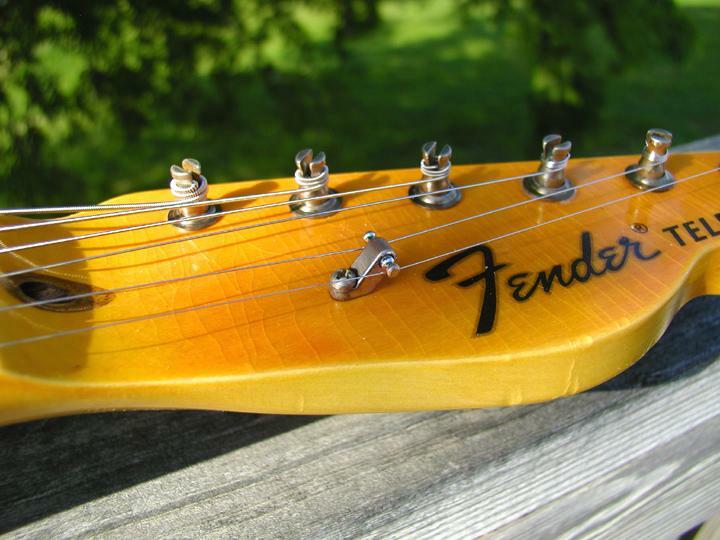 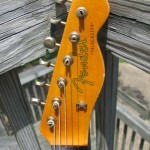 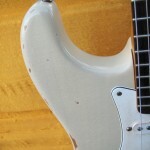 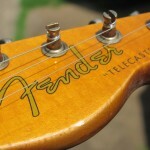 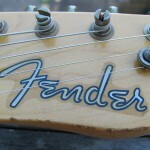 Fender USA body with thin nitro gloss finish (beautiful see through blonde!) 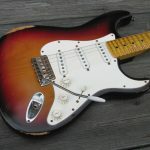 and Fender vintage reissue neck (rosewood fretboard 7.25' radius, vintage size frets with NO fretwear); Fender Custom Shop 54 pickups; Fender hardware; Fender 62 reissue hardshell case (with key). 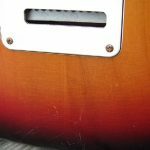 It has undergone a complete aging relicing: weather checking throughout the body and neck, dings, scratches, arm wear, belt buckle wear, etc. 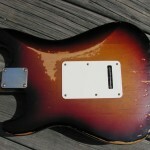 All finish is thin nitro; all hardware and platsic aged relic'd. 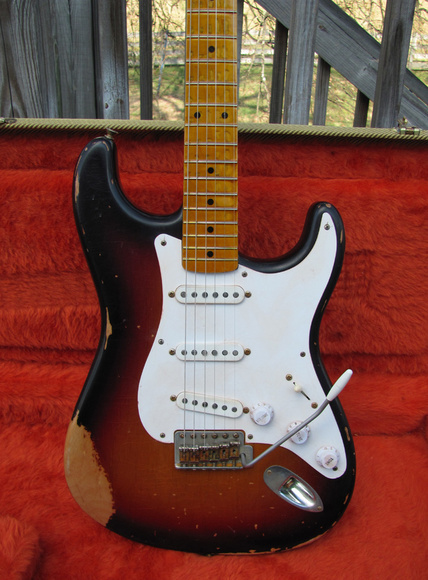 Looks and feels like an early 1960s Strat! 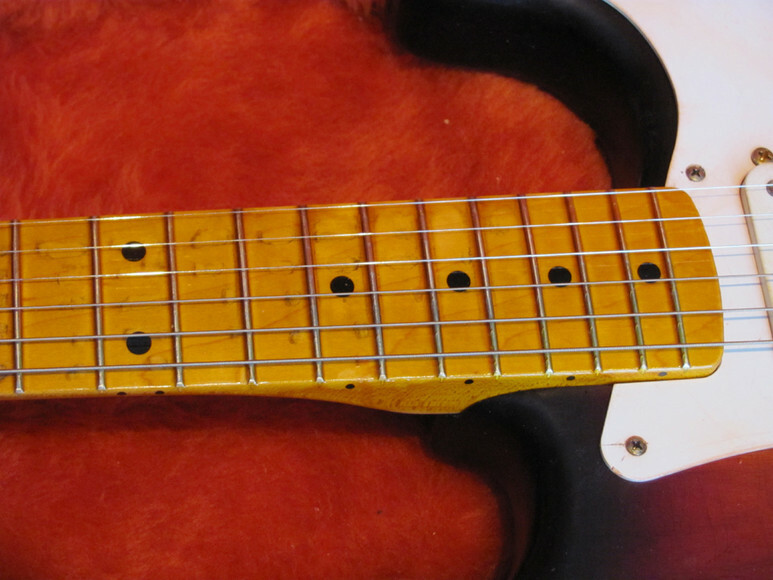 Lightweight at just 7.5 pounds! 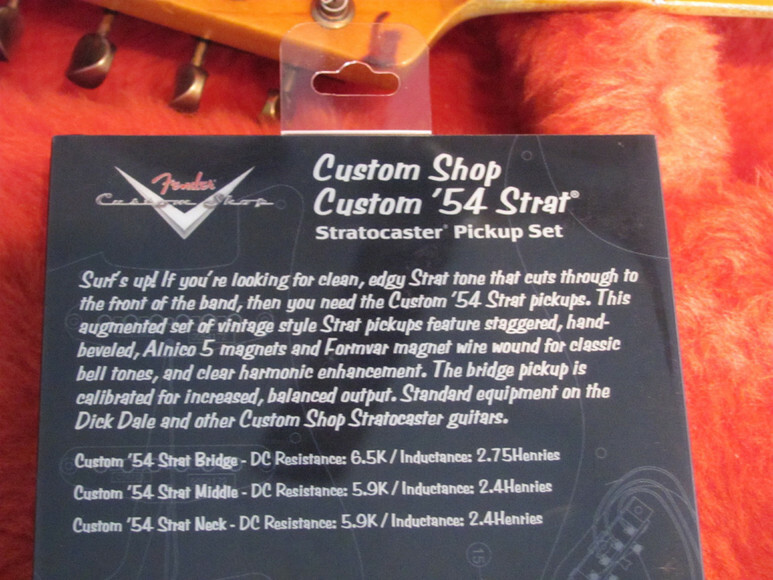 Plays great and these Custom Shop 54 pickups are articulate and punchy--bell-like cleans and can really sing with some distortion. 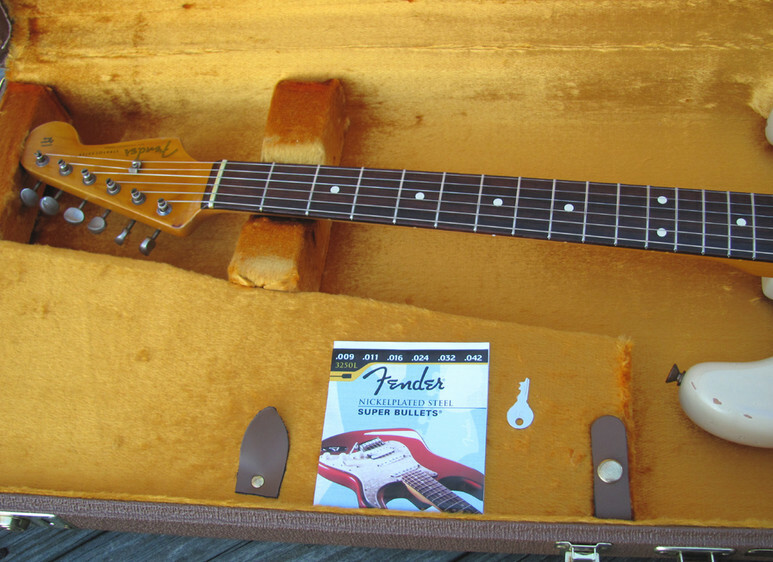 Setup with Fender Super Bullet strings (.009-.042). 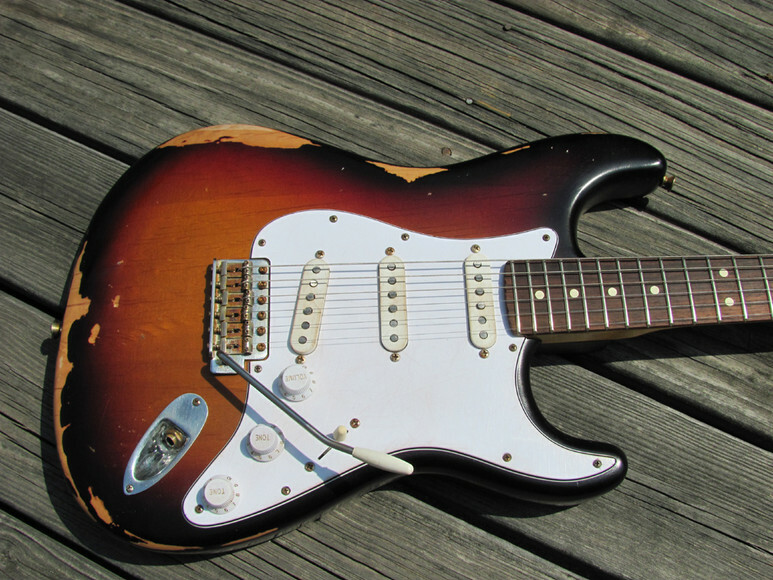 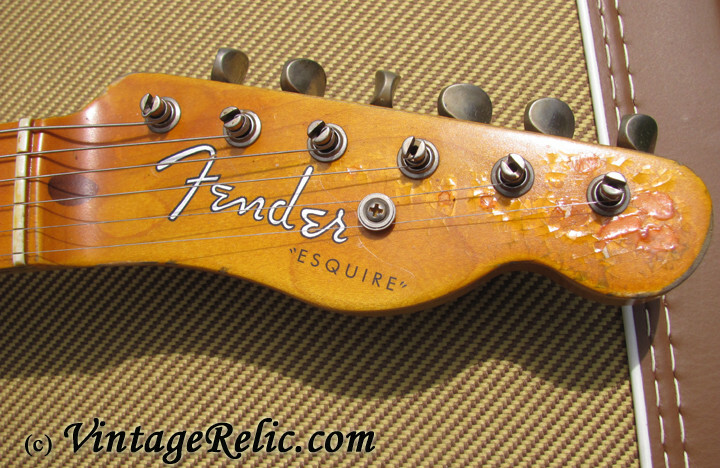 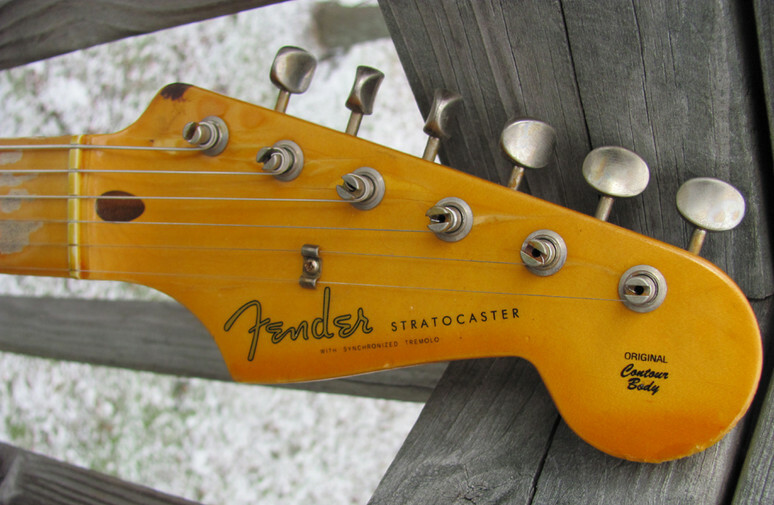 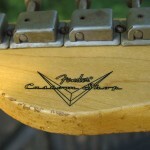 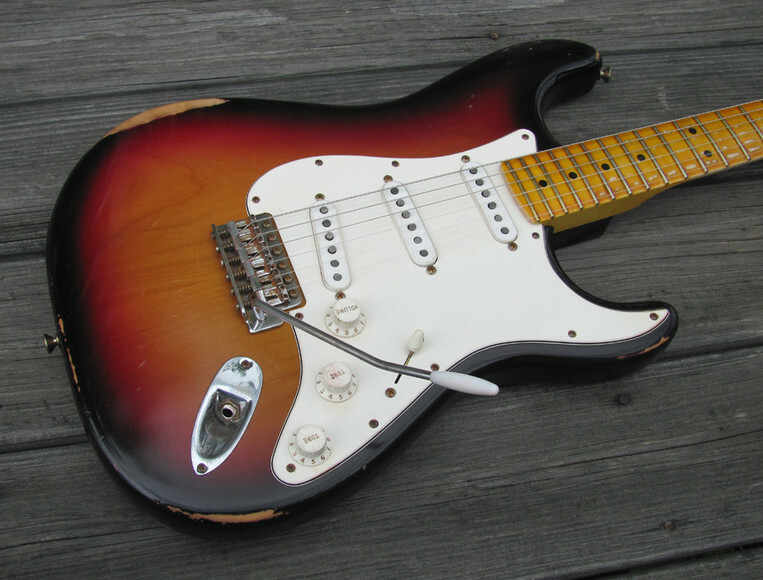 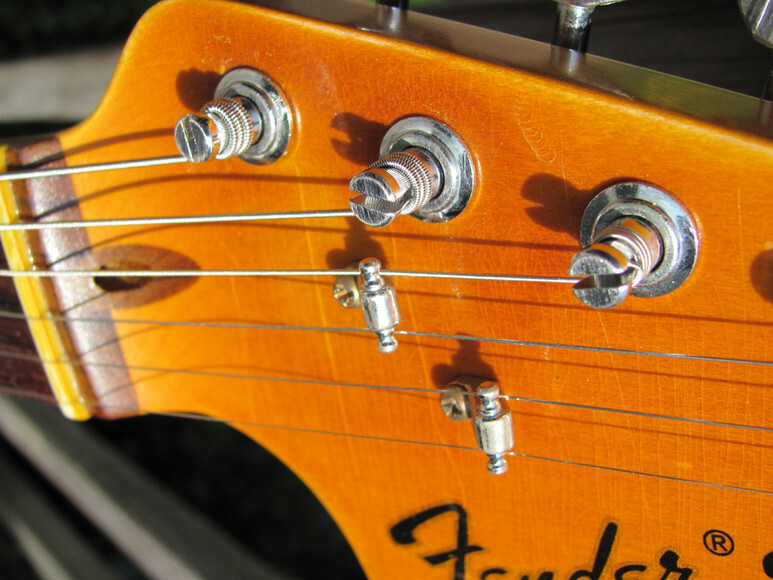 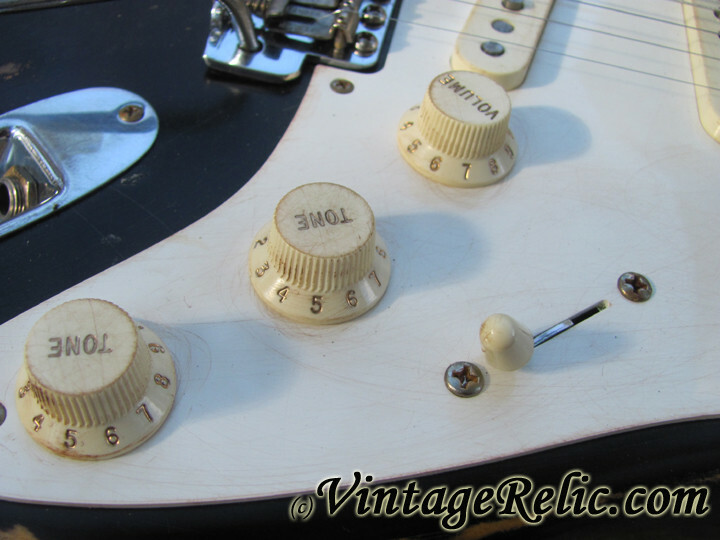 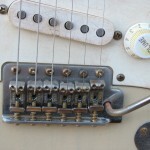 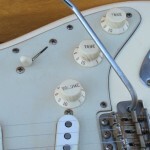 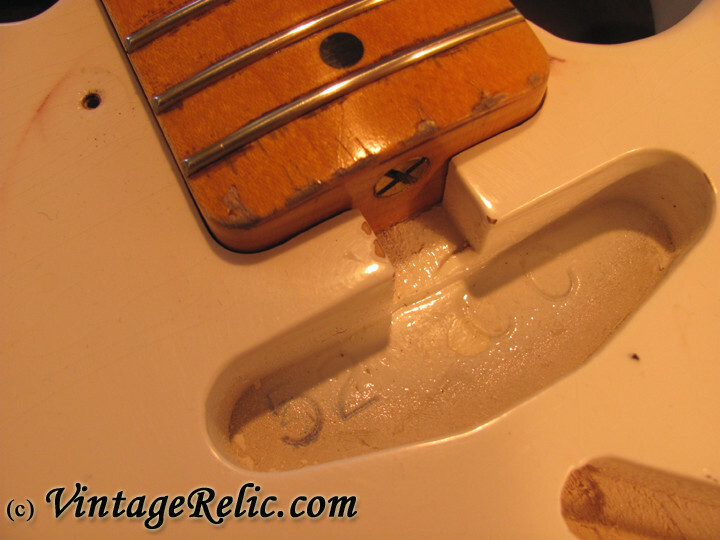 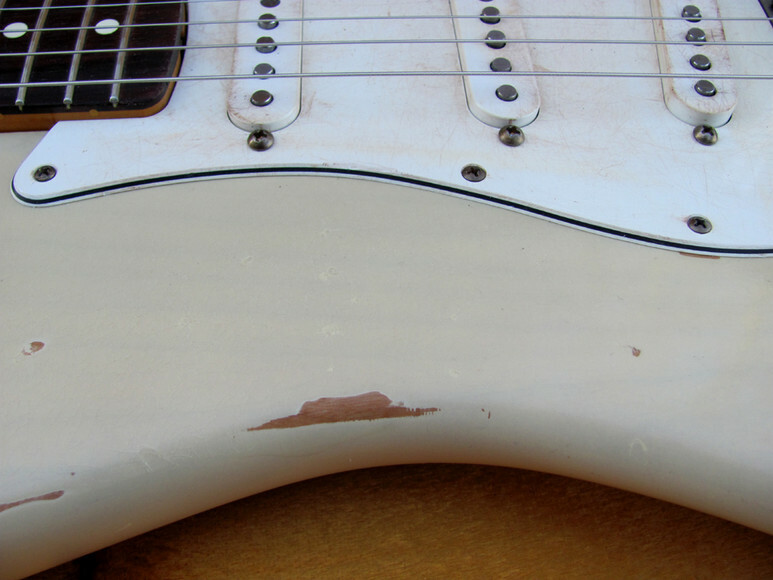 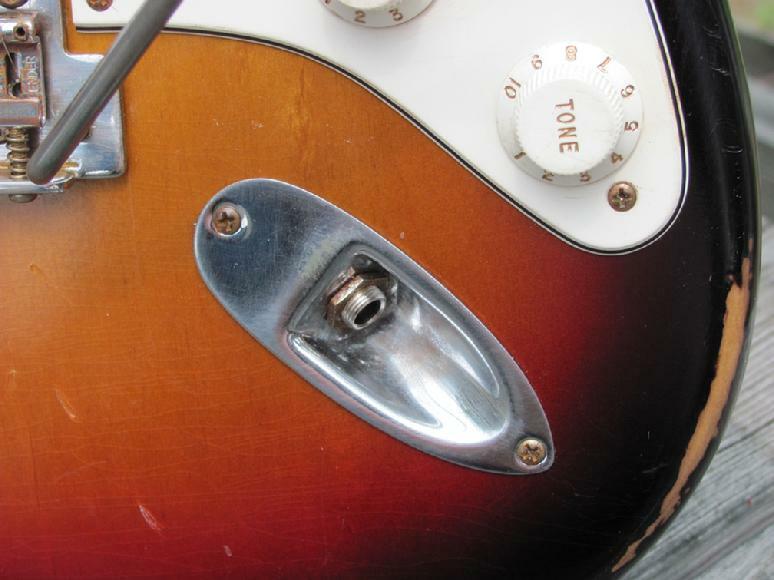 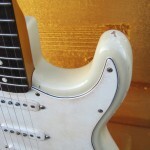 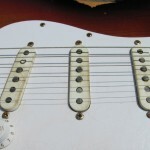 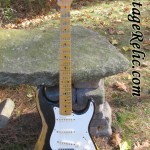 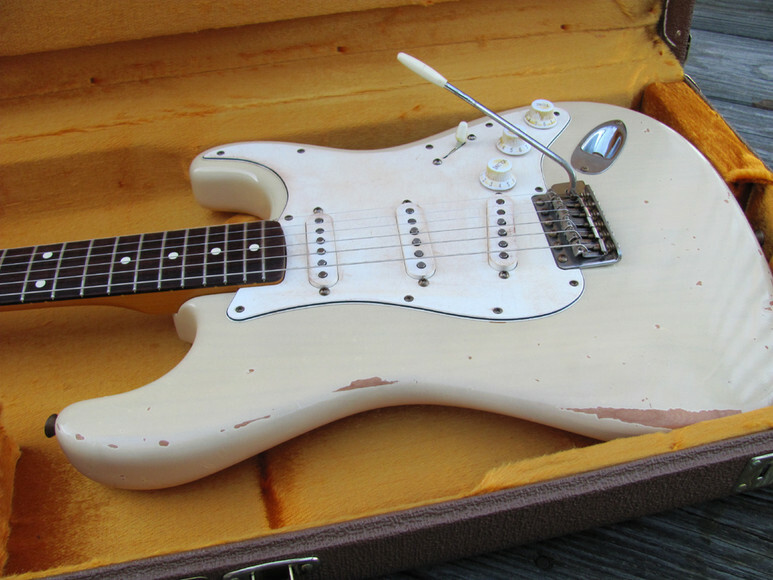 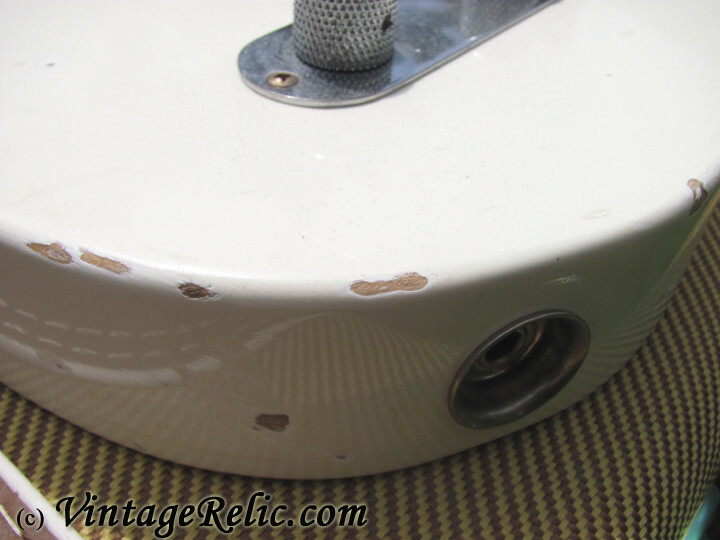 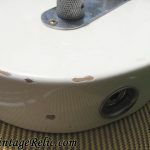 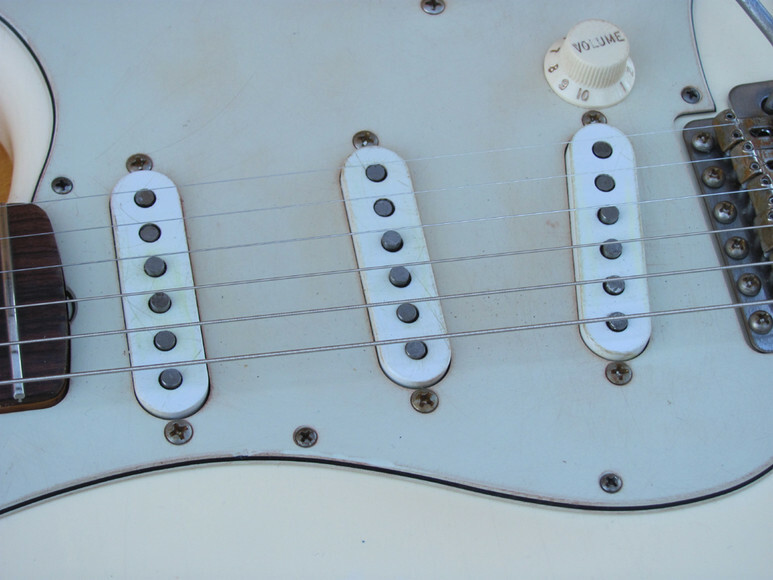 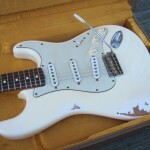 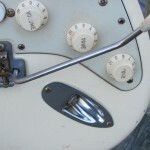 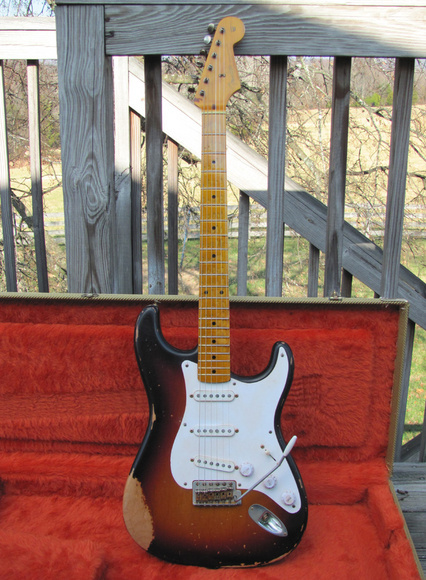 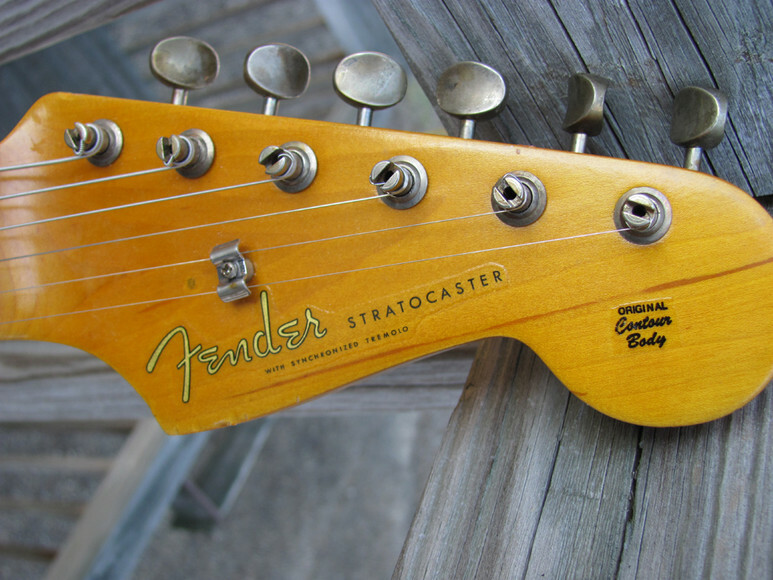 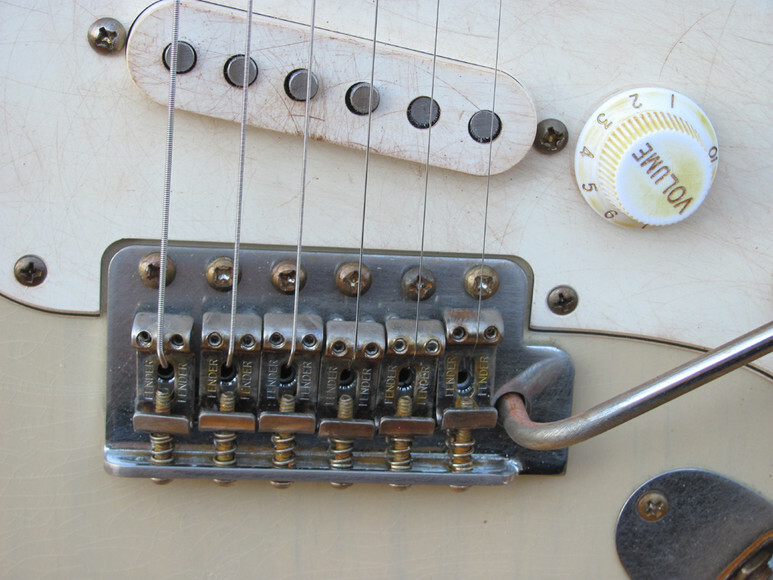 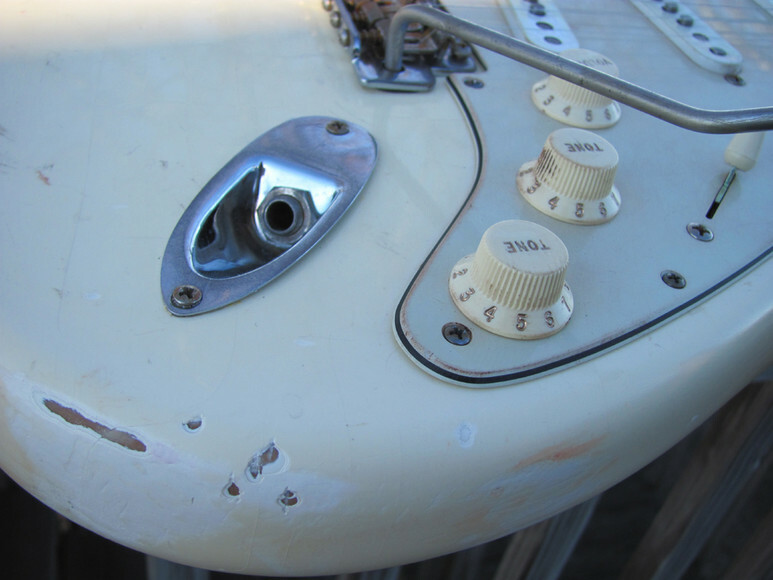 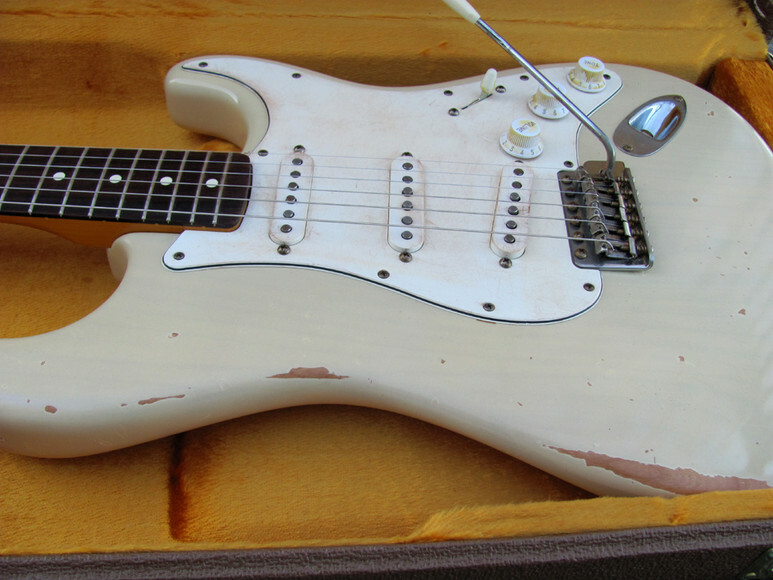 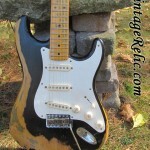 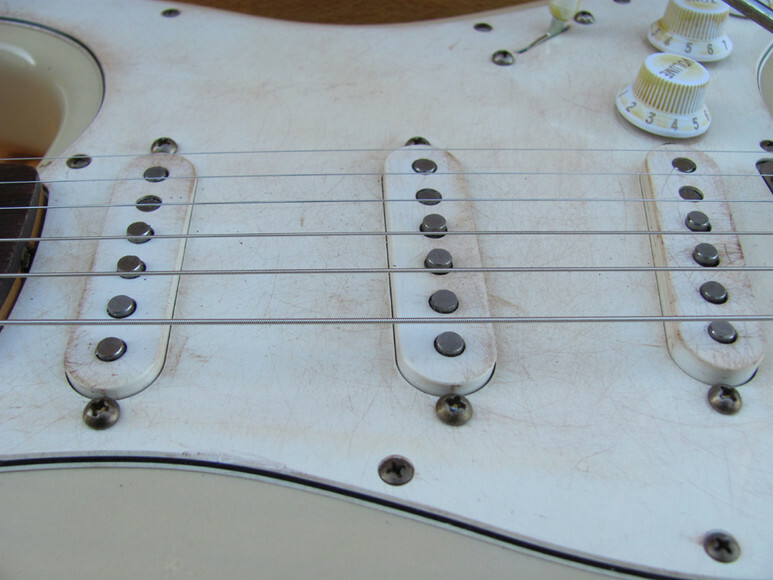 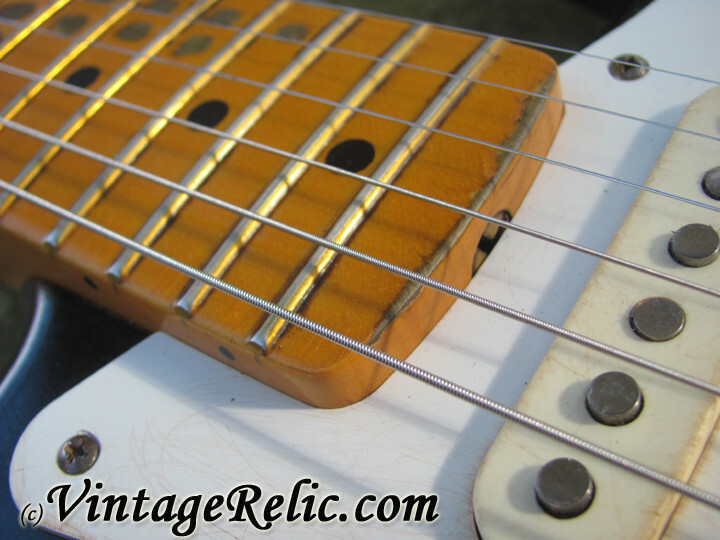 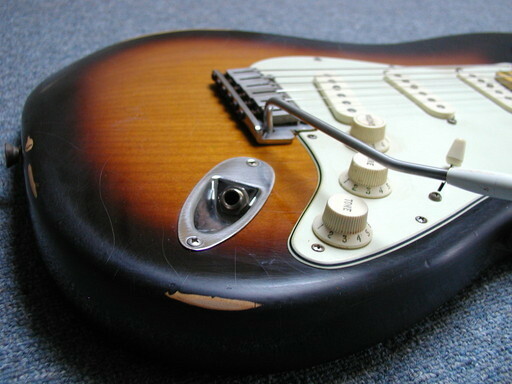 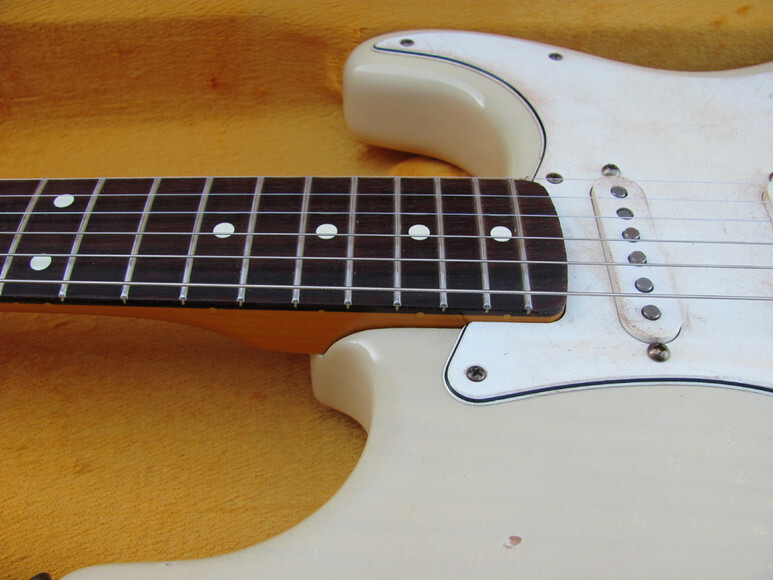 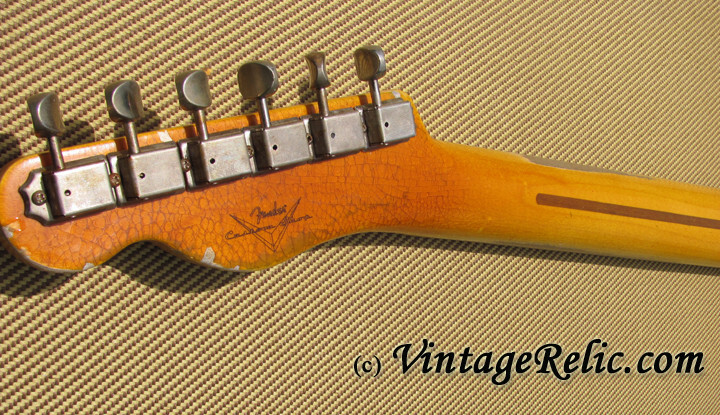 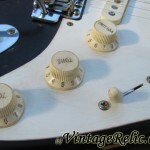 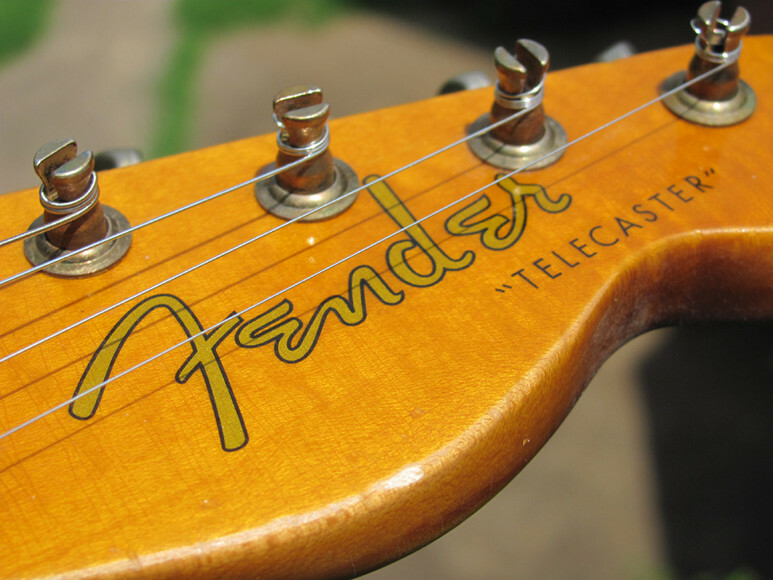 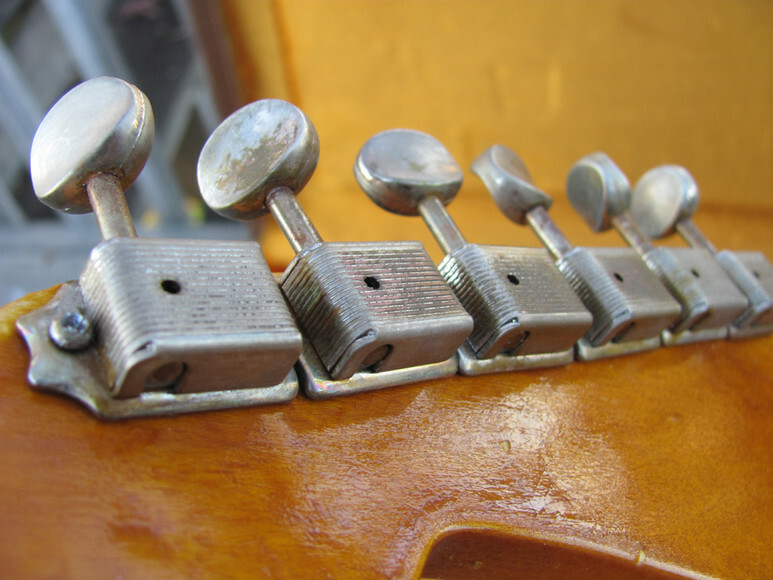 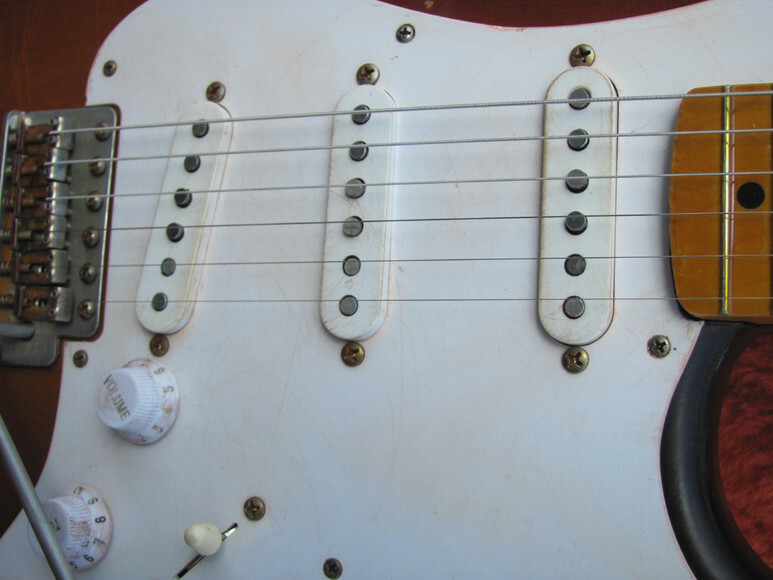 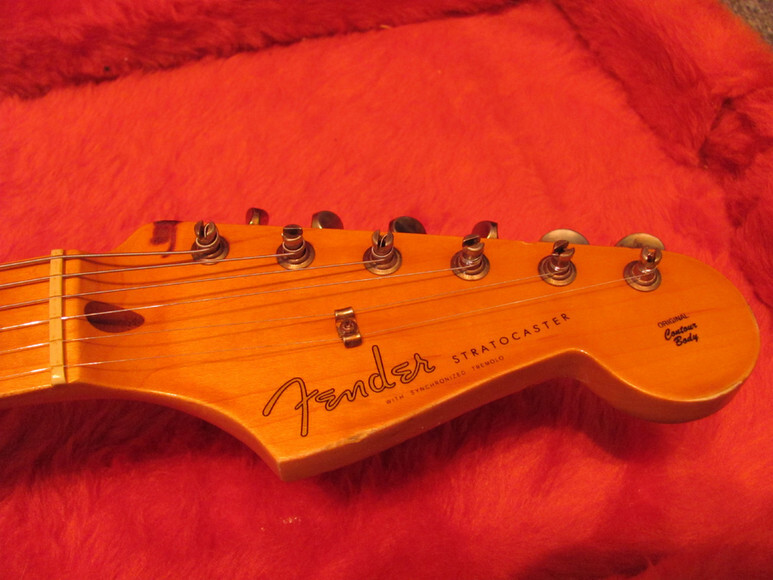 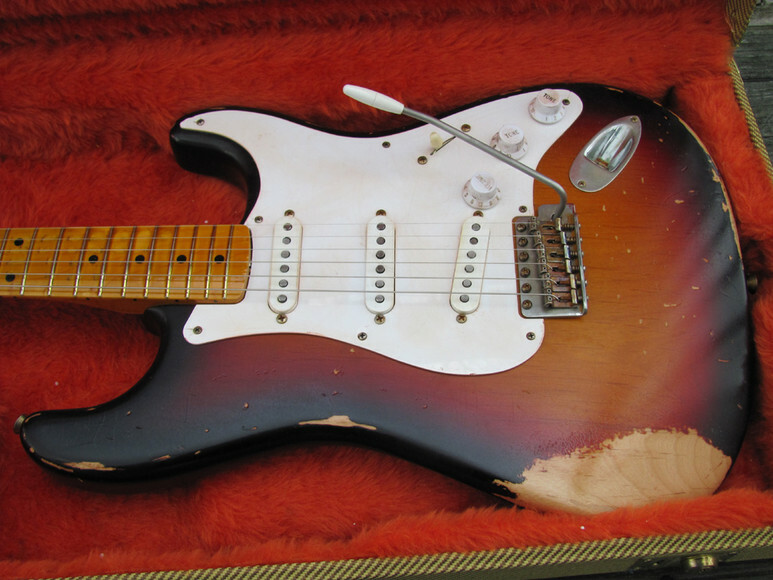 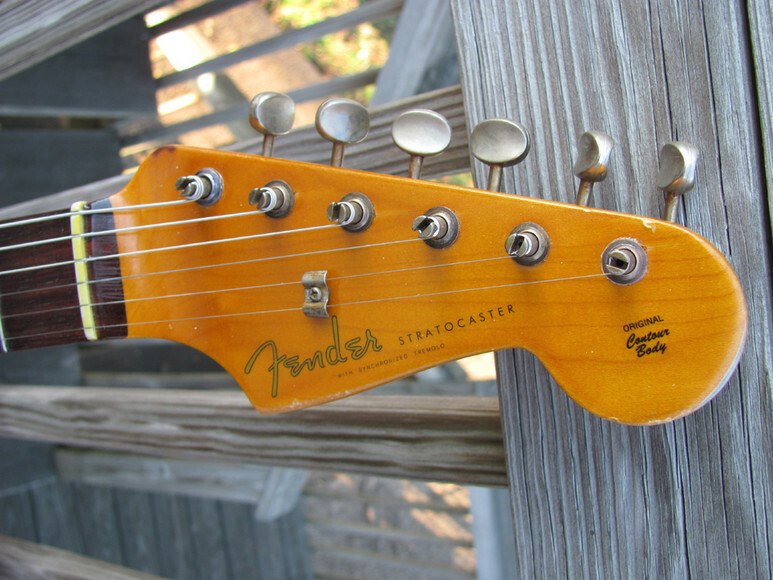 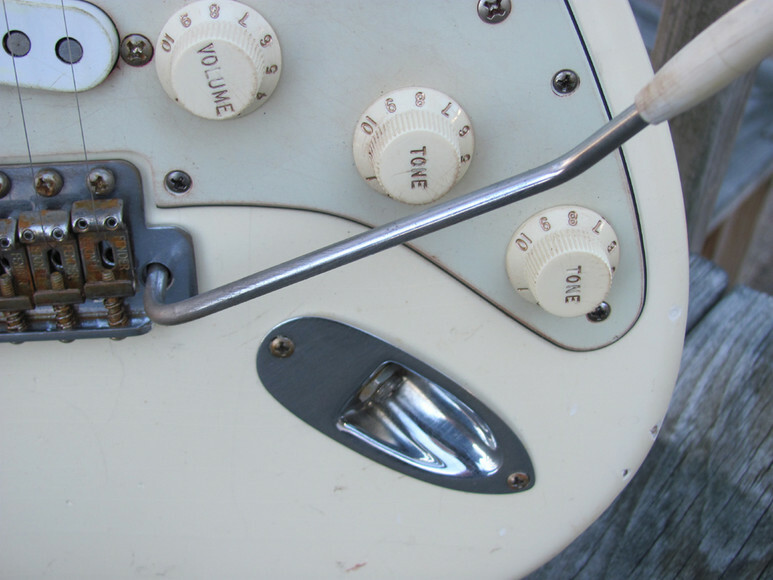 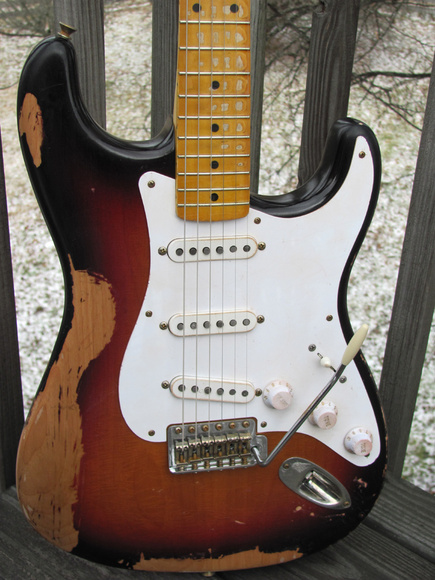 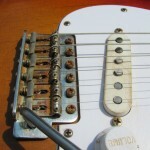 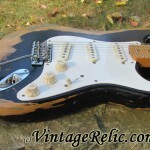 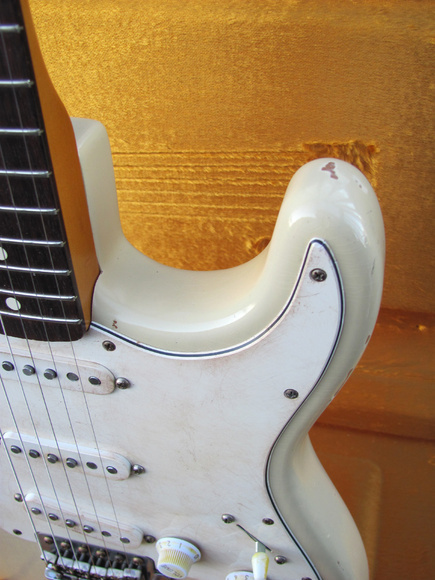 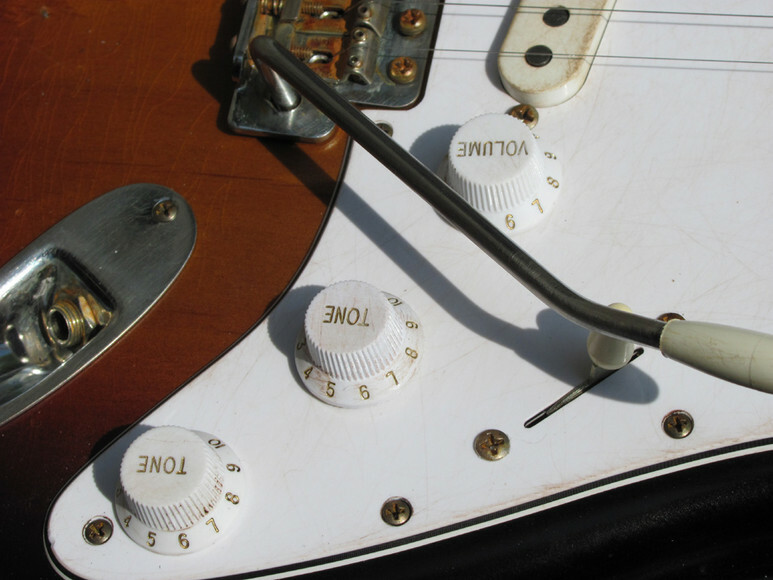 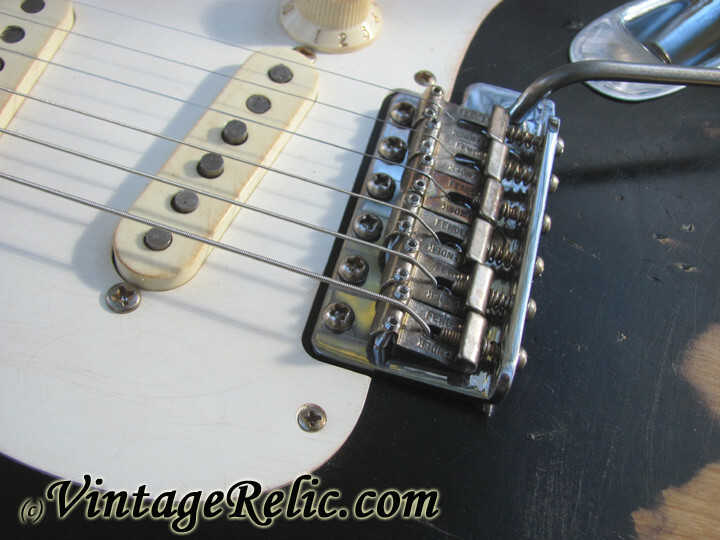 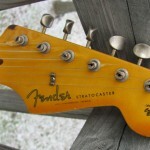 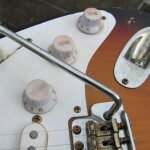 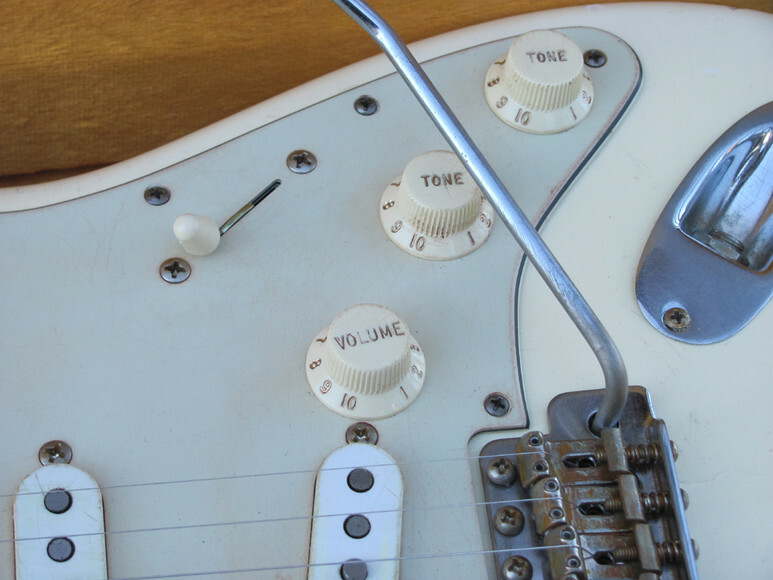 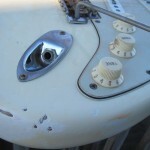 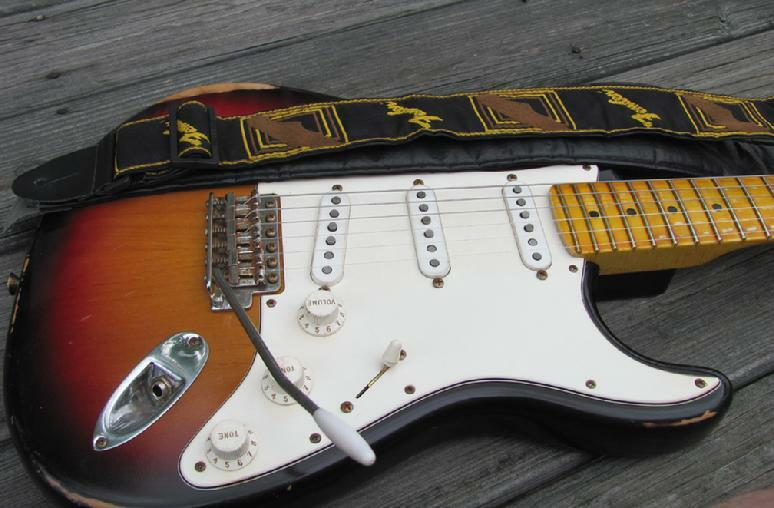 Fender Stratocaster Vintage Relic '57 Heaven.' 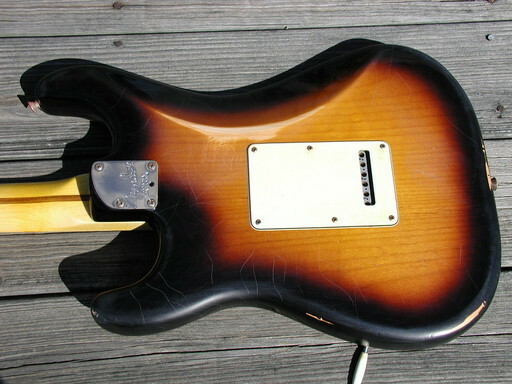 Fender USA body with thin nitro gloss finish (vintage 2-tone sunburst) and Fender reissue neck (maple fretboard 7.25' radius, vintage size frets with NO fretwear, tinted nitro finish); Fender Custom Shop '54 pickups; Fender wiring harness/5 way switch (vintage style--all cloth wiring); Fender hardware; Fender 57 reissue tweed hardshell case. 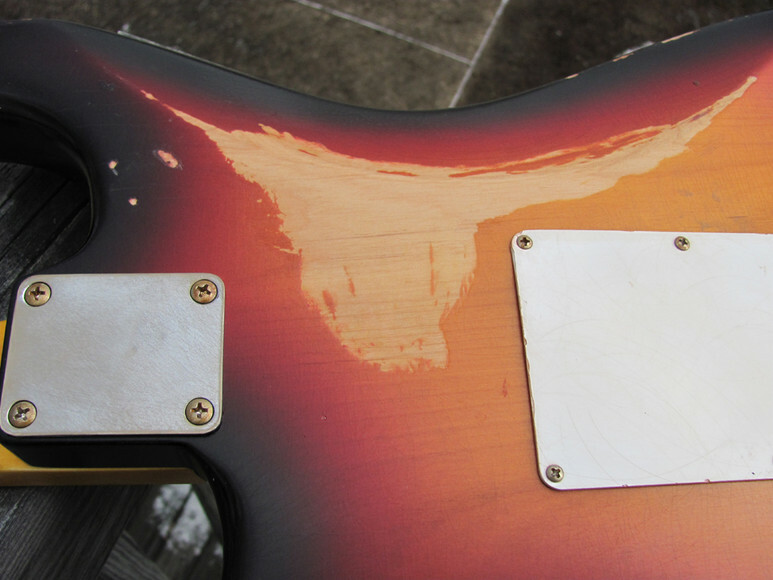 It has undergone a complete aging relicing: weather checking throughout the body and neck, dings, scratches, arm wear, belt buckle wear, fretboard wear, etc. 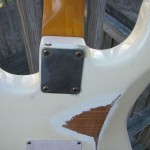 All finish is thin nitro; all hardware and plastic aged relic'd. 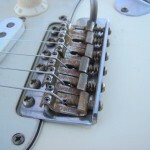 Looks and feels like a late 1950s Strat! 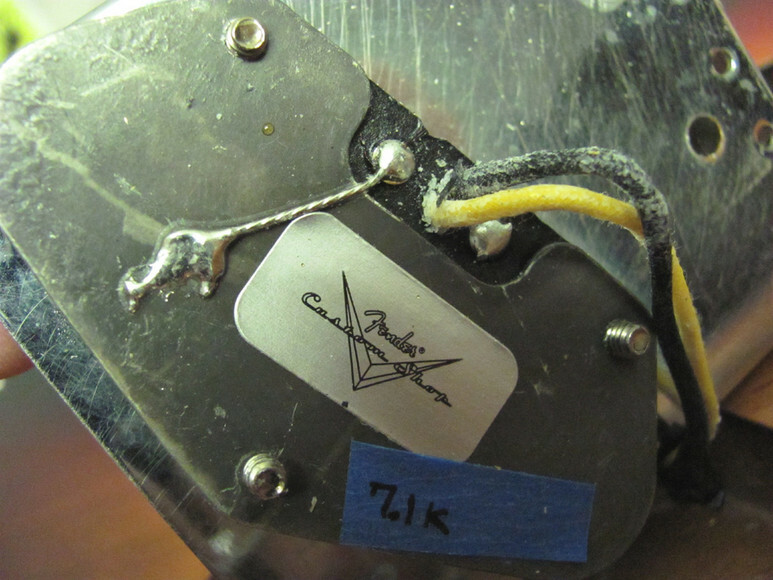 Lightweight at just 7.1 pounds! 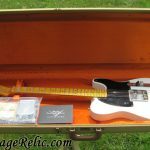 Plays great and these Custom Shop '54 pickups are articulate and punchy--bell-like cleans and can really sing with some distortion. 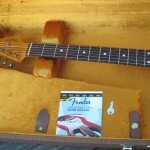 Setup with D'Addario EXL120 strings (.009-.042). 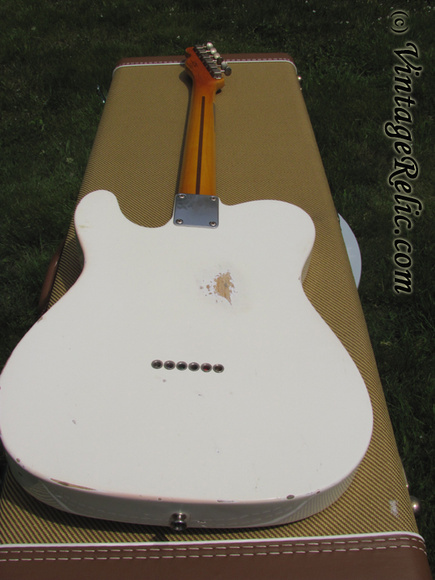 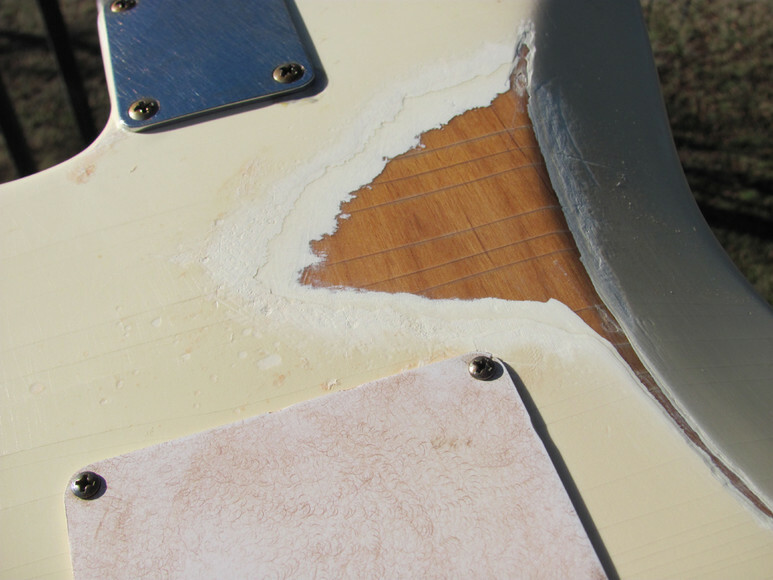 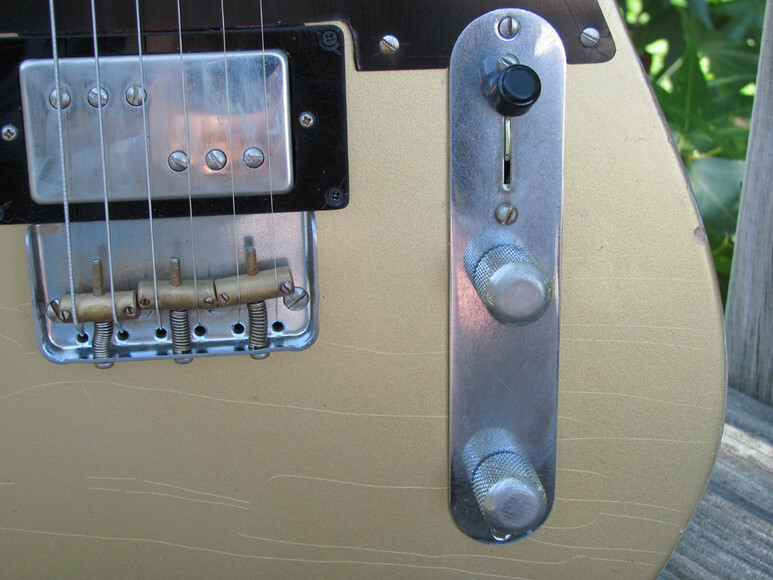 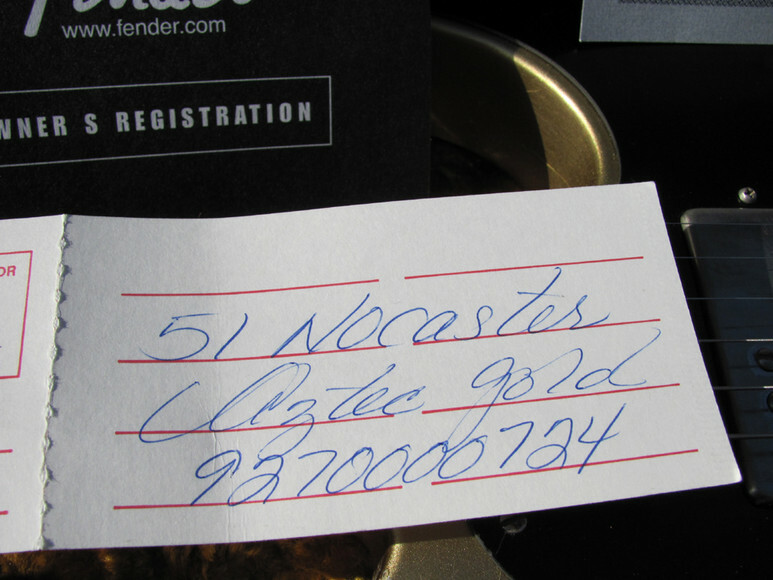 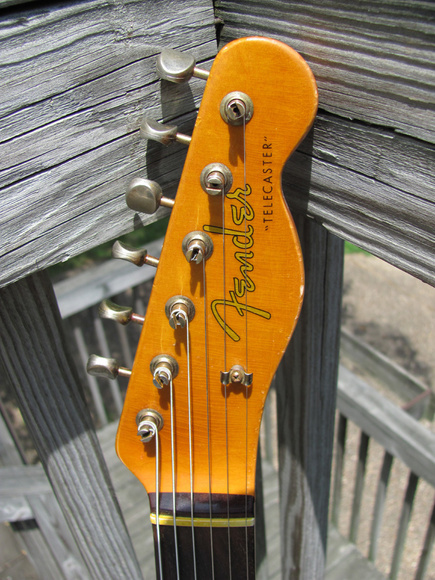 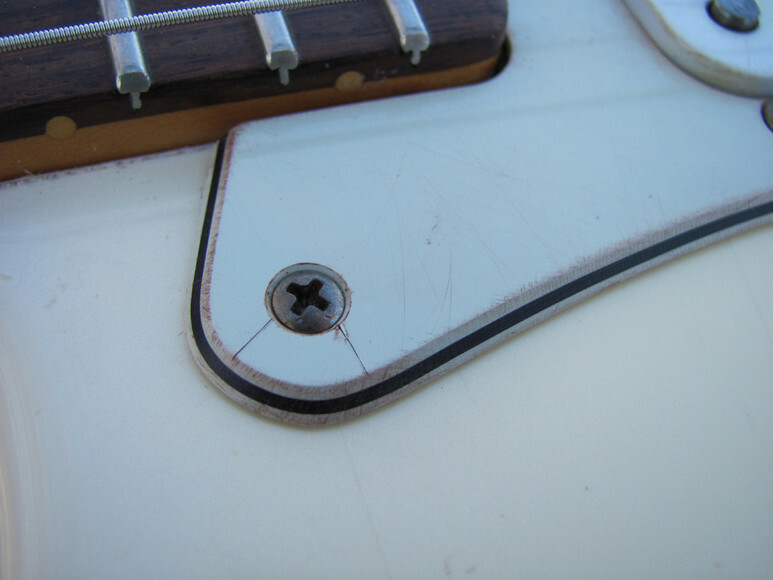 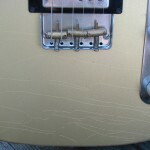 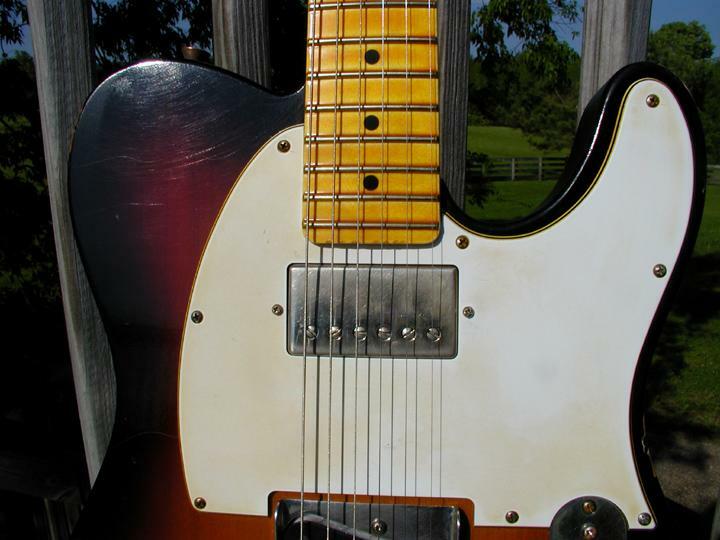 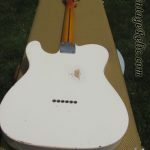 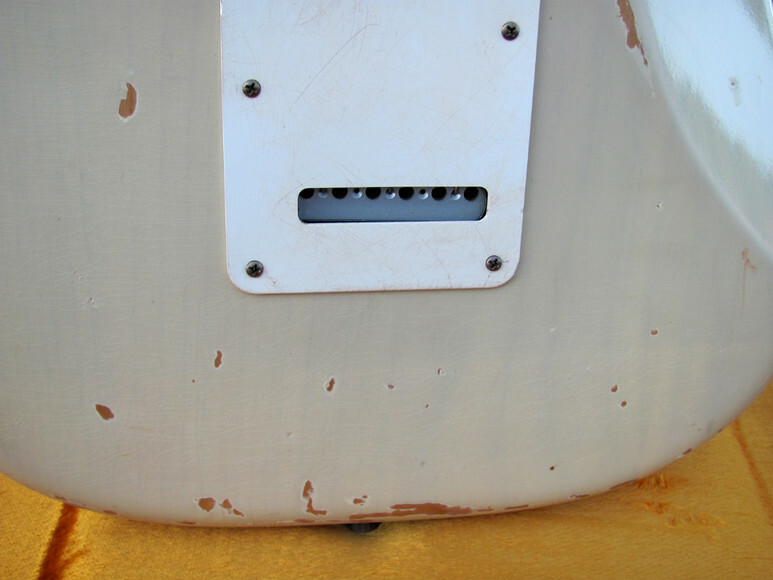 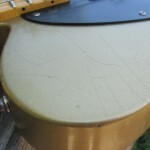 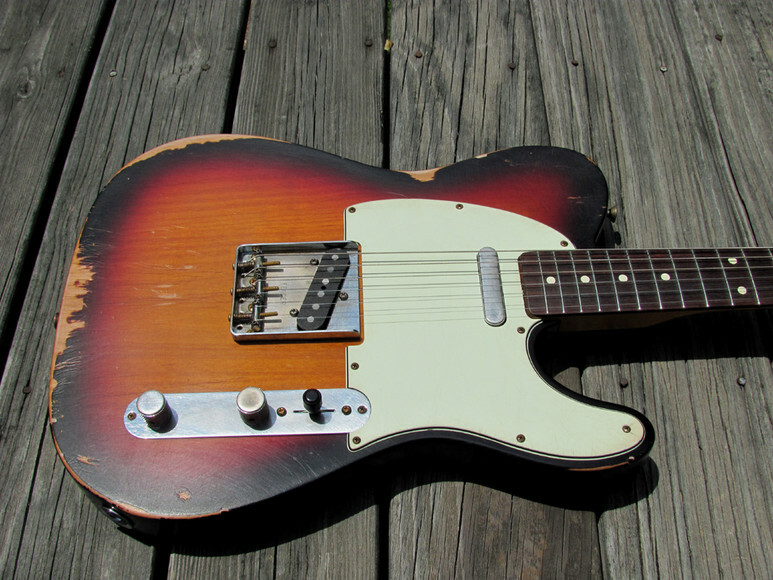 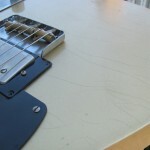 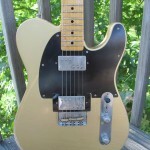 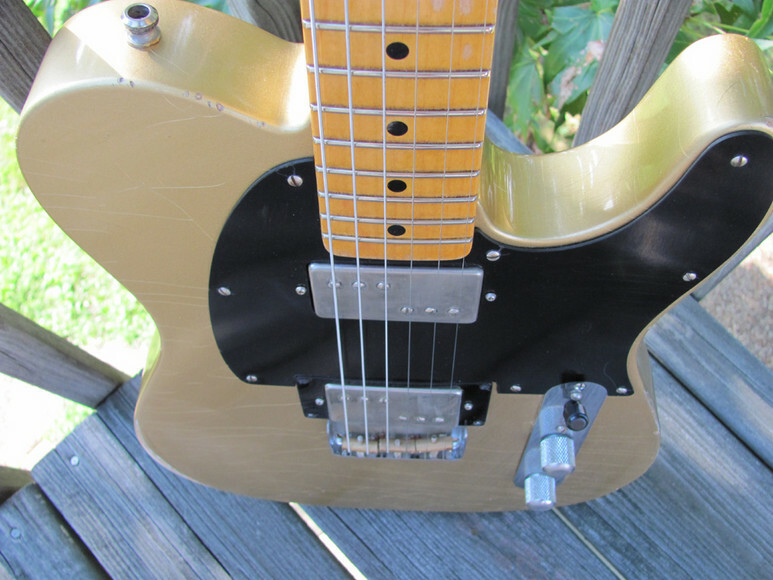 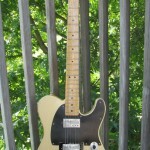 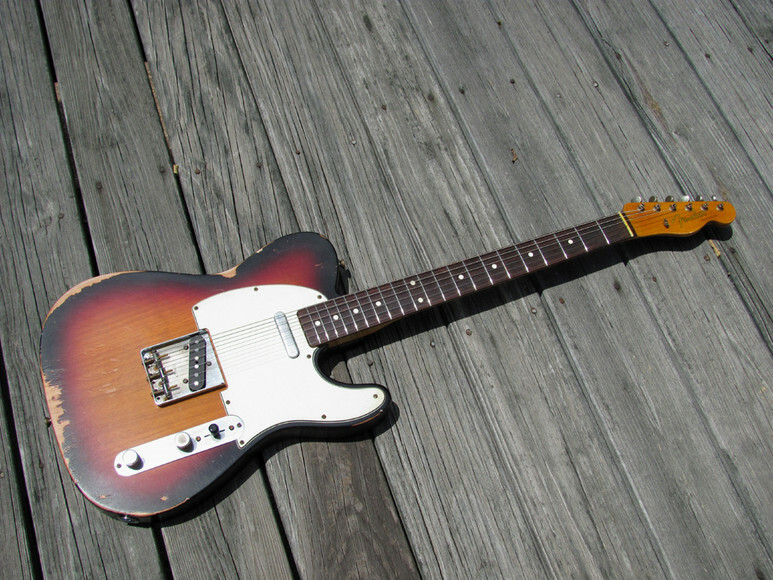 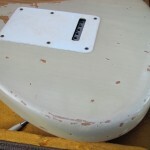 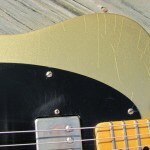 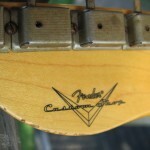 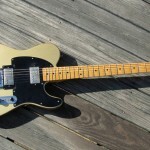 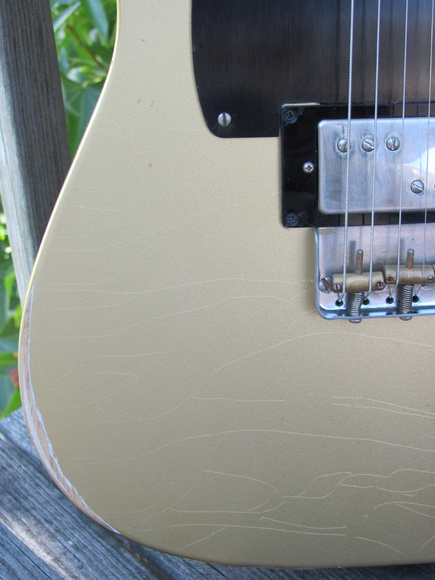 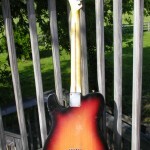 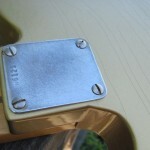 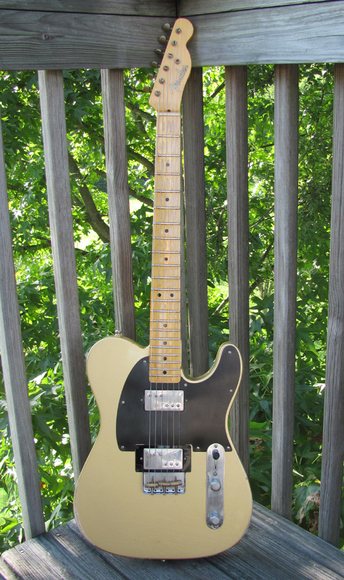 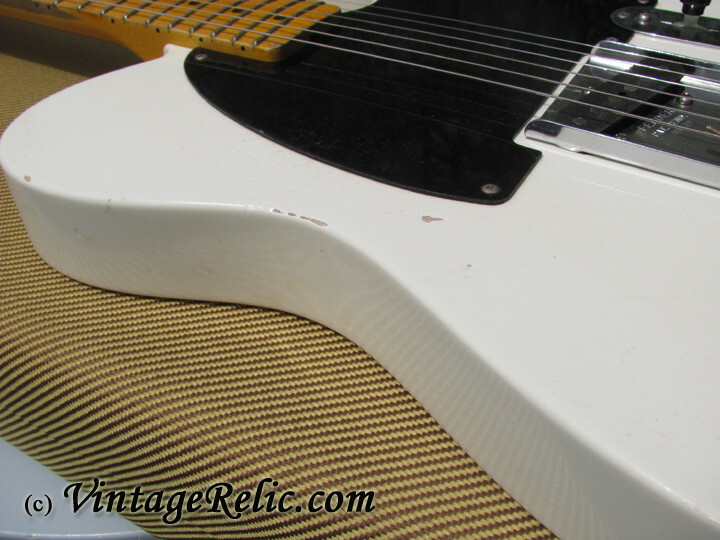 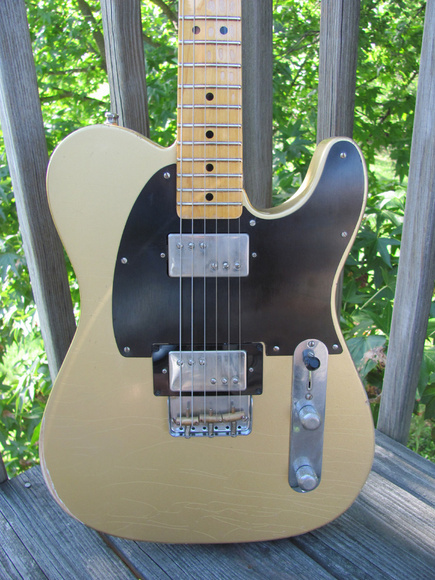 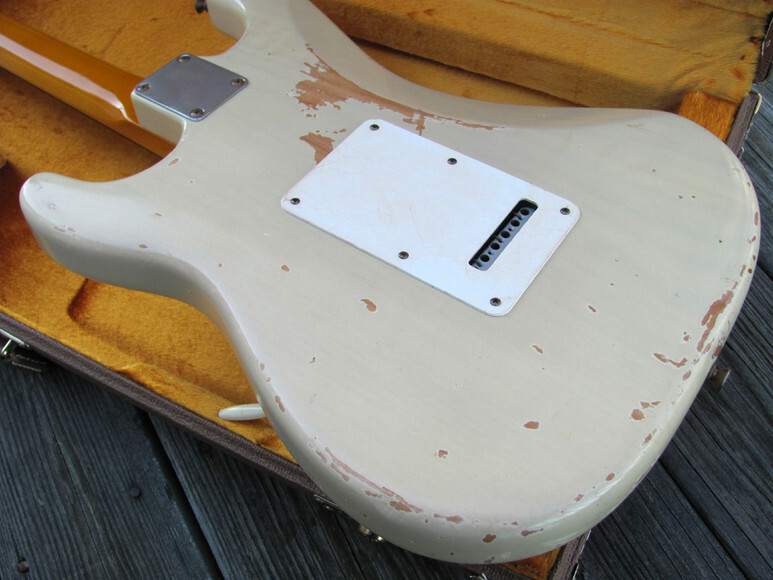 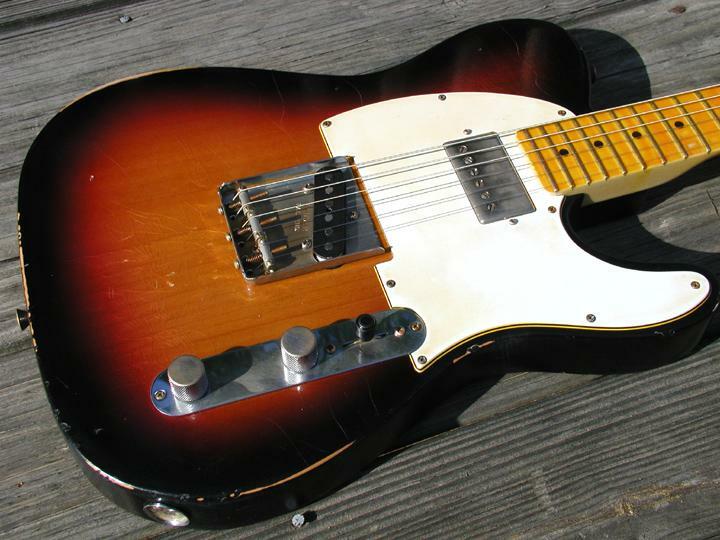 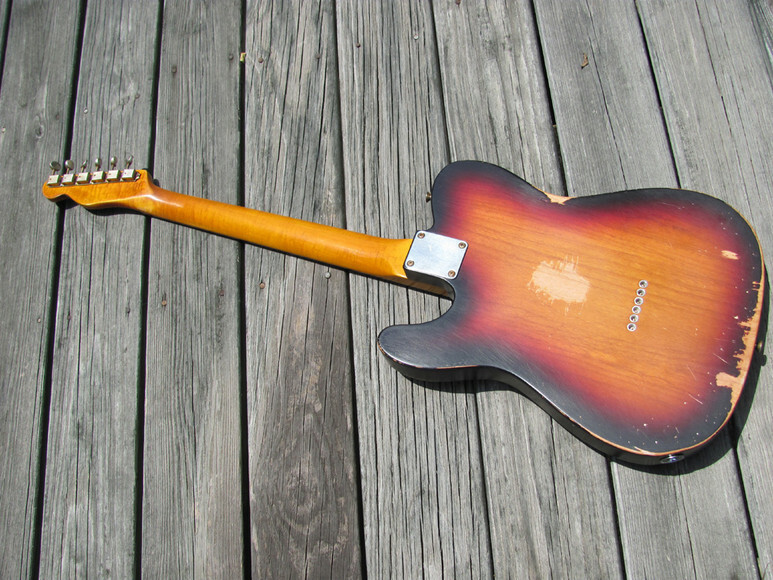 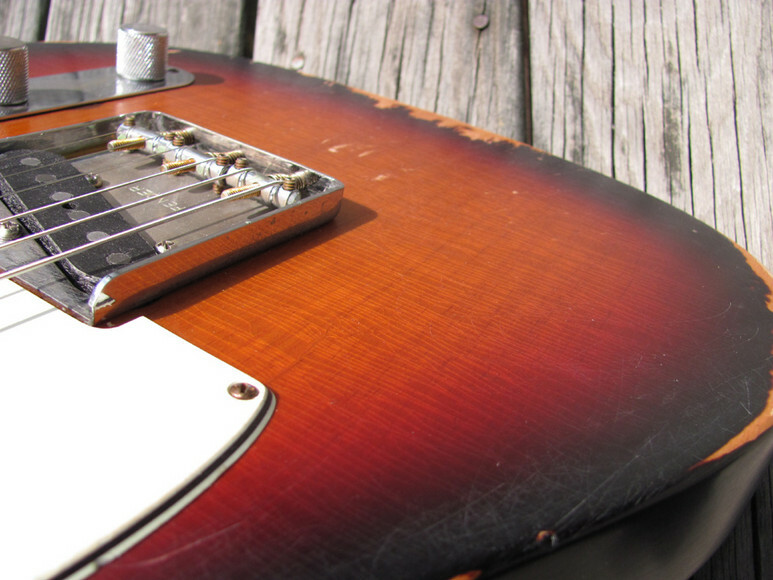 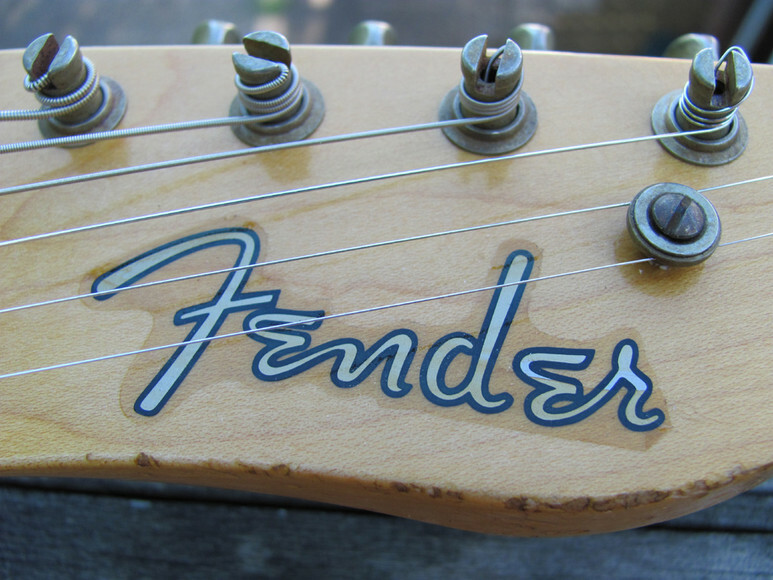 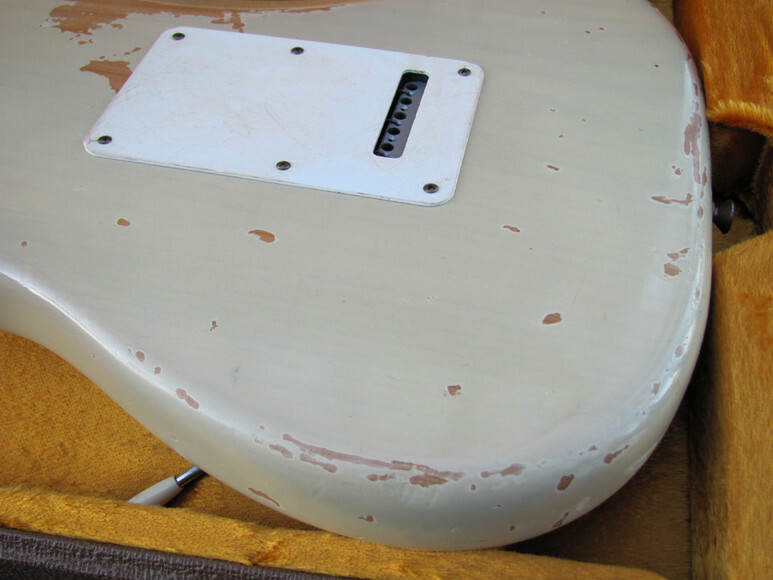 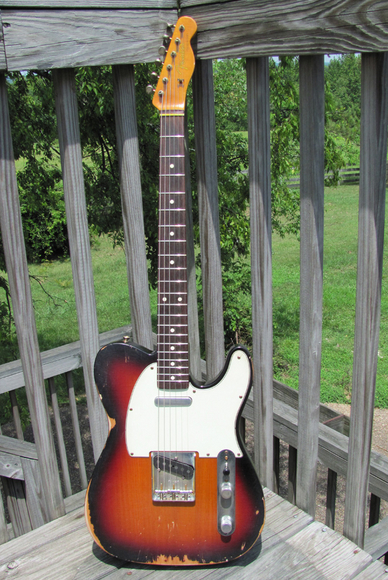 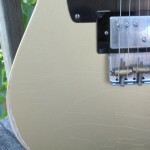 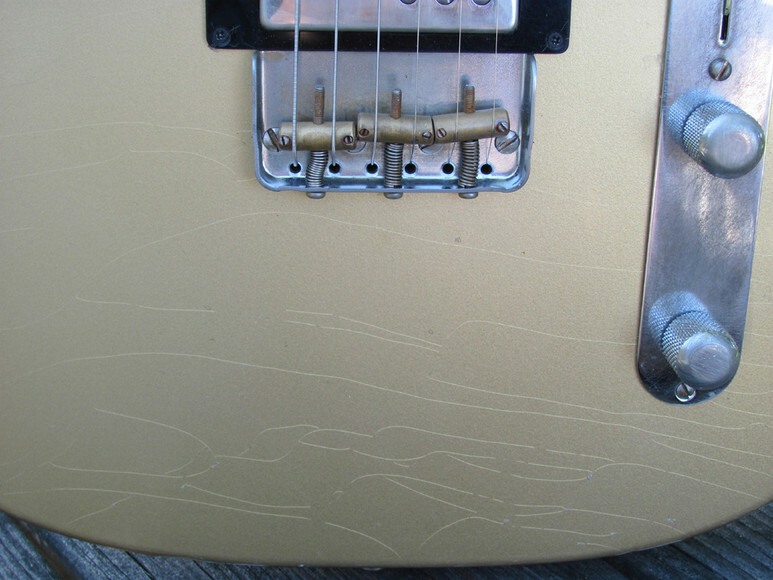 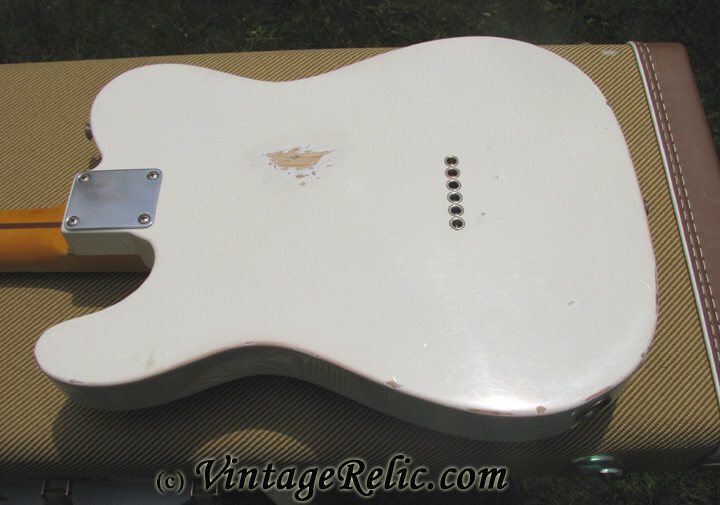 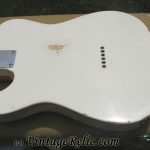 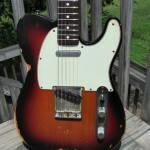 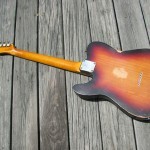 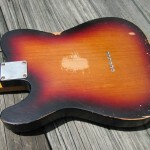 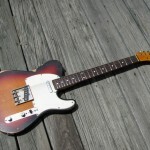 This started as a new 2009 Fender USA Telecaster (serial # begins with Z9). 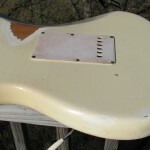 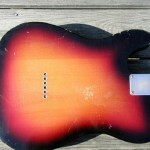 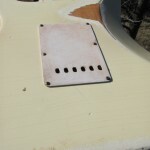 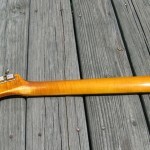 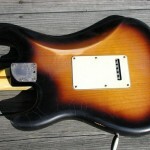 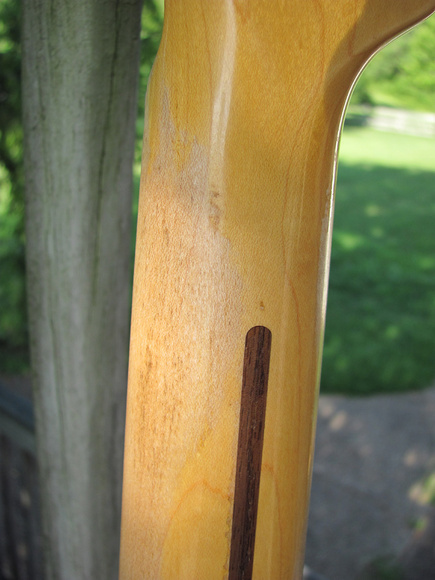 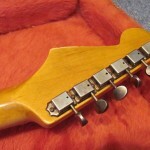 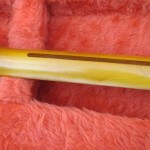 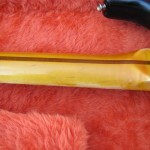 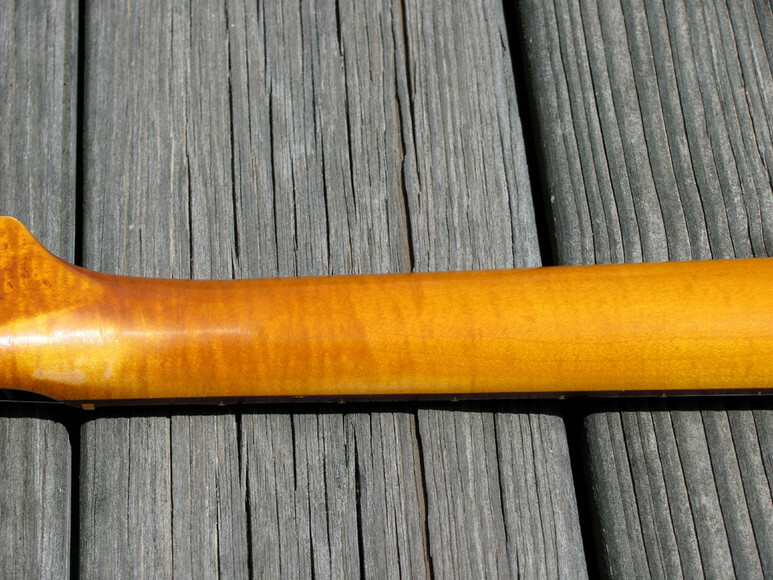 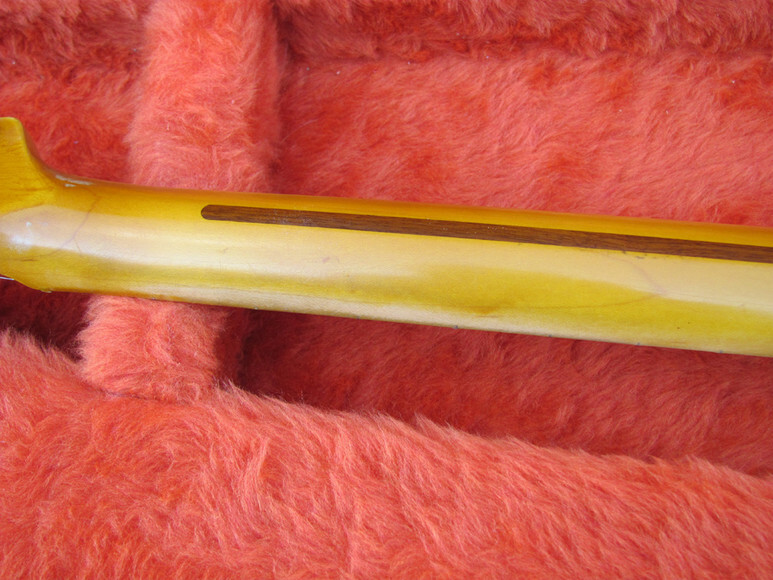 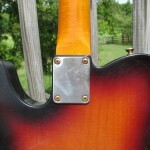 The body and neck are finished in thin nitro. 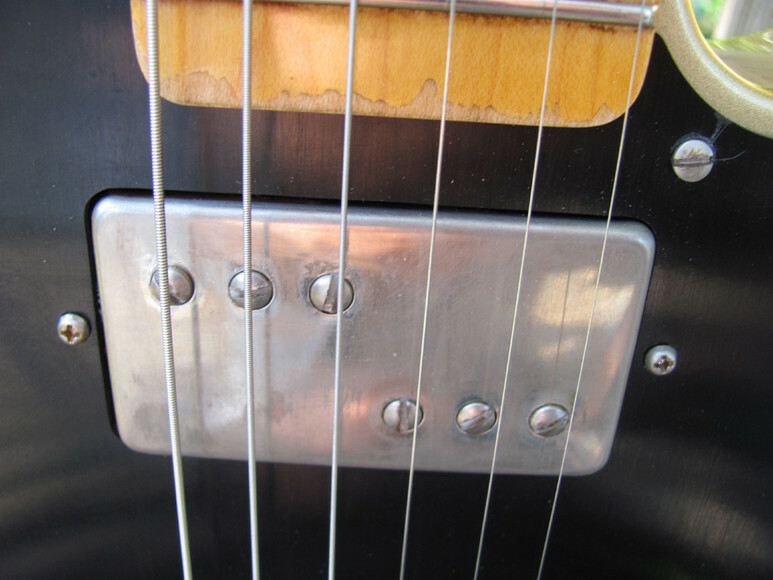 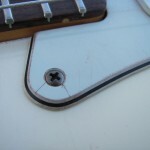 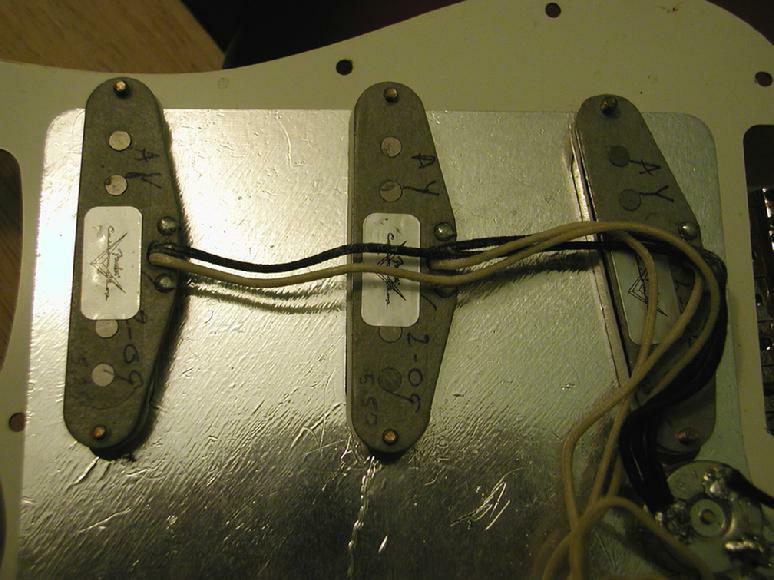 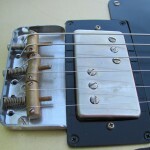 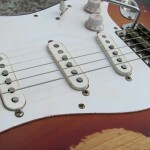 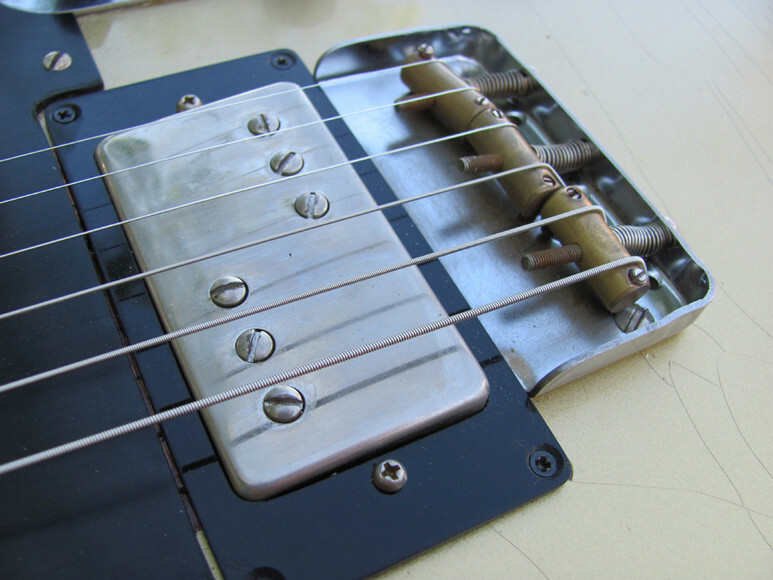 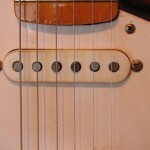 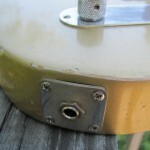 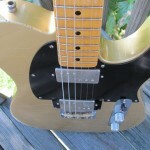 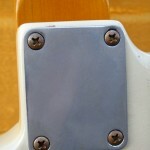 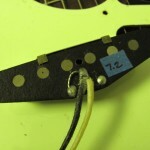 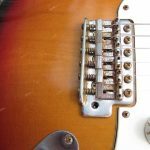 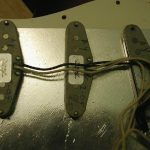 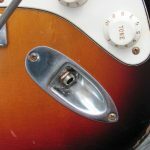 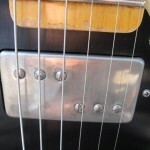 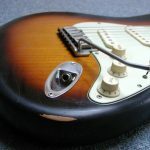 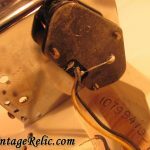 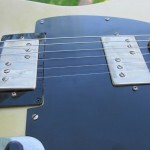 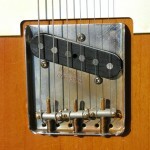 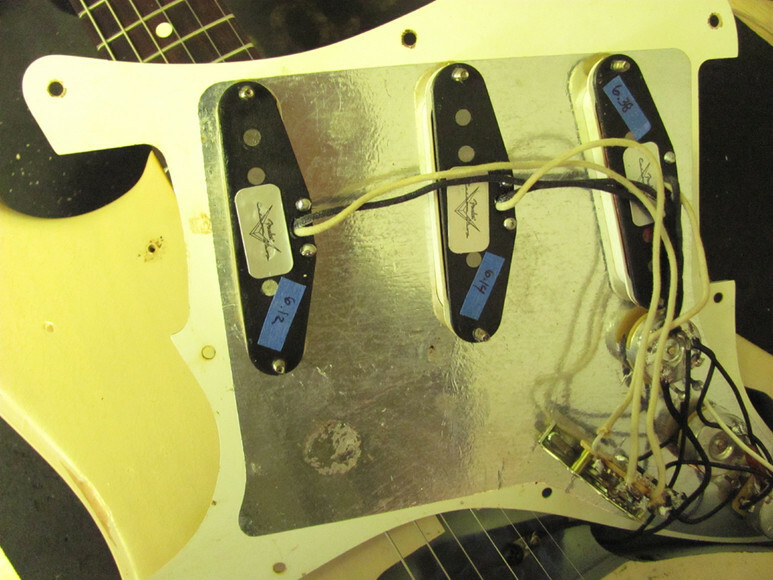 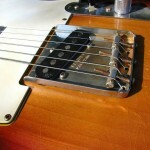 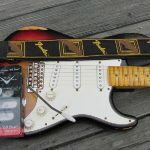 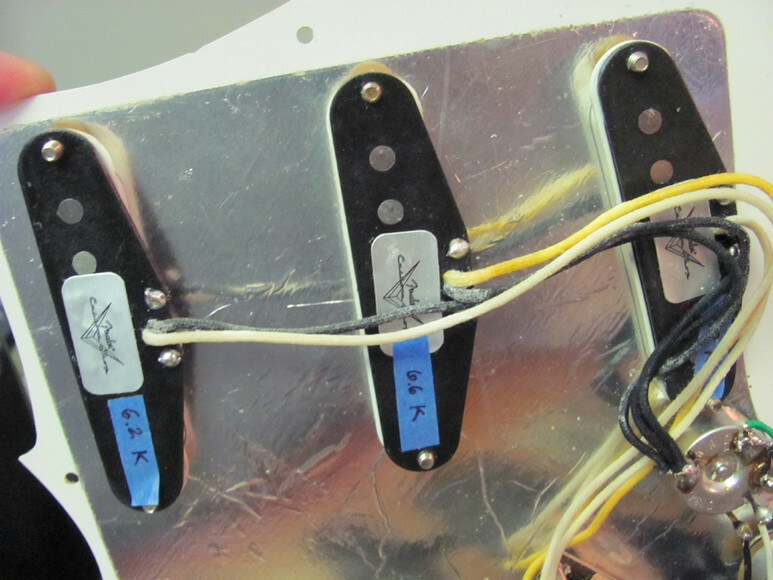 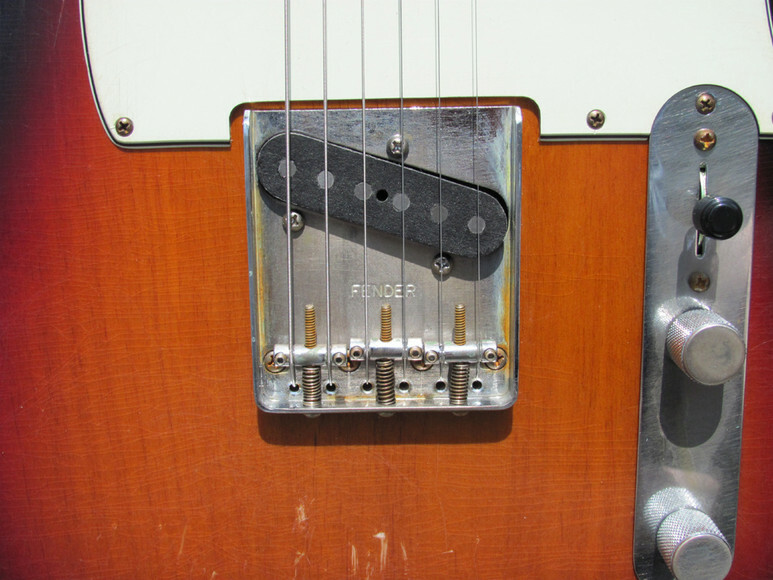 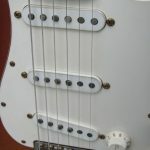 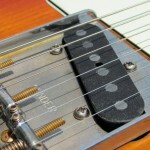 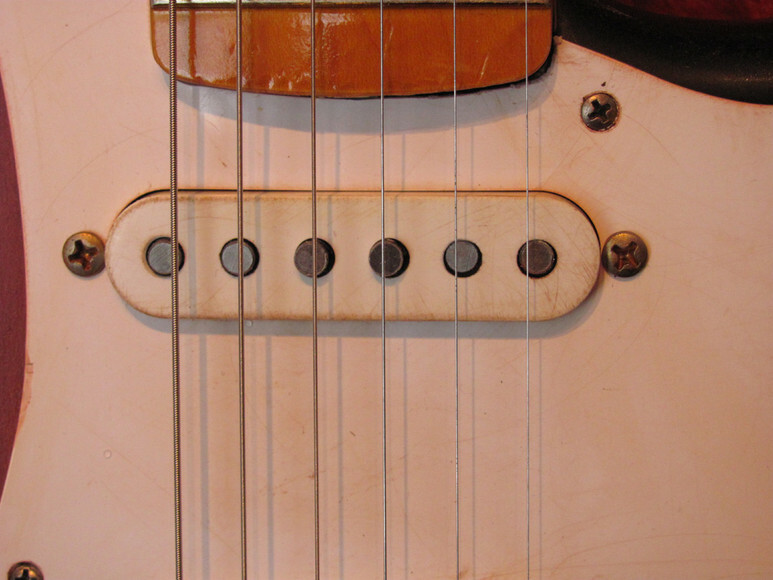 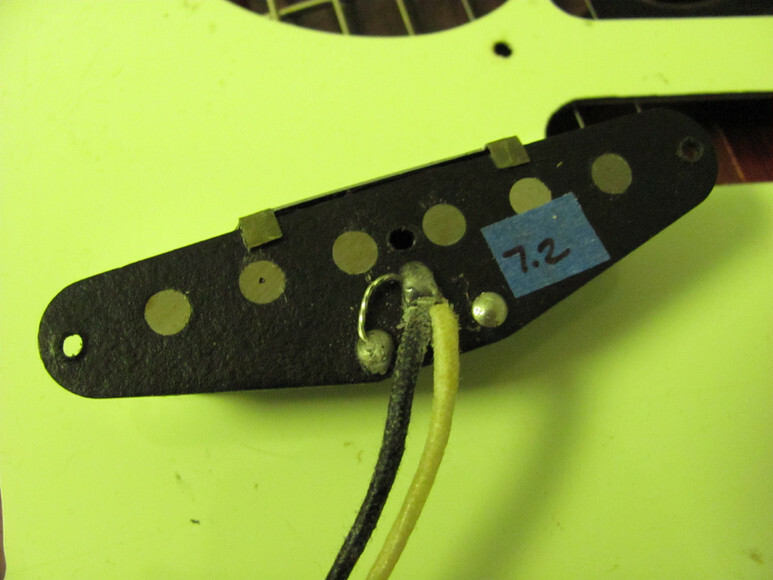 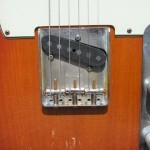 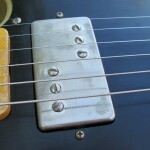 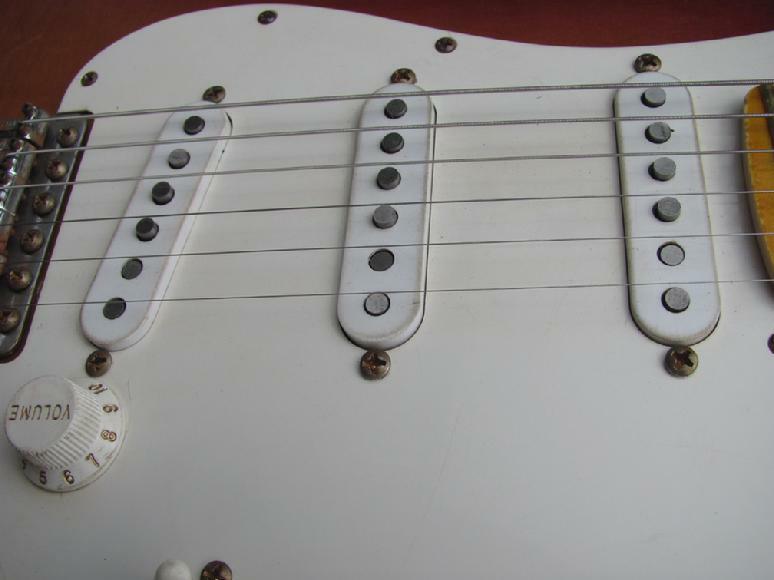 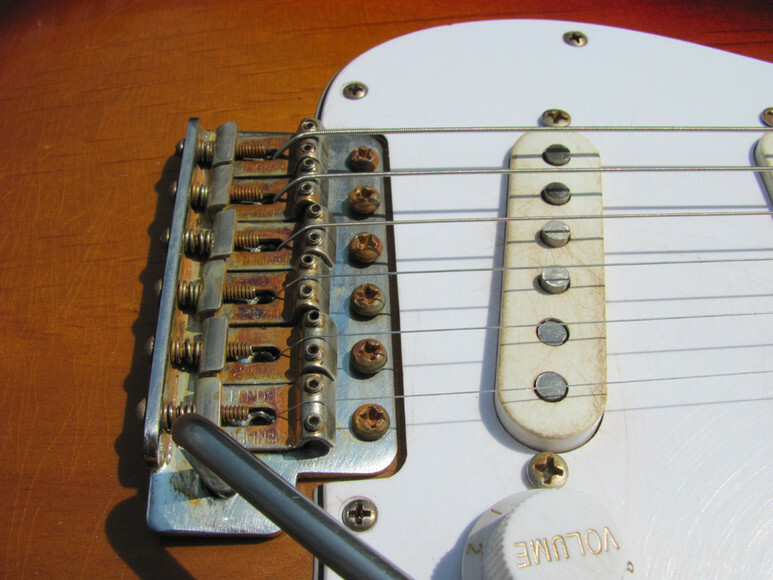 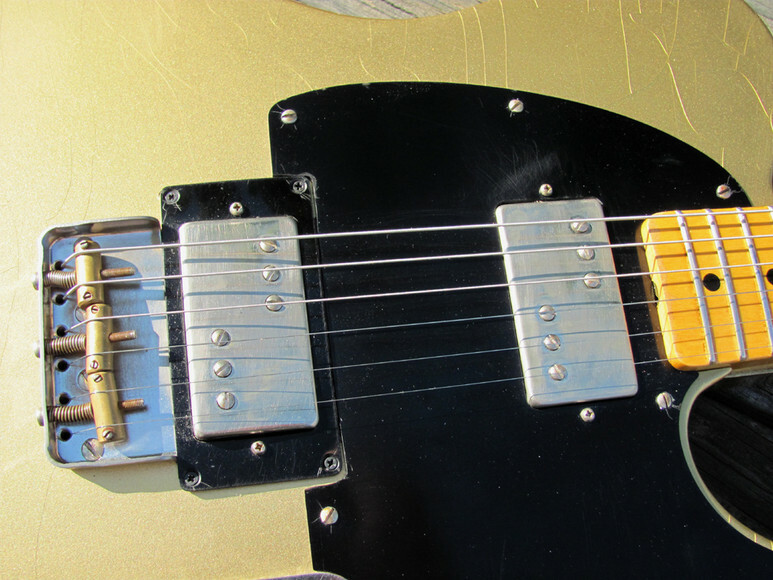 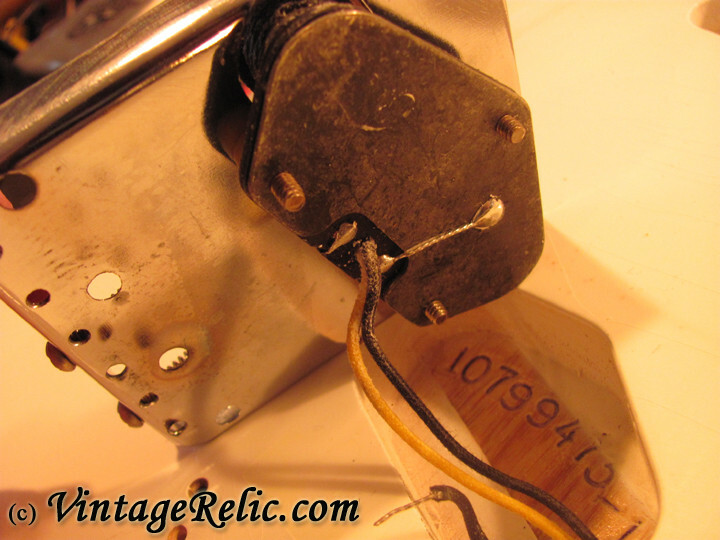 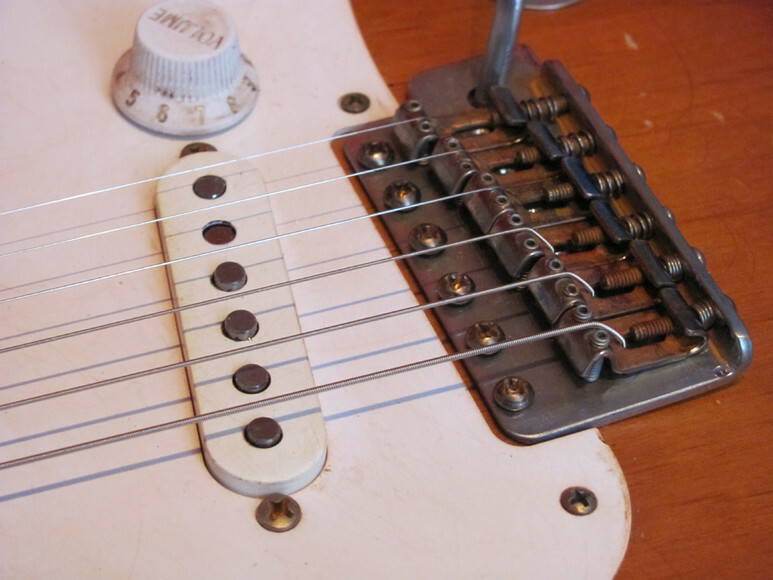 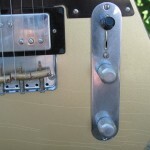 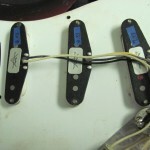 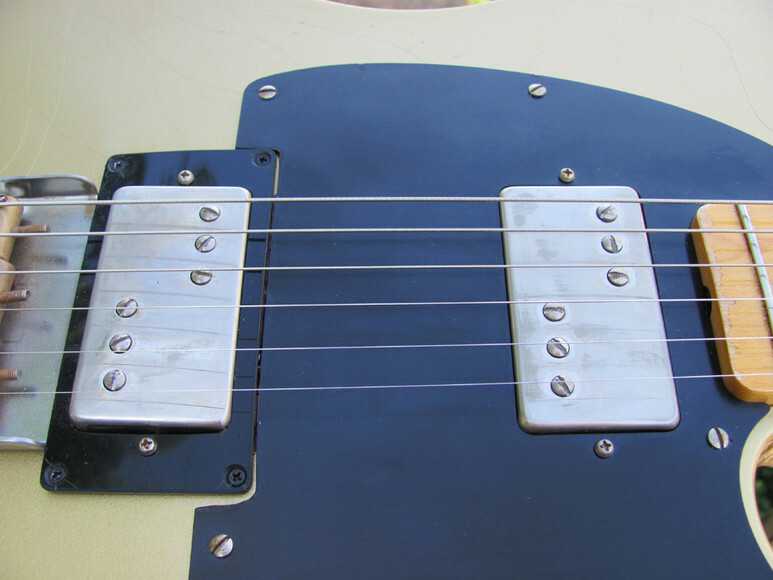 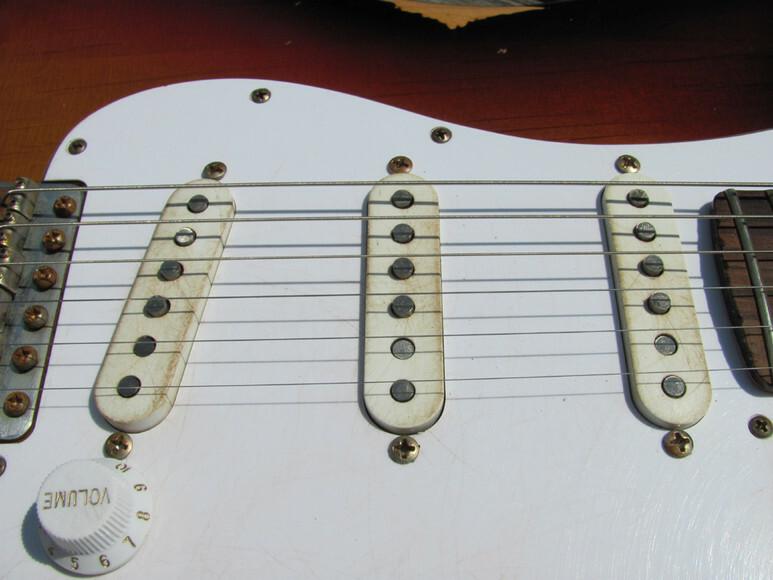 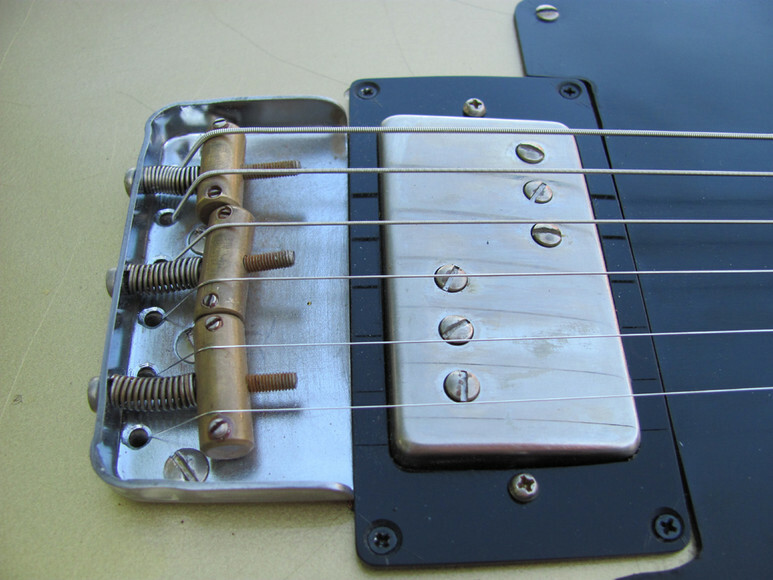 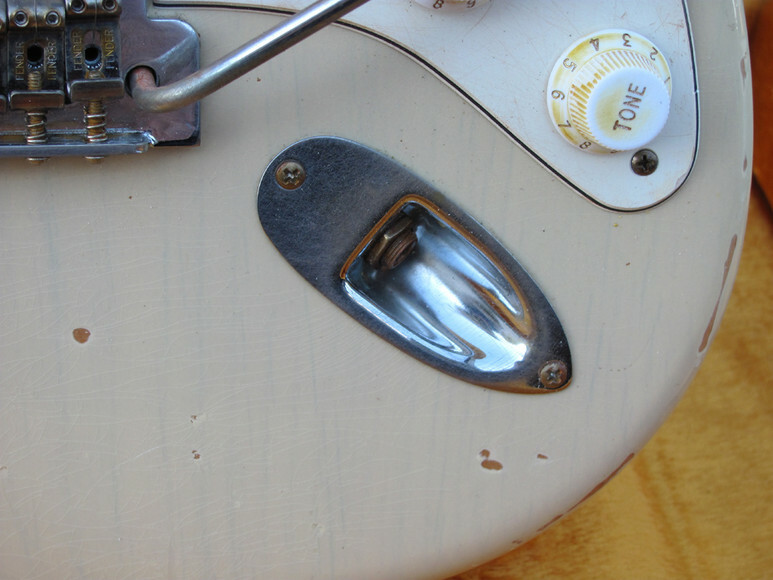 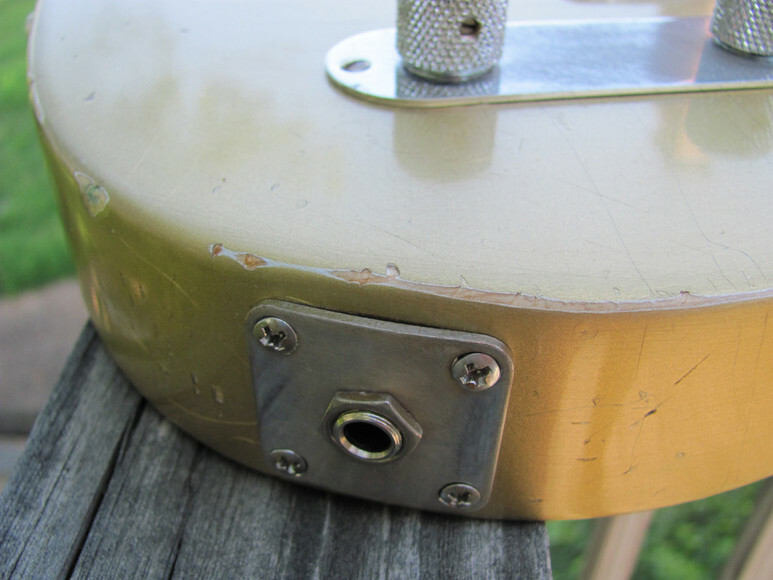 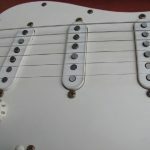 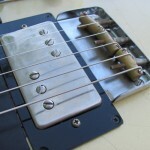 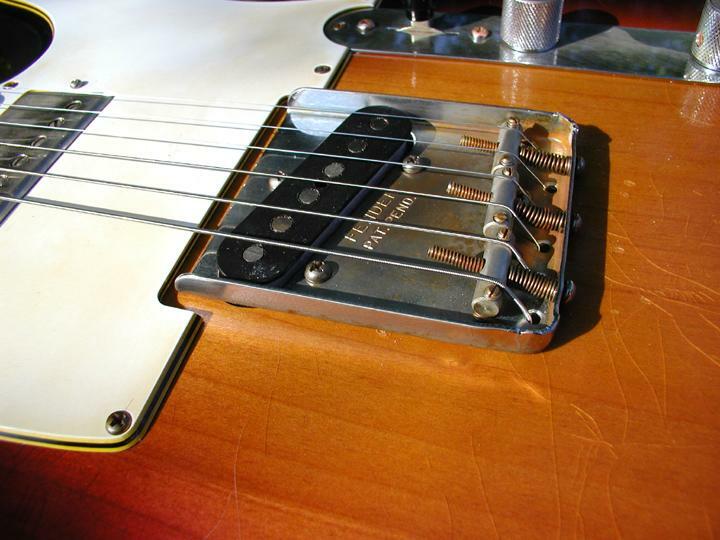 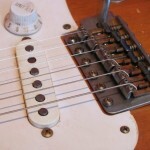 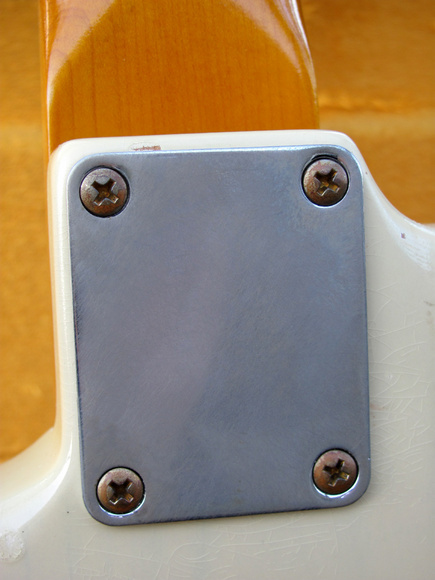 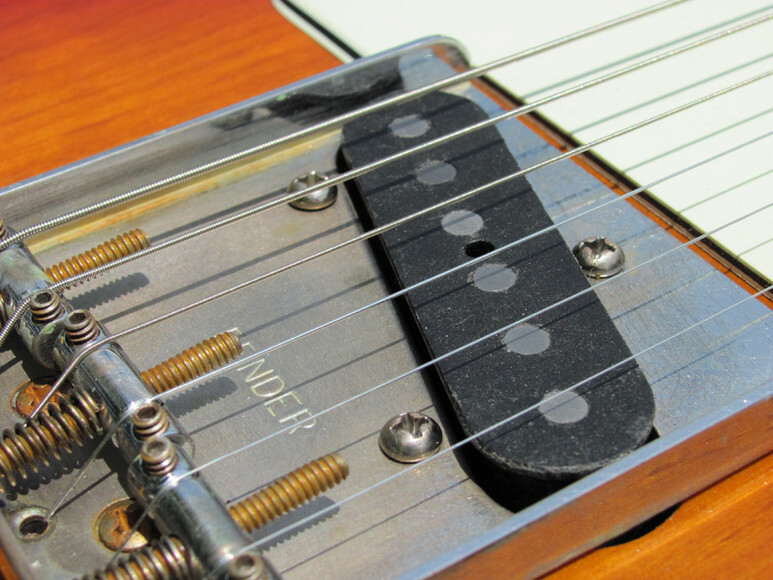 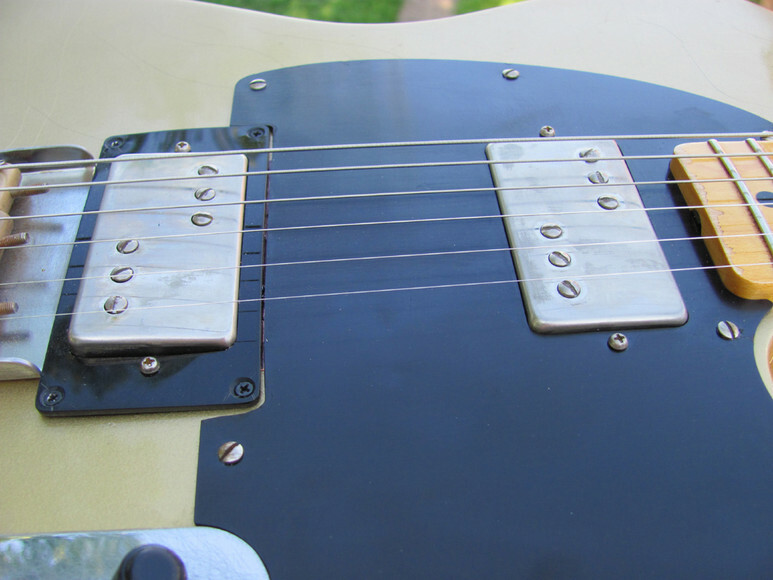 The neck humbucker pickup is a Gibson Burstbucker 1 (PAF clone) and the bridge pickup is a Fender USA Hot Alnico 3 (these balance well together); wiring harness and switch are Fender USA. 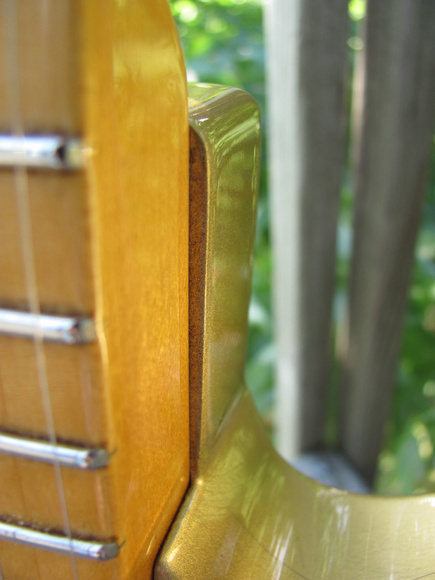 A very resonant guitar and lightweight at just 7.3 lbs. 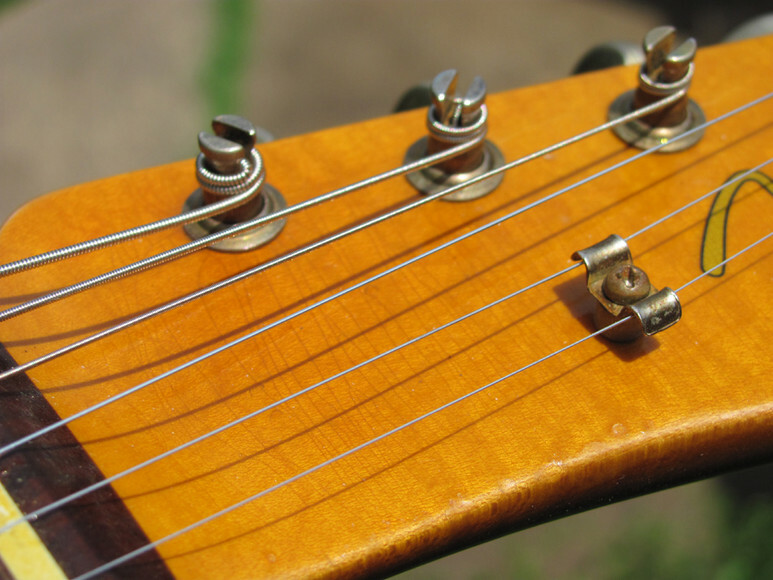 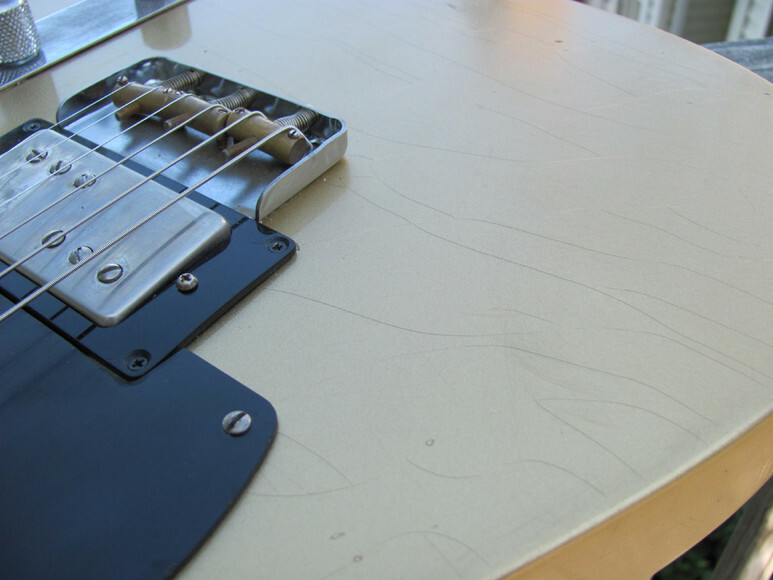 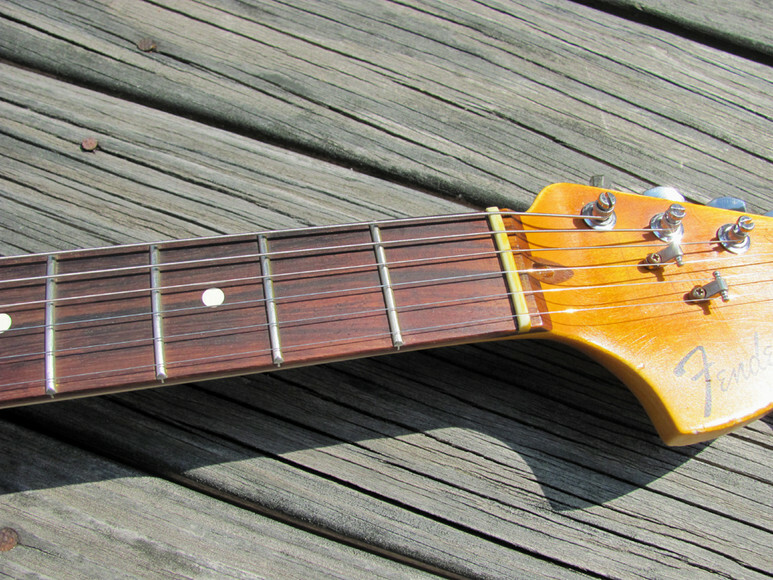 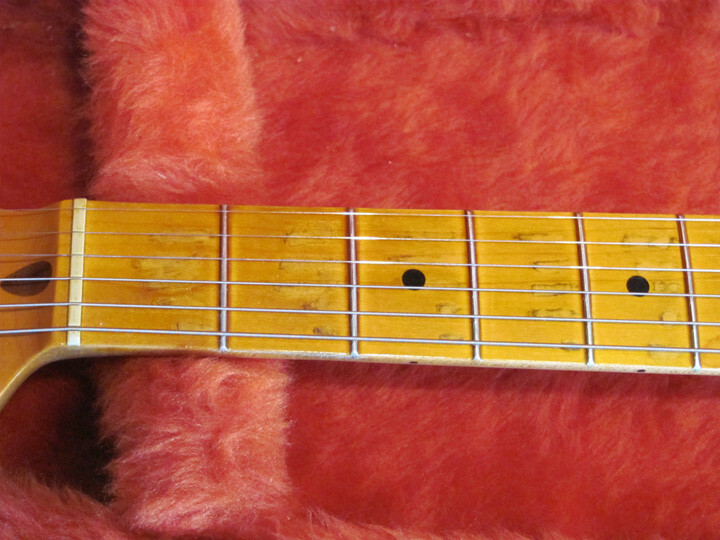 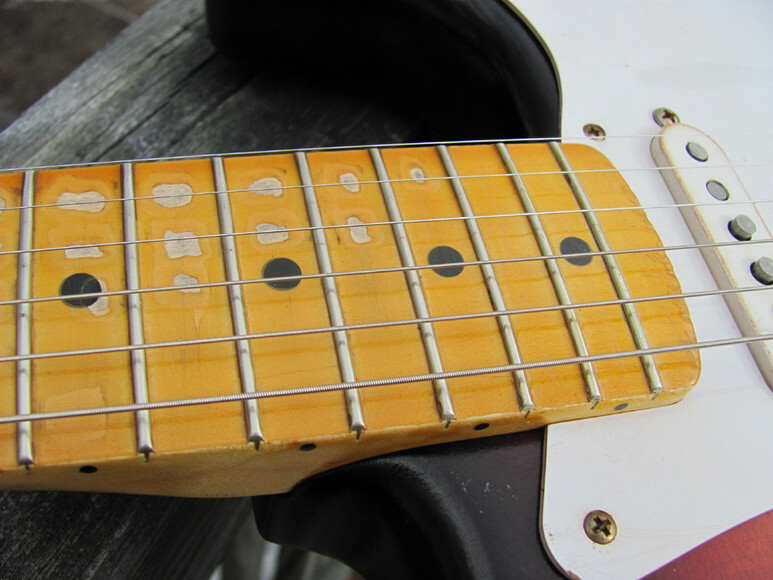 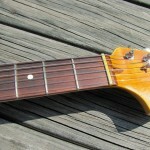 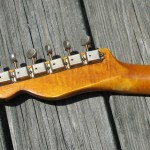 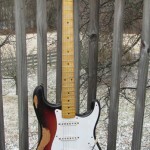 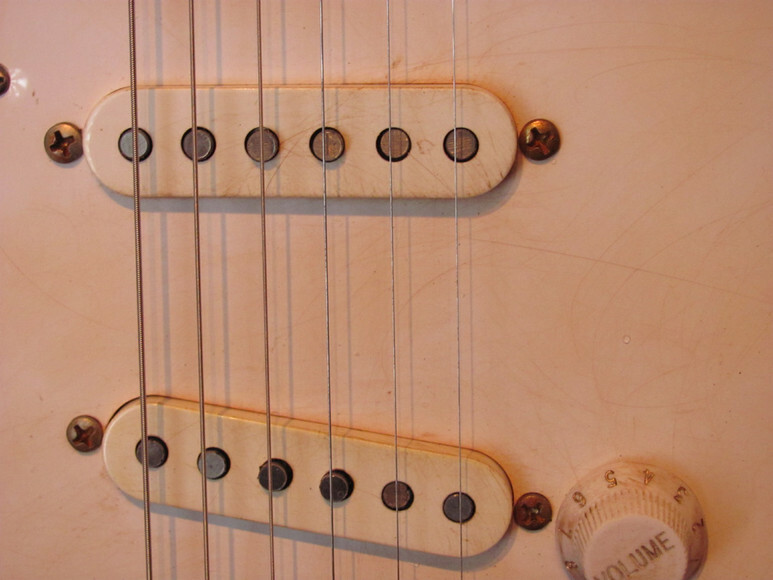 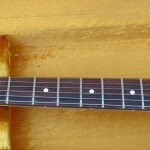 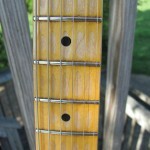 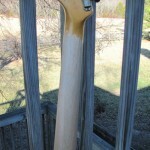 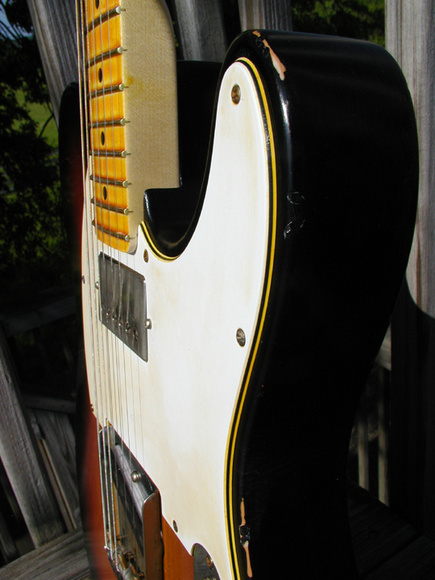 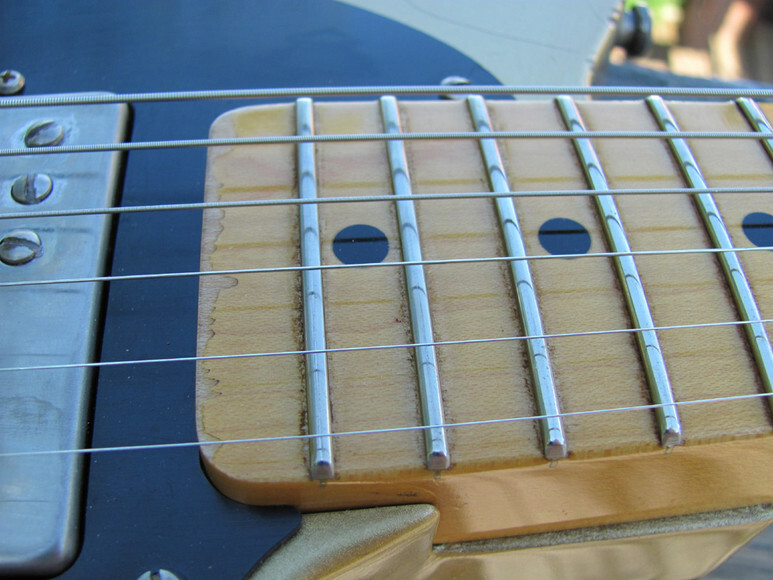 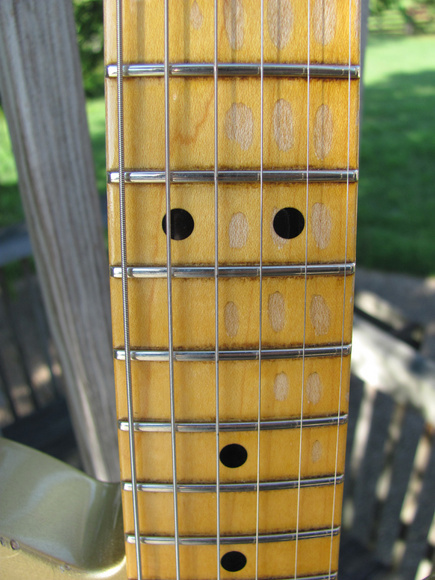 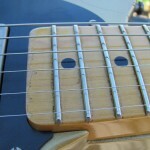 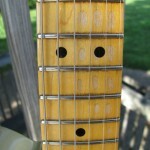 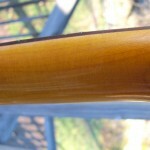 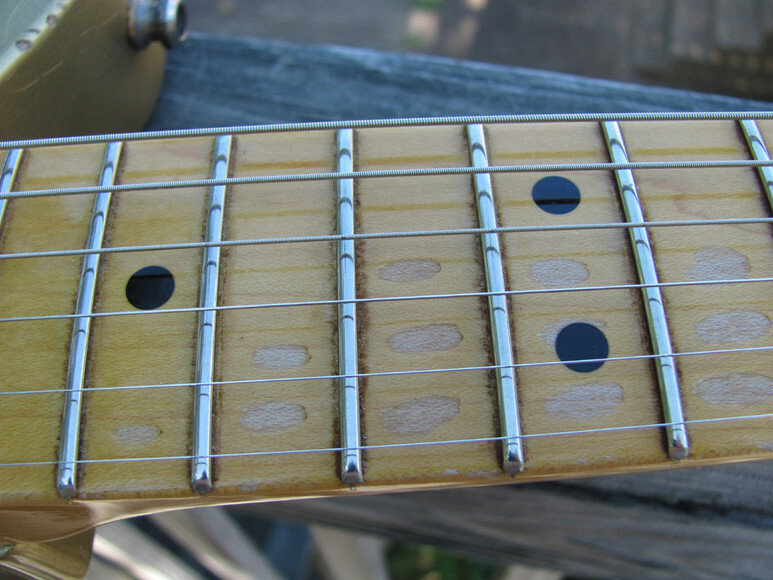 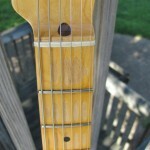 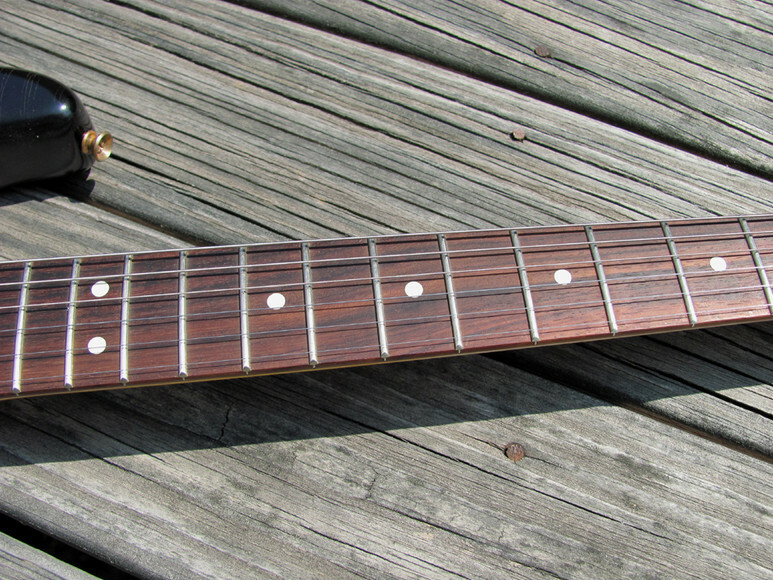 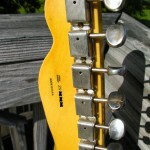 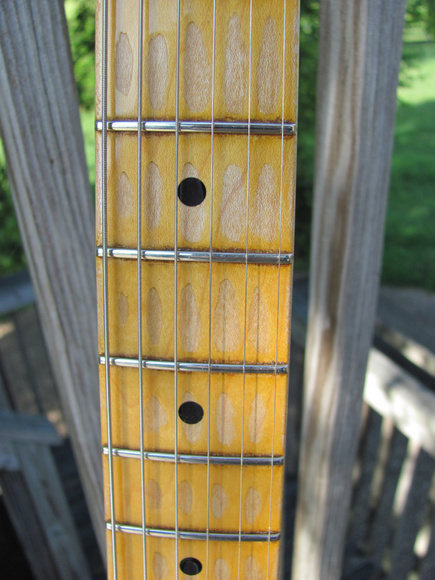 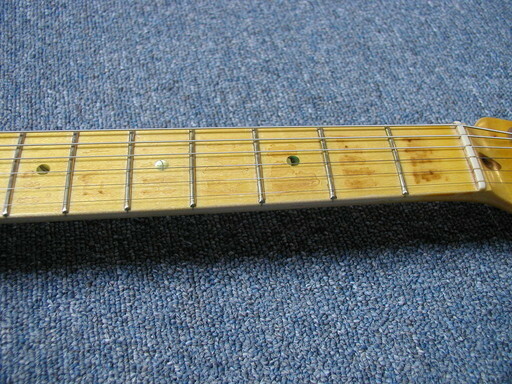 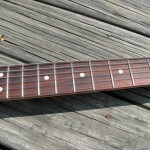 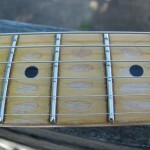 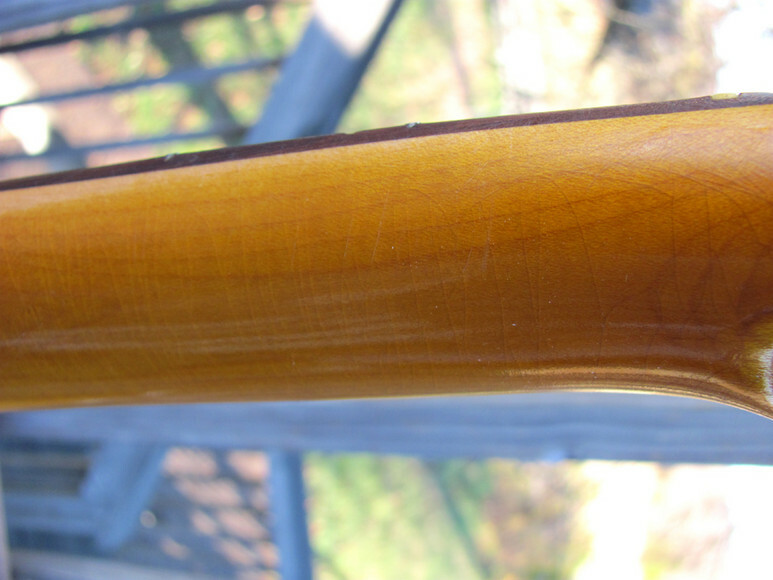 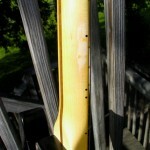 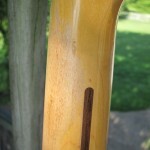 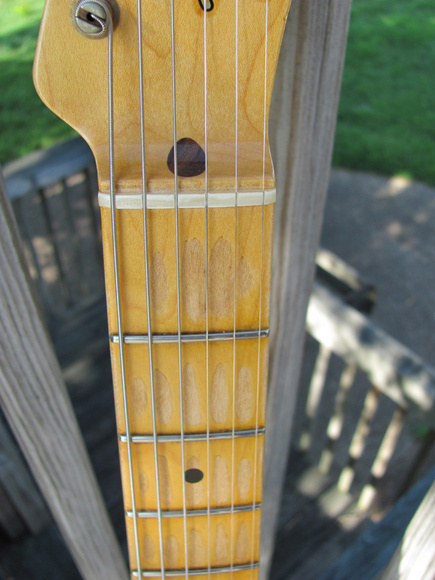 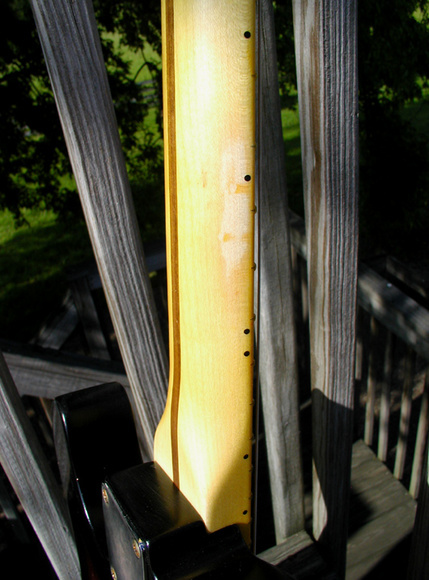 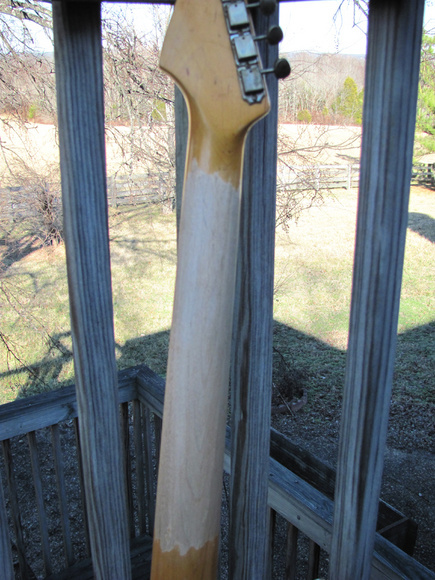 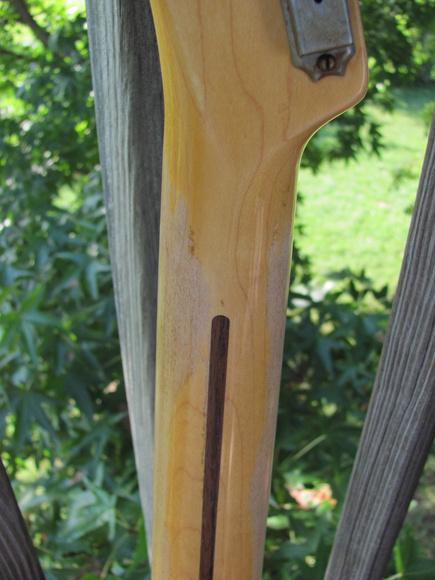 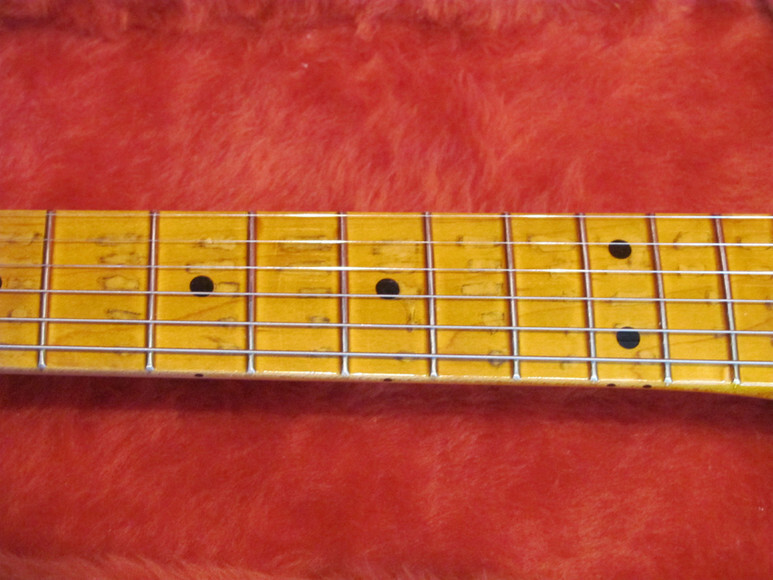 Alder body; maple neck (C shaped) and fretboard (9.5' radius) with medium-jumbo frets. 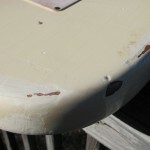 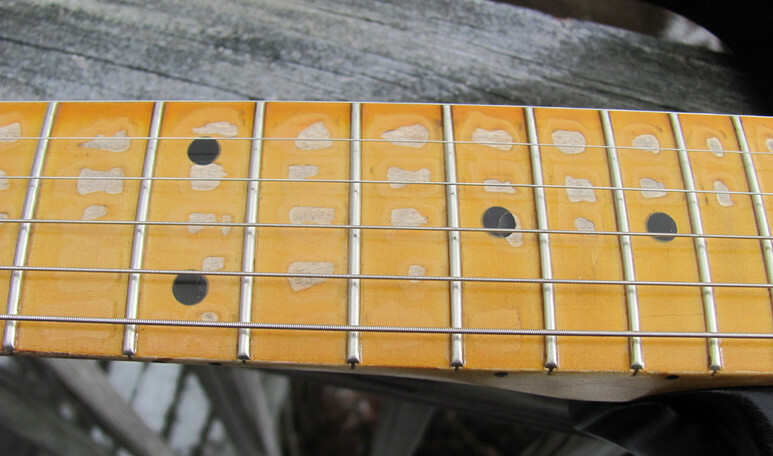 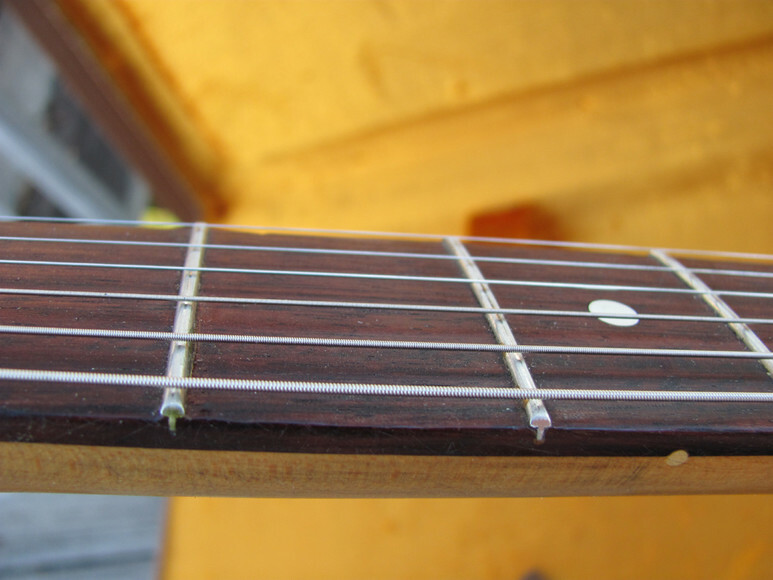 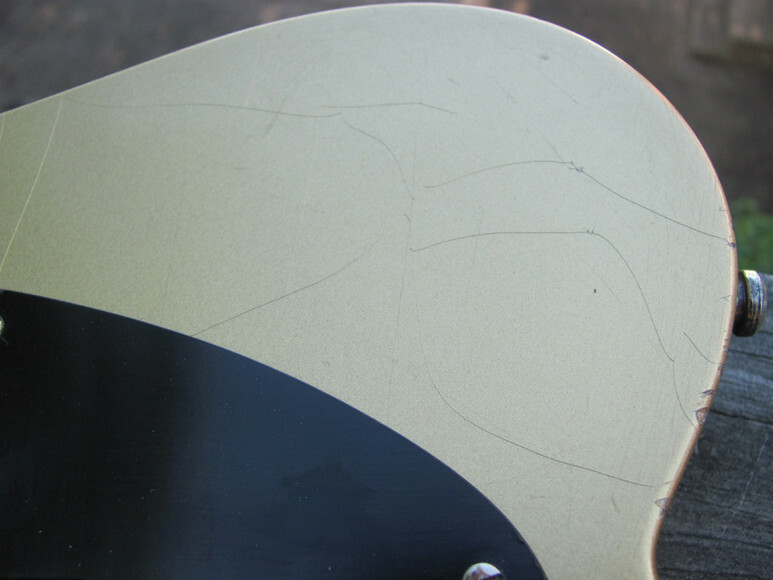 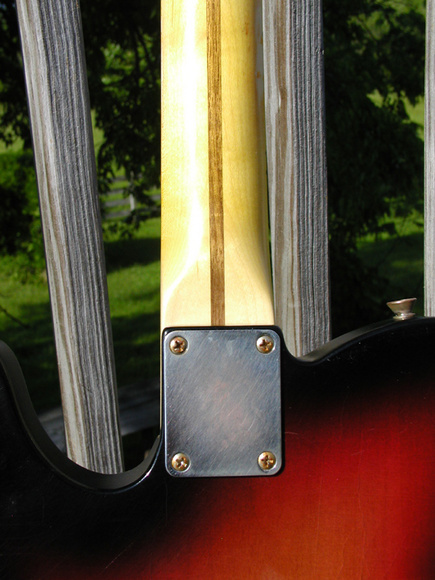 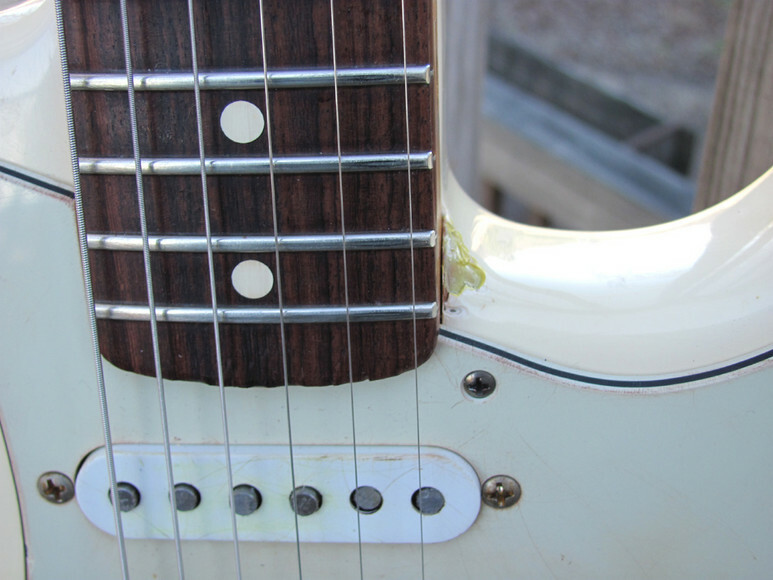 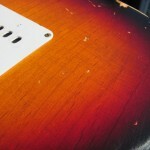 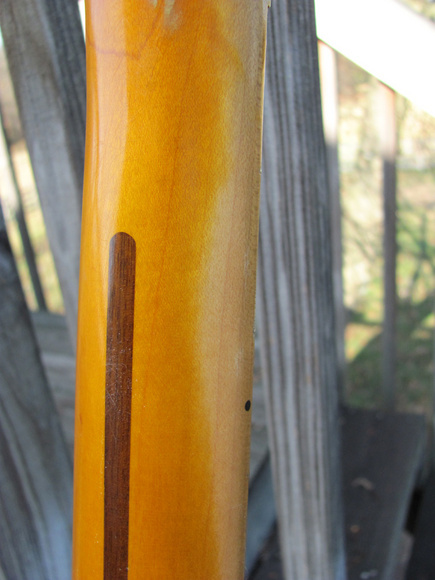 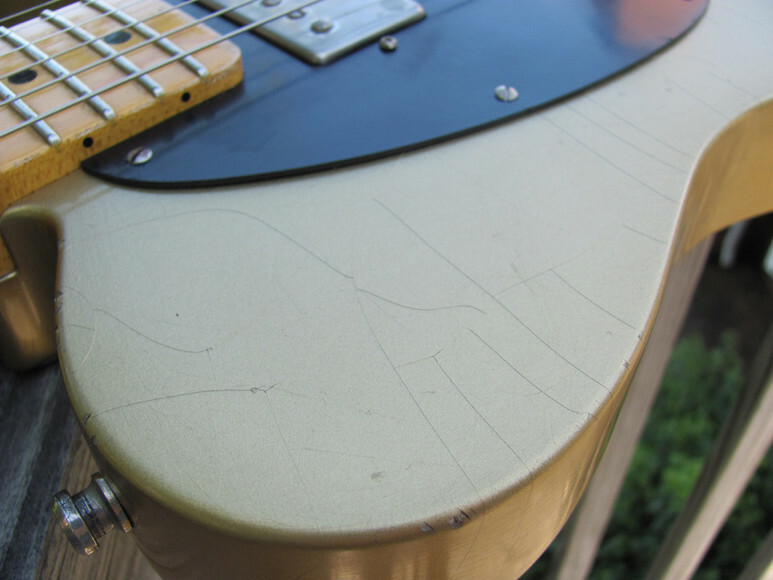 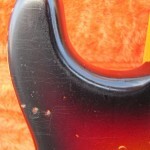 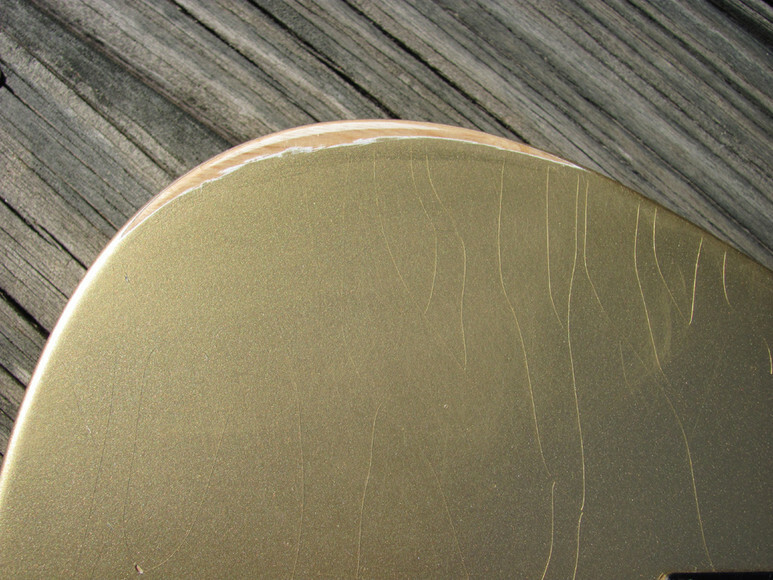 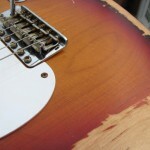 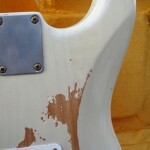 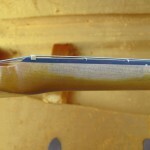 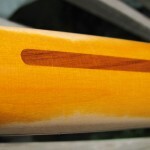 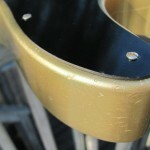 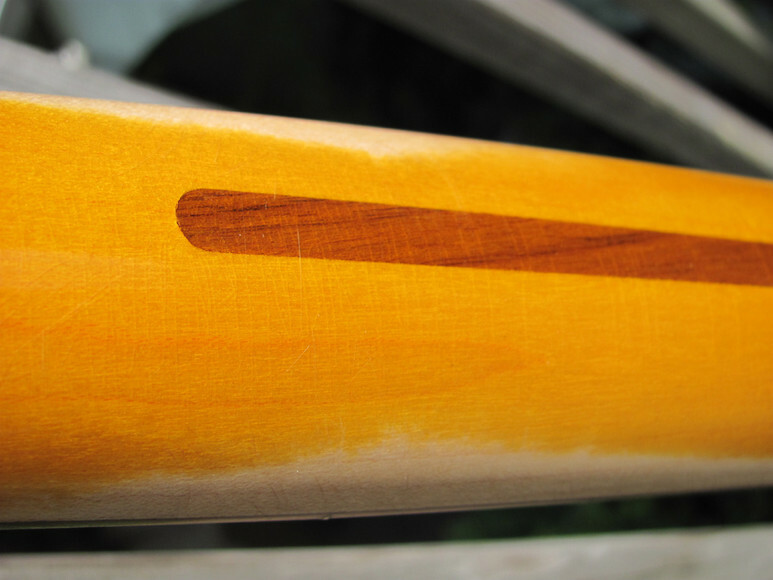 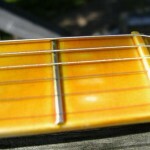 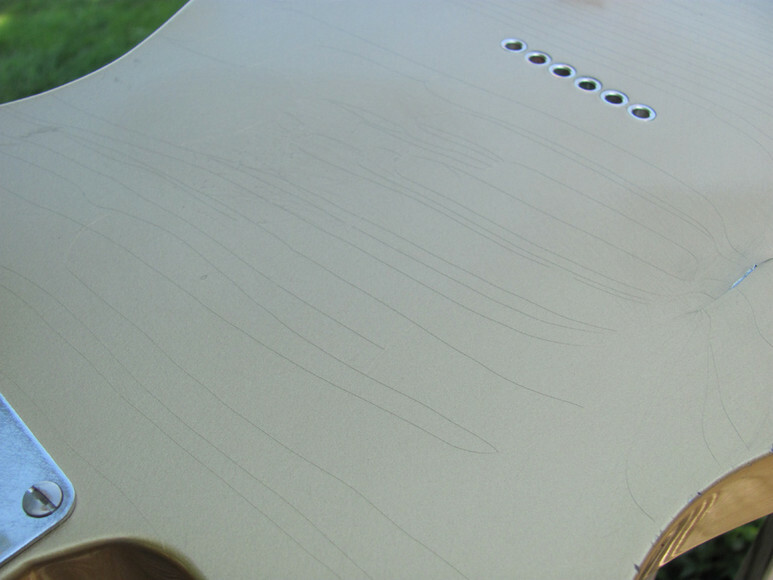 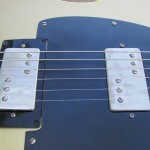 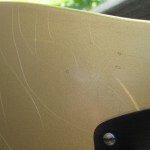 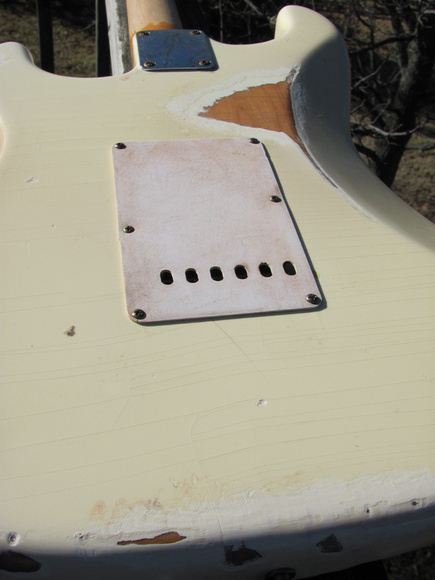 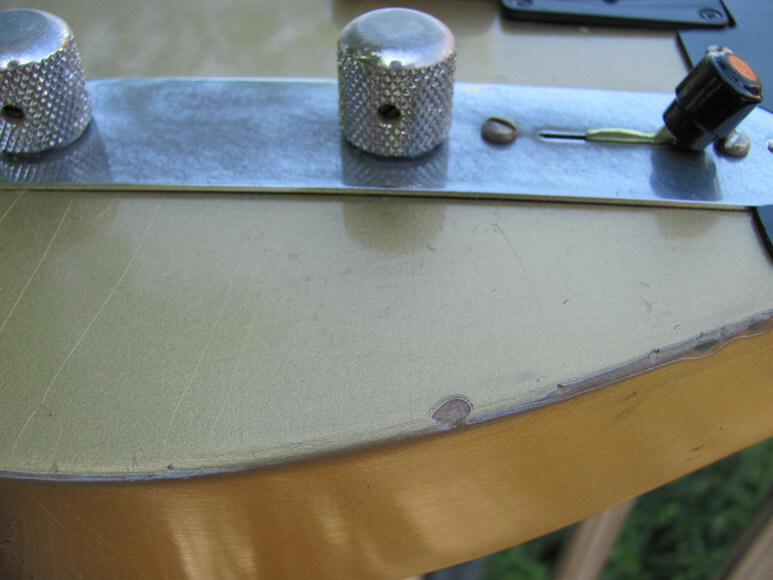 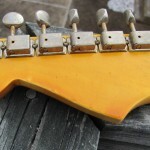 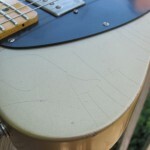 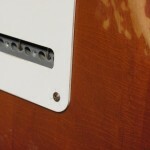 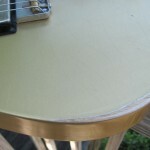 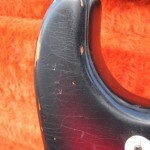 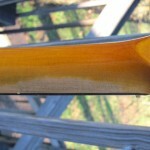 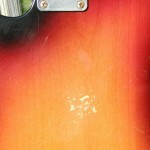 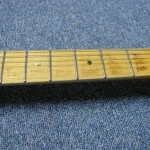 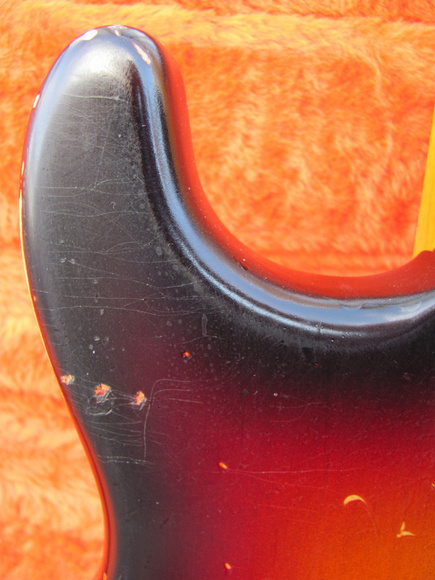 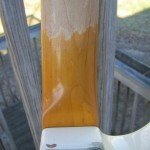 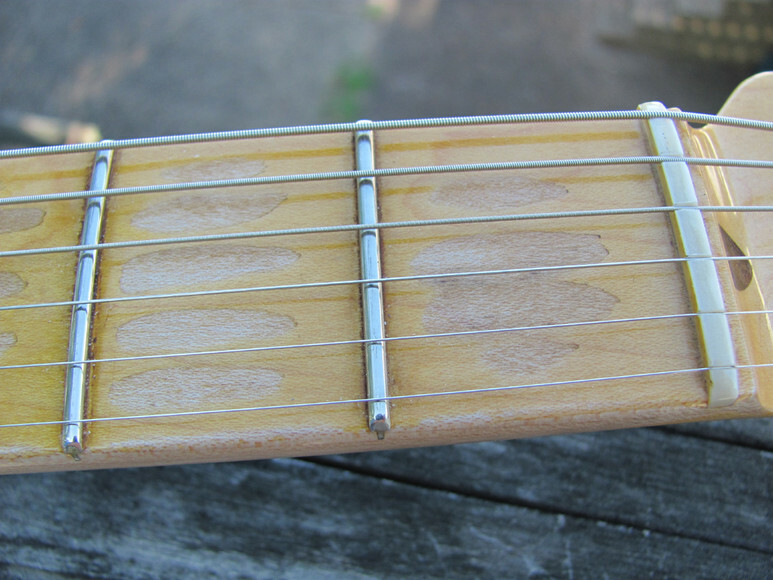 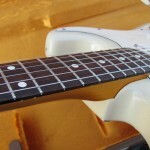 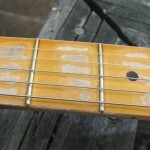 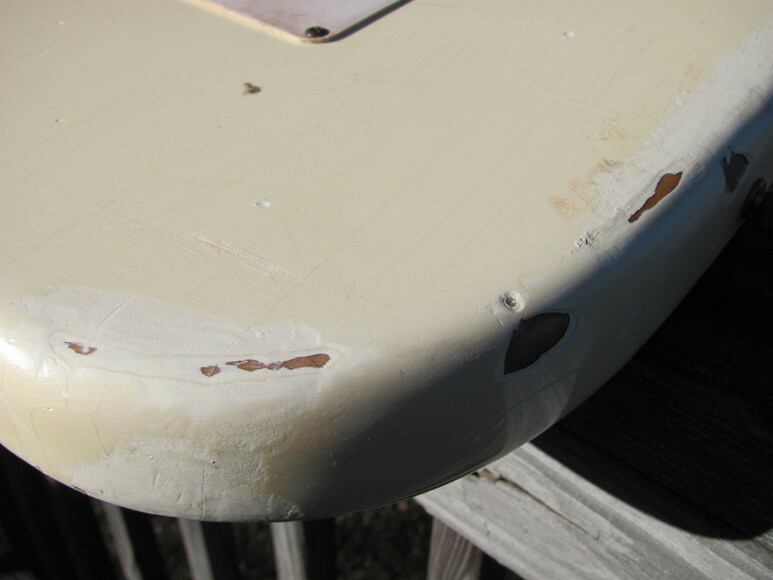 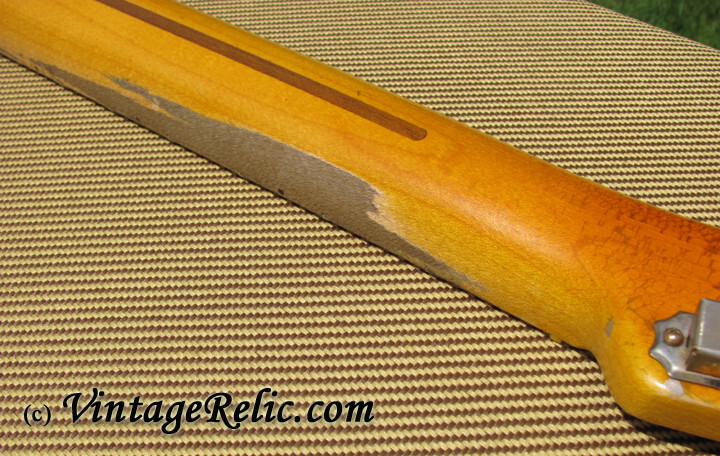 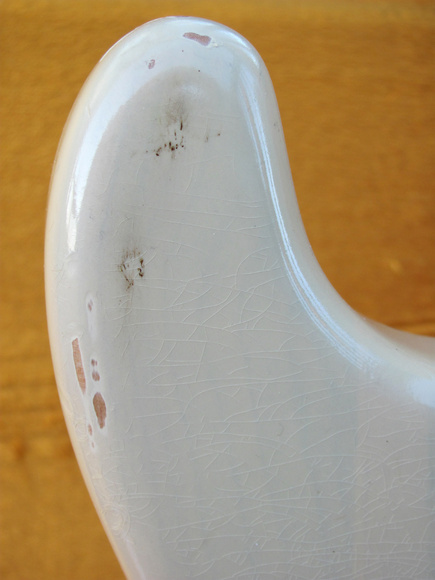 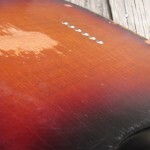 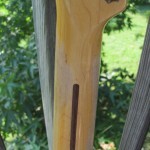 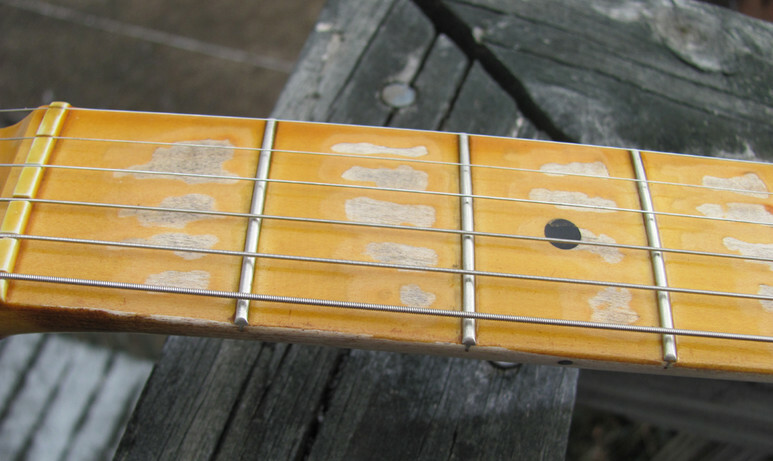 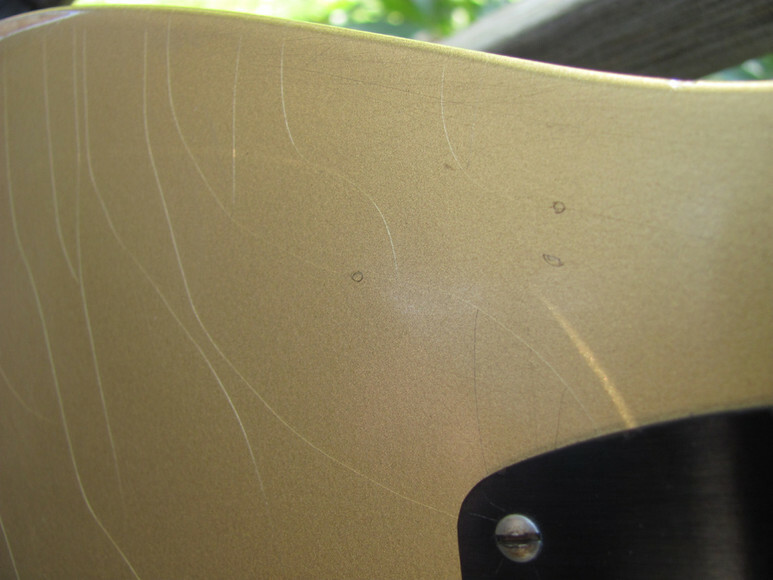 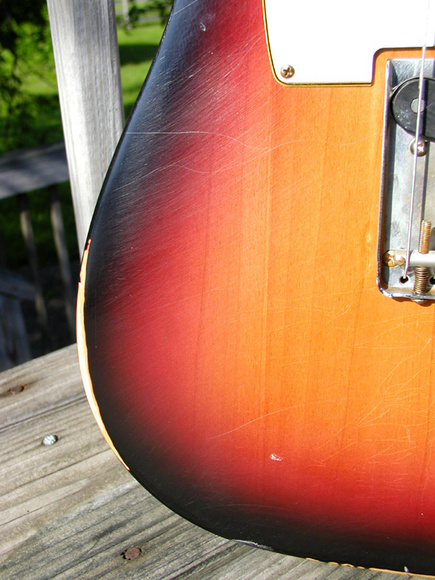 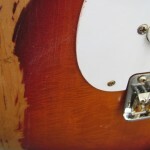 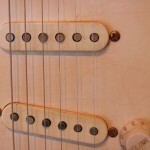 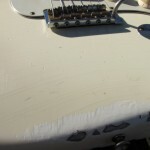 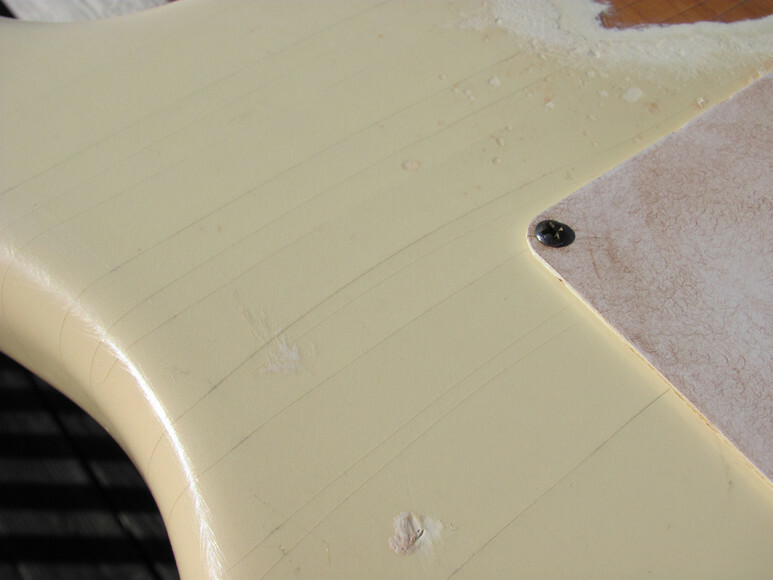 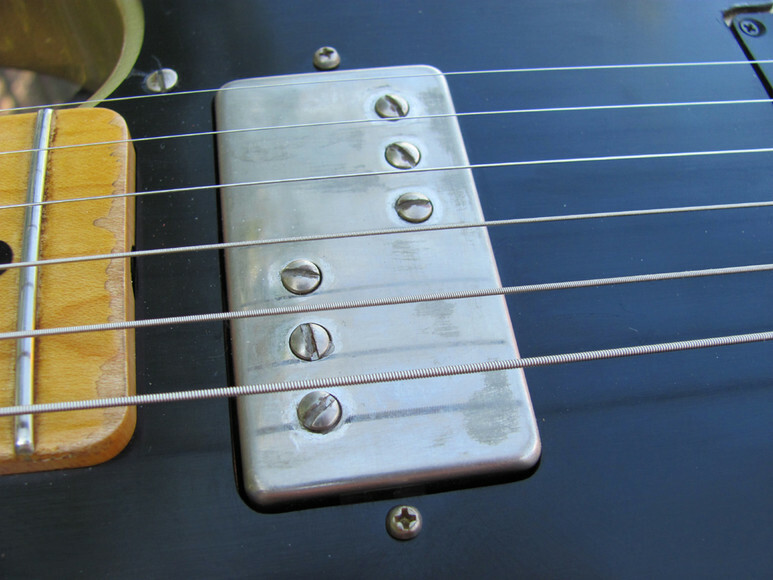 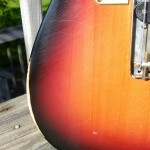 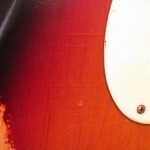 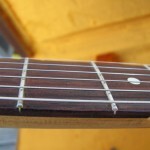 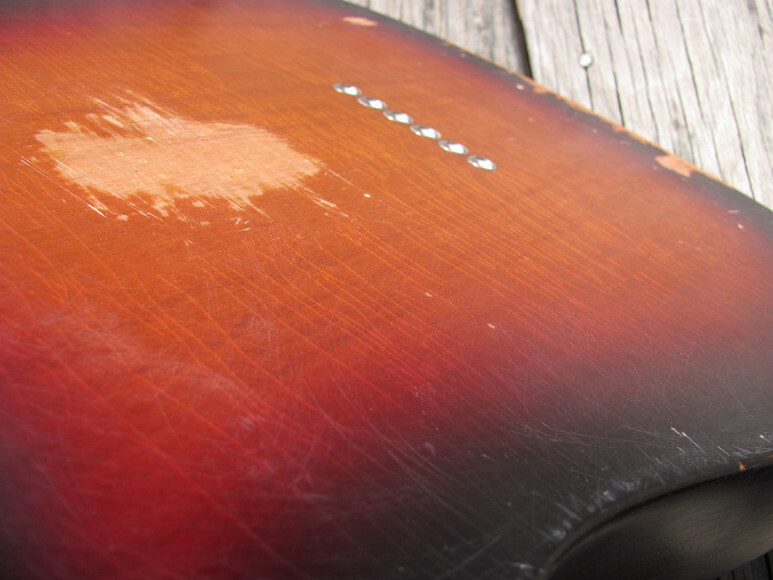 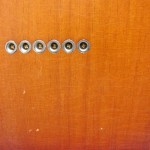 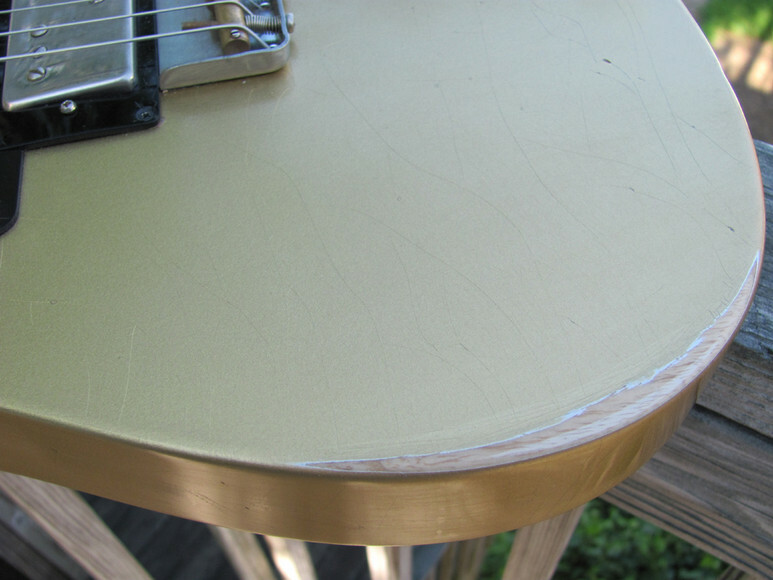 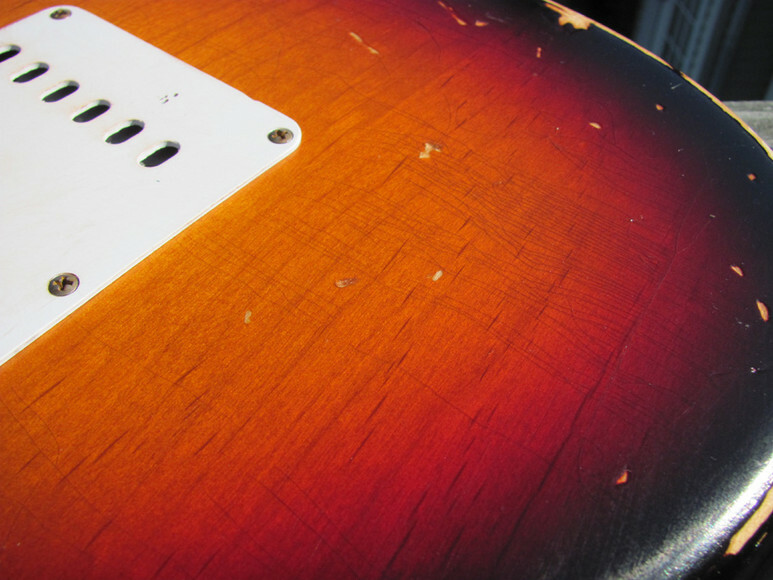 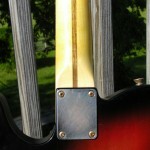 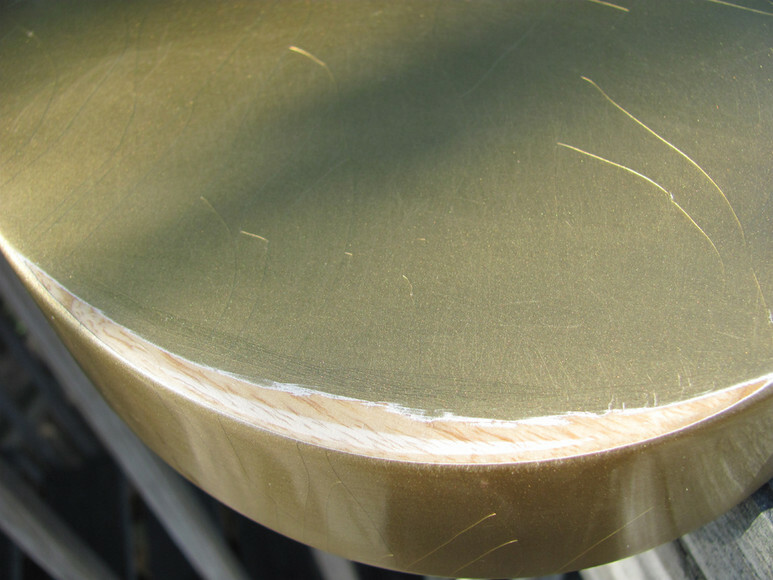 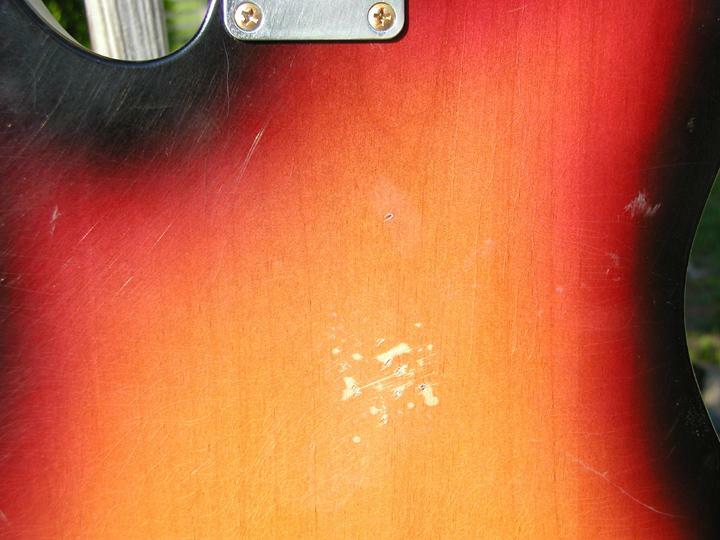 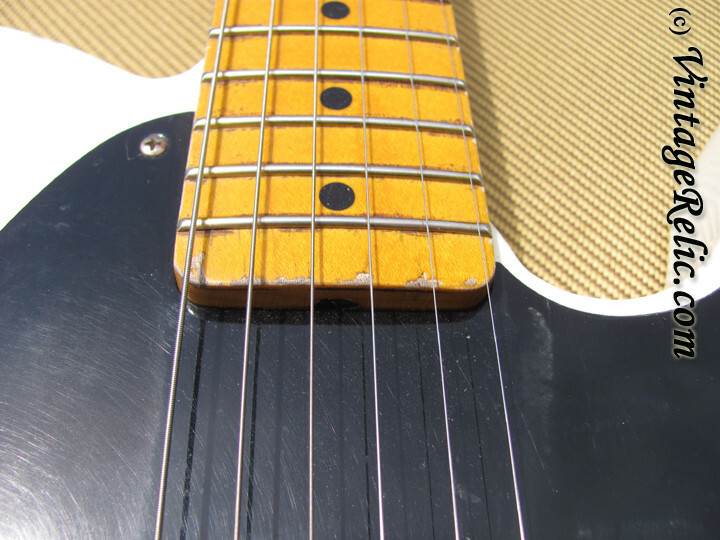 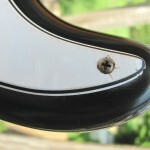 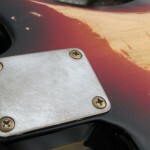 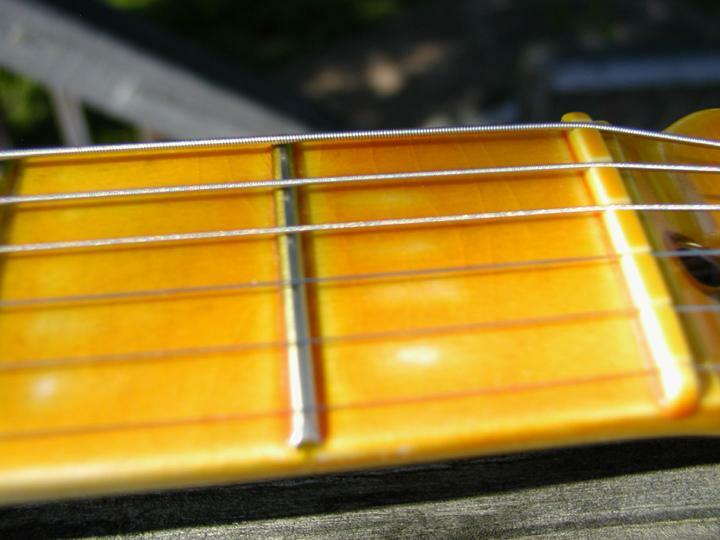 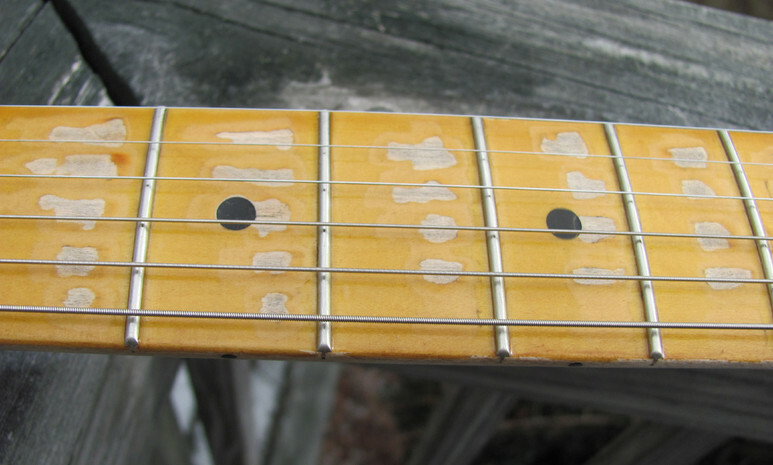 Moderate relicing with 'weather' (lacquer) checking throughout the body and neck; light finish wear on fretboard. 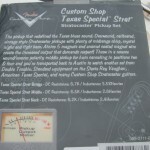 Set up with D'Addario EXL110 strings (.010-.046). 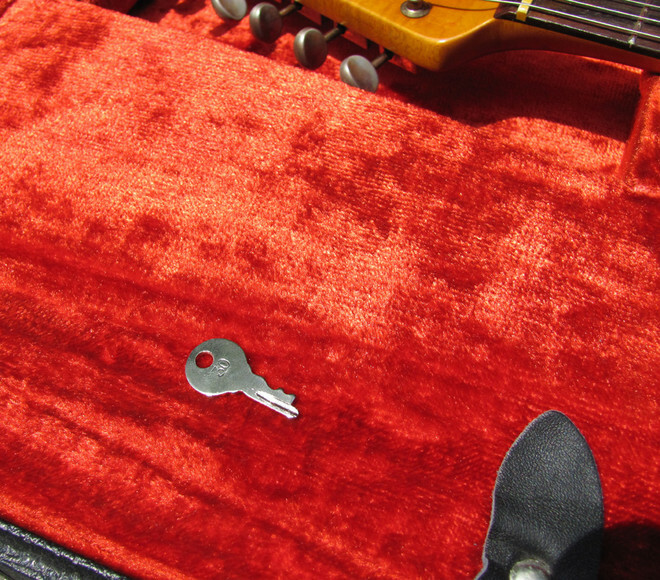 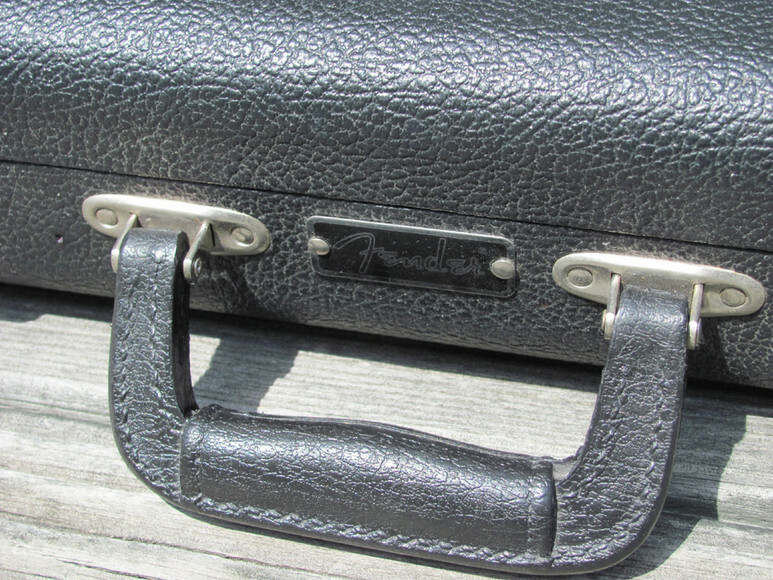 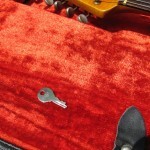 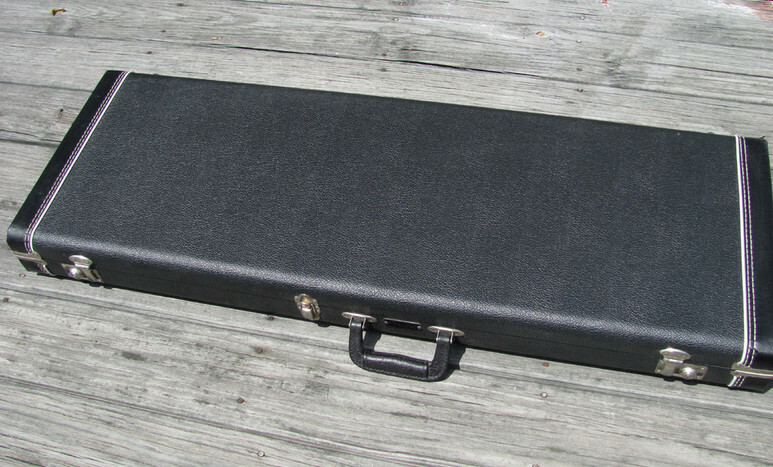 Includes a new Fender SKB case (w/key, TSA locks). 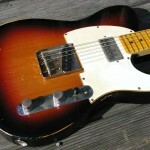 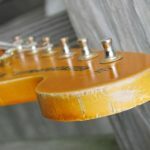 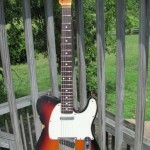 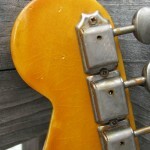 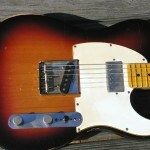 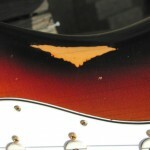 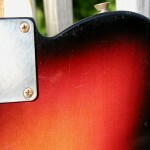 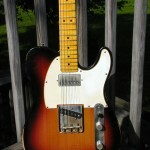 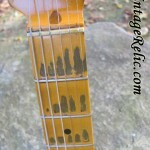 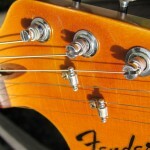 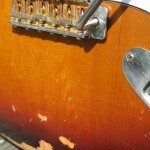 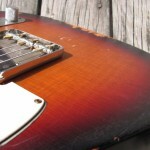 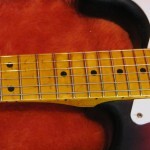 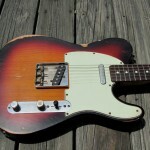 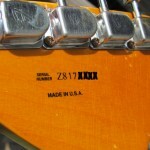 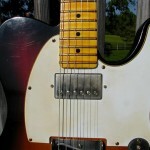 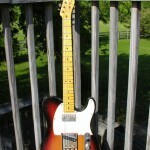 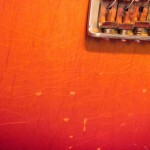 2009 Fender Telecaster Vintage Relic “62 Sunburst”. 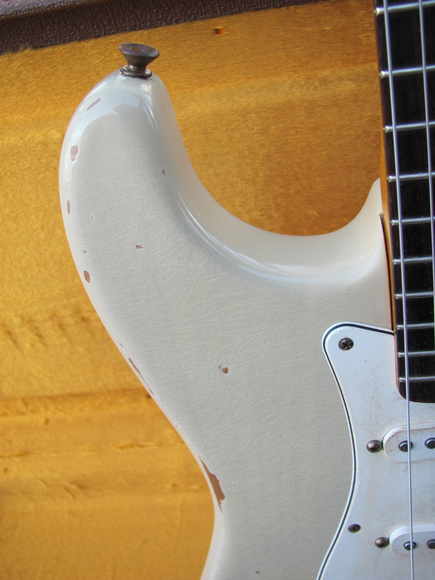 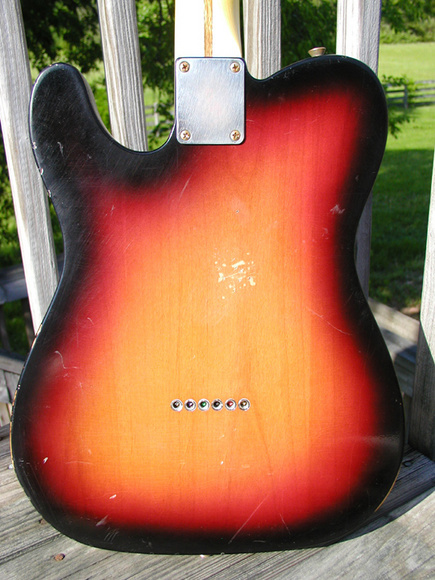 The body is finished in thin nitro; the neck is finished with thin vintage tinted nitro. 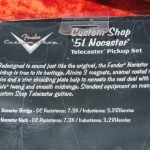 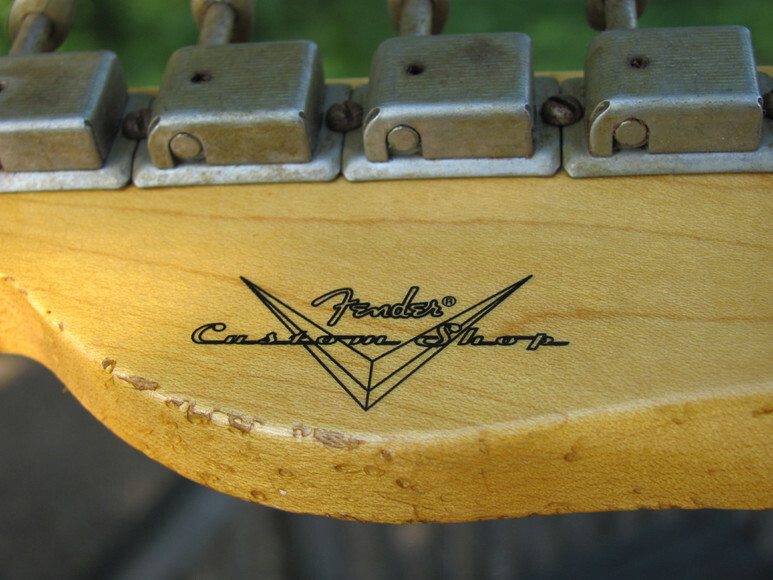 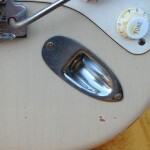 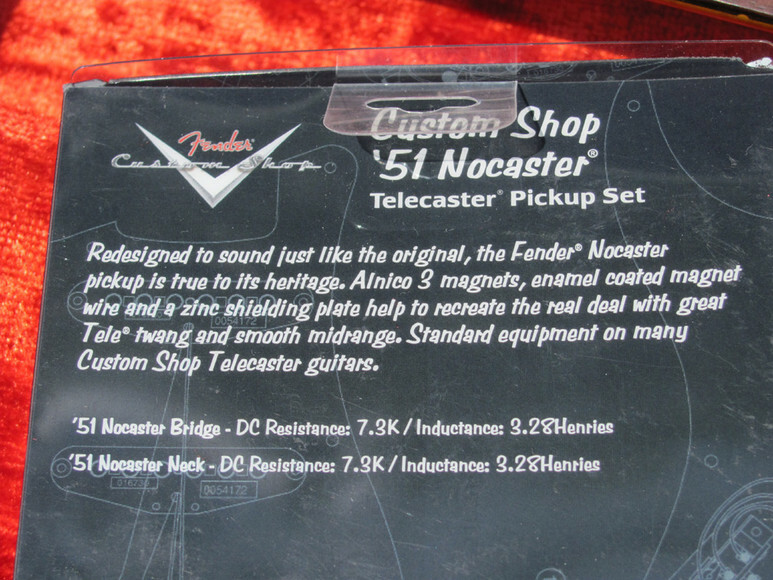 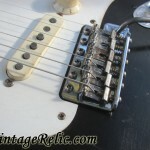 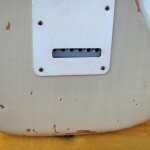 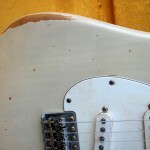 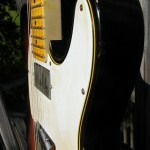 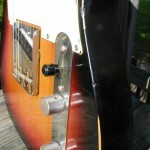 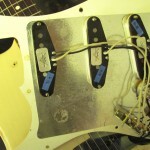 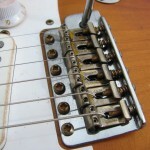 The pickups are Fender Custom Shop ’51 Nocaster; wiring harness and switch are Fender USA. 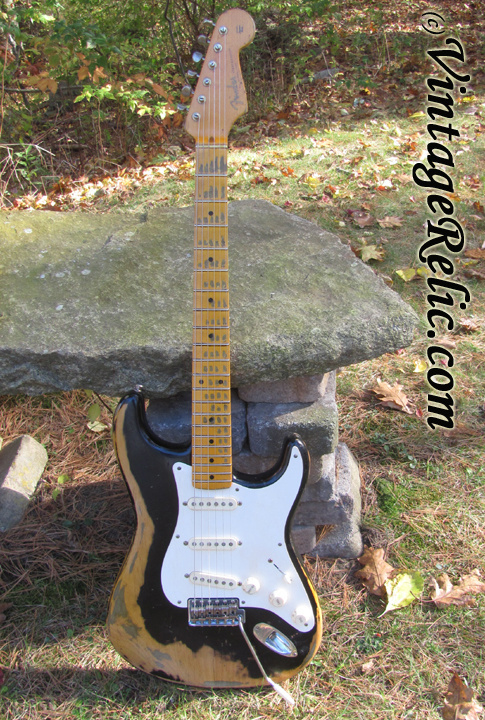 A great sounding guitar and lightweight at only 7.5 lbs. 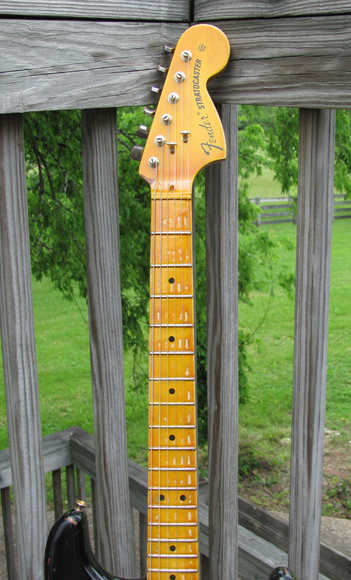 Fender USA alder body with a ‘60s vintage reissue flamed maple neck with rosewood fretboard (7.25' radius) and vintage style frets. 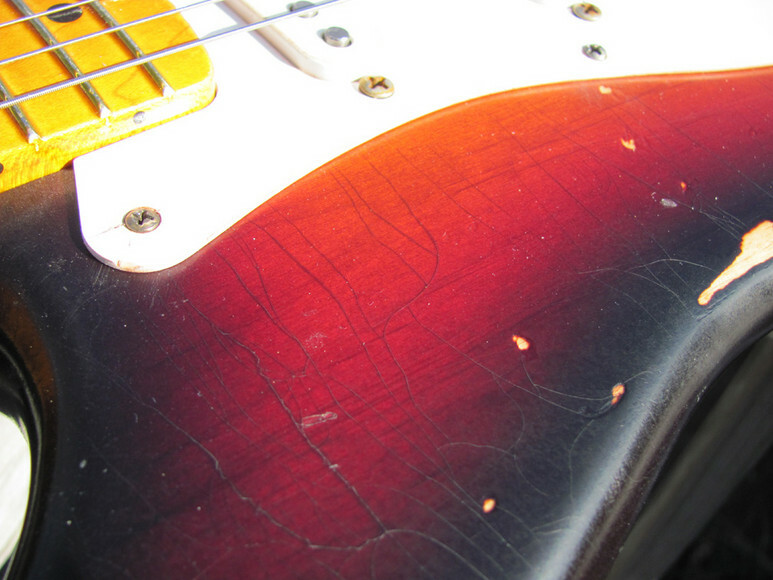 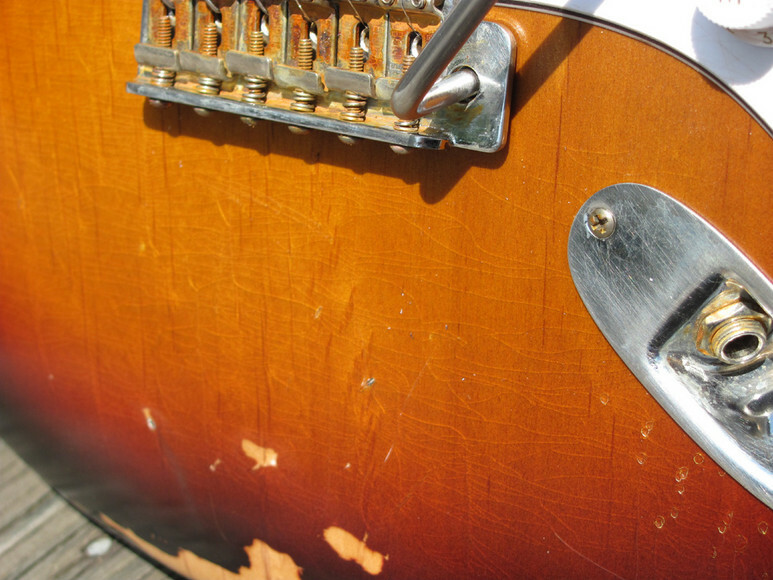 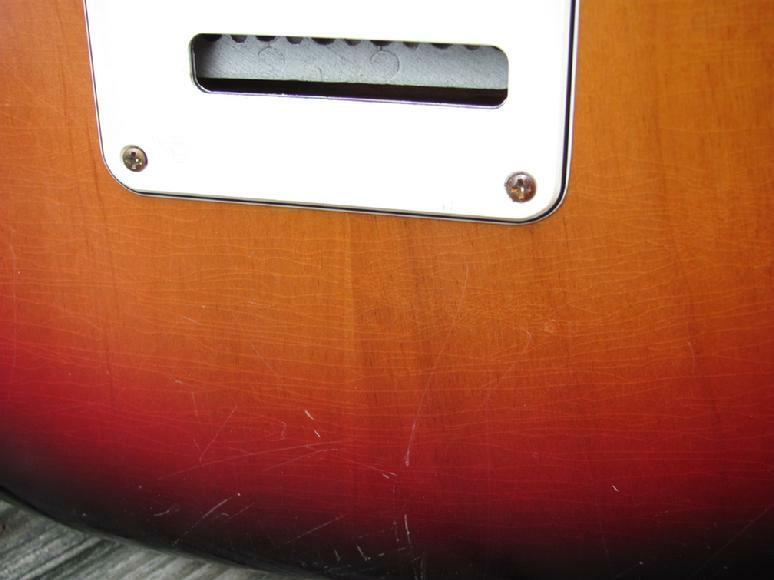 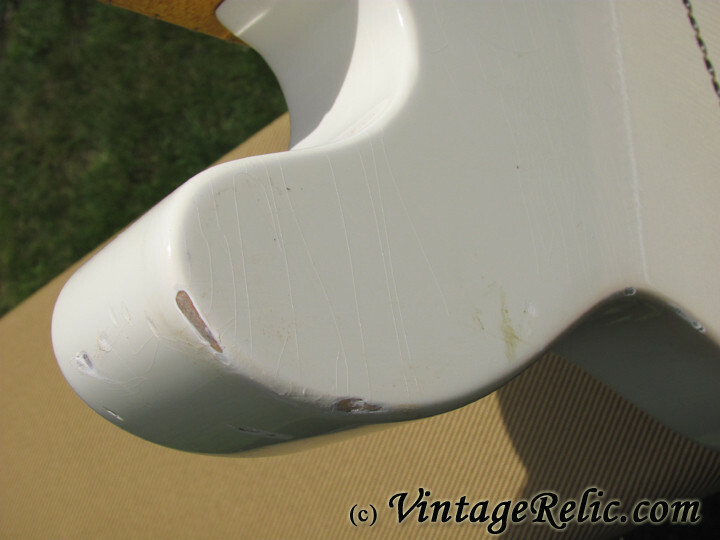 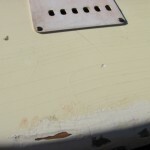 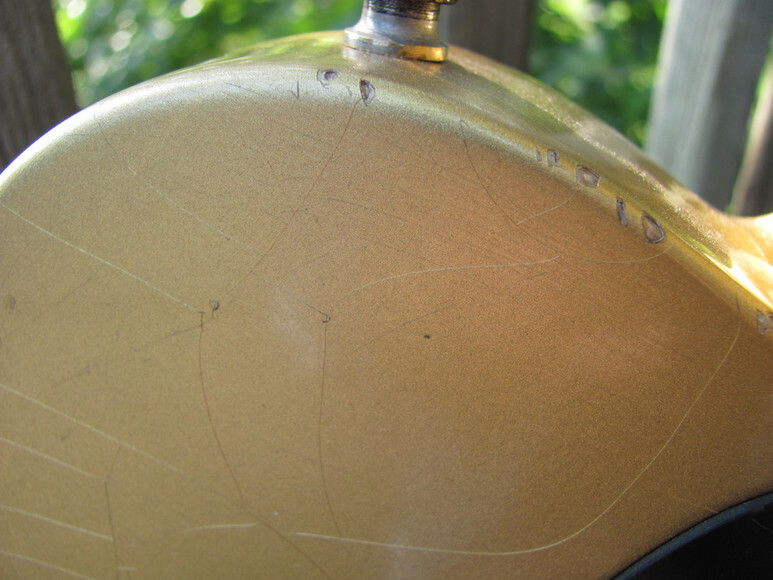 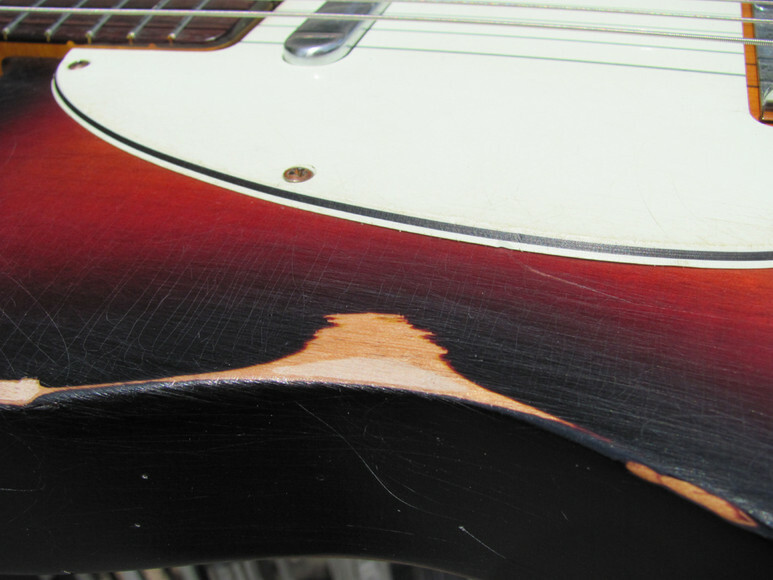 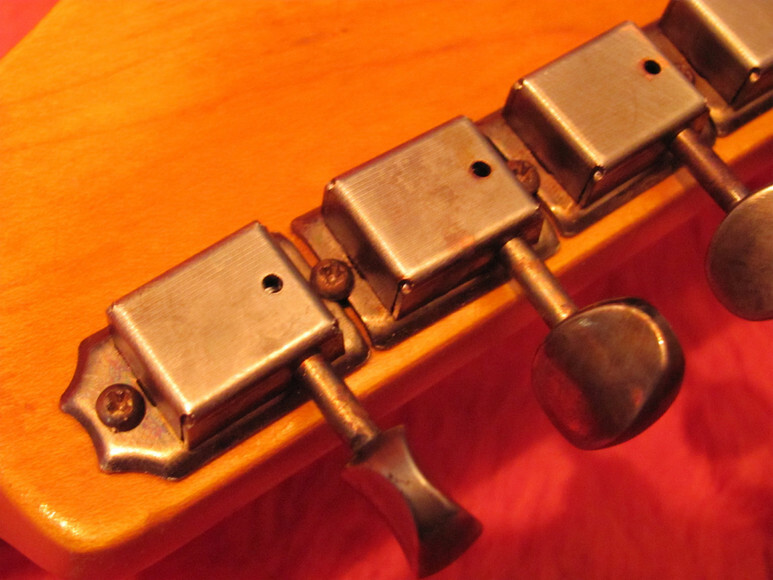 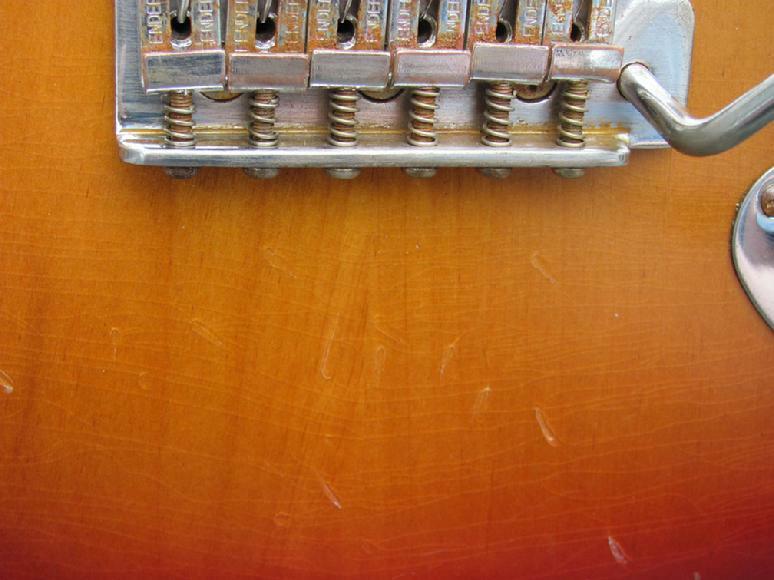 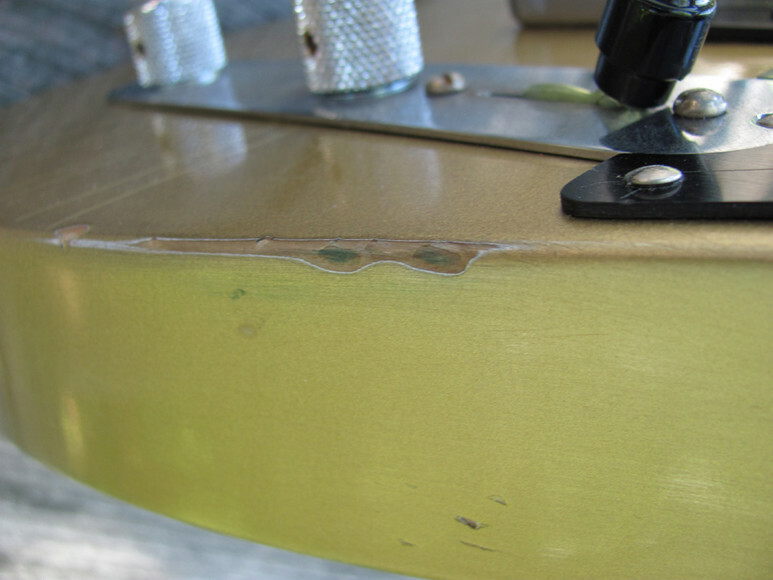 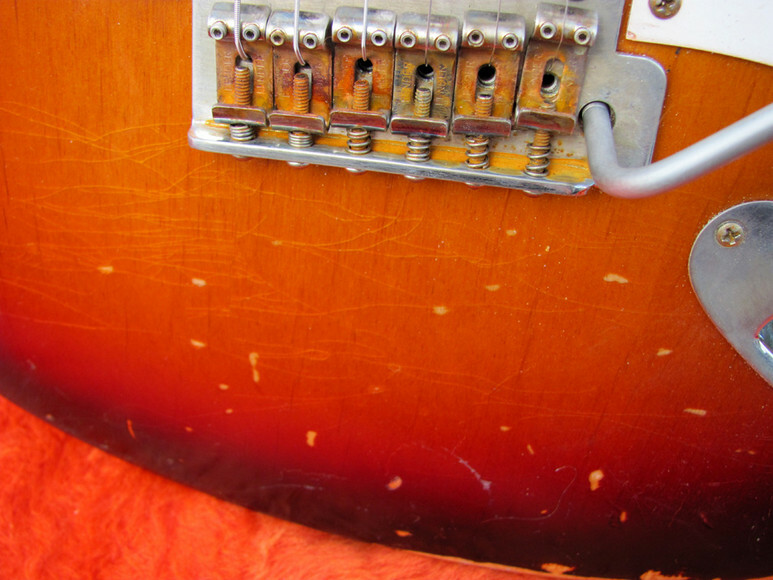 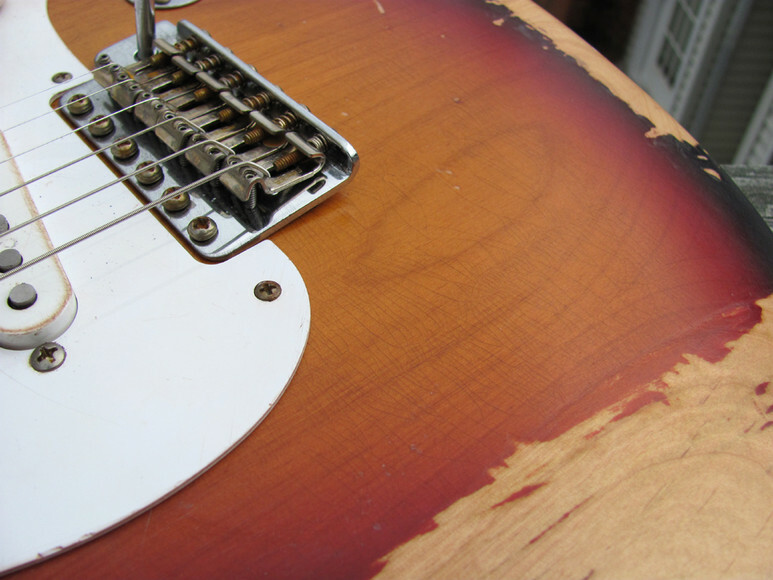 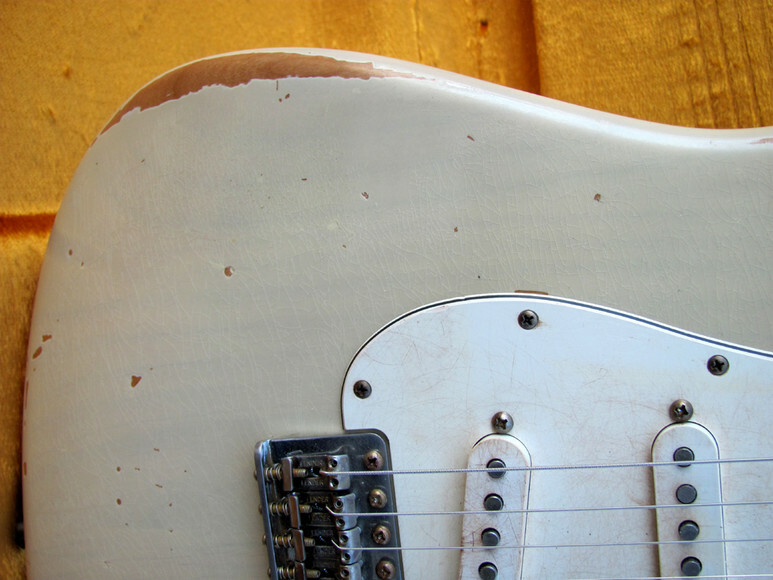 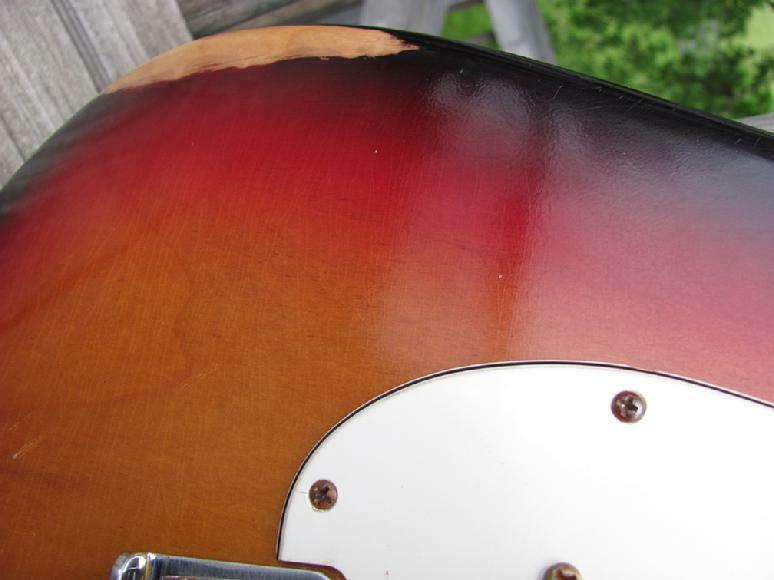 Heavy relicing with 'weather' (lacquer) checking throughout the body and headstock, dings, scratches, buckle rash, etc; all plastic and hardware also aged. 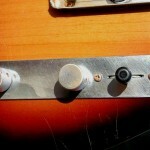 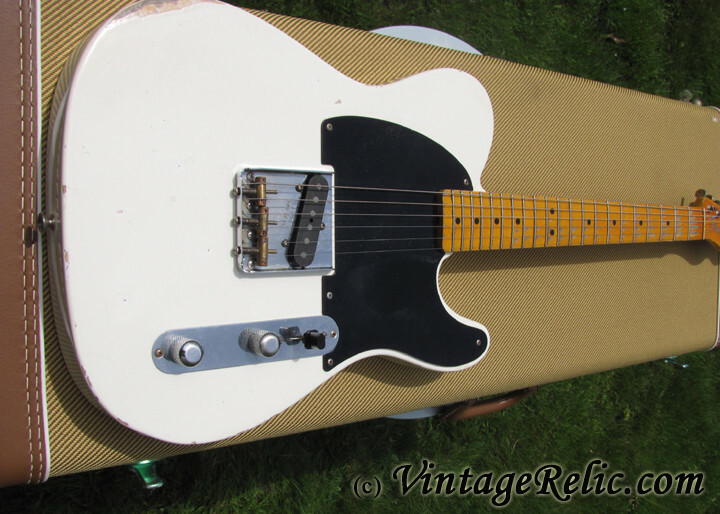 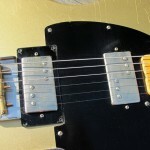 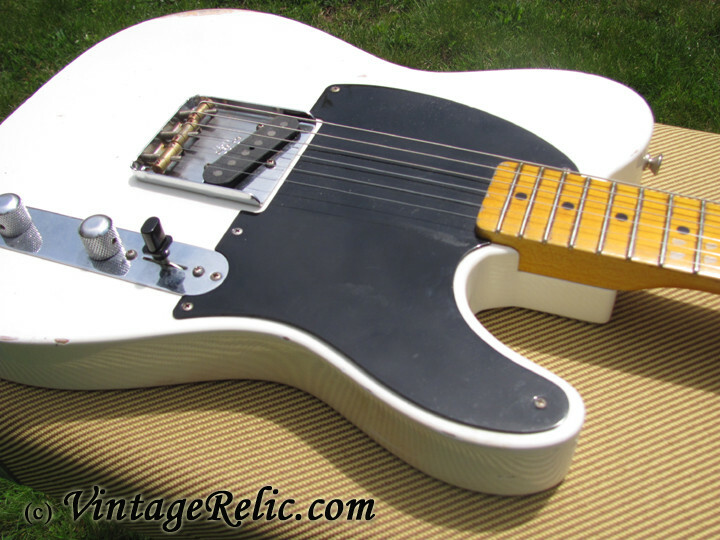 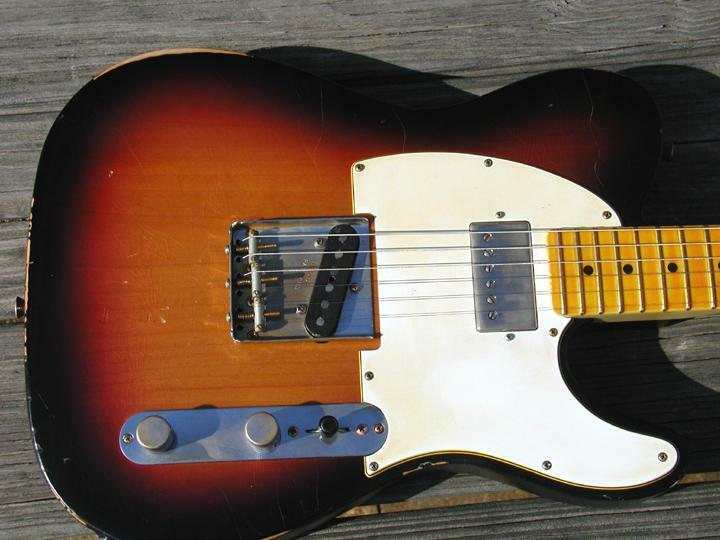 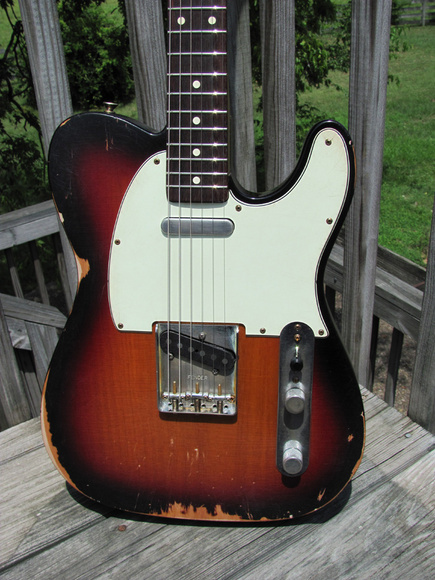 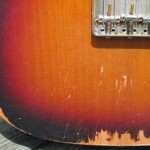 Looks and feels like a heavily played vintage Tele! 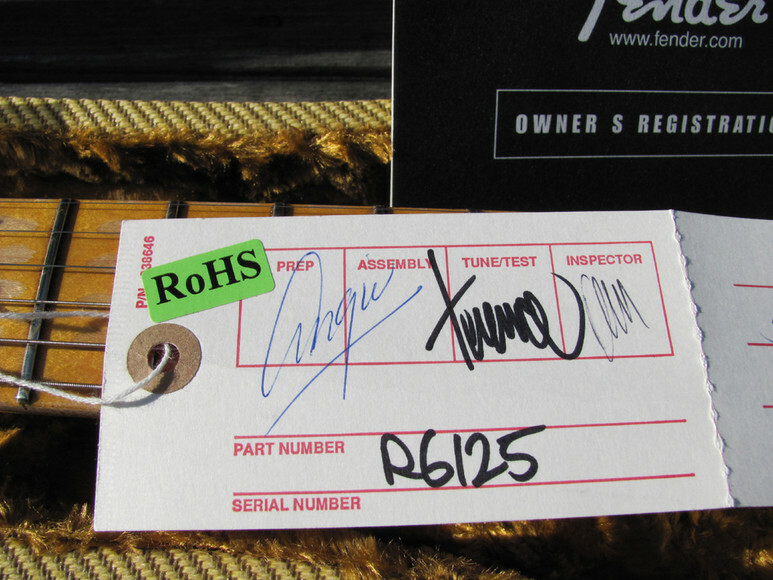 Set up with Ernie Ball Regular Slinky strings (.010-.046). 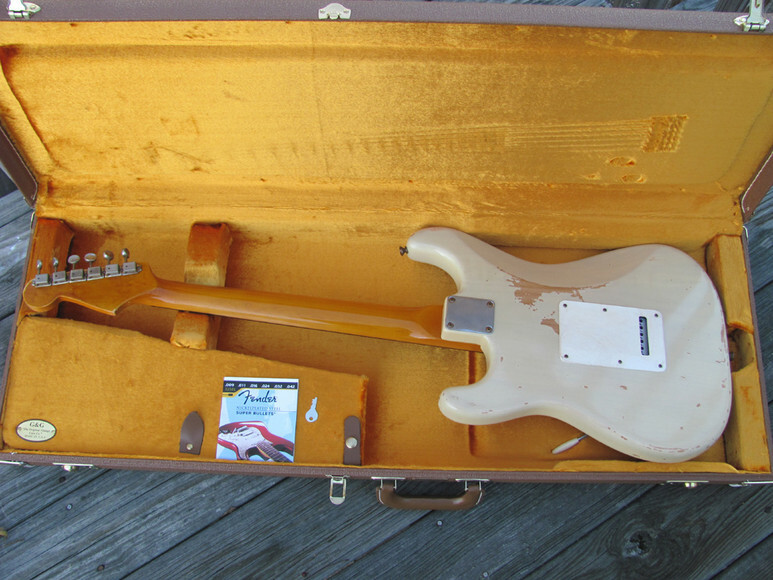 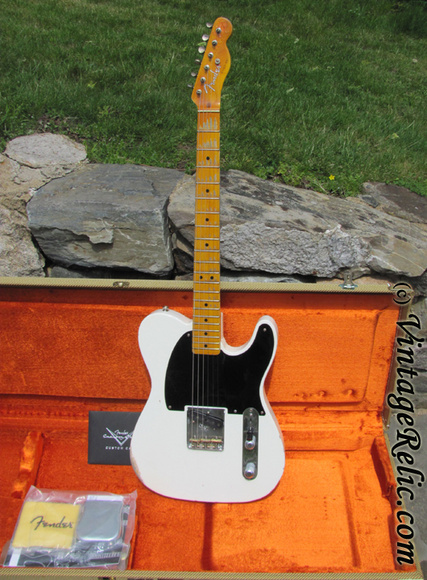 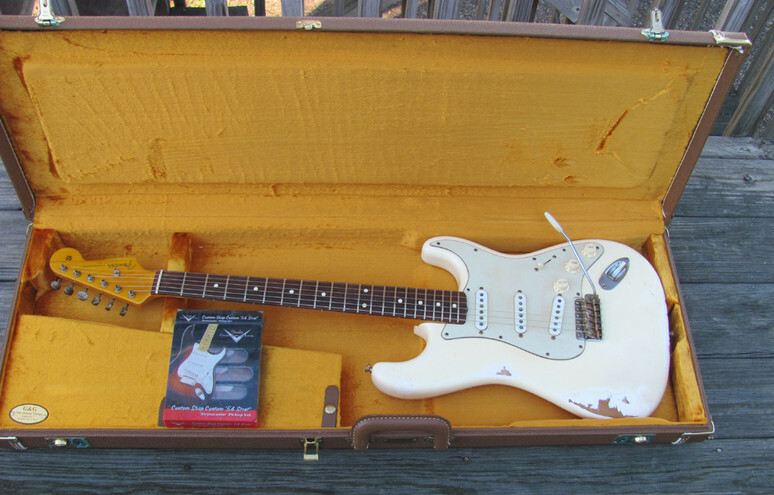 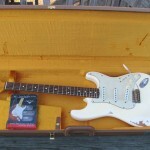 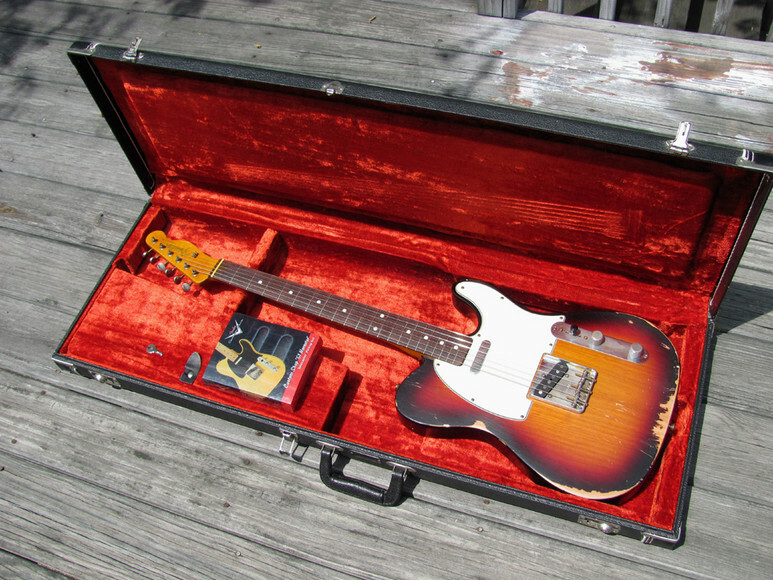 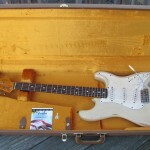 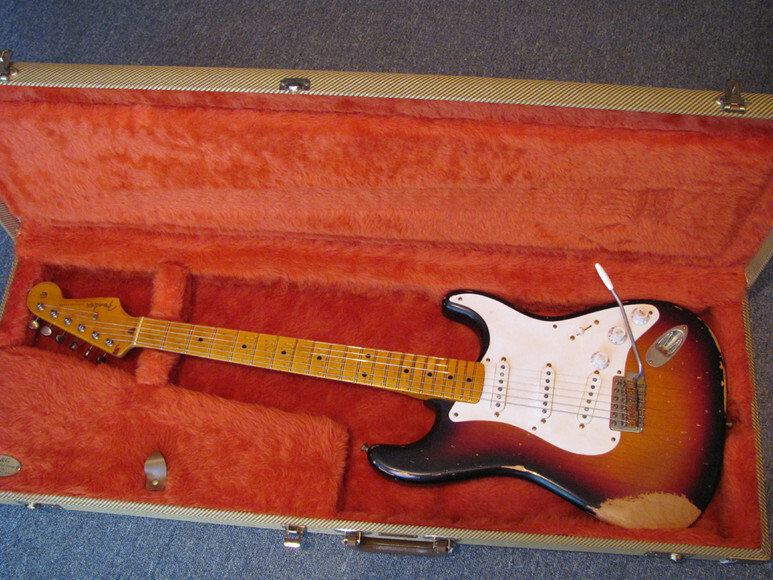 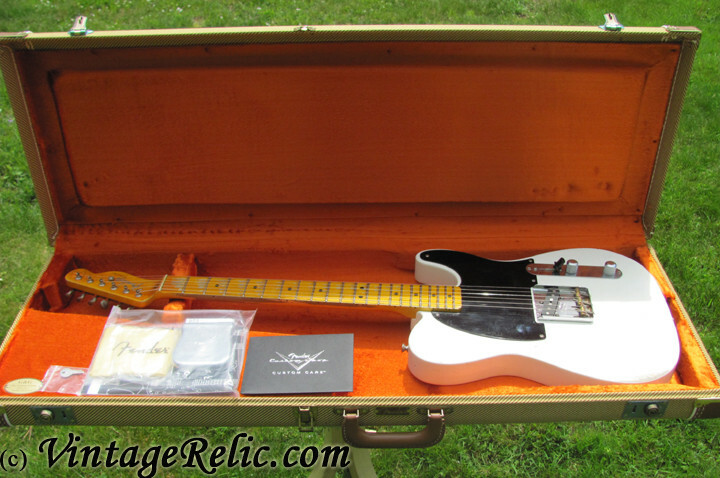 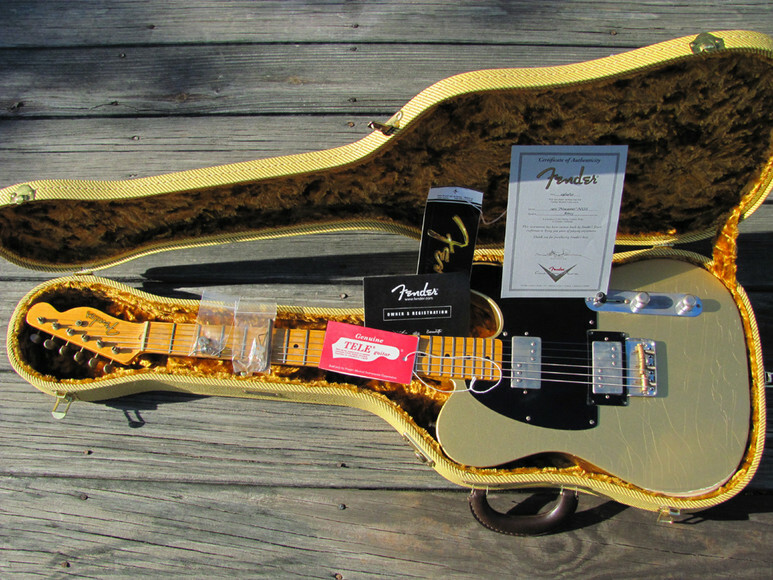 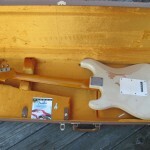 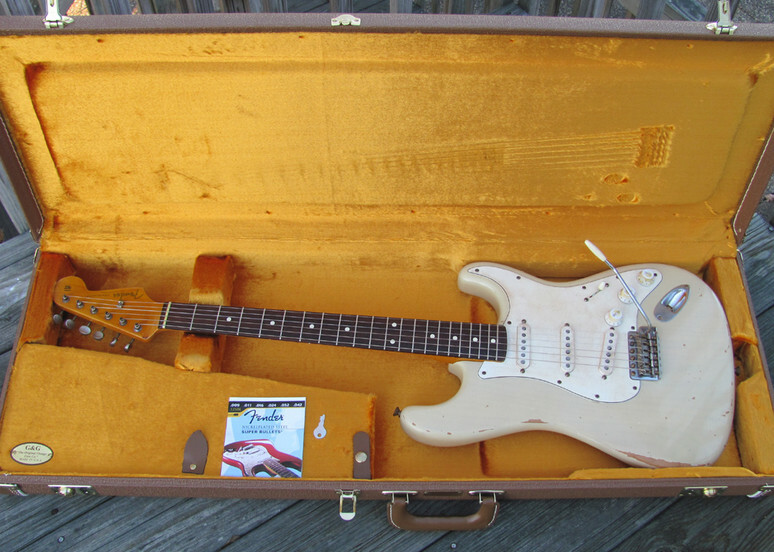 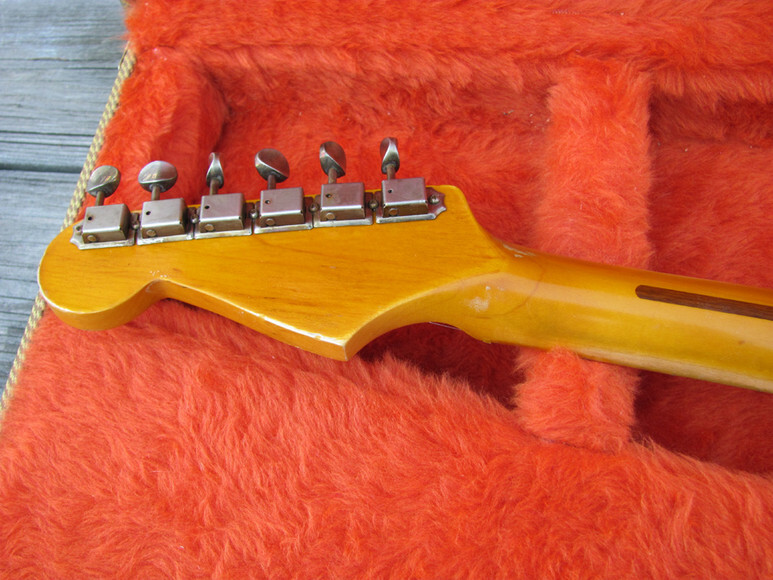 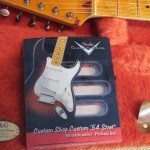 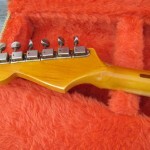 Includes a Fender vintage reissue hardshell case (key included) and original box for pickups. 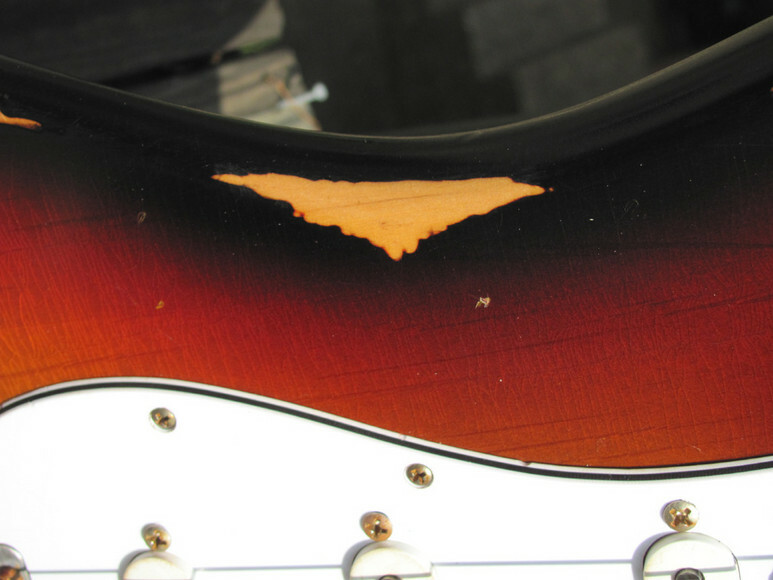 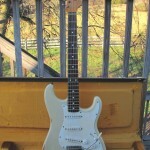 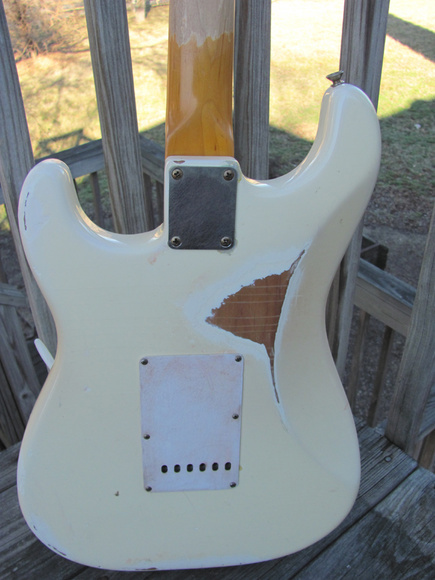 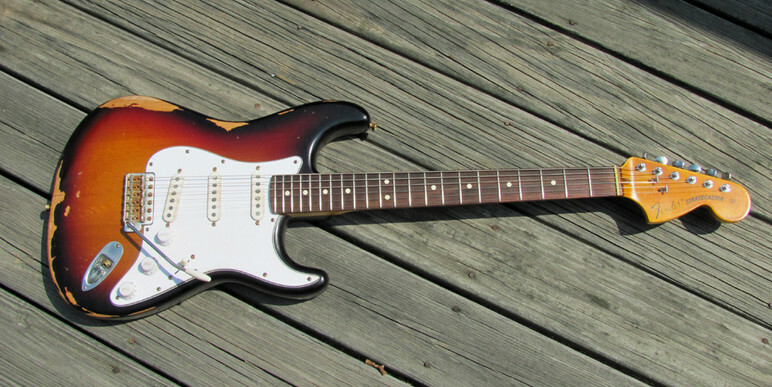 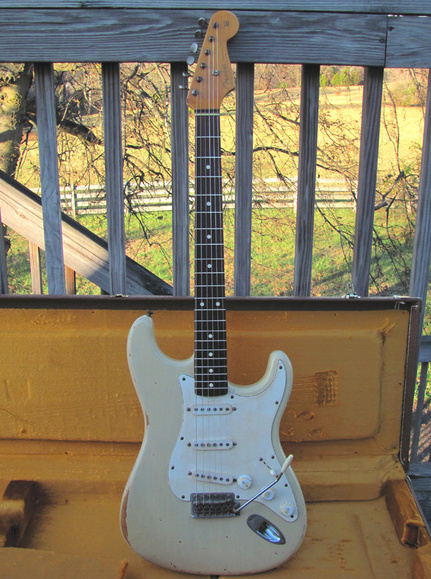 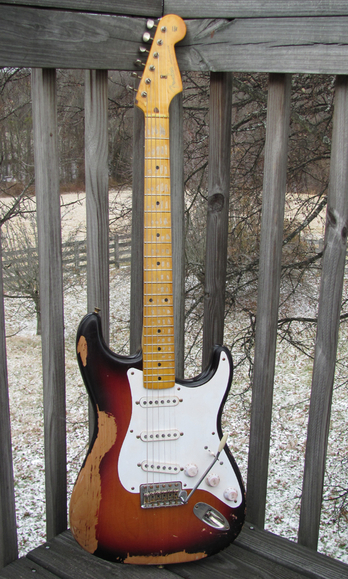 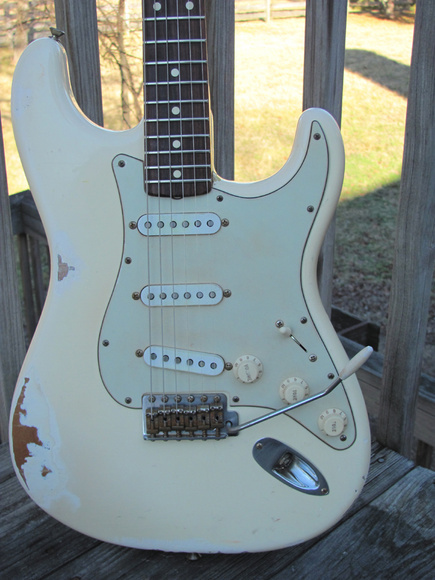 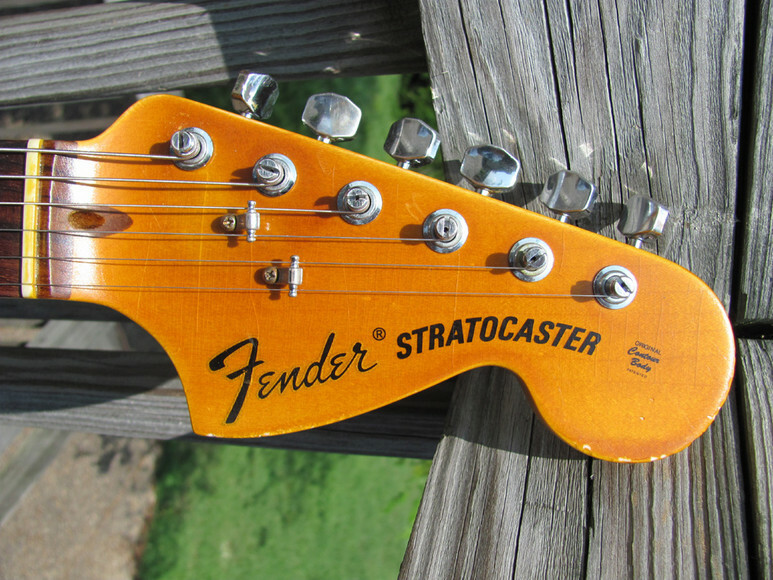 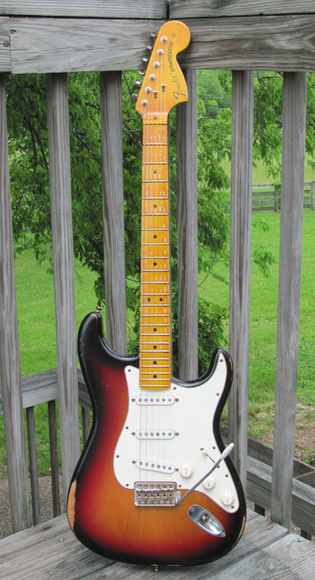 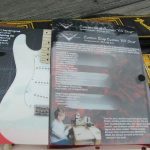 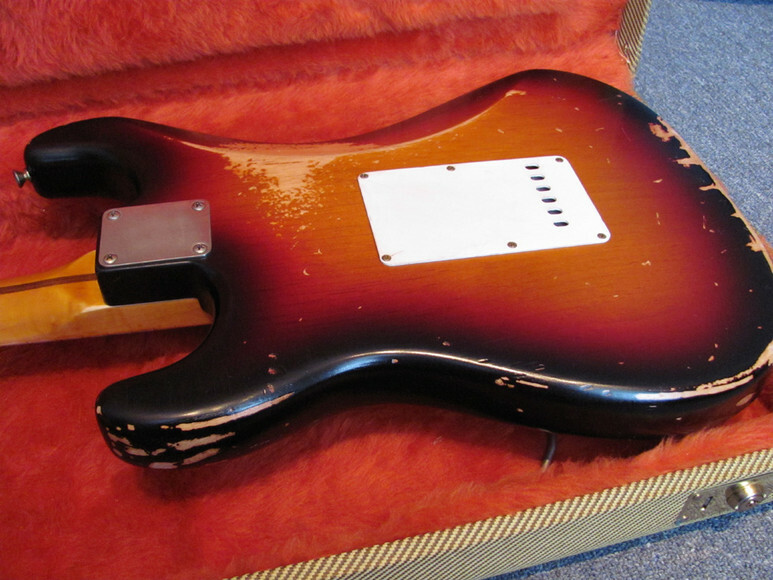 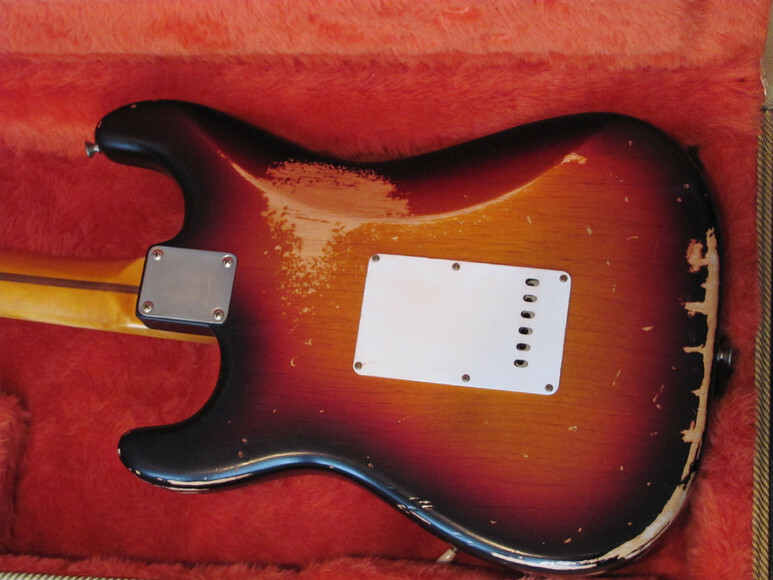 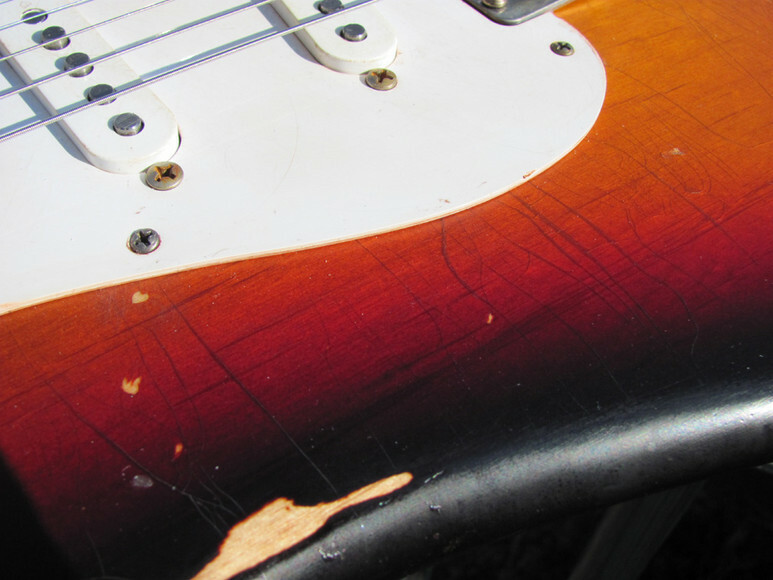 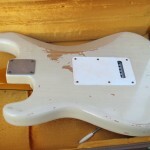 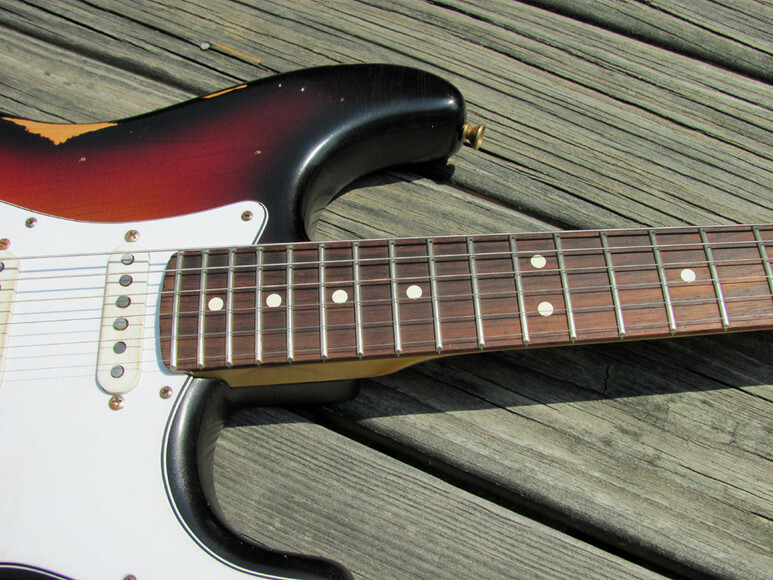 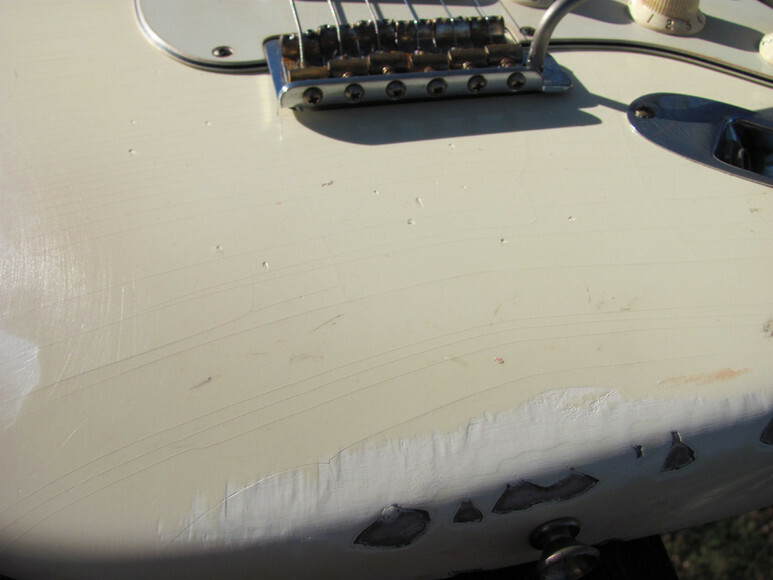 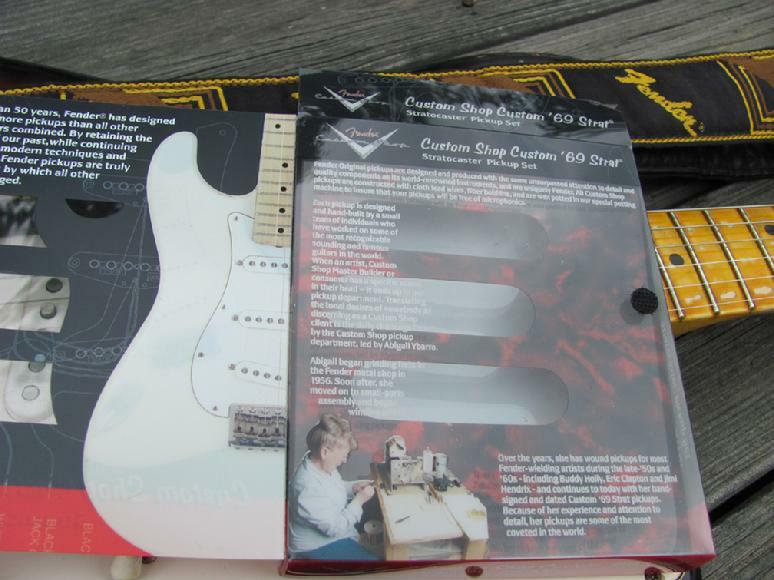 This started as a new 2009 Fender USA Stratocaster (serial # begins with Z9). 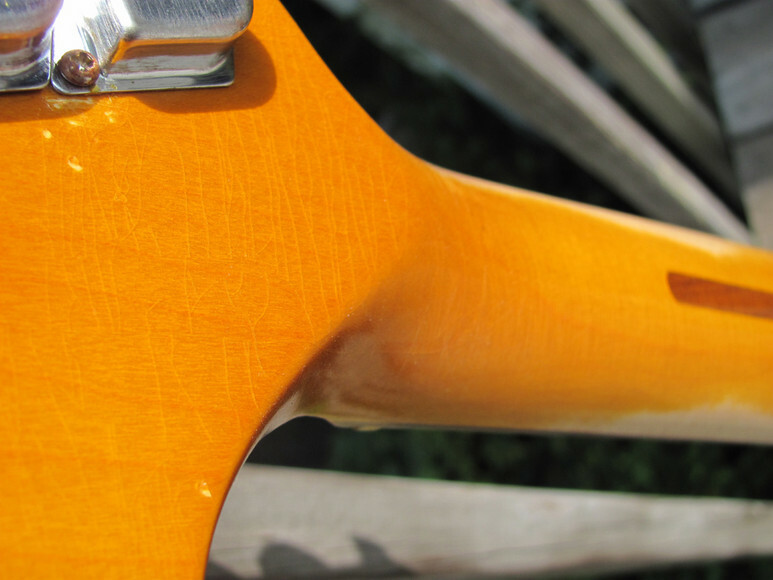 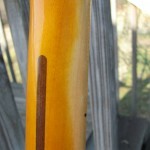 The sunburst body is finished in thin nitro; the neck is finished with thin vintage tinted nitro. 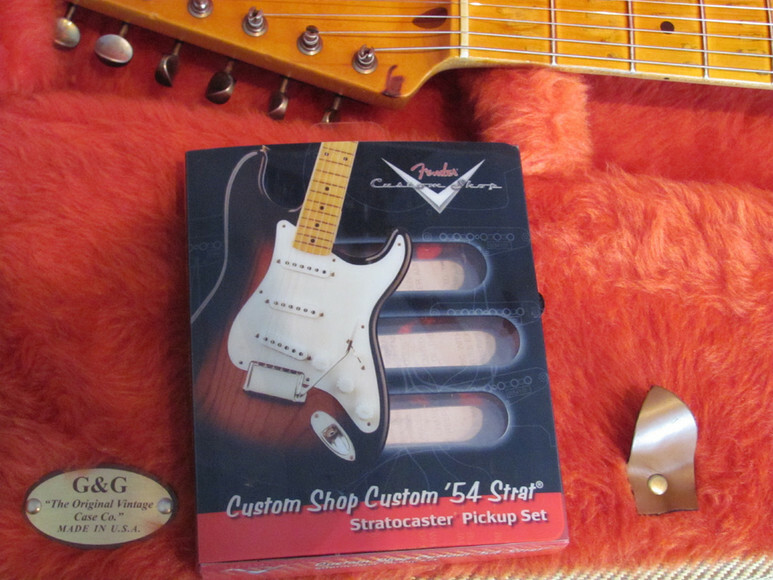 The pickups are Fender Custom Shop ’69 Strat initialed and dated by Abigail Ybarra (incredible sounding pickups! 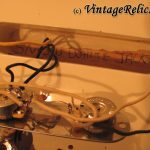 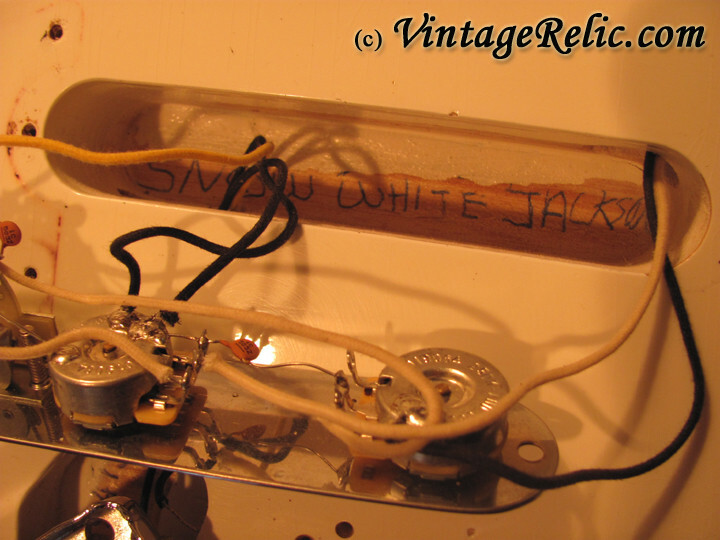 ); wiring harness and switch are Fender USA Vintage Reissue (all cloth). 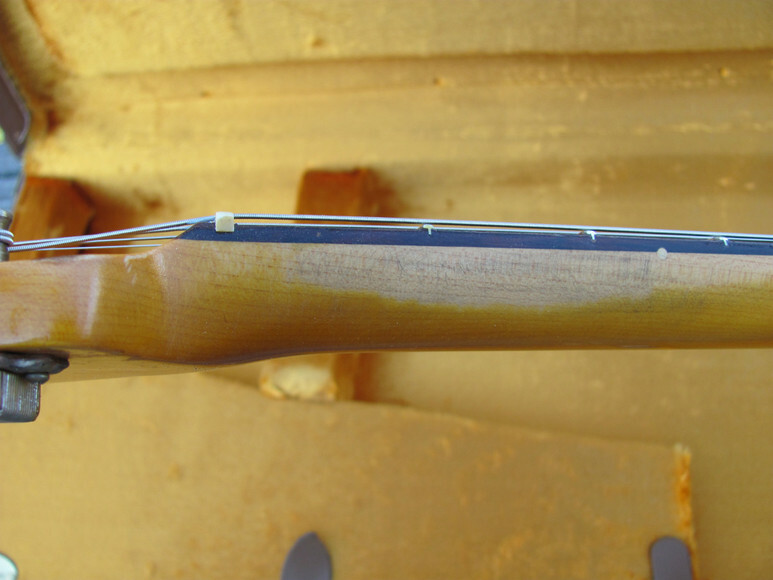 A great sounding guitar and lightweight at 7.56 lbs. 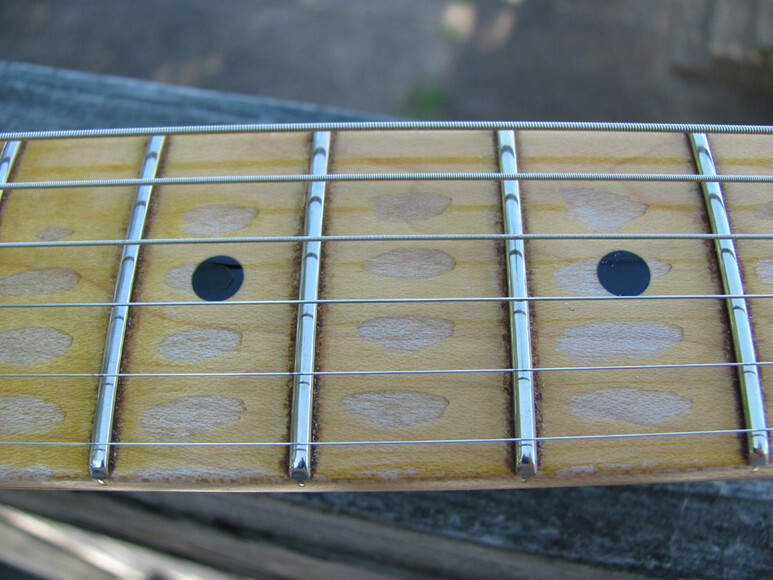 Alder body; maple neck (C shaped) and fretboard (9.5' radius) with medium-jumbo frets. 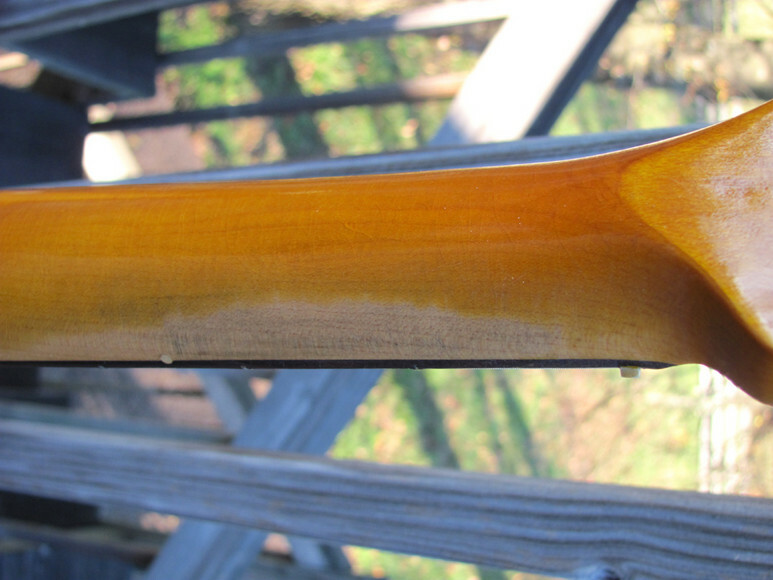 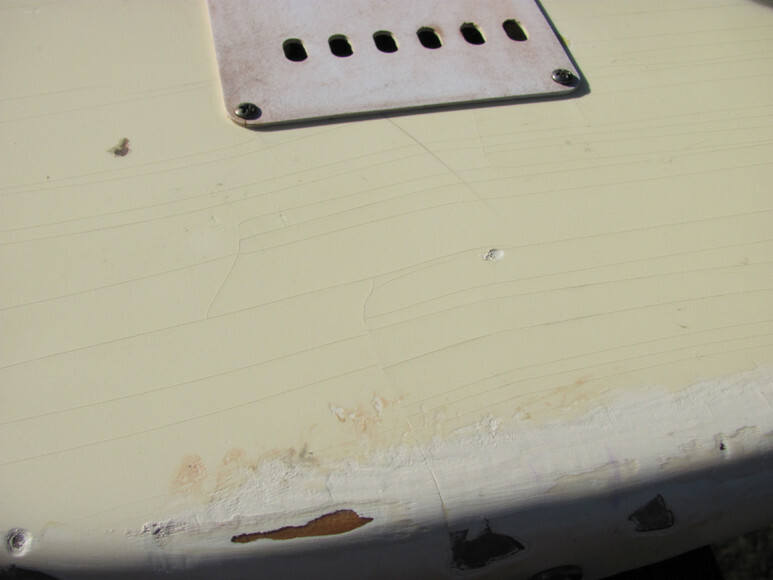 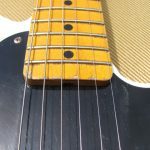 Moderate to heavy relicing with 'weather' (lacquer) checking throughout the body, fretboard and headstock; heavy finish wear on fretboard; all plastic and hardware also aged. 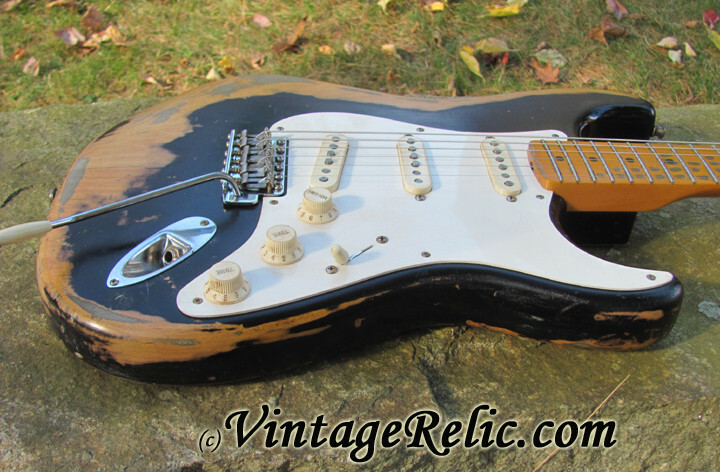 Looks and feels like a heavily played vintage Strat! 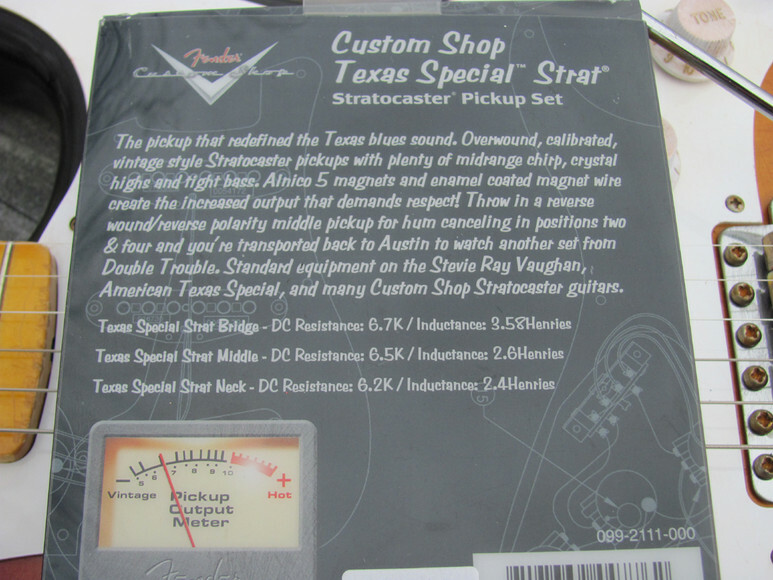 Set up with D'Addario EXL110 strings (.010-.046). 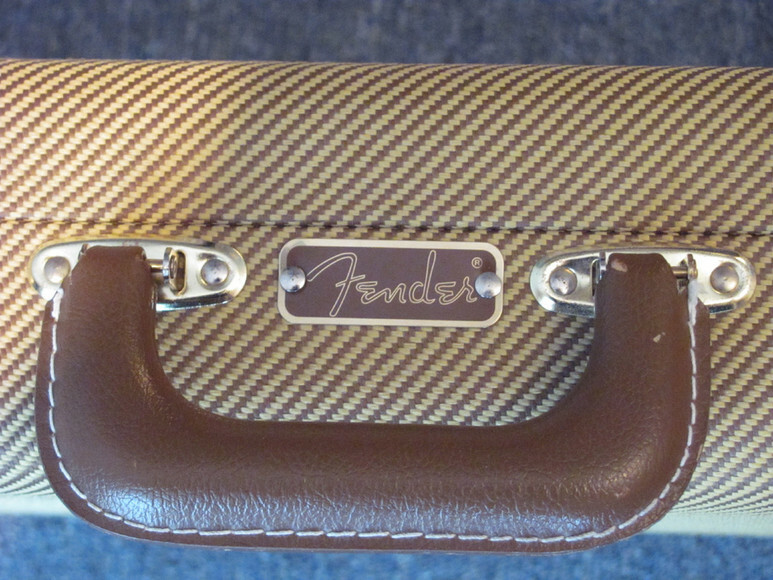 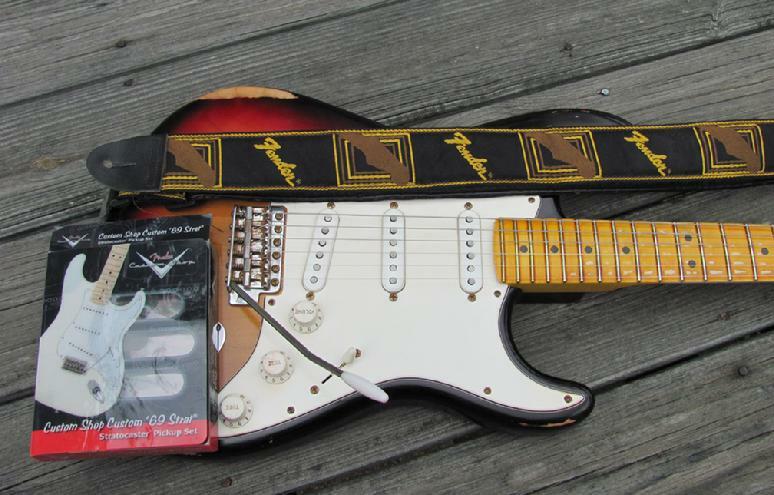 Includes a new Fender hardshell SKB case (w/key, TSA locks) and Fender USA strap (and original box for pickups). 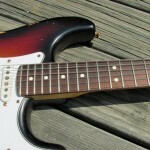 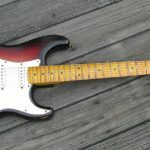 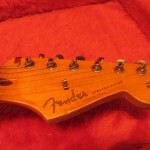 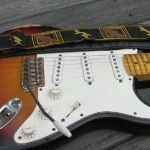 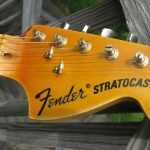 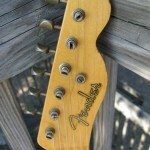 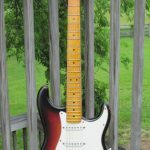 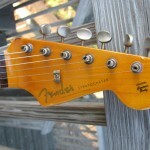 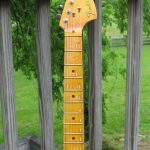 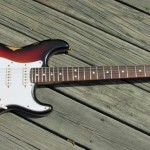 2008 Fender USA Stratocaster Vintage Relic “TexBurst”. 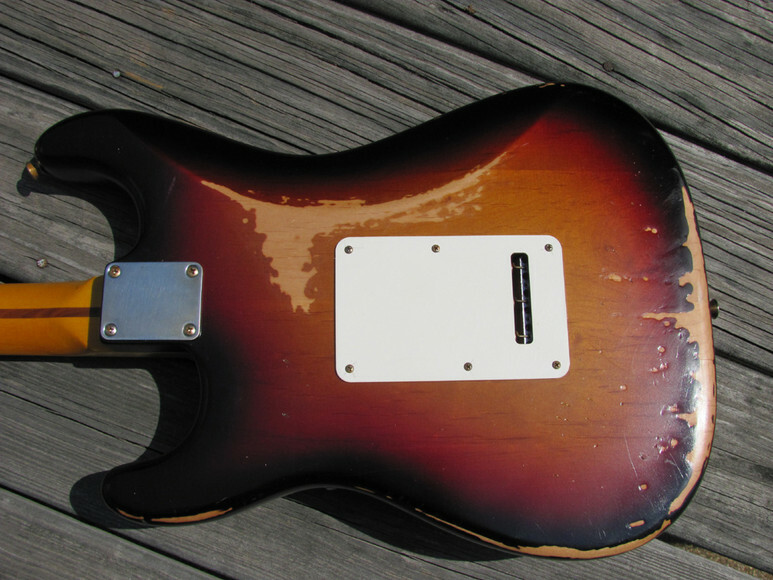 The body is finished in thin nitro; the neck is finished with thin vintage tinted nitro. 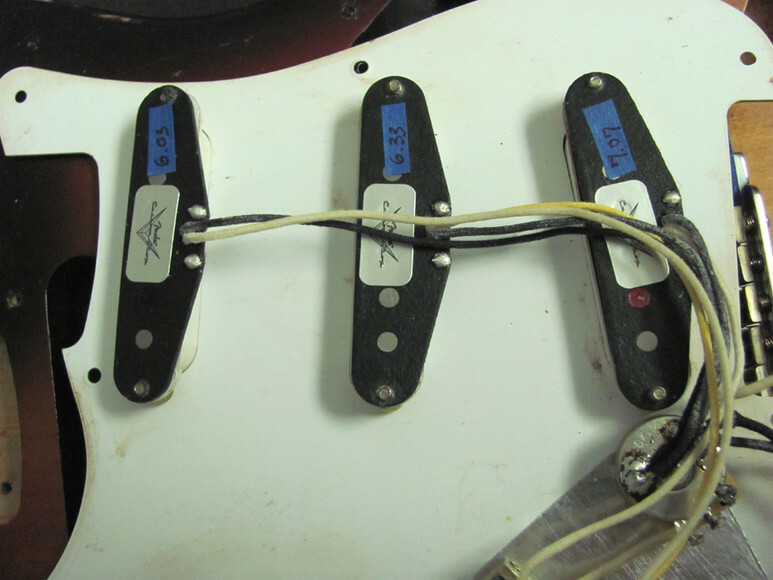 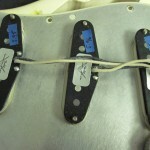 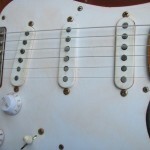 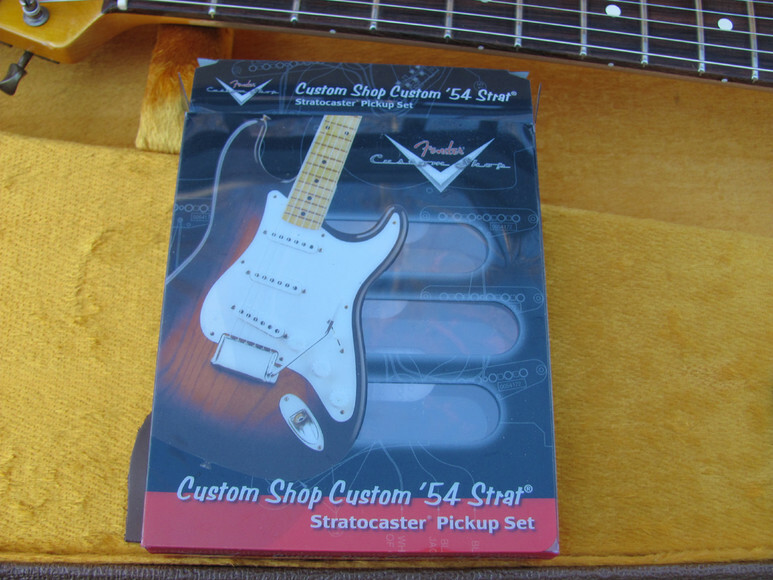 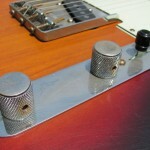 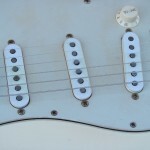 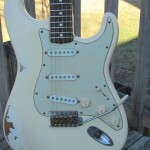 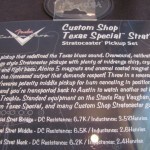 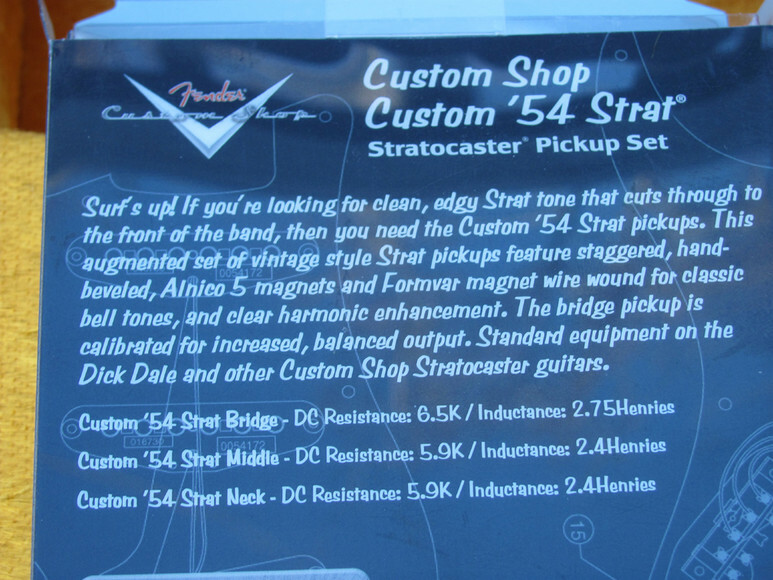 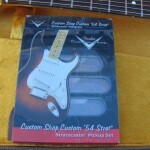 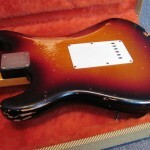 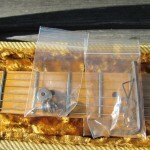 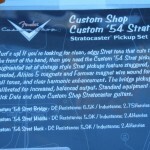 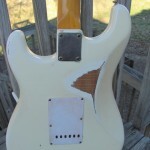 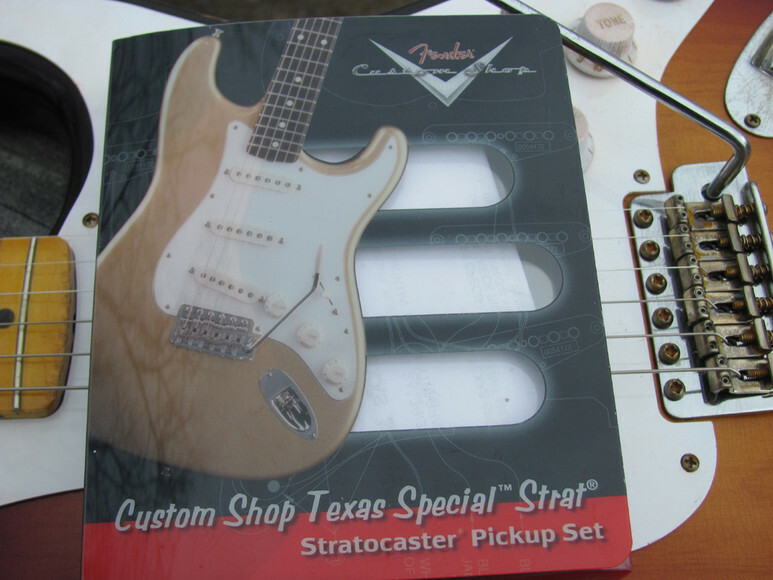 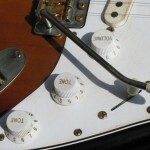 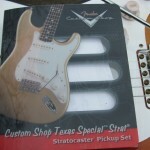 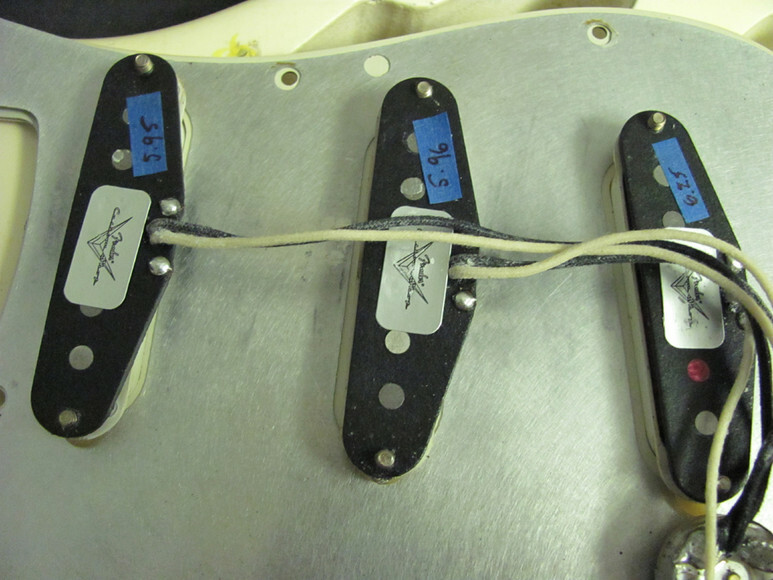 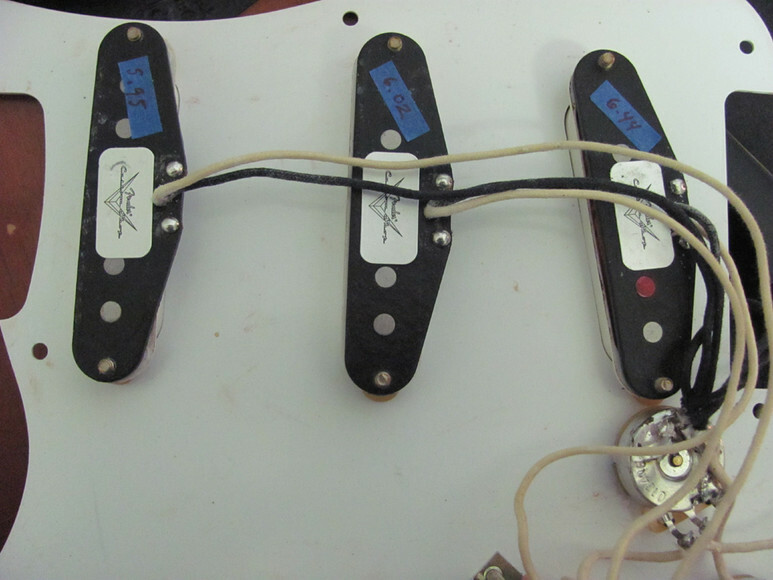 The pickups are Fender Custom Shop Texas Specials; wiring harness and switch are Fender USA. 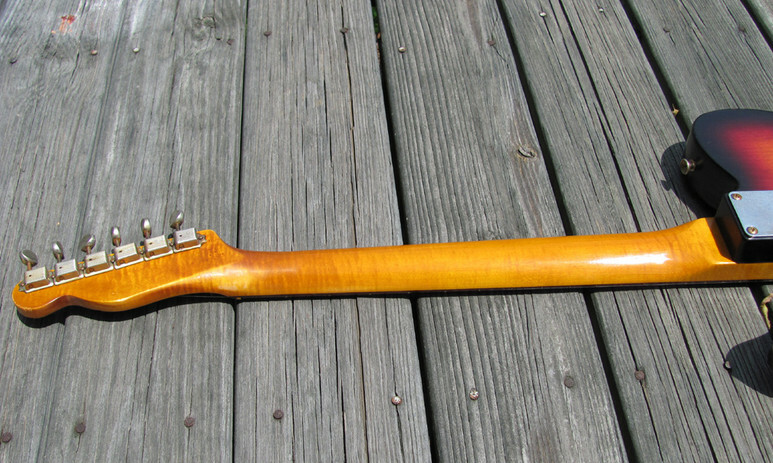 A great sounding guitar and lightweight at only 7.62 lbs. 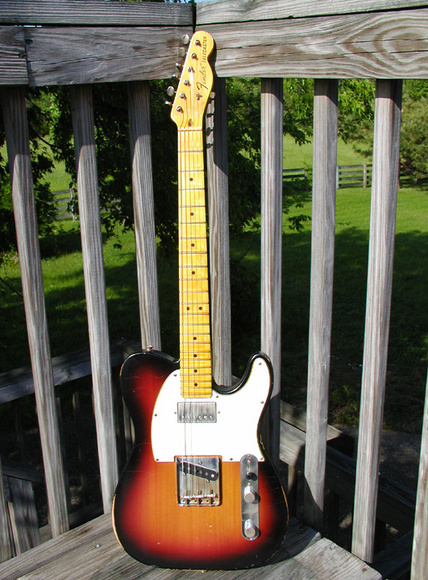 Fender USA Sunburst alder body with a USA large headstock maple neck with rosewood fretboard (9.5' radius) and medium jumbo frets. 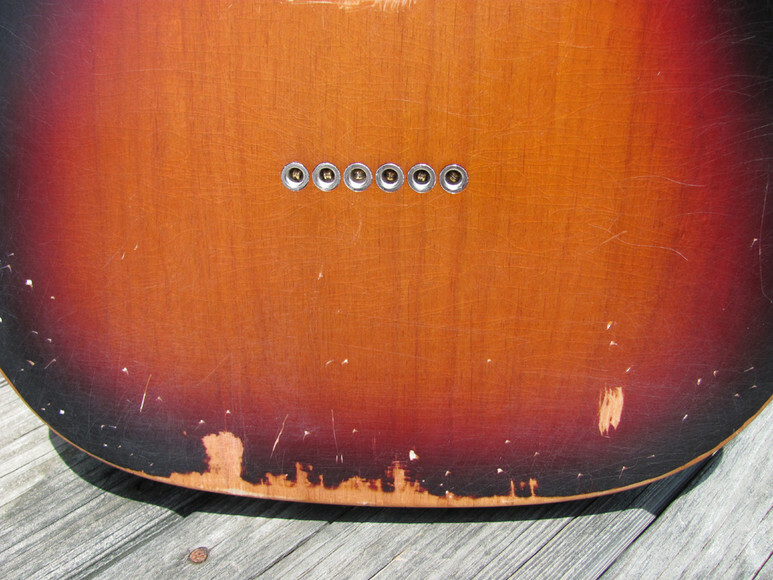 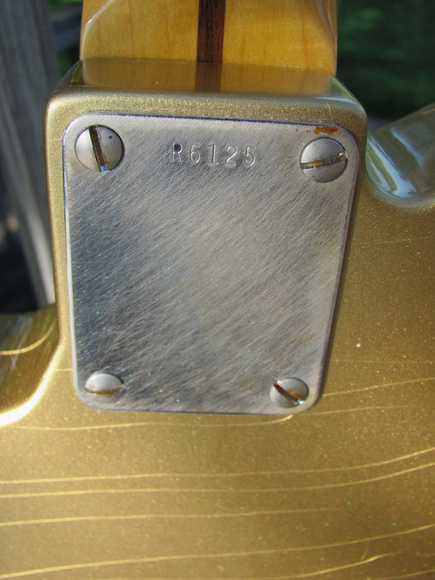 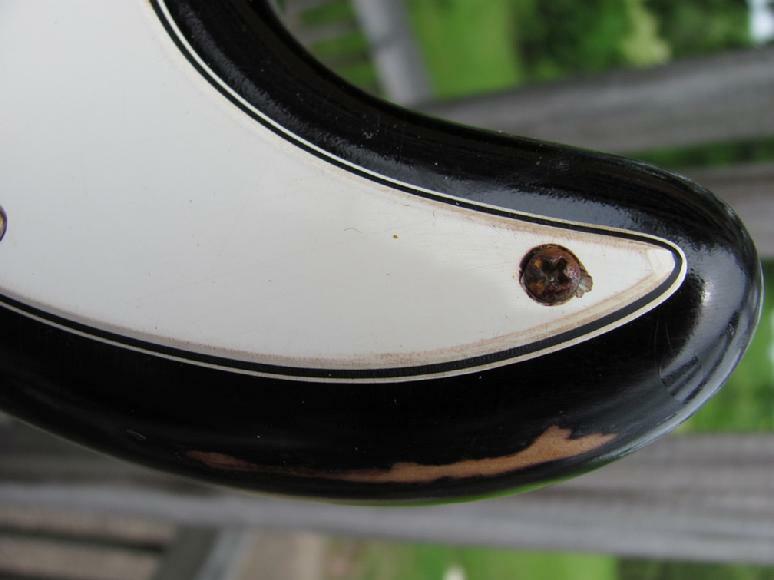 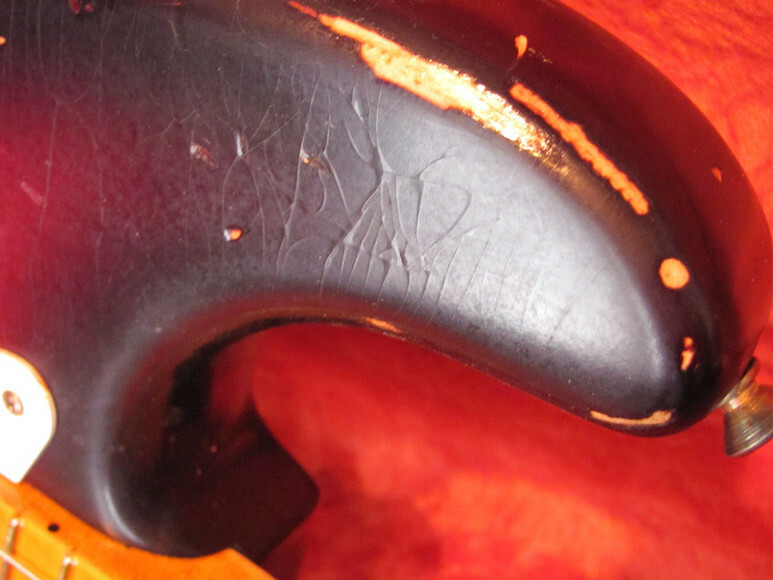 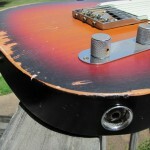 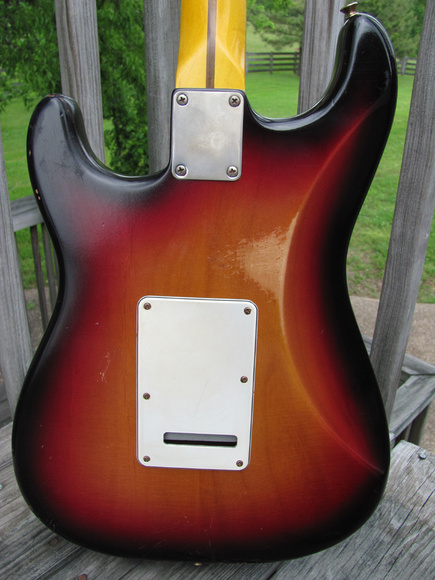 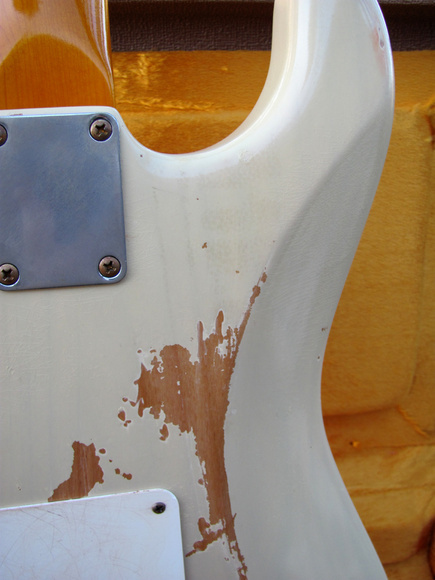 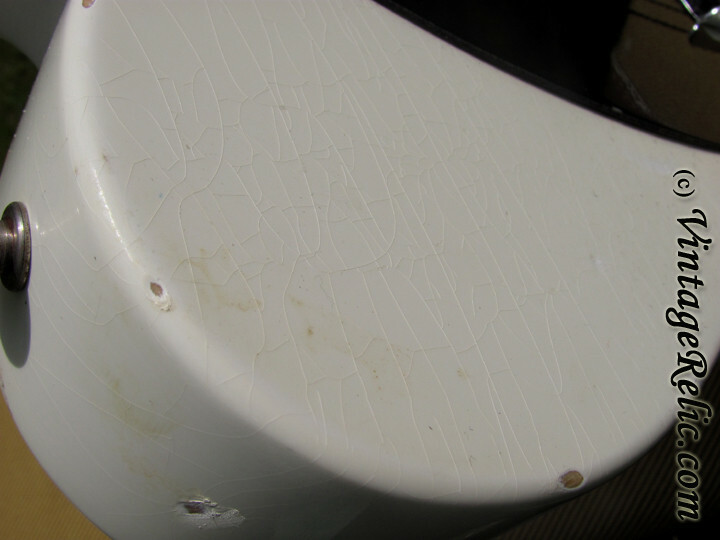 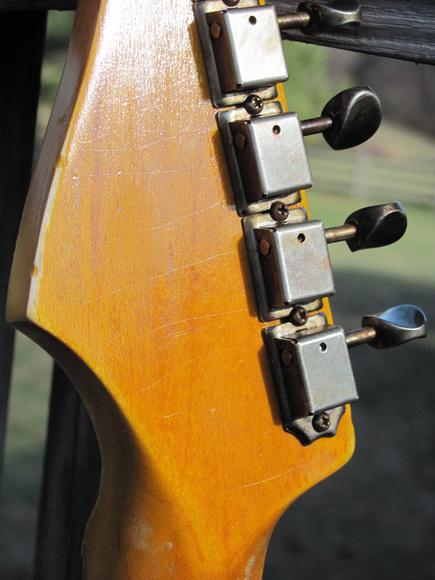 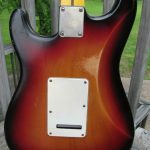 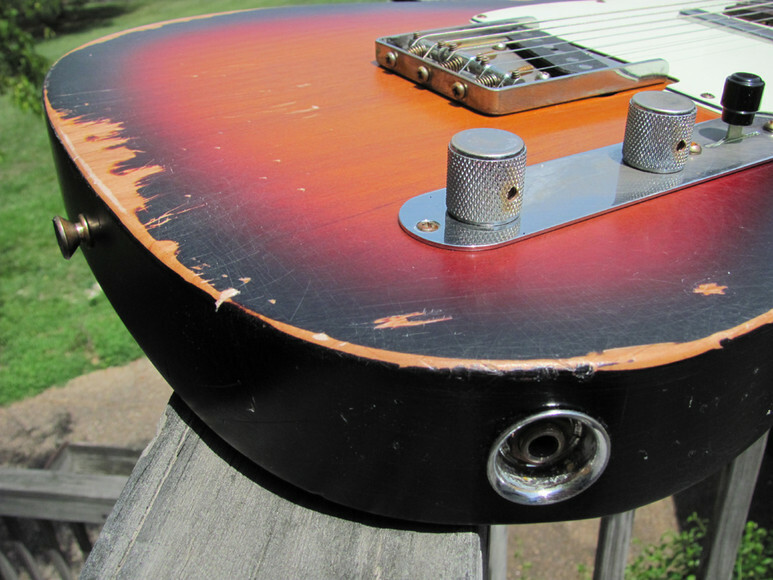 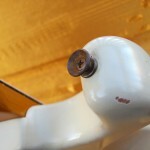 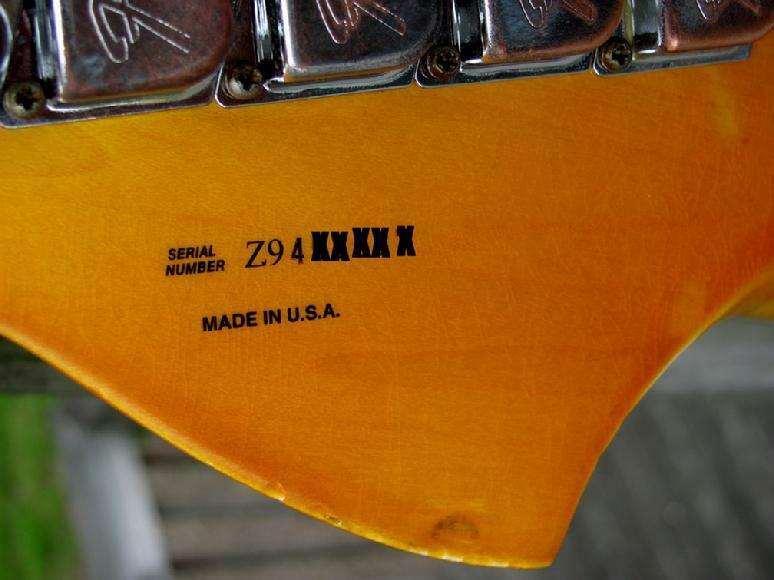 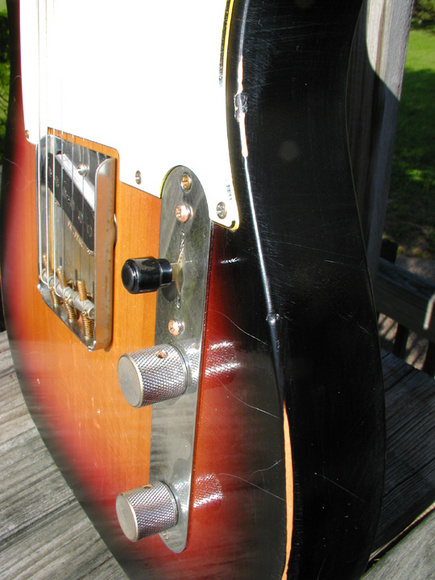 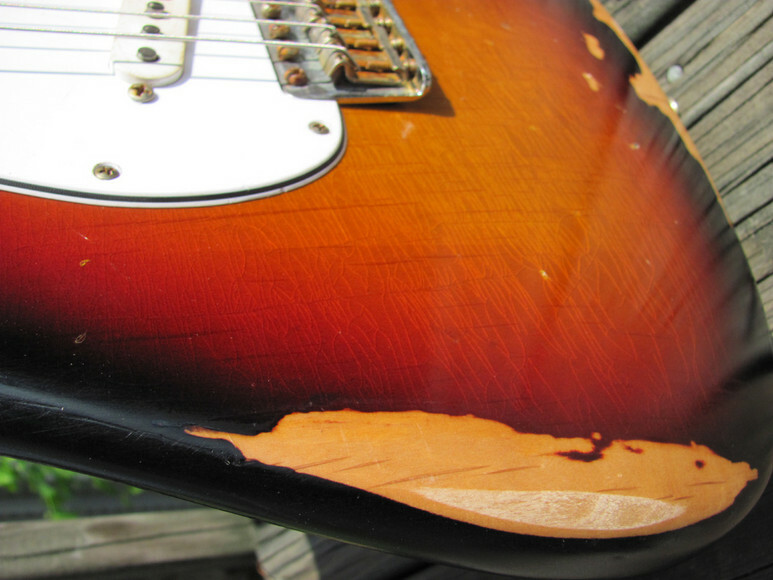 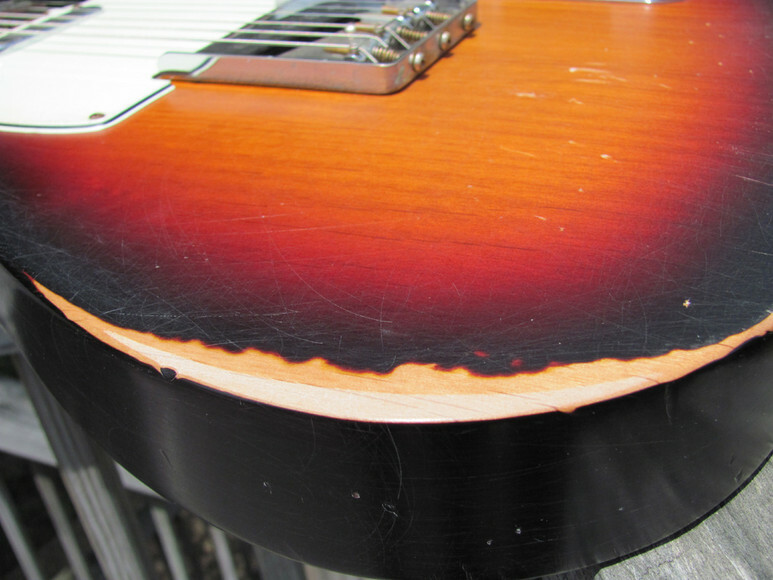 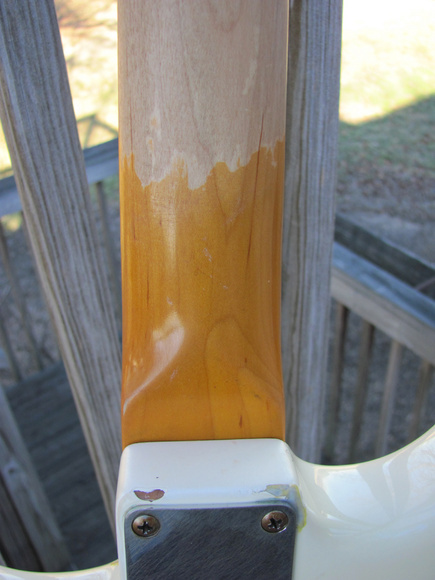 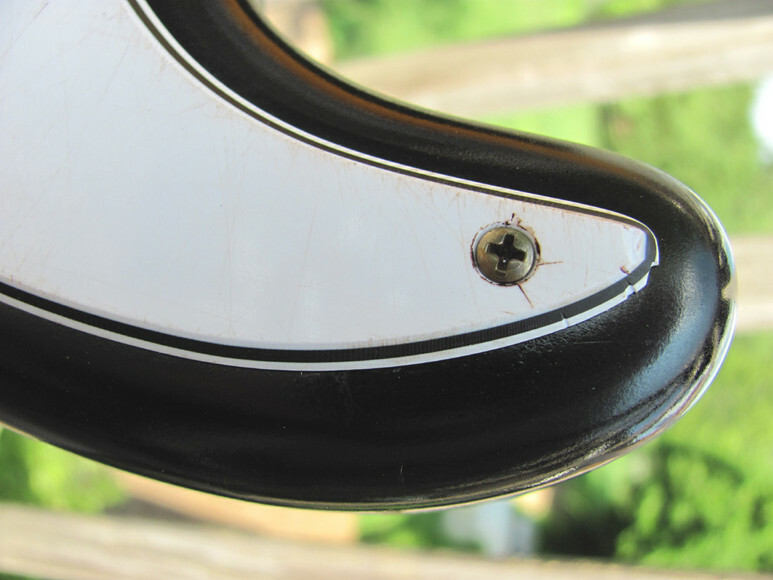 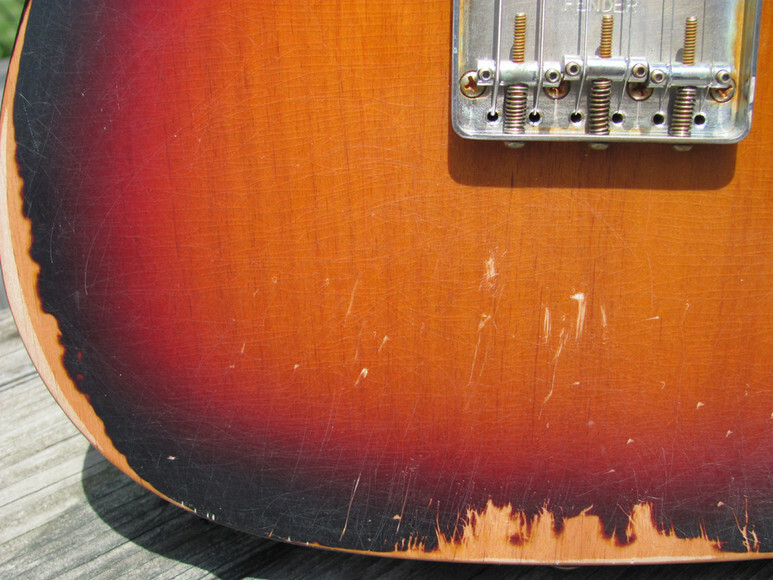 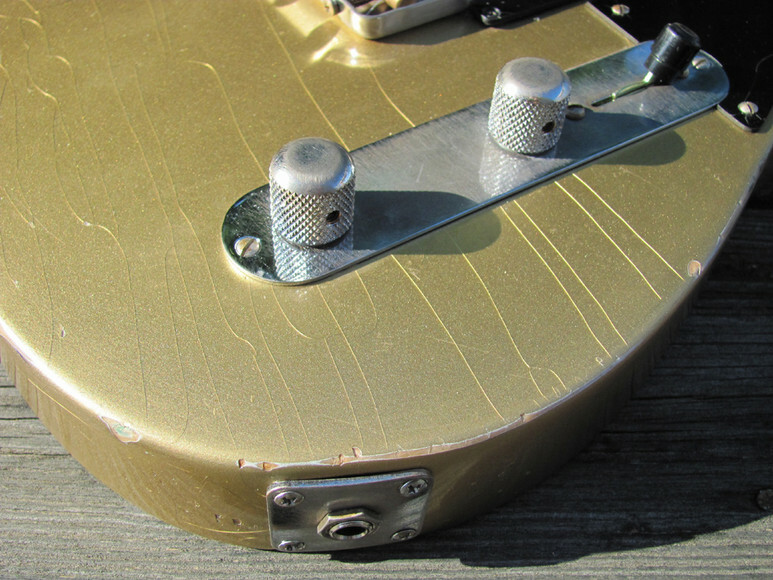 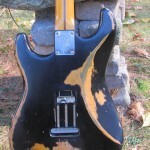 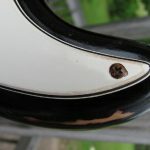 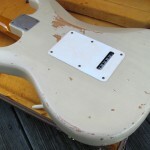 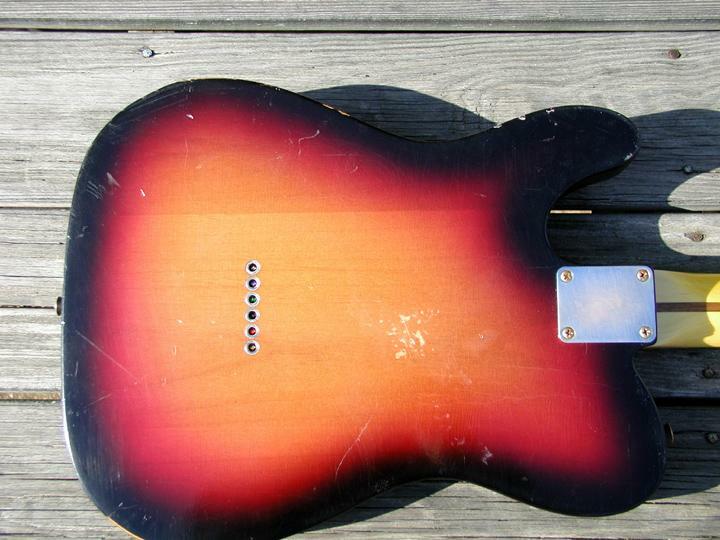 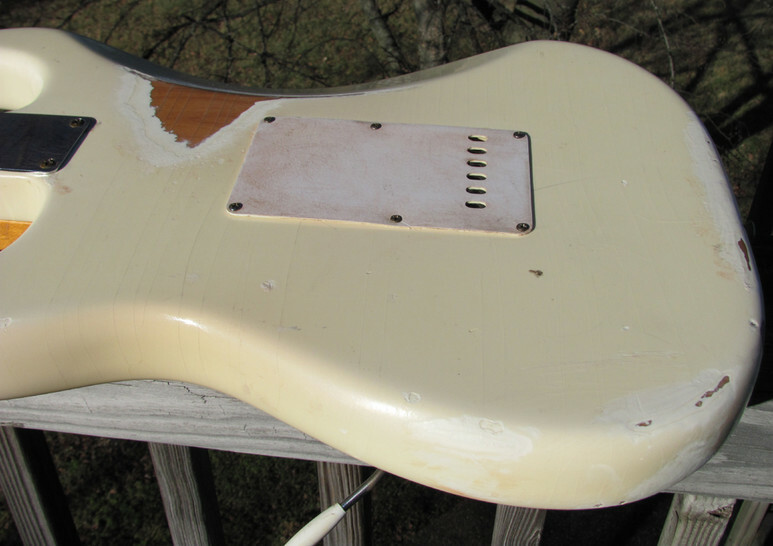 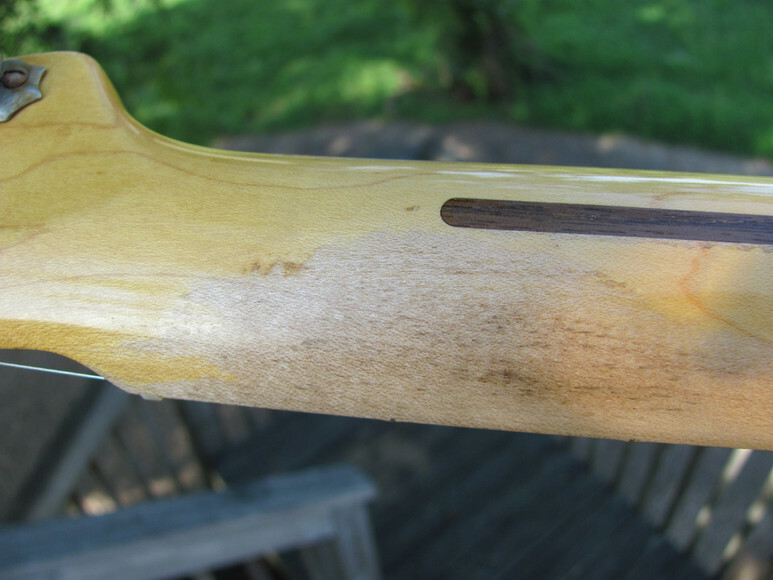 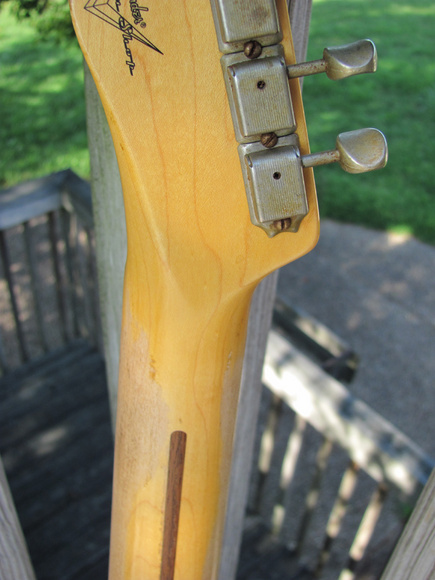 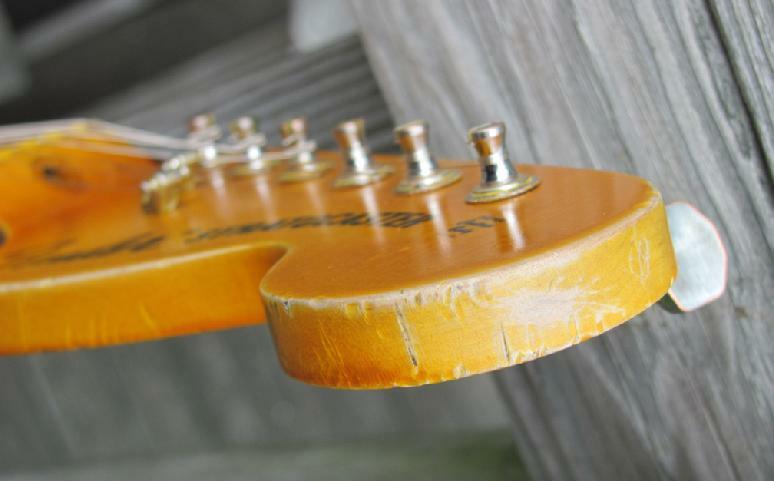 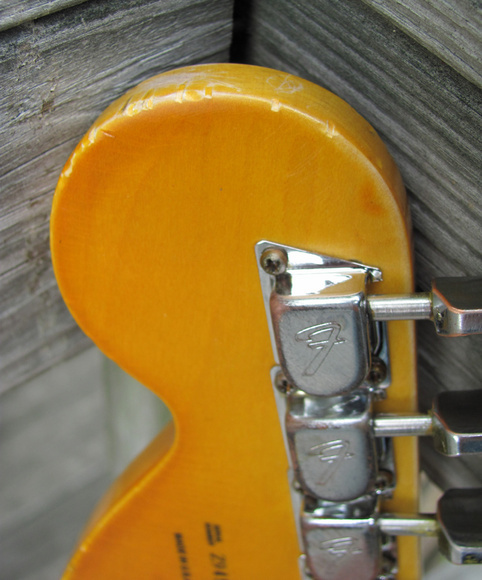 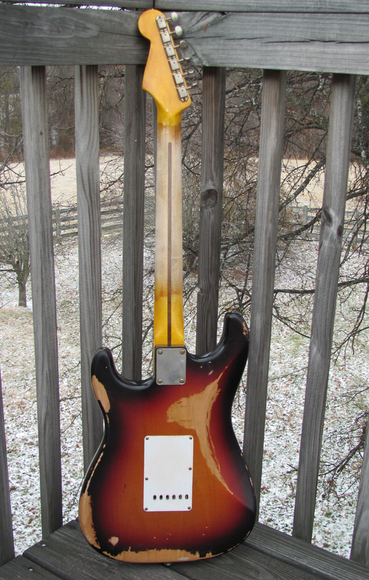 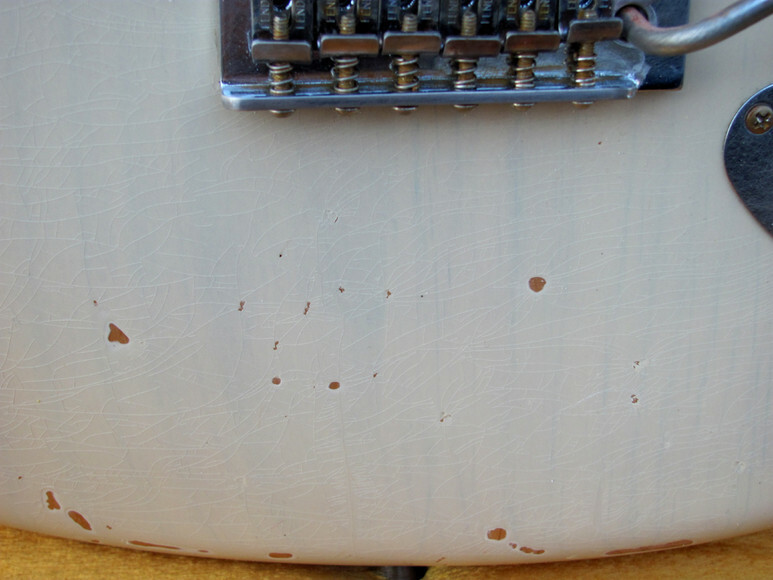 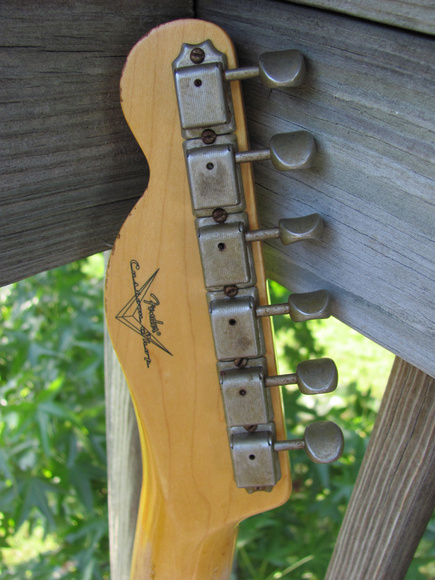 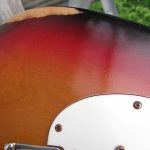 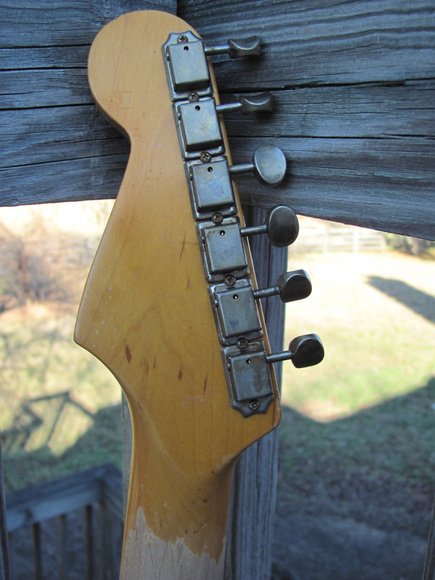 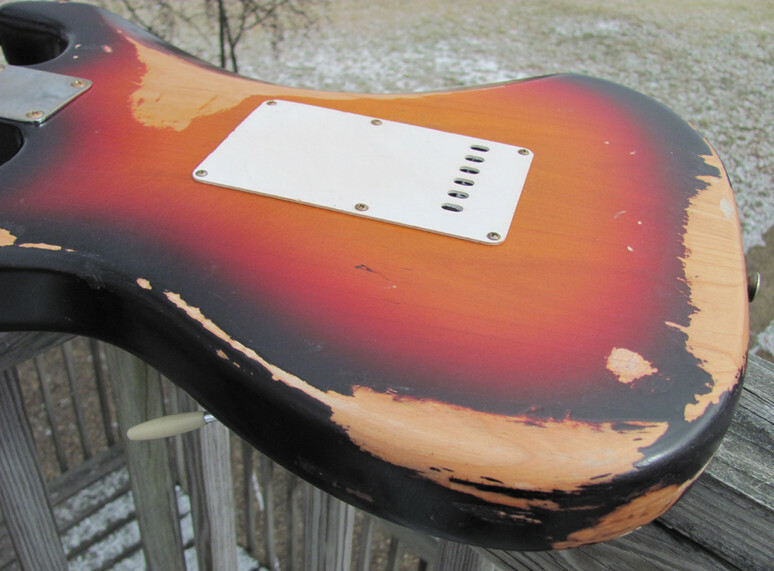 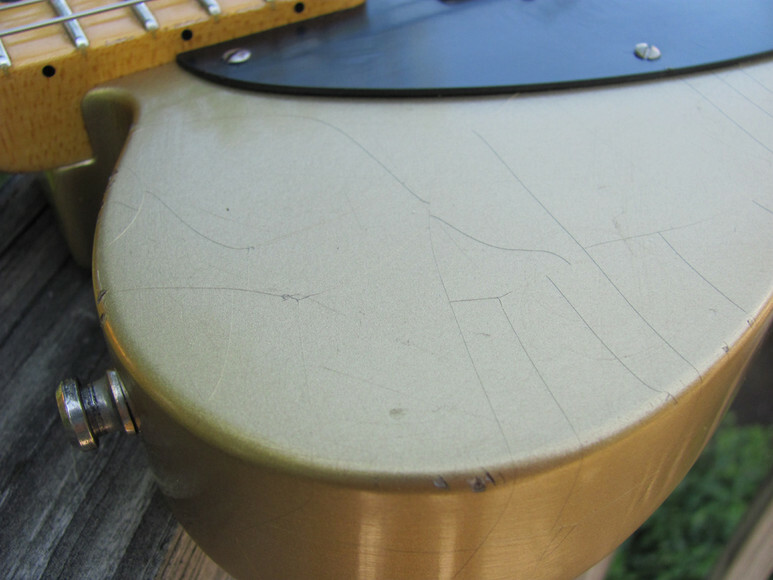 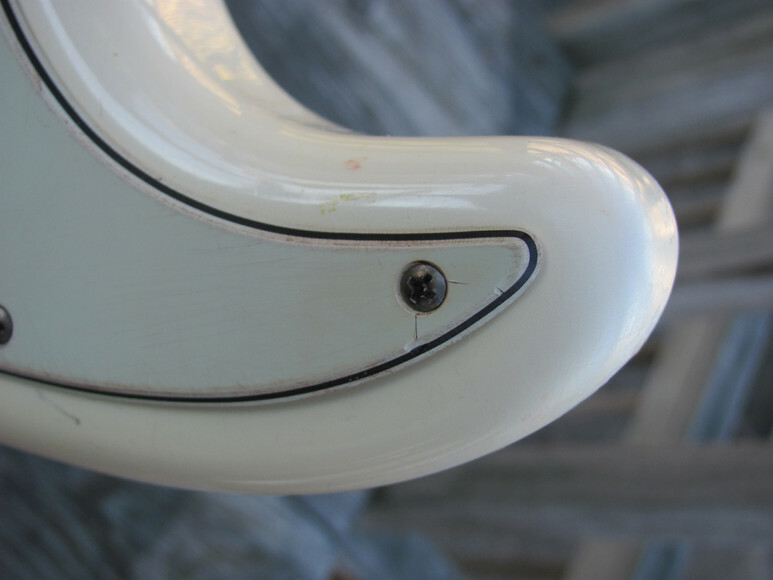 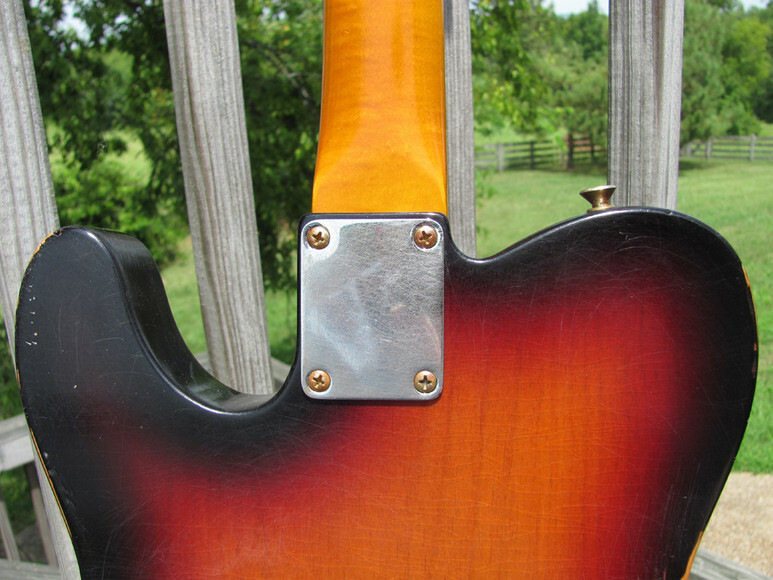 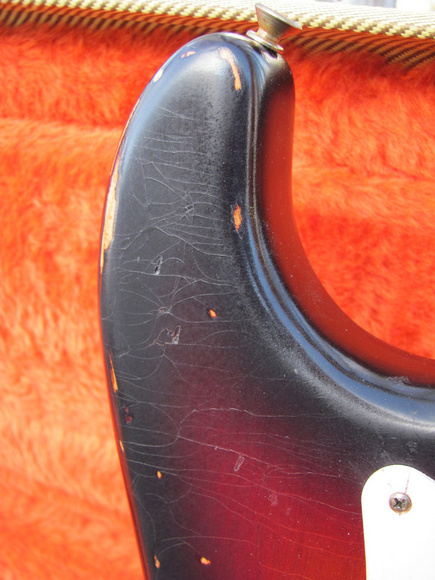 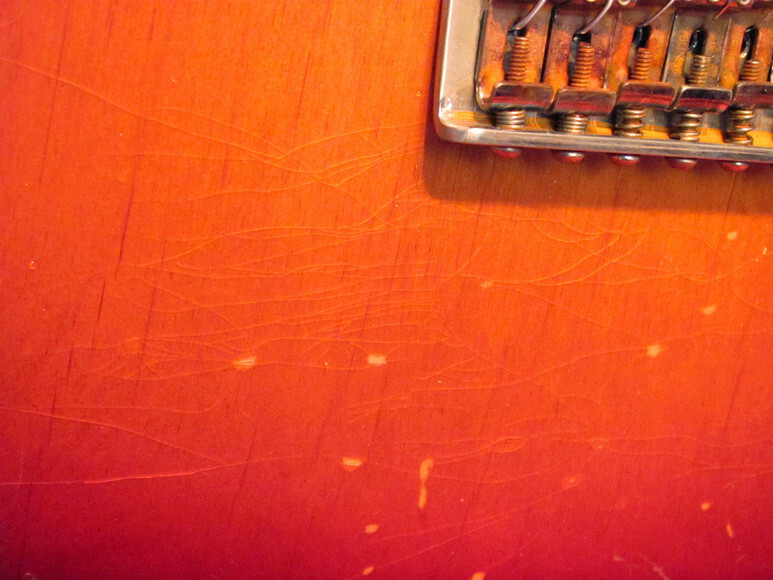 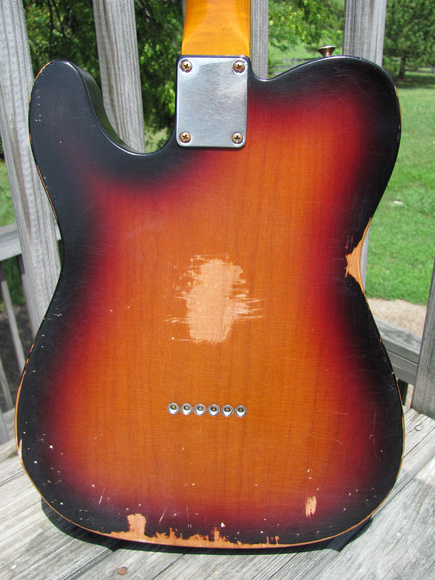 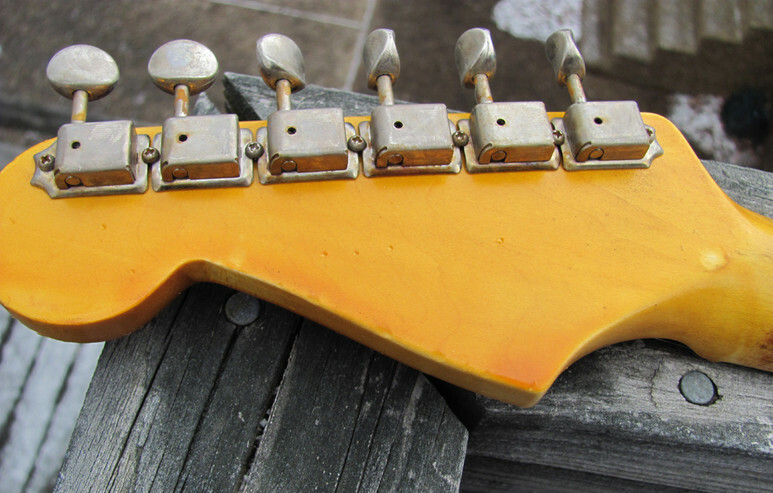 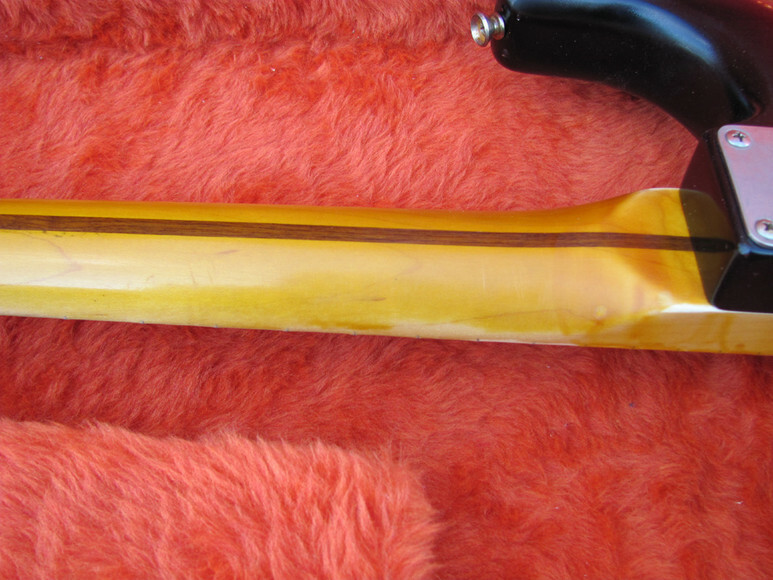 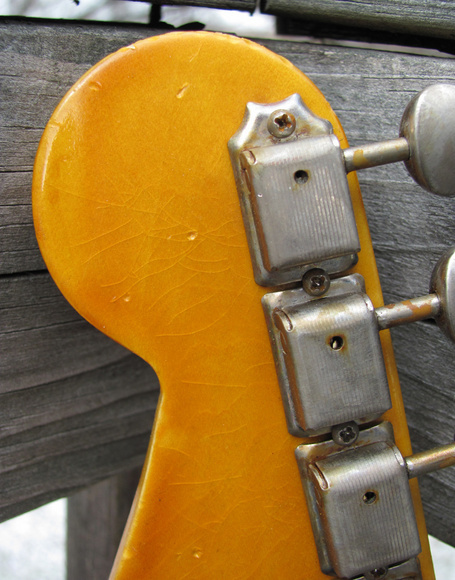 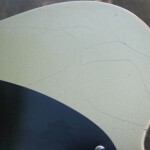 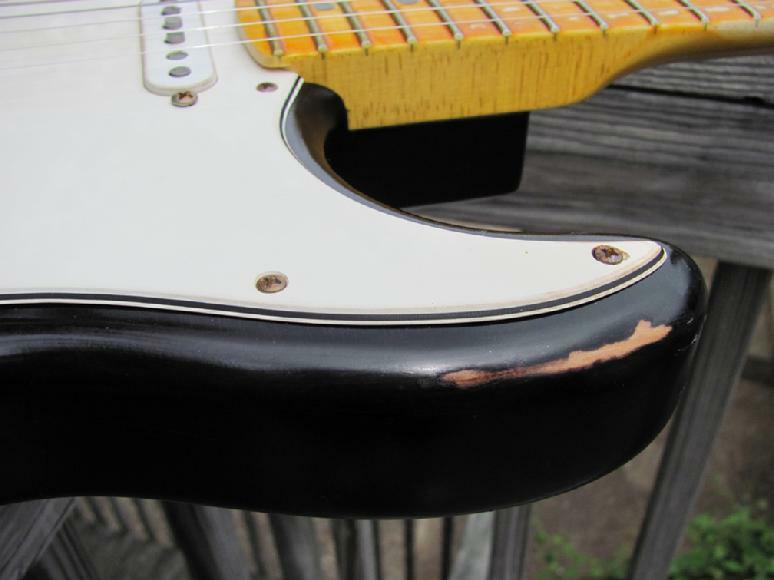 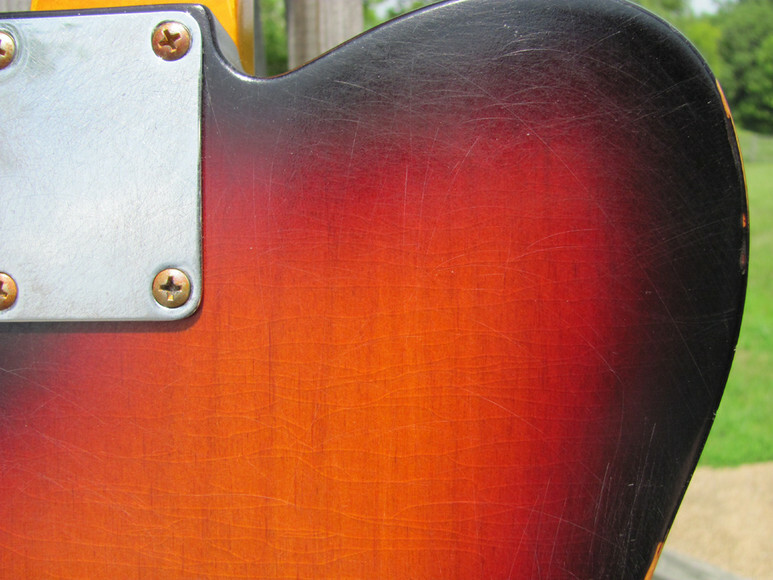 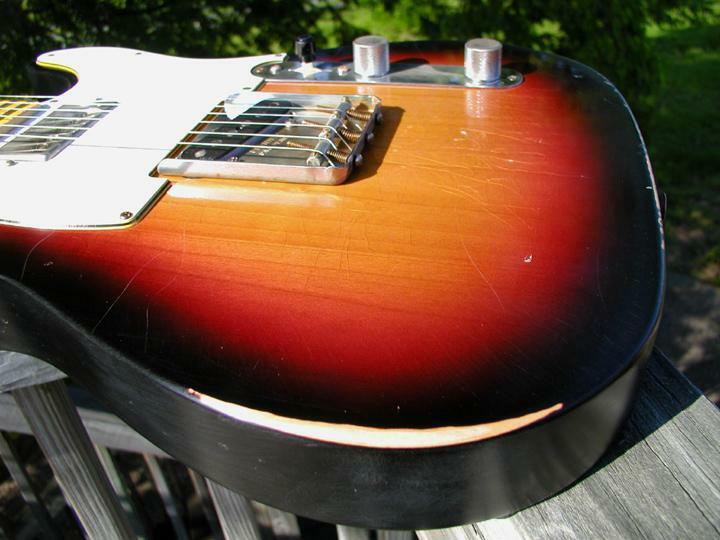 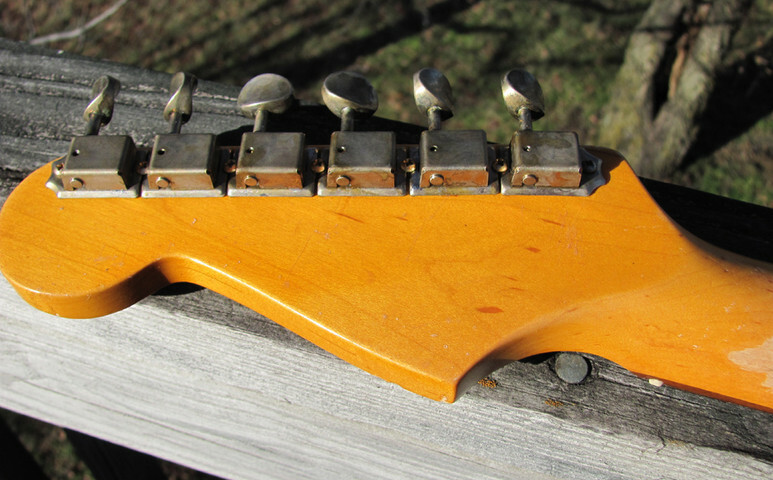 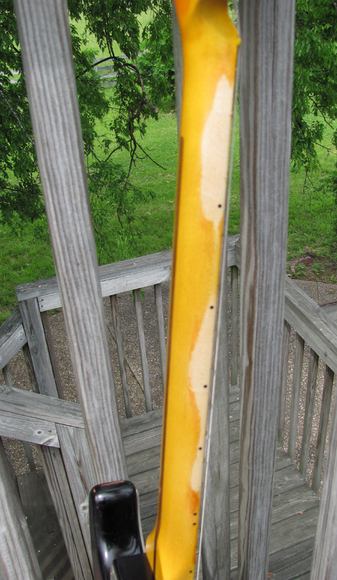 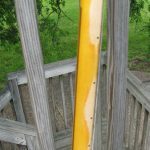 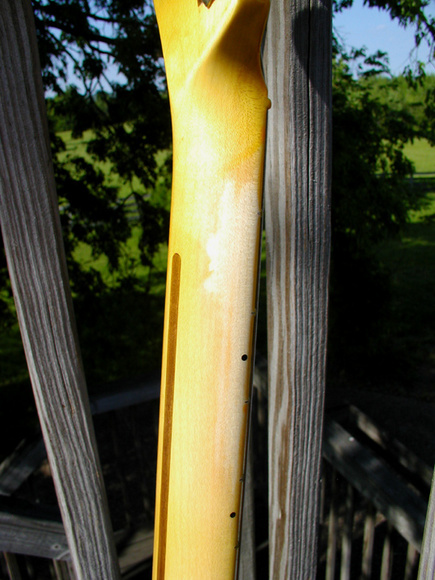 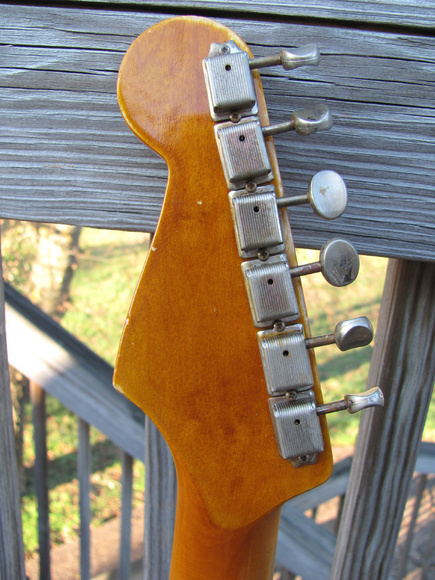 Heavy relicing with 'weather' (lacquer) checking throughout the body, headstock, and neck; dings, scratches, buckle rash, etc; all plastic and hardware also aged. 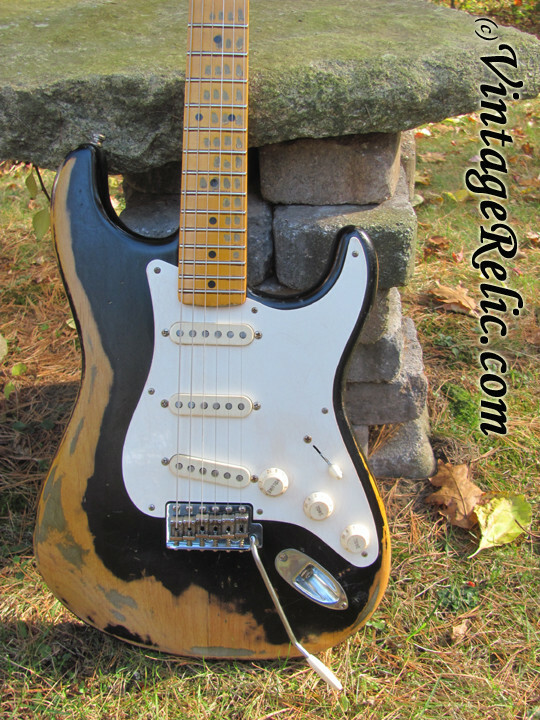 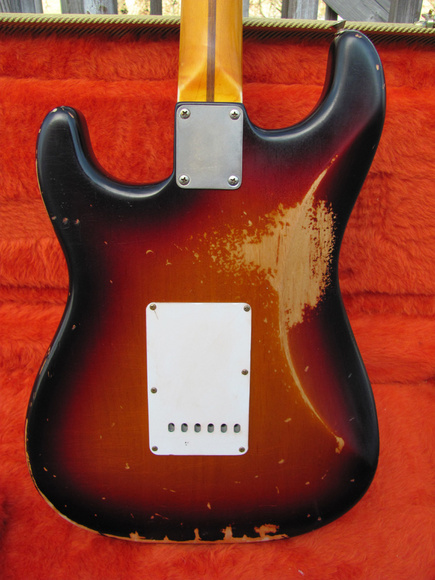 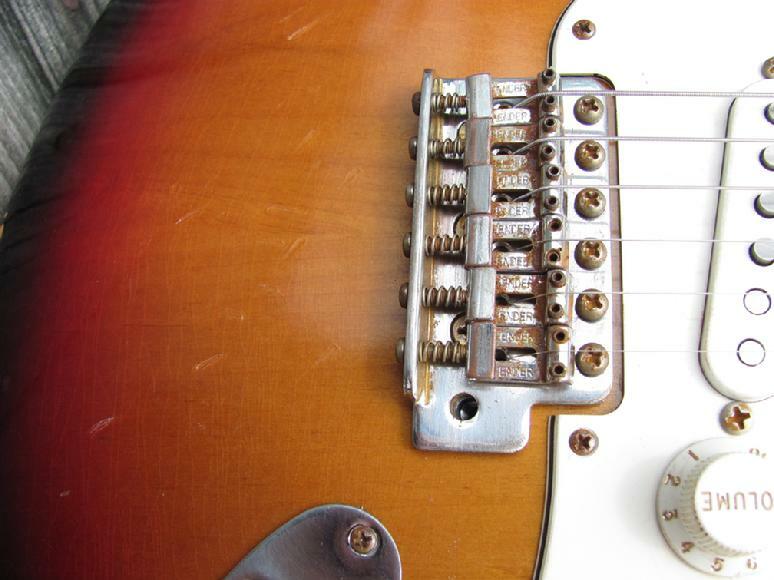 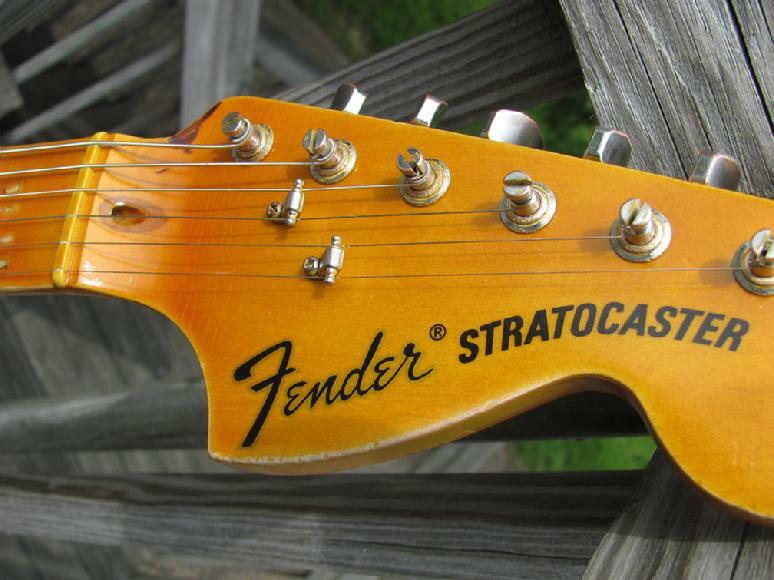 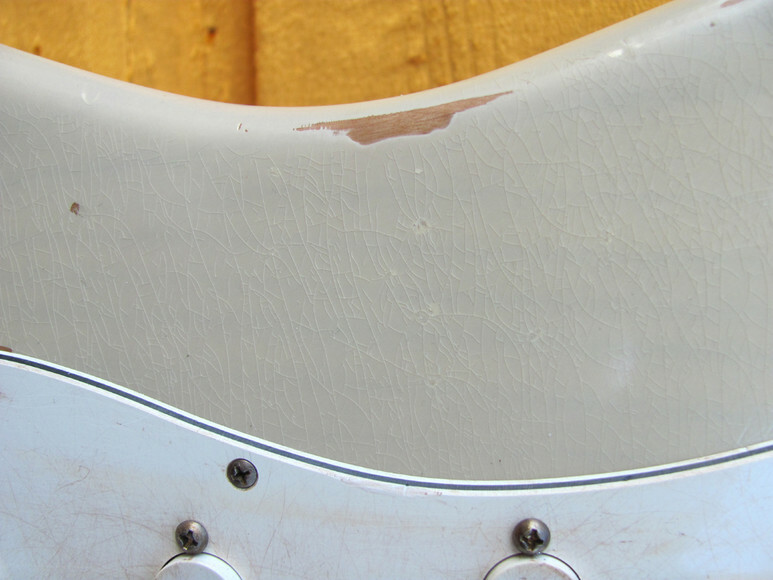 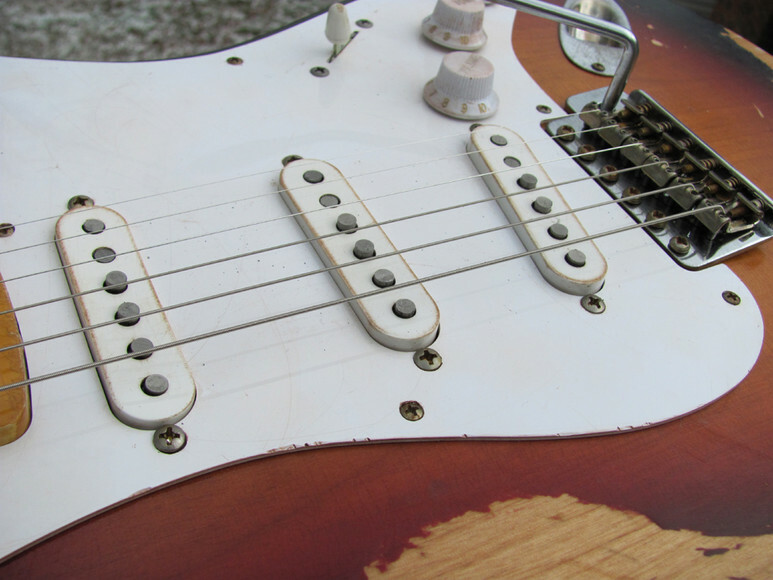 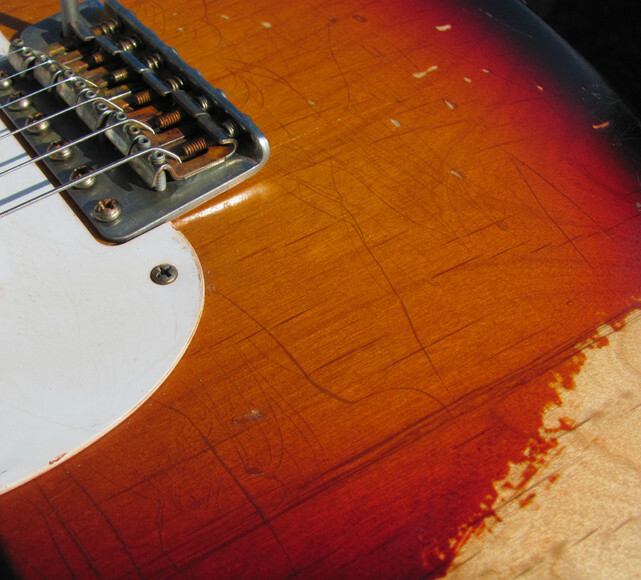 Aged to look and feel like a heavily played vintage Strat! 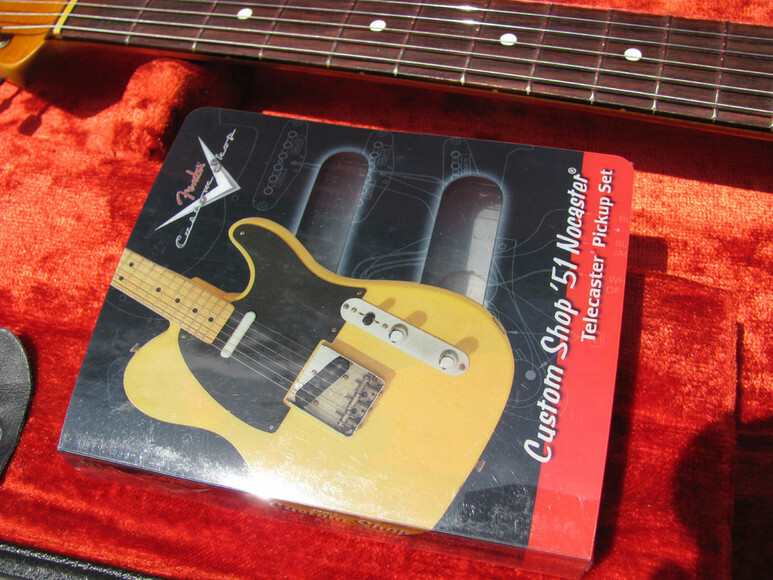 Set up with Ernie Ball Regular Slinky strings (.010-.046). 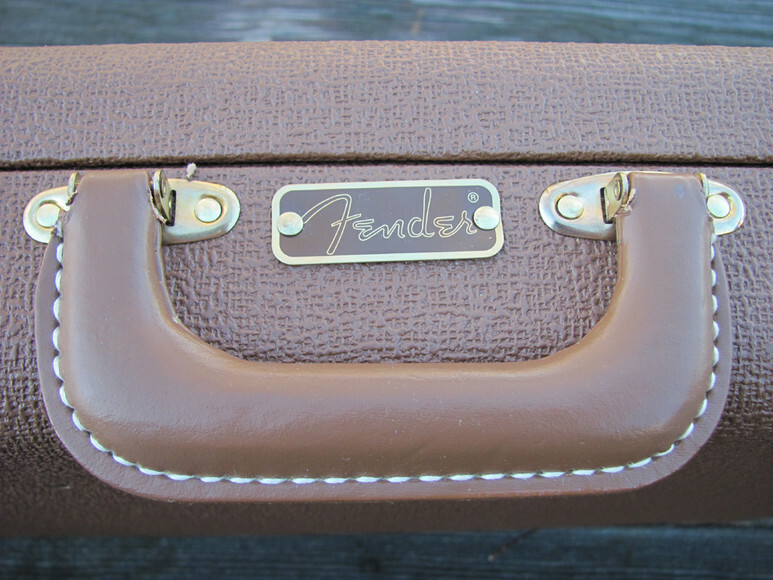 Includes a Fender deluxe padded gig bag and original box for pickups. 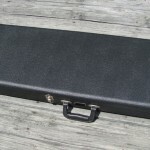 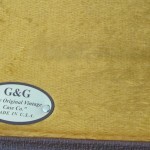 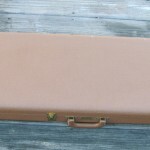 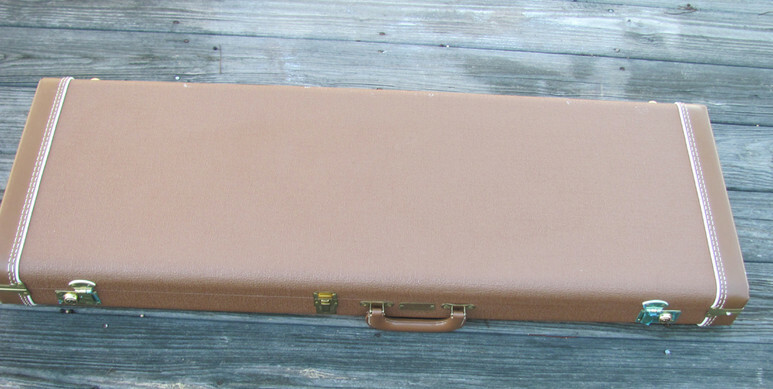 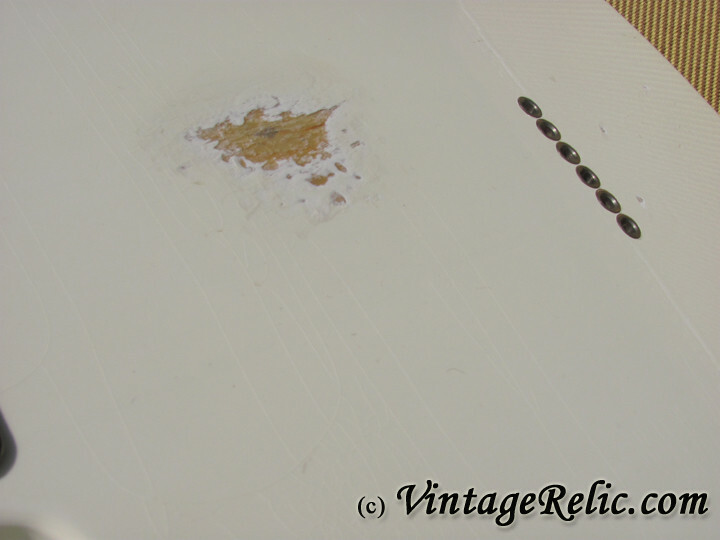 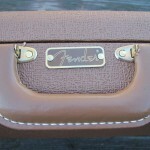 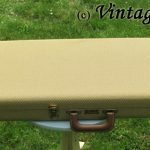 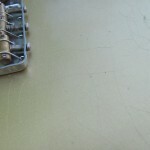 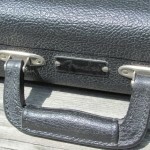 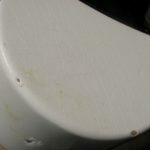 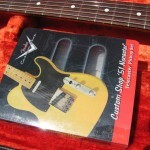 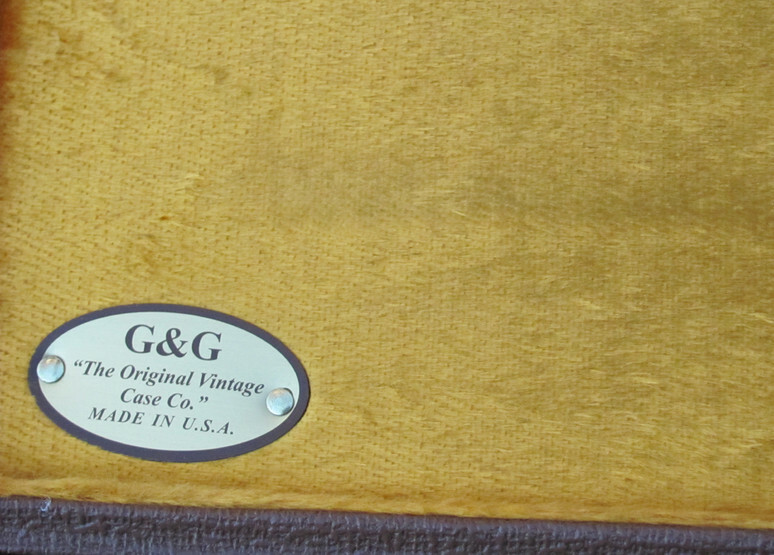 Or upgrade to a new Fender reissue tolex case for $125 more. 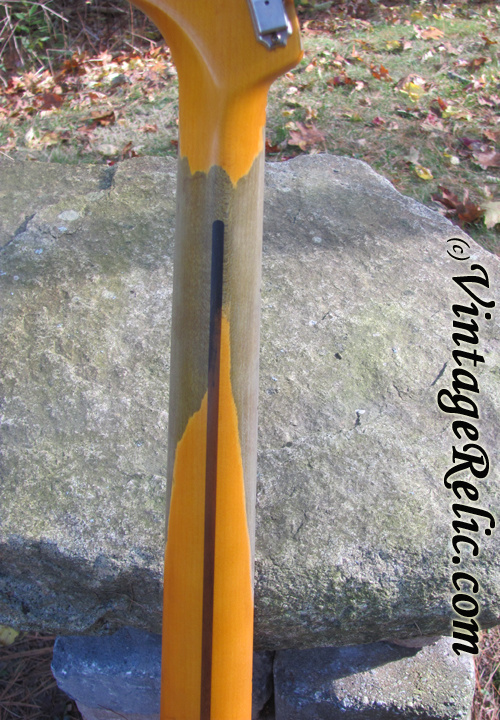 Medium relic for a client. 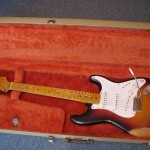 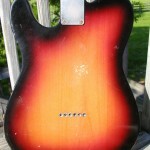 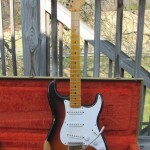 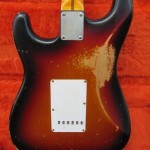 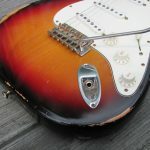 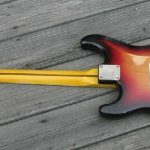 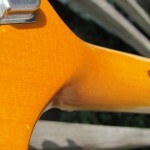 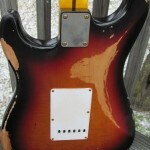 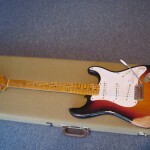 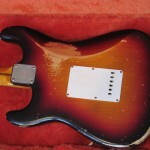 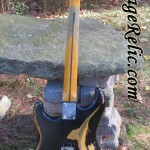 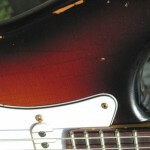 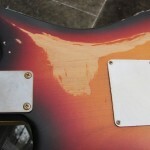 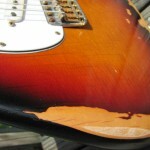 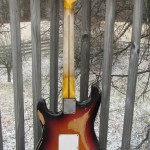 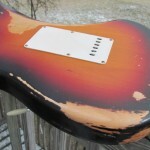 This started as a new Fender USA Stratocaster with a poly finish (sunburst). 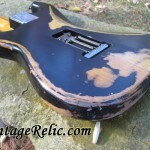 It has undergone a complete aging. 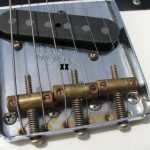 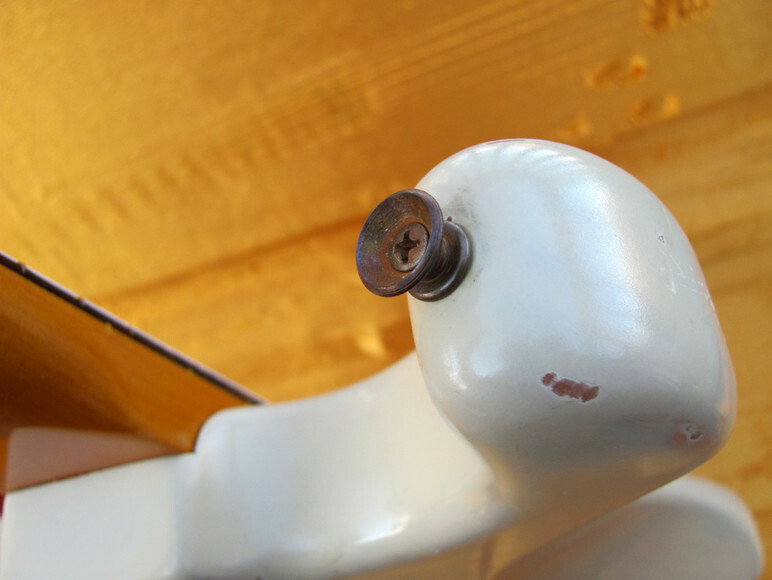 We changed the tremolo assembly to one which would accept a vintage style (threaded) trem arm; all other parts are stock and aged by us.